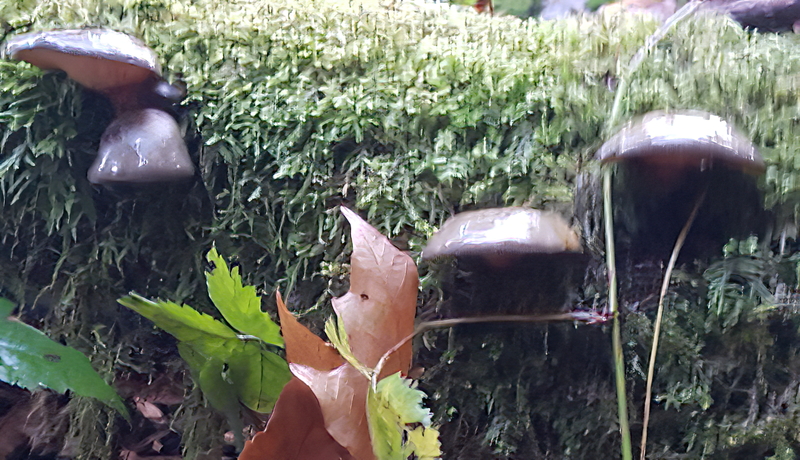 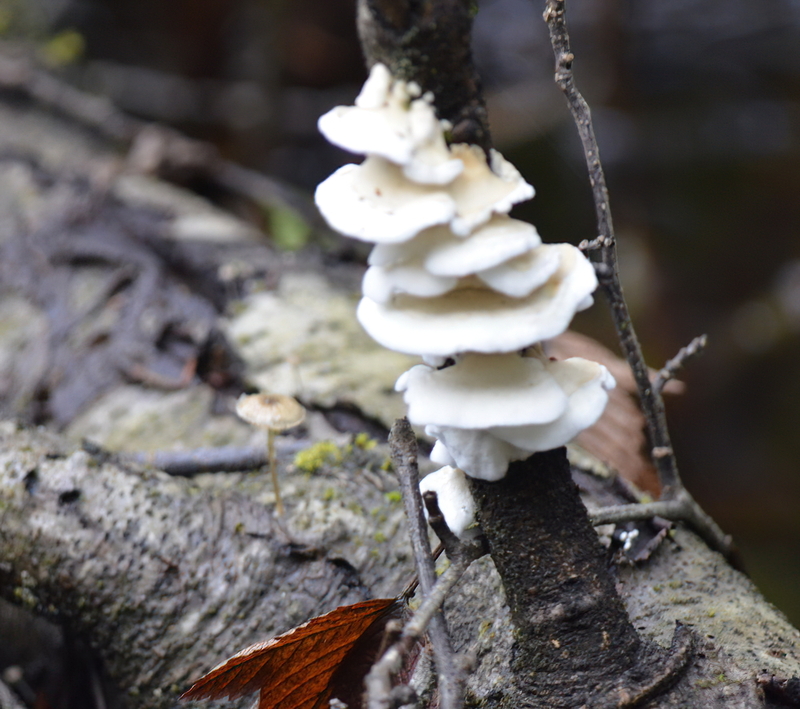 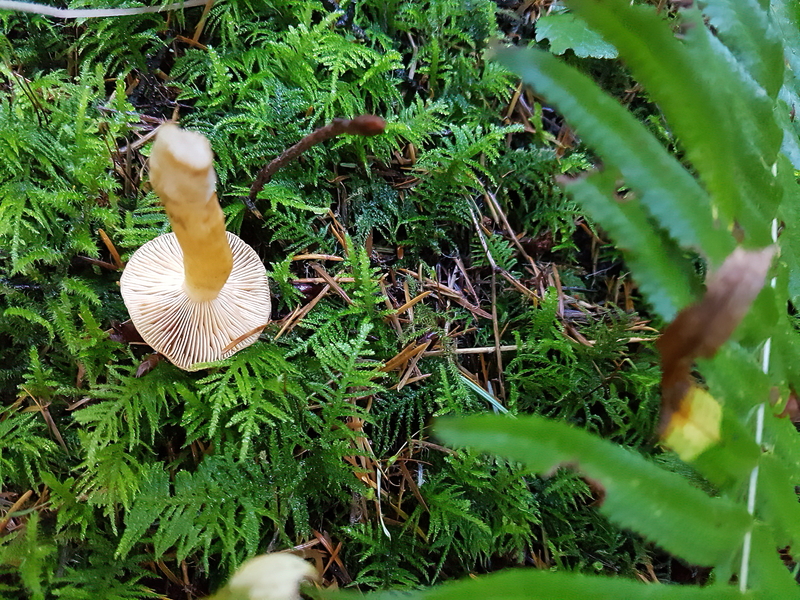 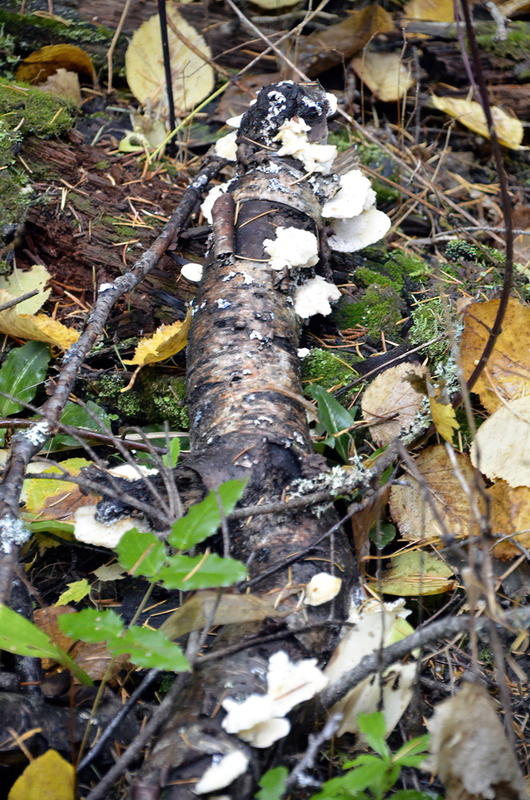 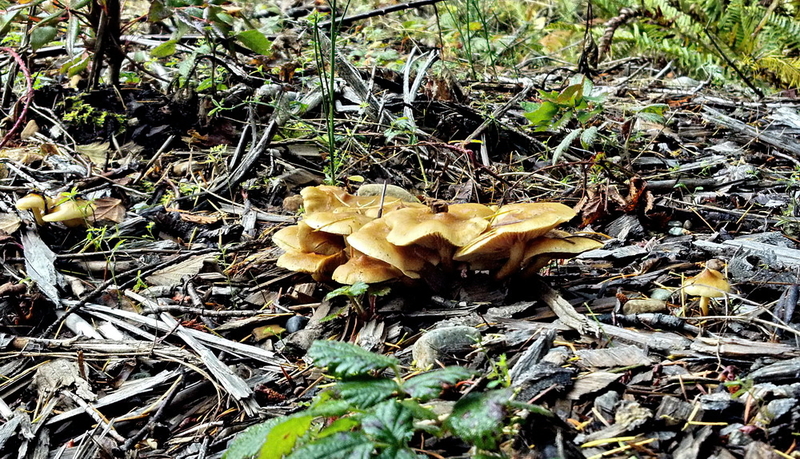 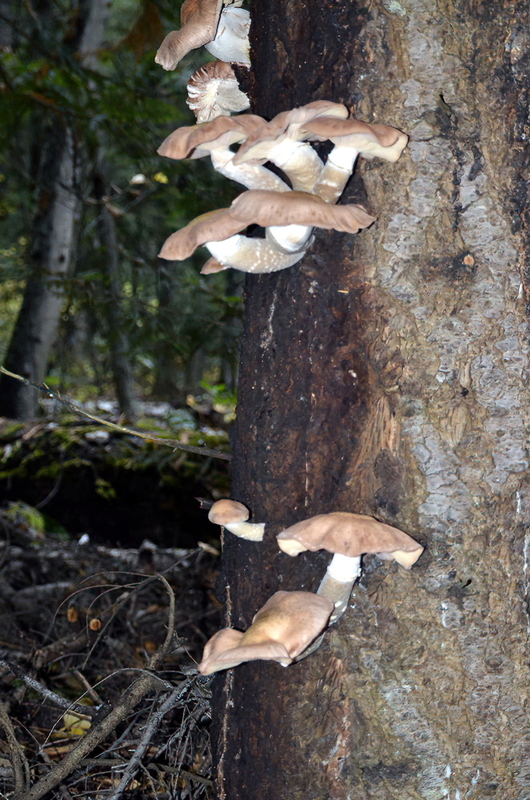 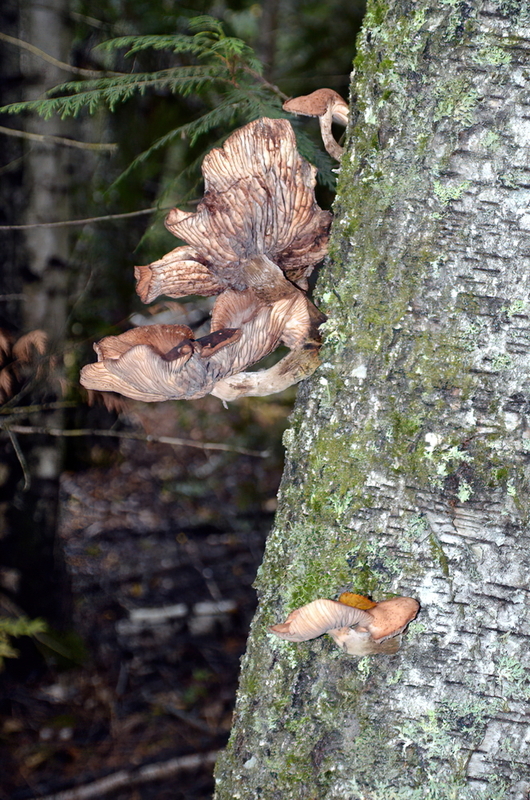 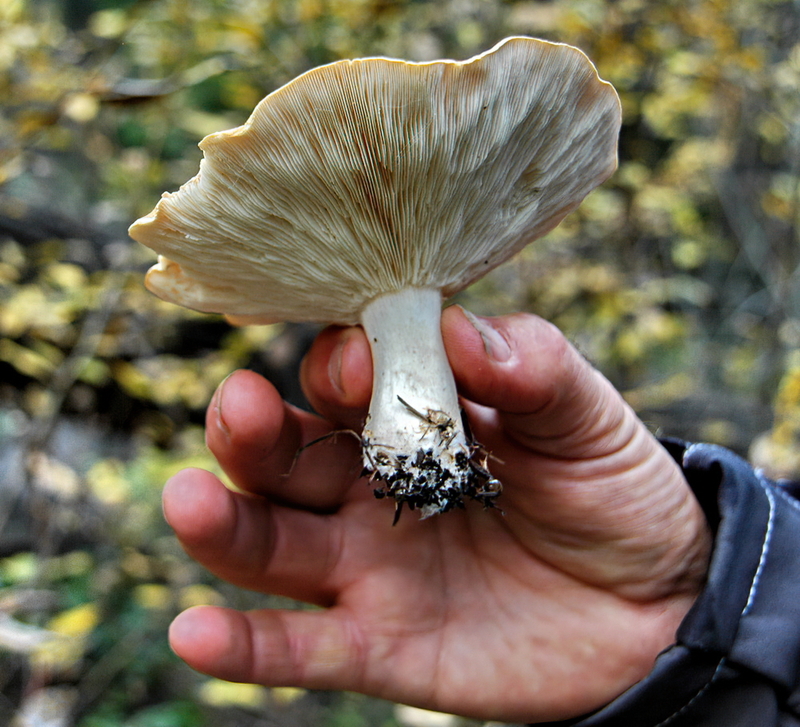 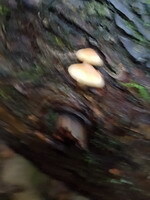 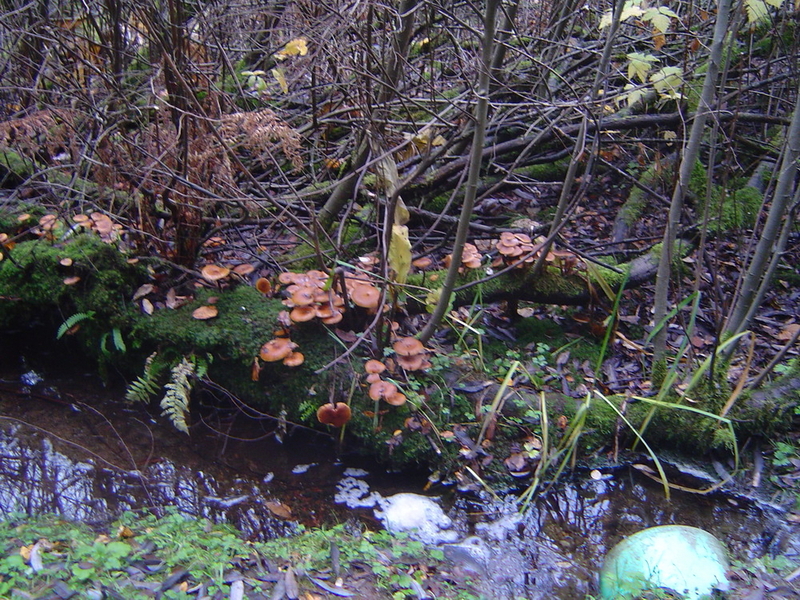 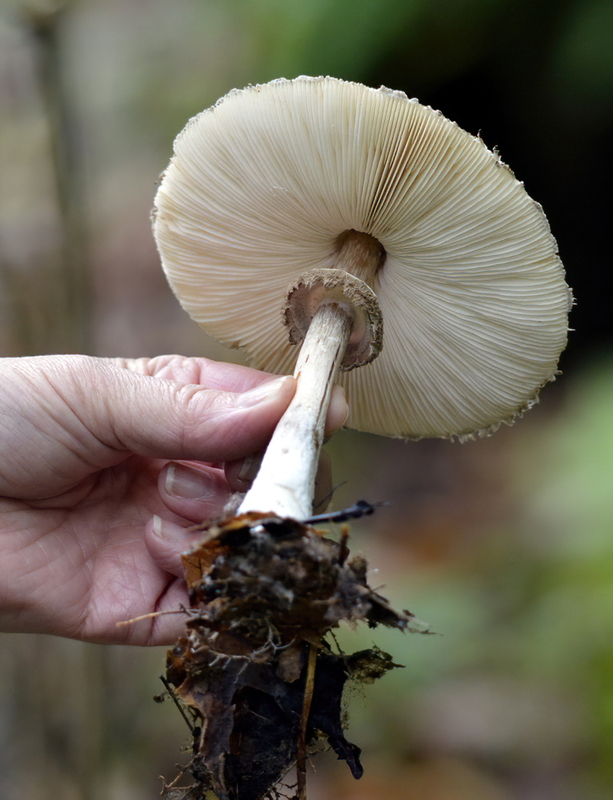 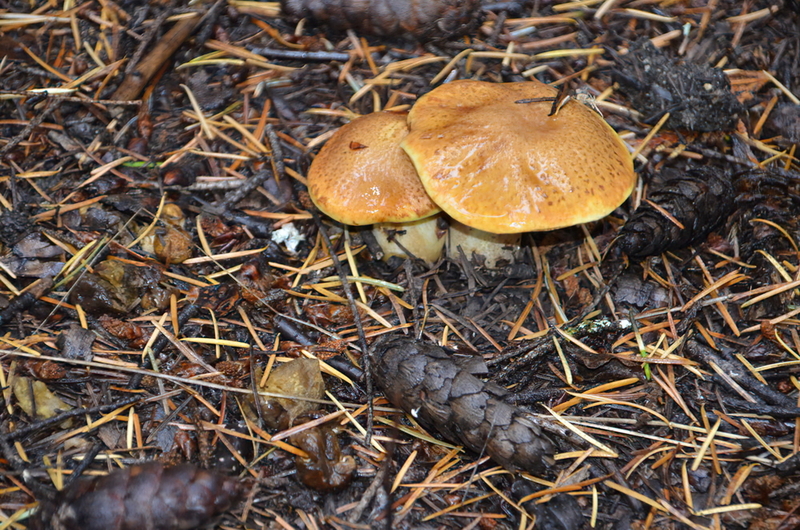 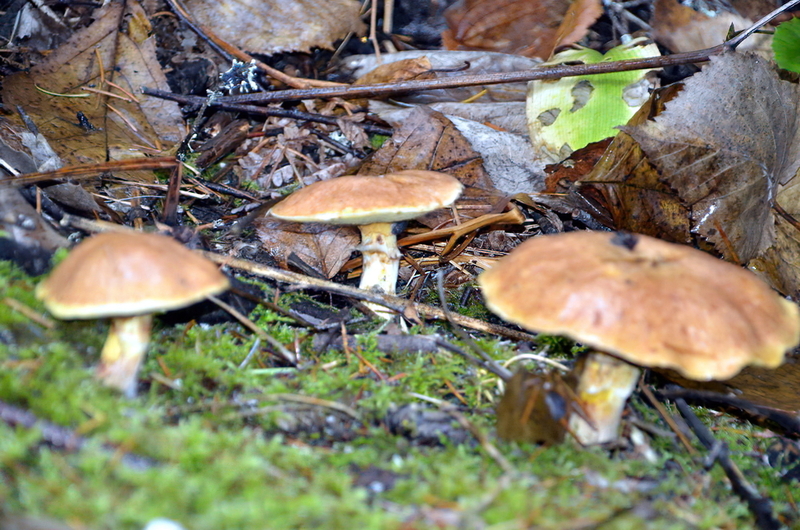 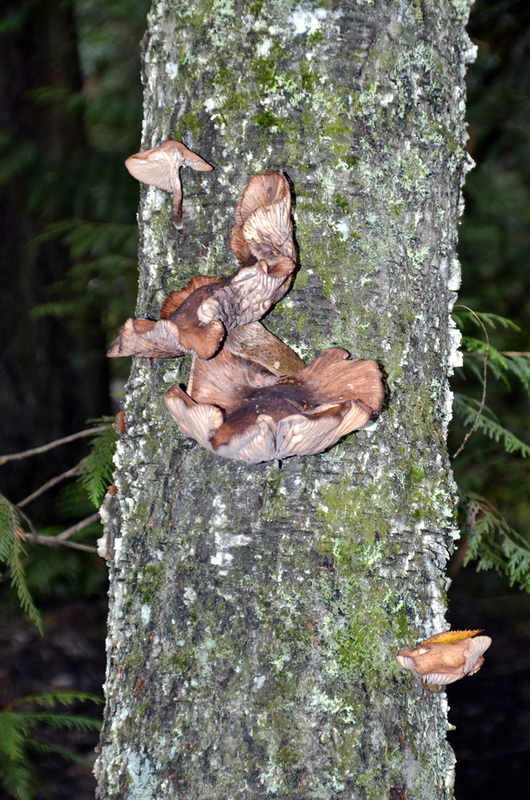 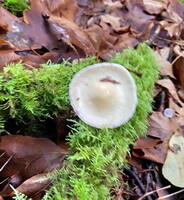 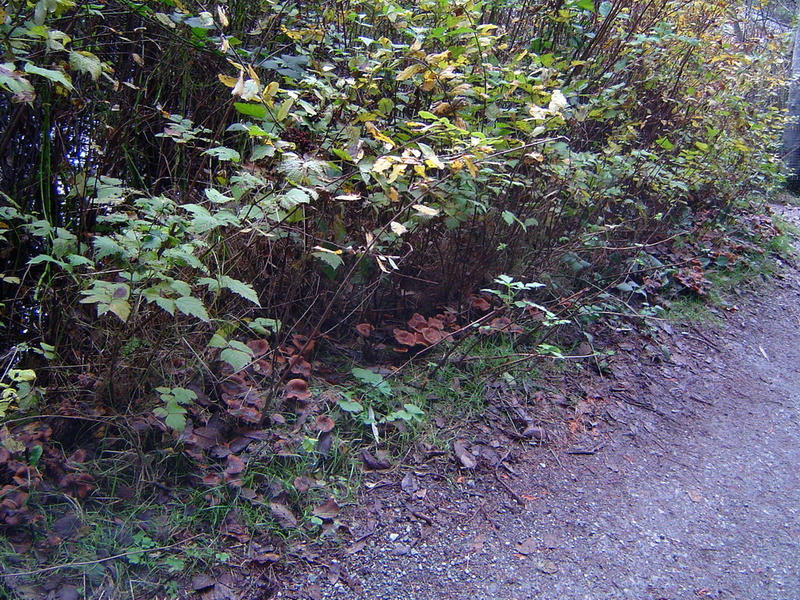 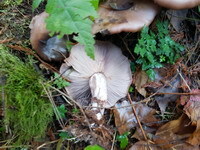 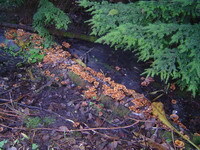 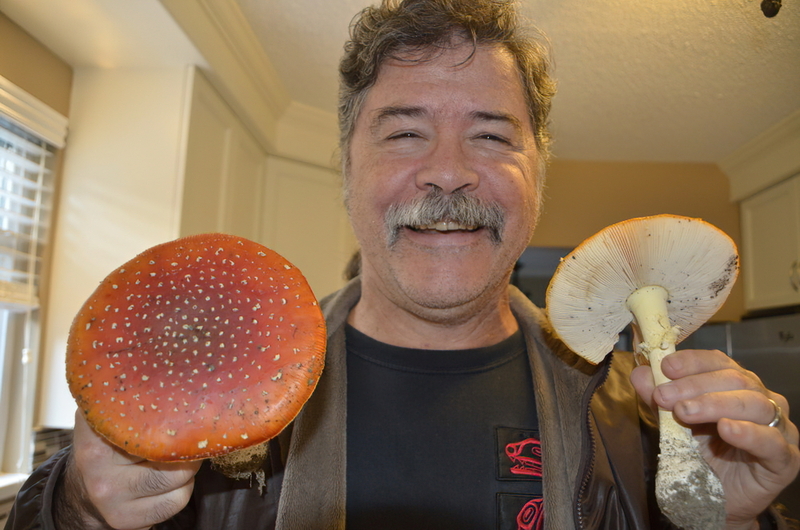 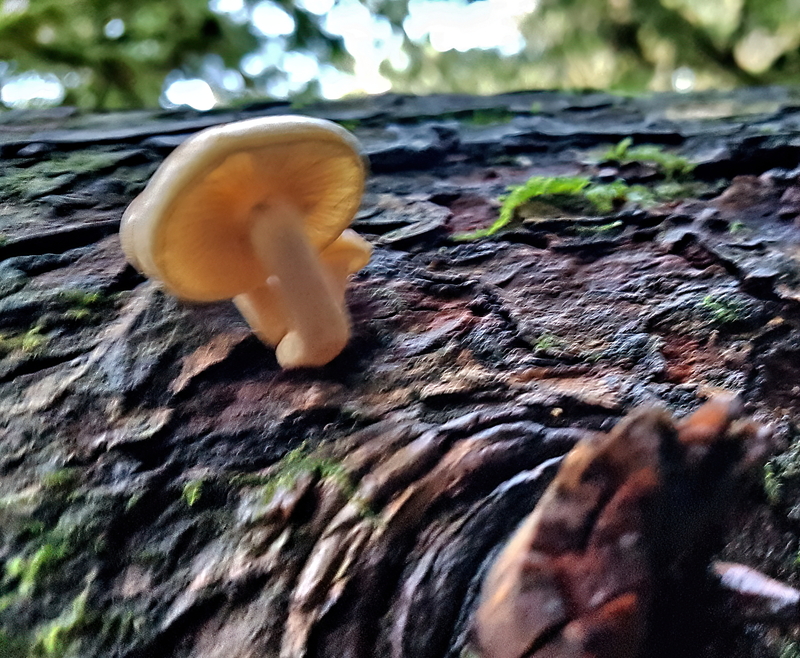 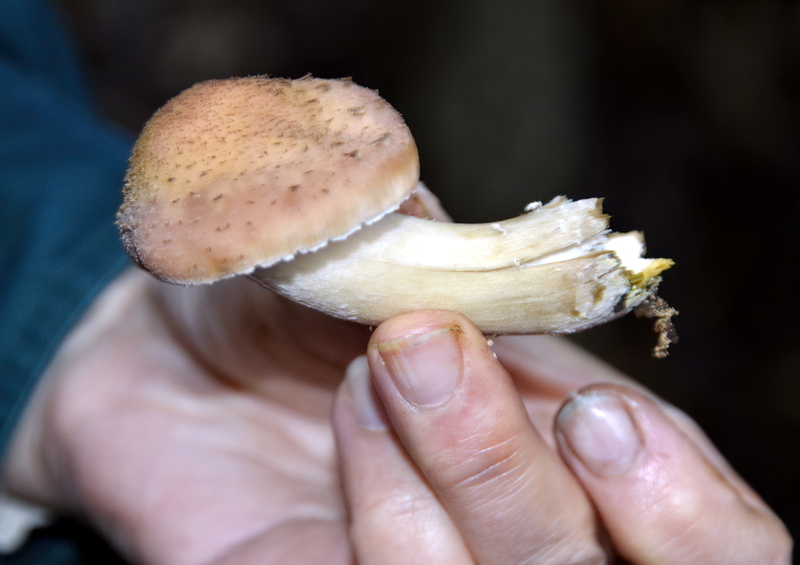 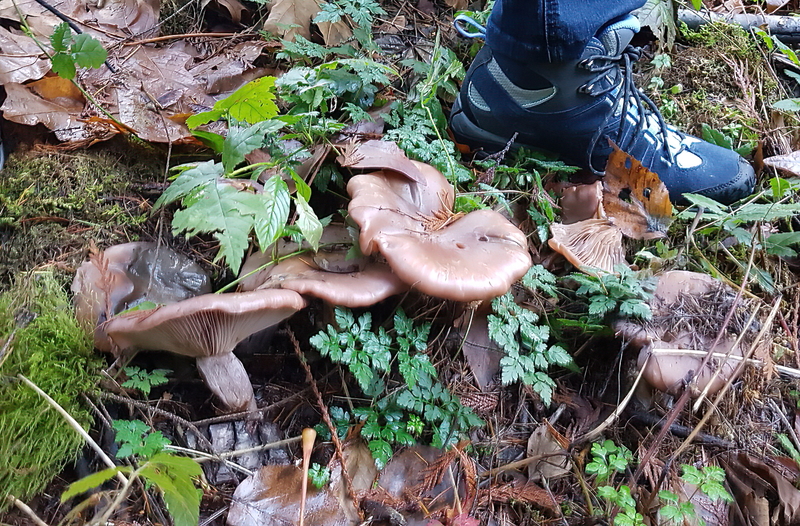 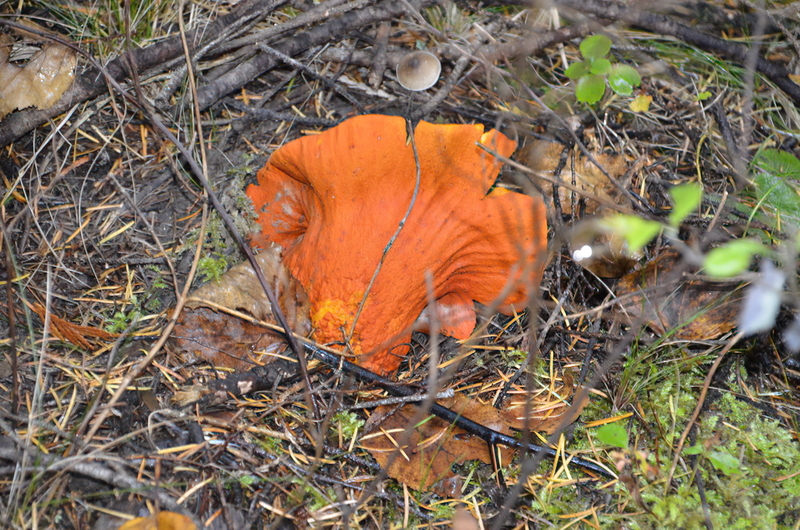 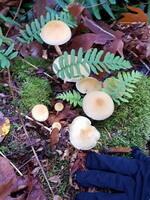 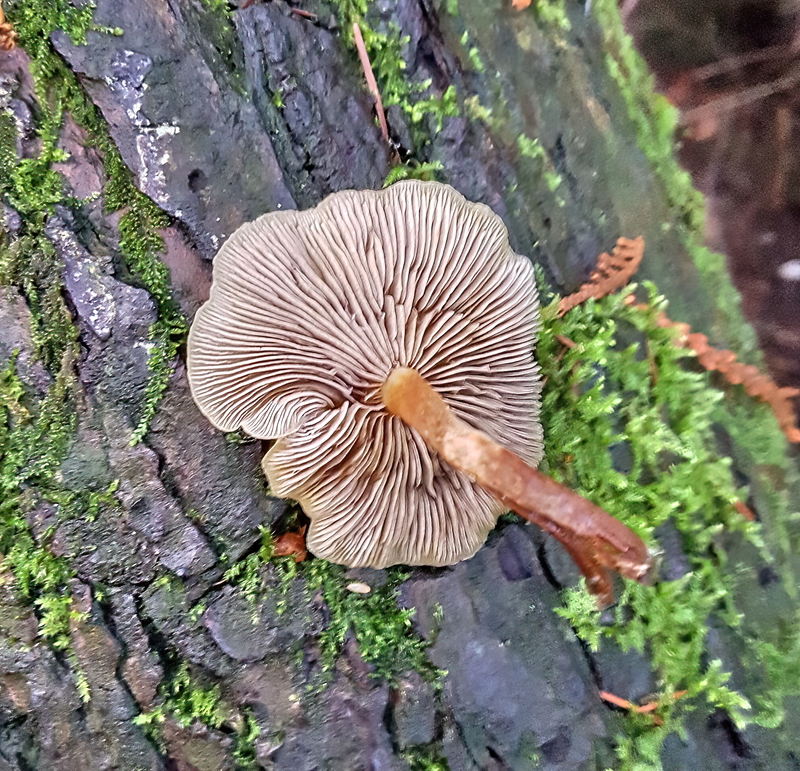 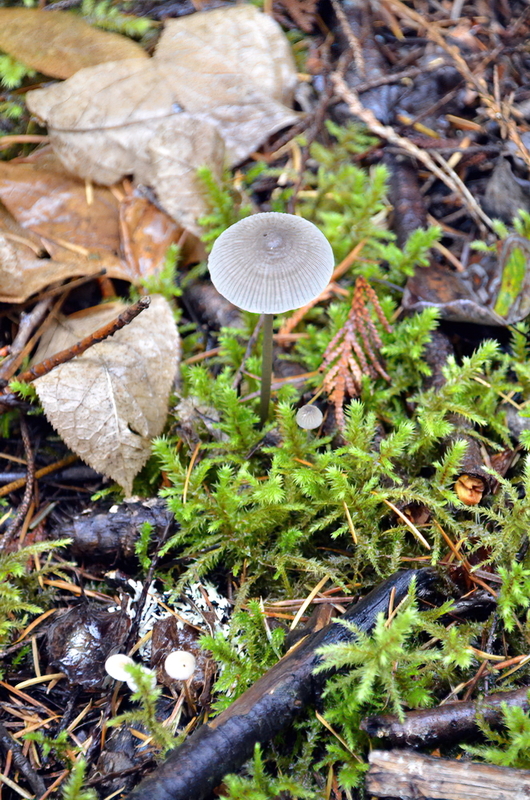 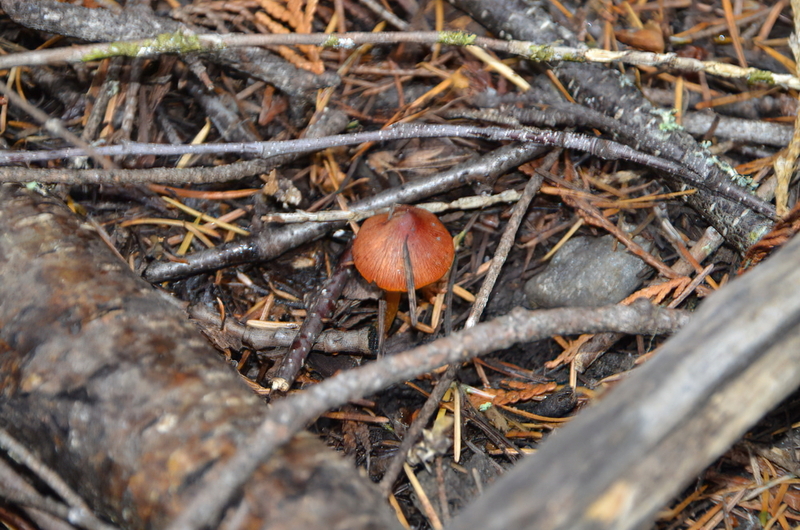 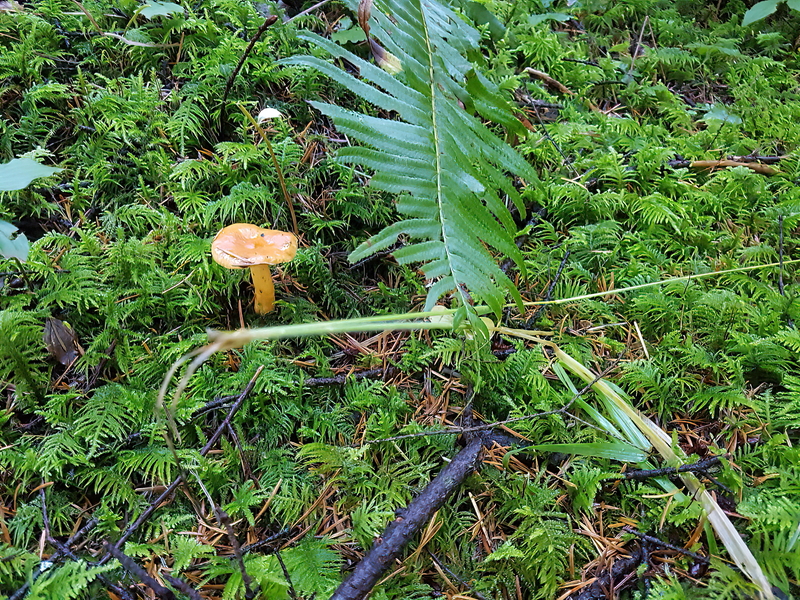 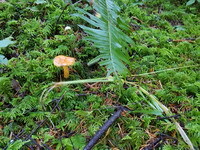 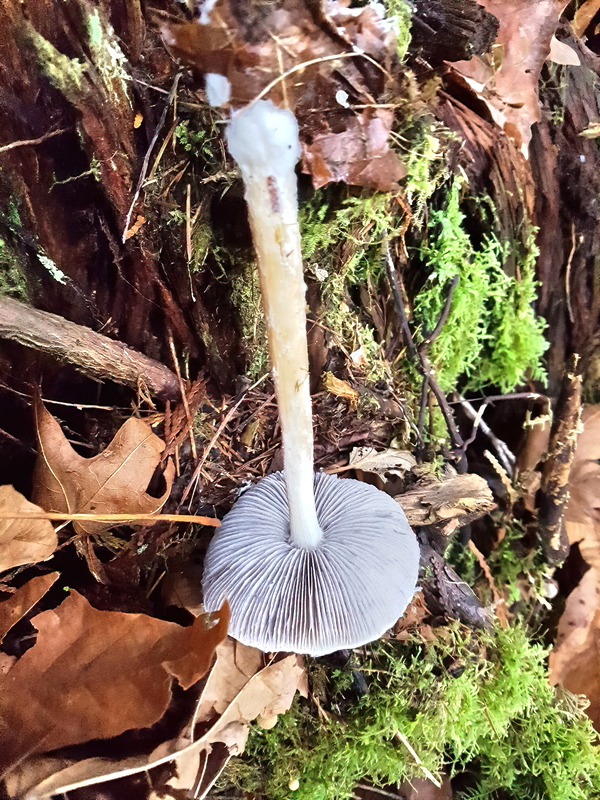 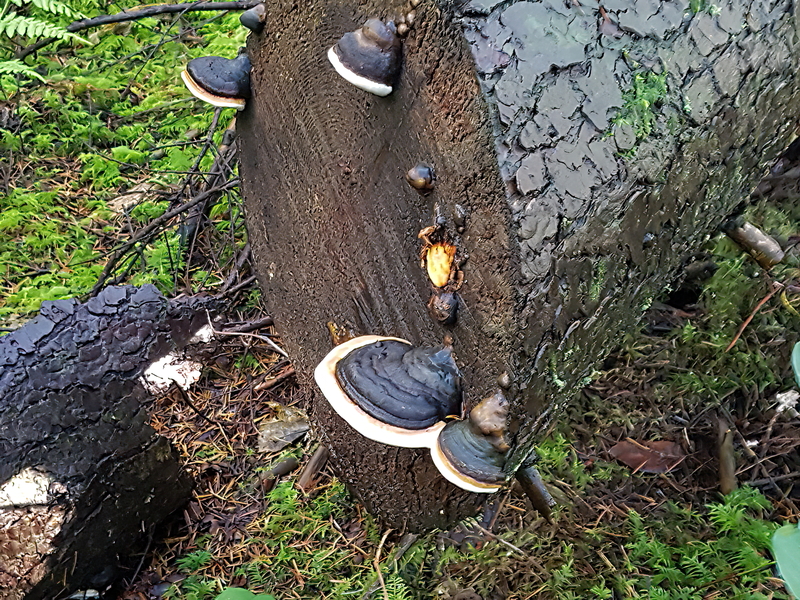 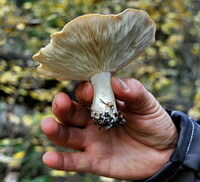 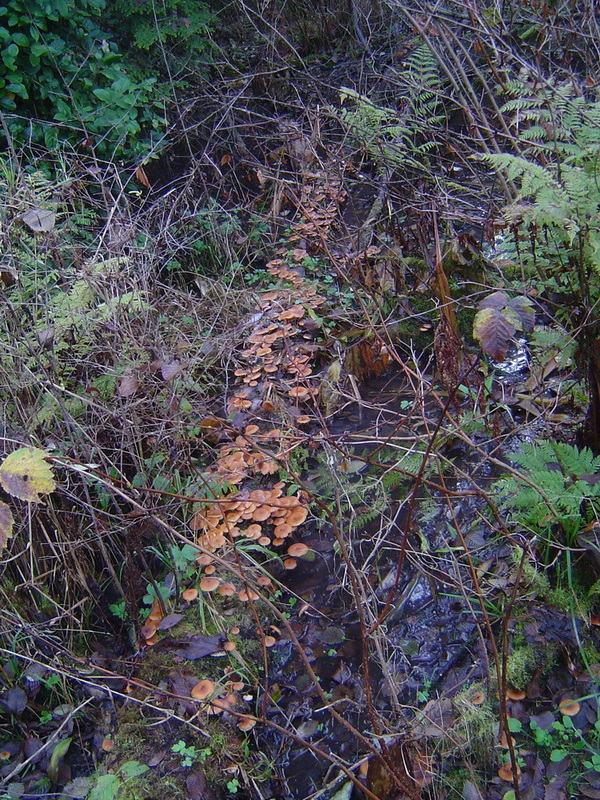 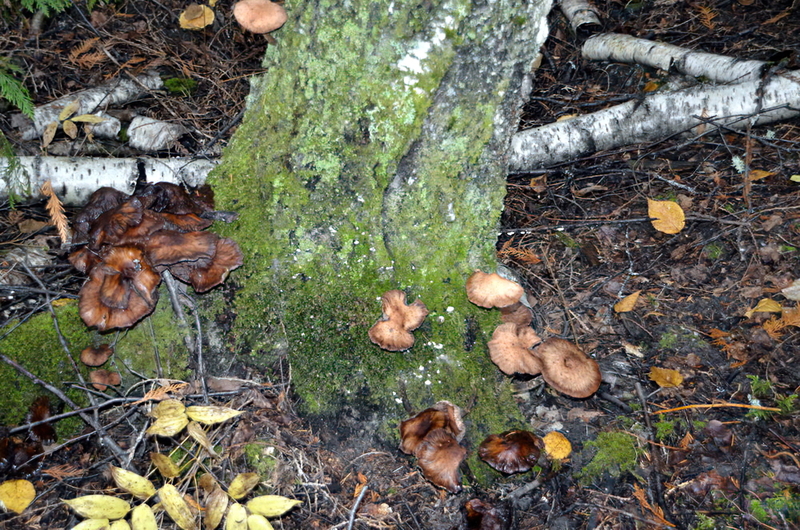 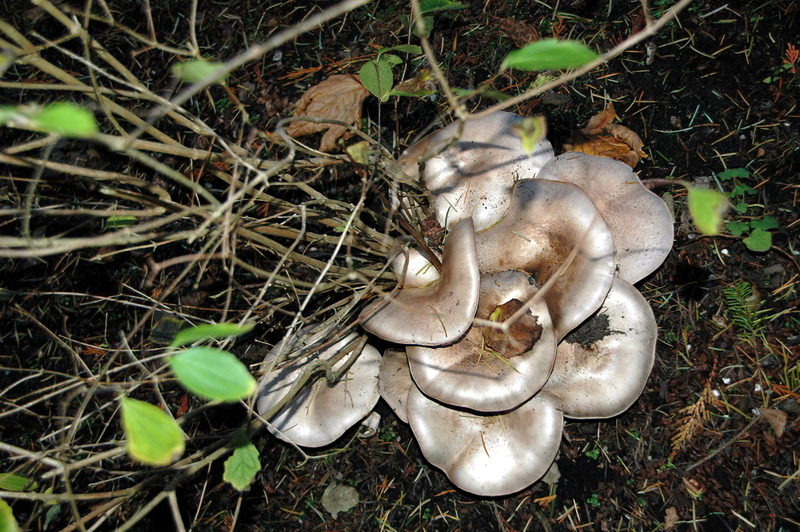 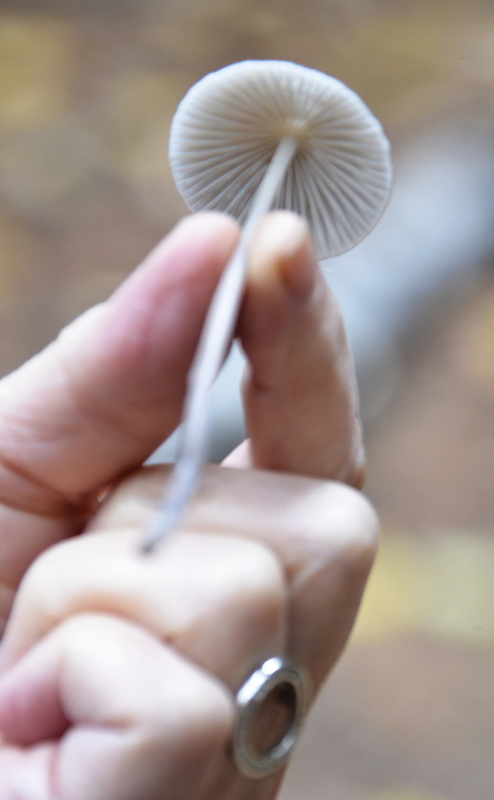 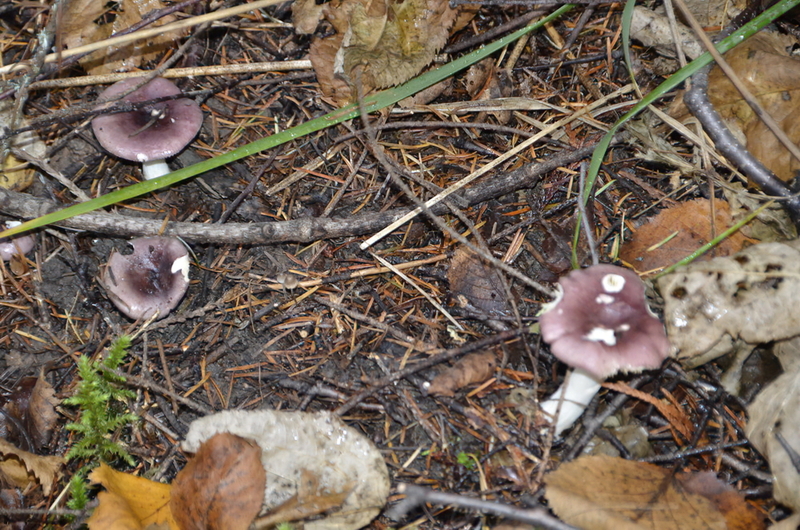 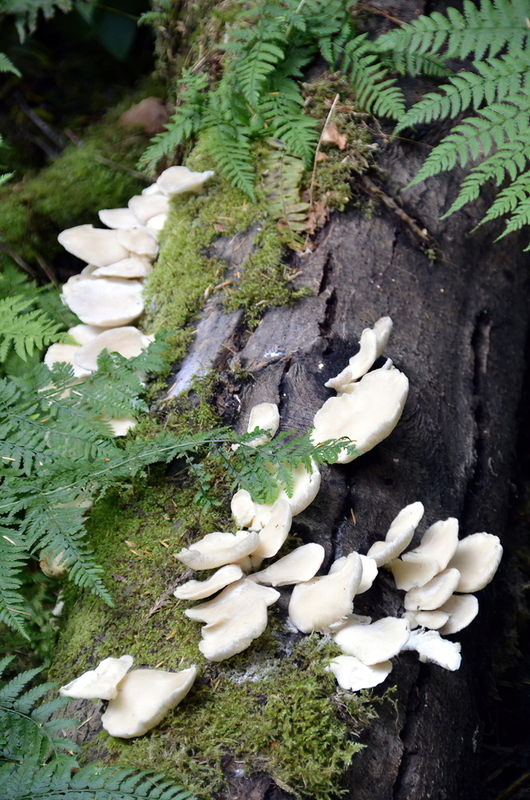 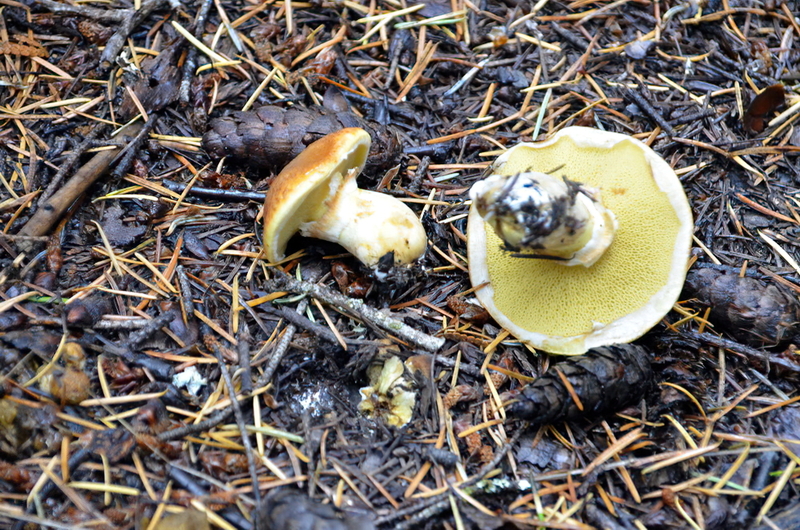 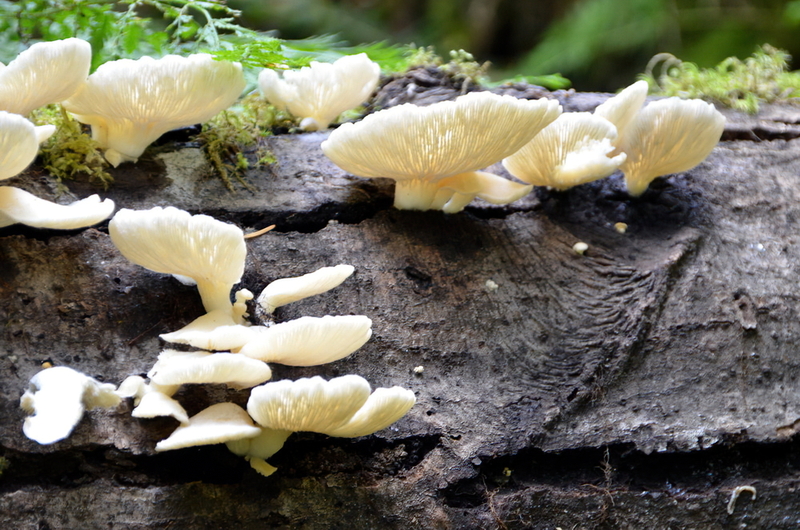 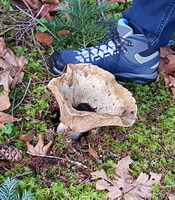 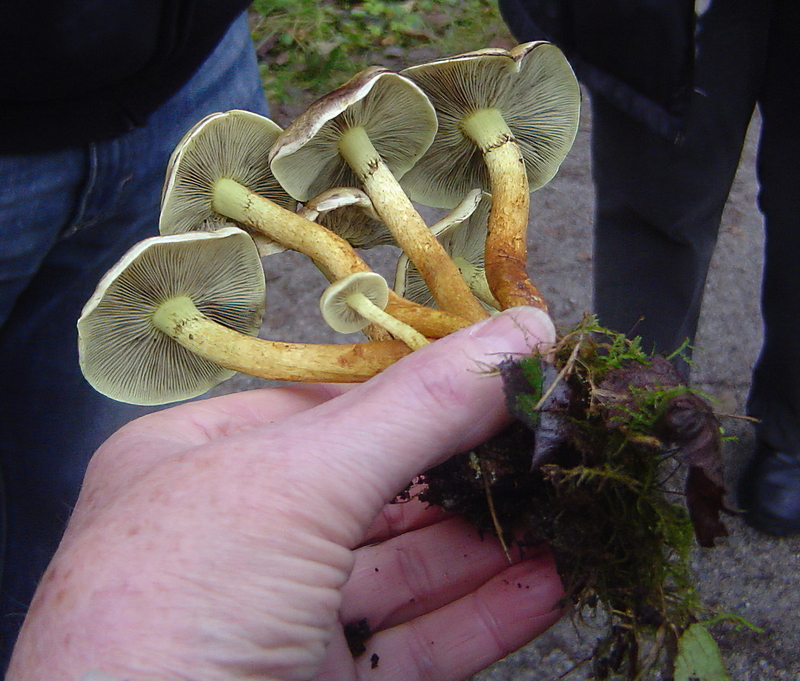 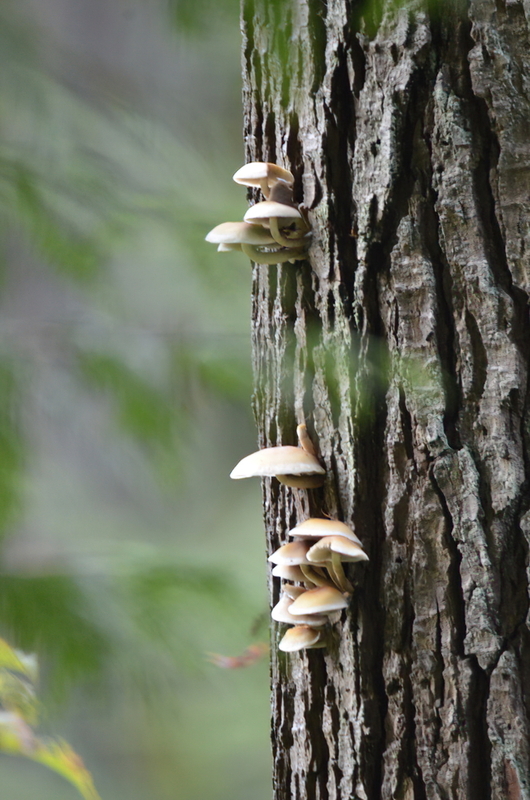 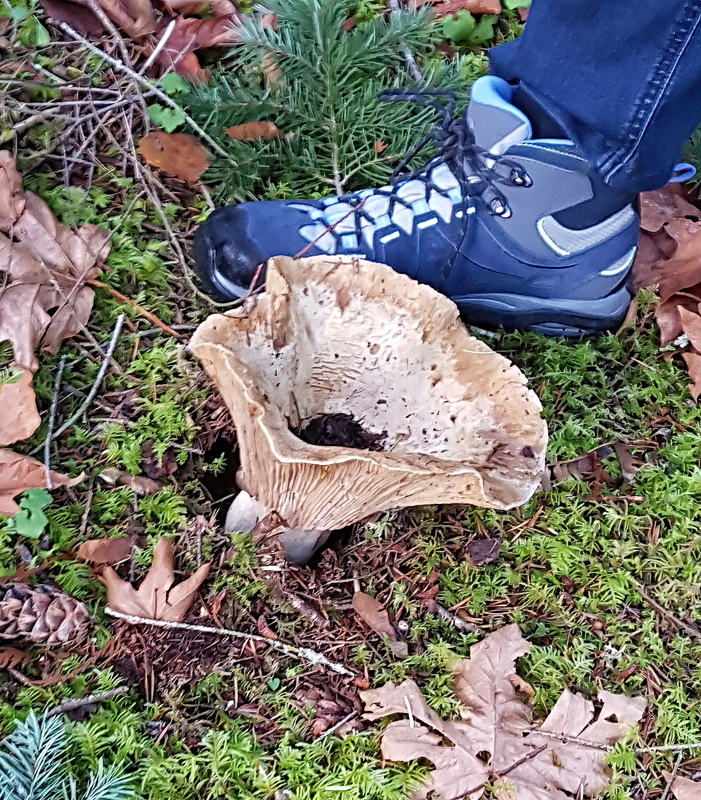 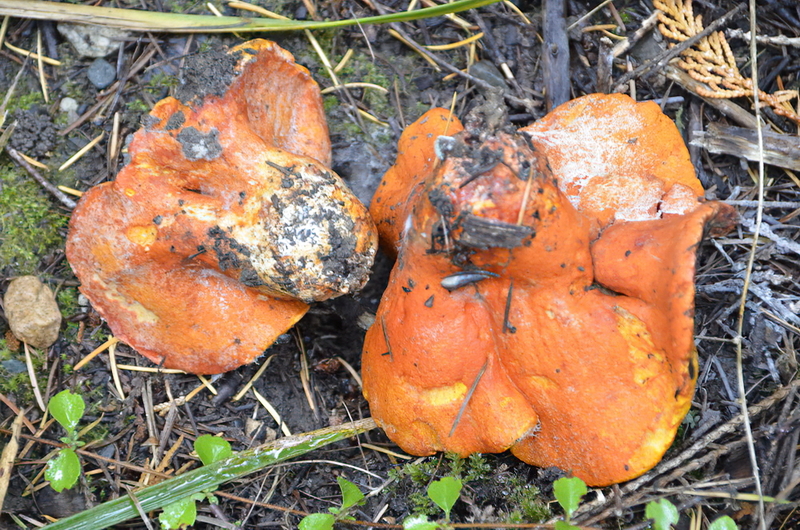 Glen and Susan started Mushroom Foraging on 22 Sept 2013 by taking a foraging tour with Chef Robin of Swallowtail Tours in Lynn Valley, BC. 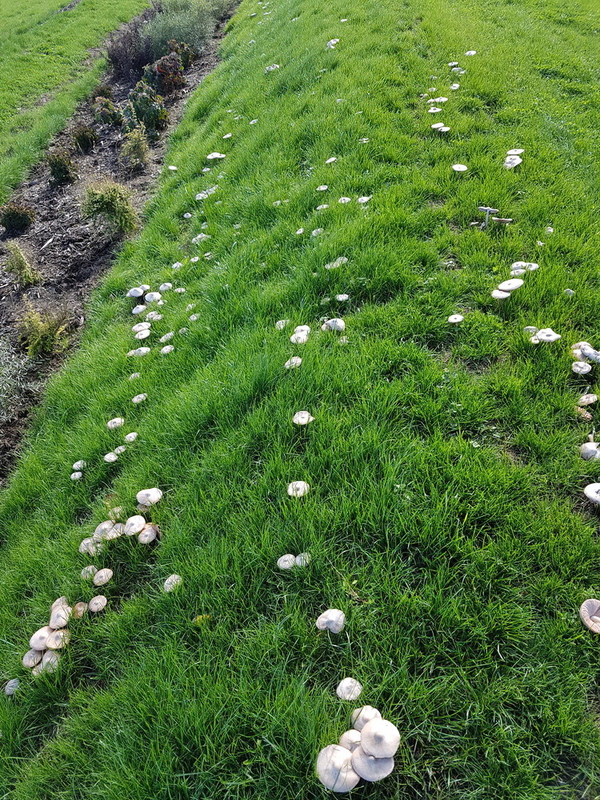 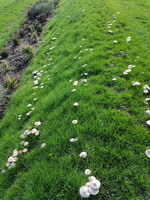 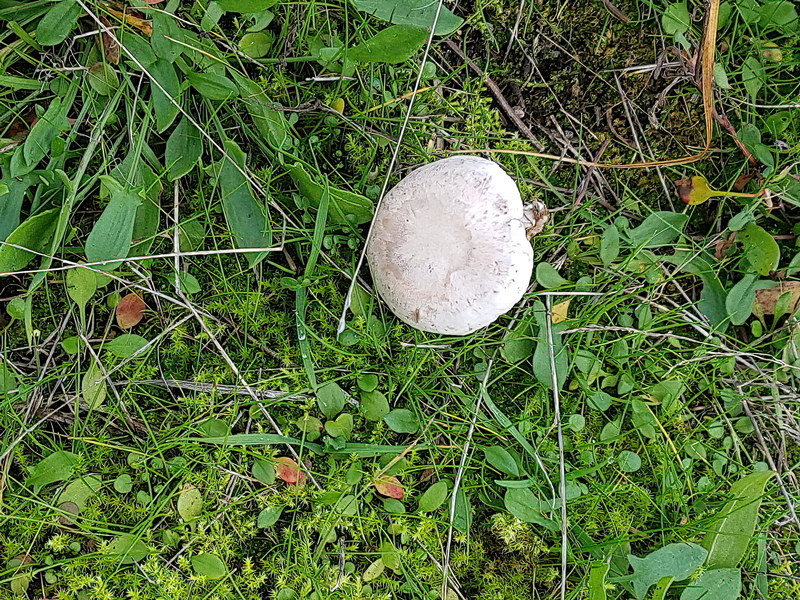 Since then we've been finding mushrooms everywhere we look - to the extent that it is now impossible to simply "go for a walk in the park"! 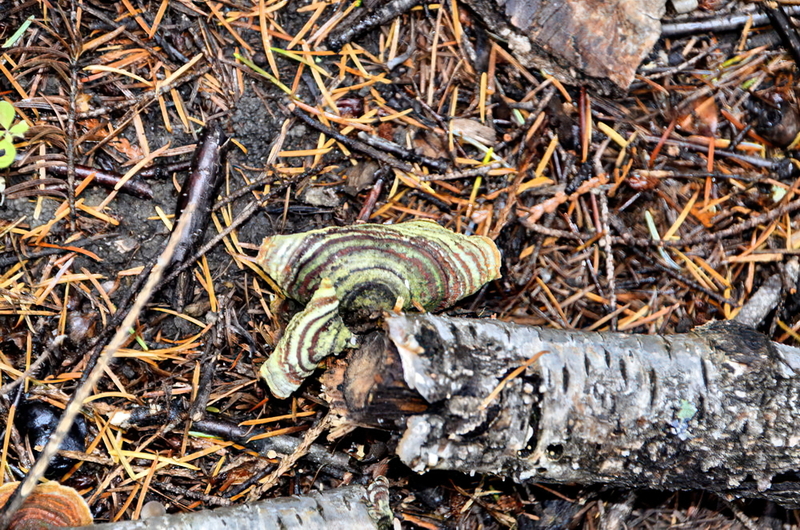 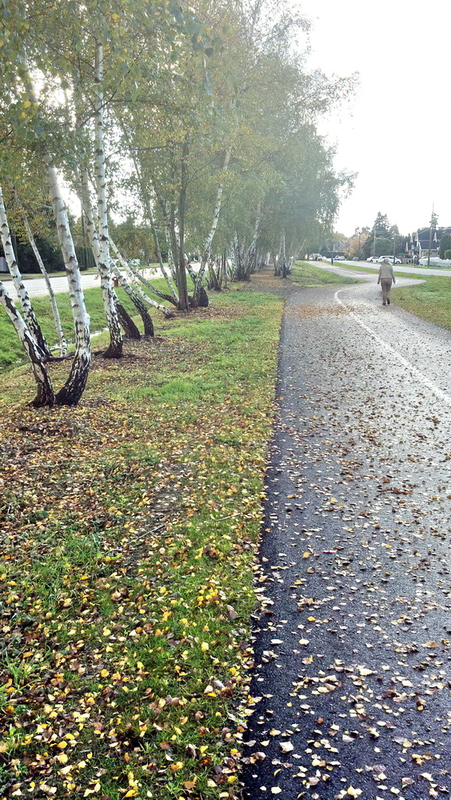 We sometimes miss the ocean and mountains and forest all around us because our eyes are focused on the ground. 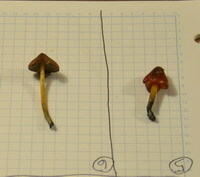 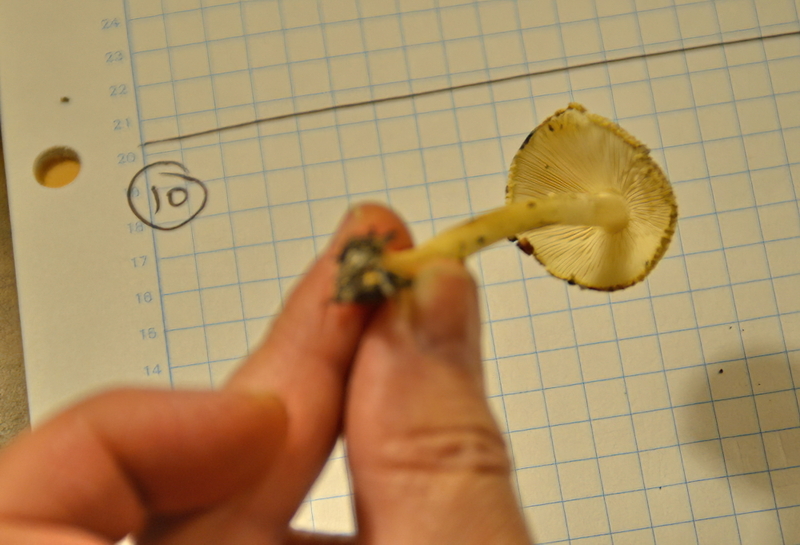 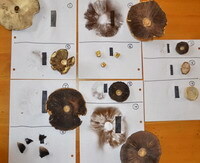 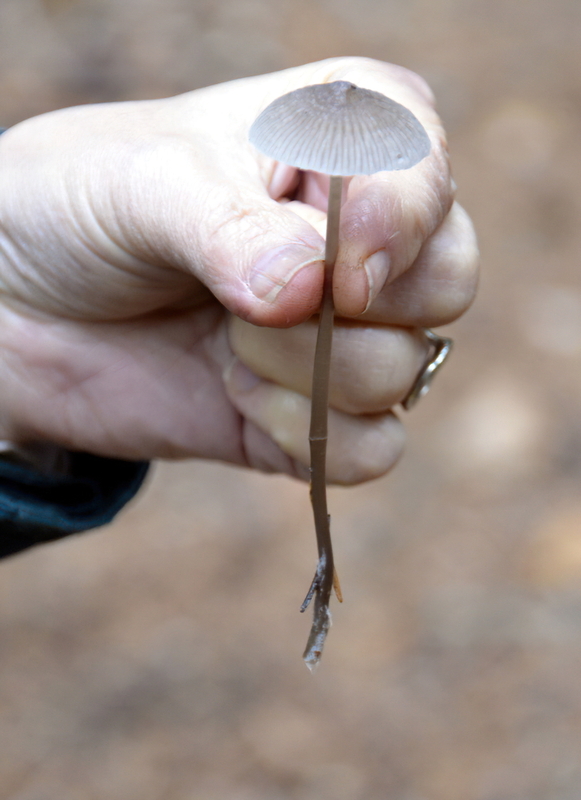 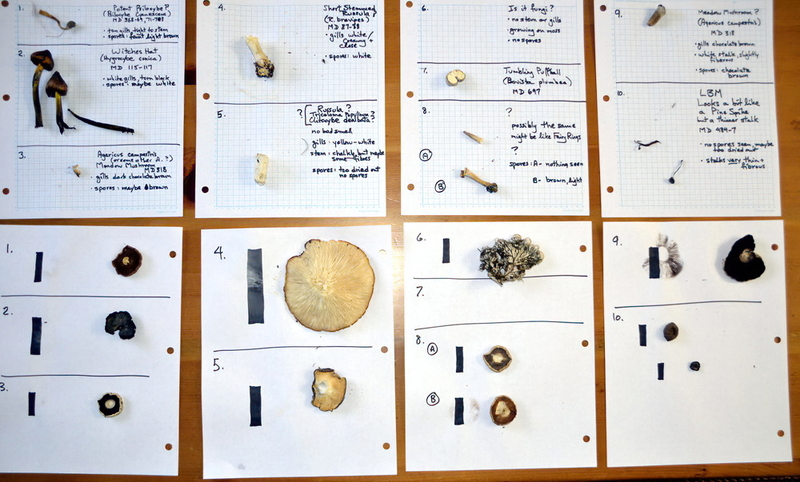 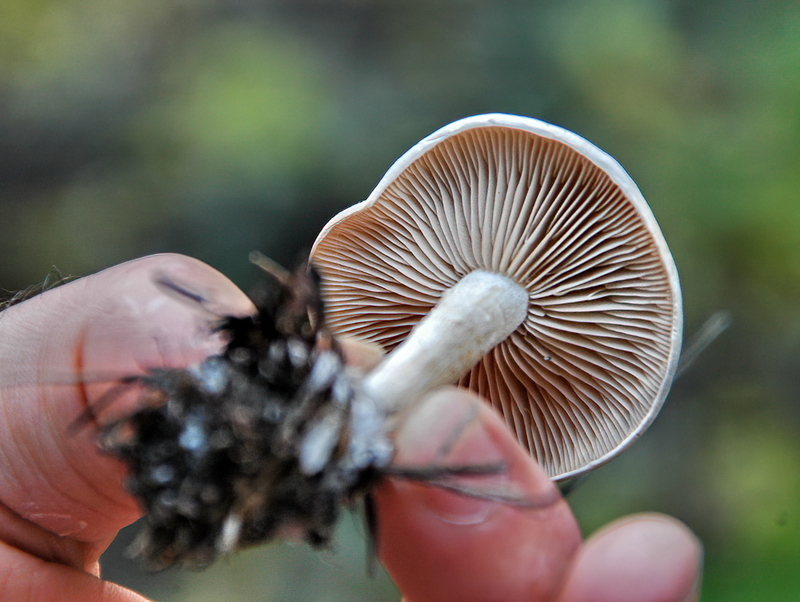 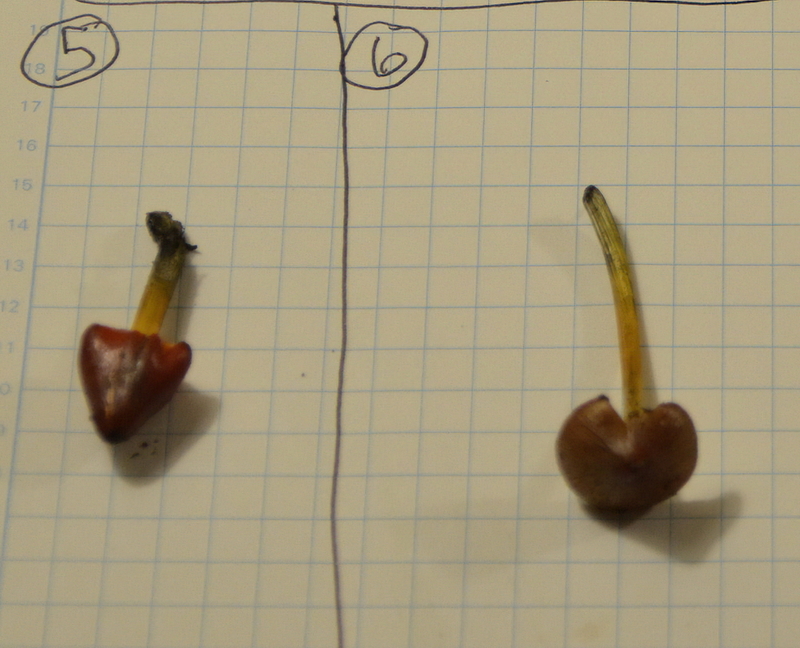 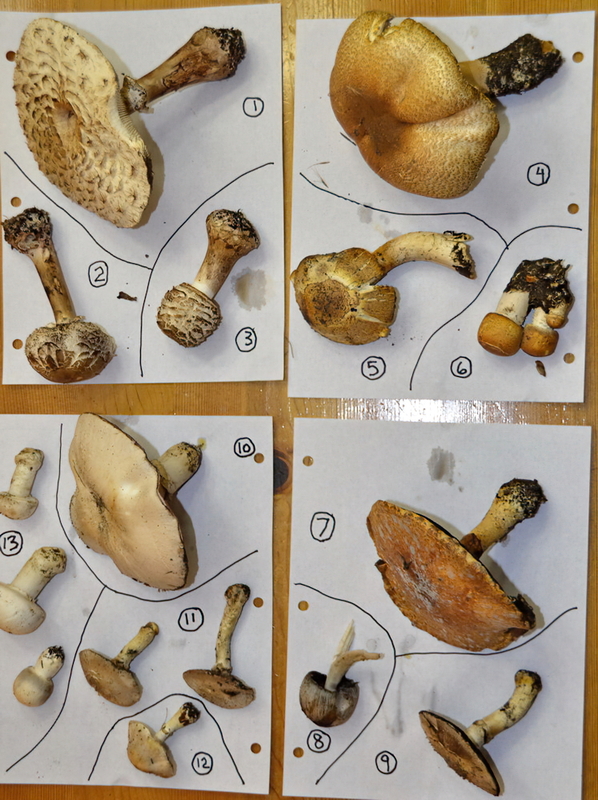 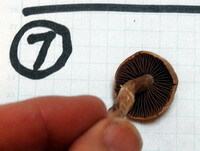 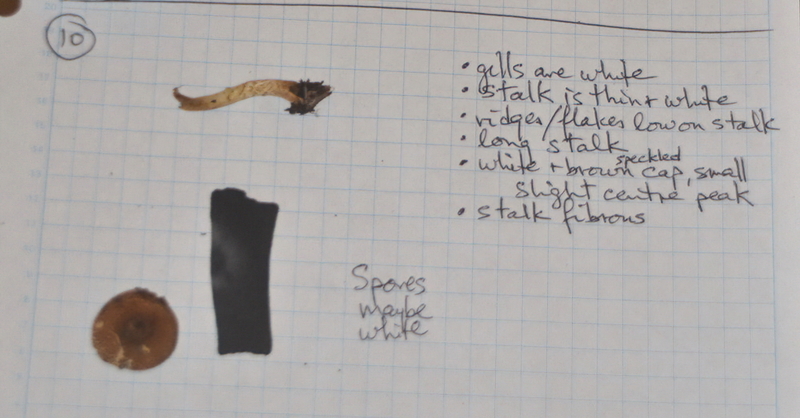 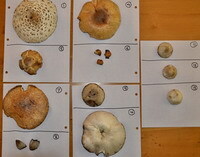 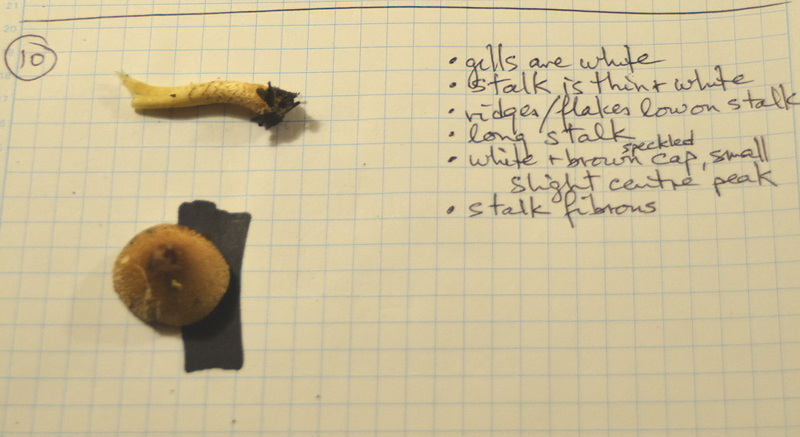 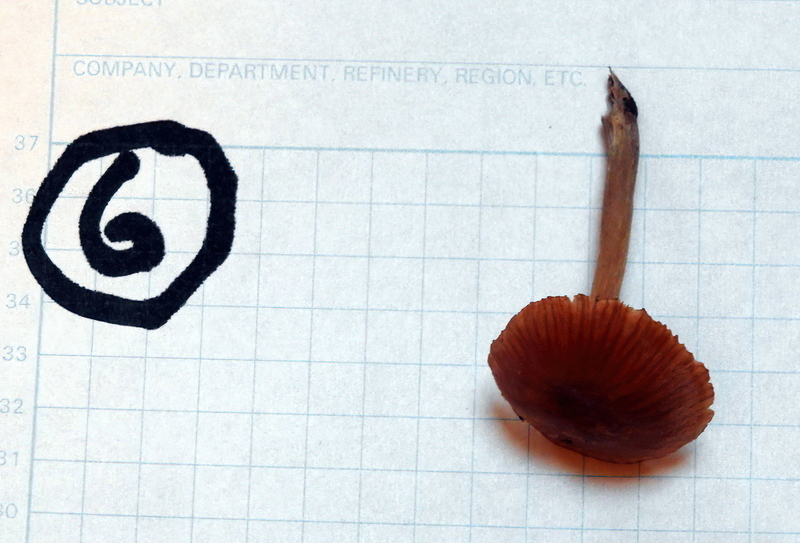 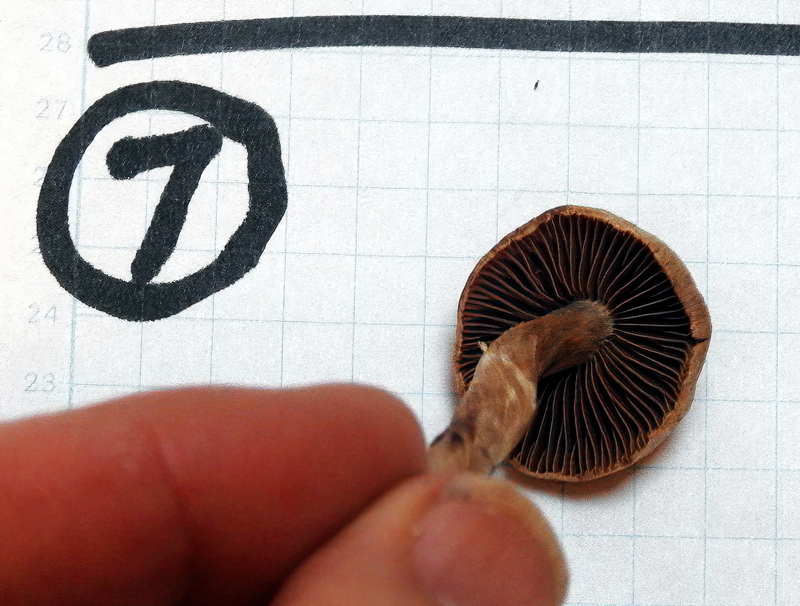 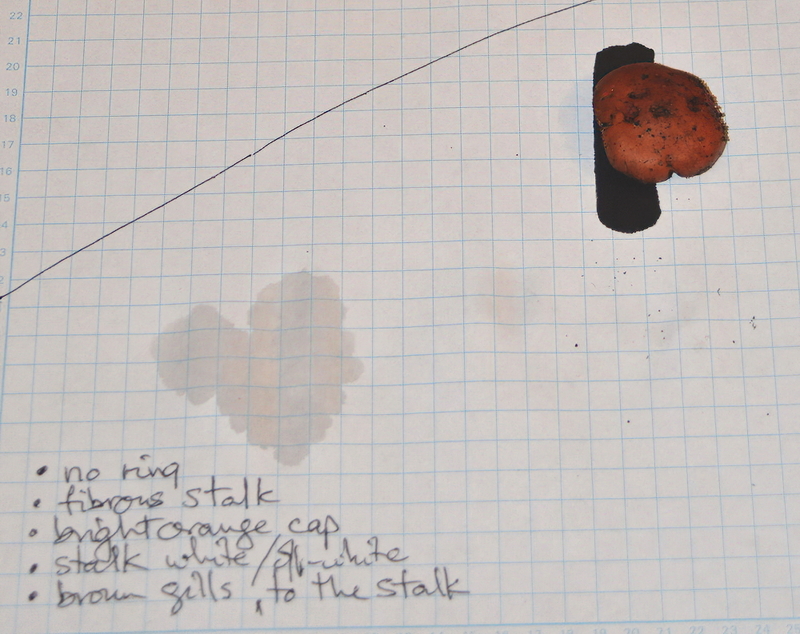 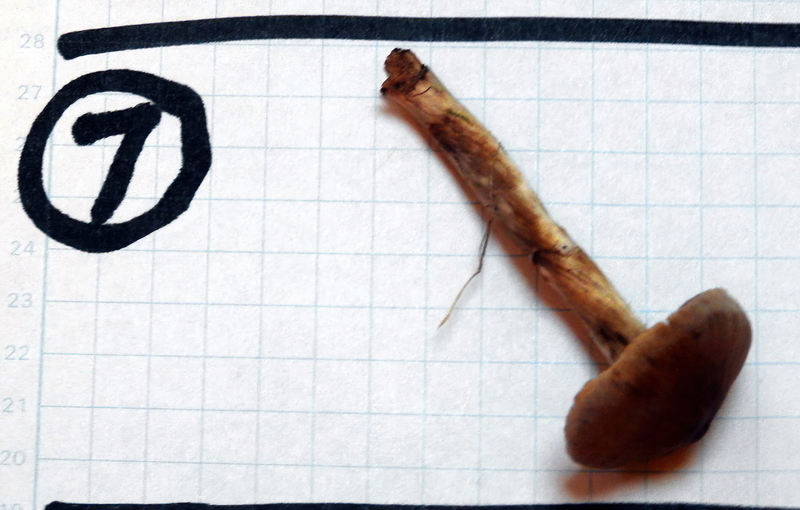 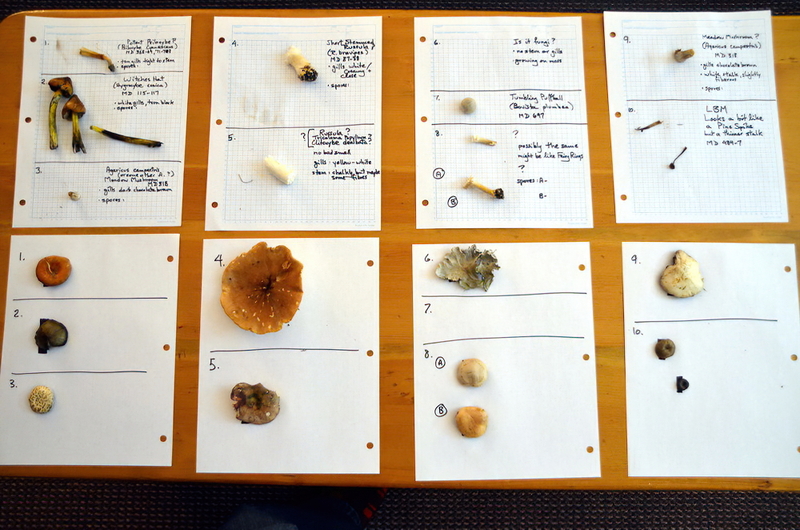 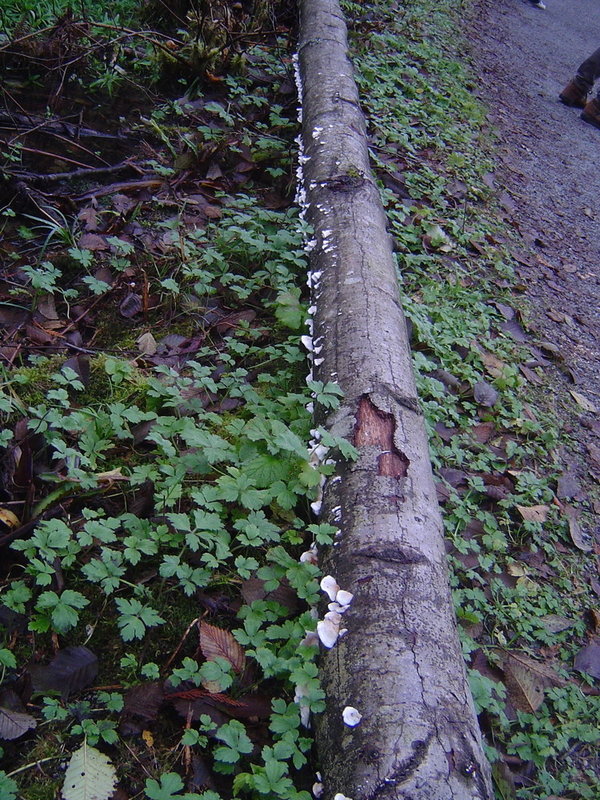 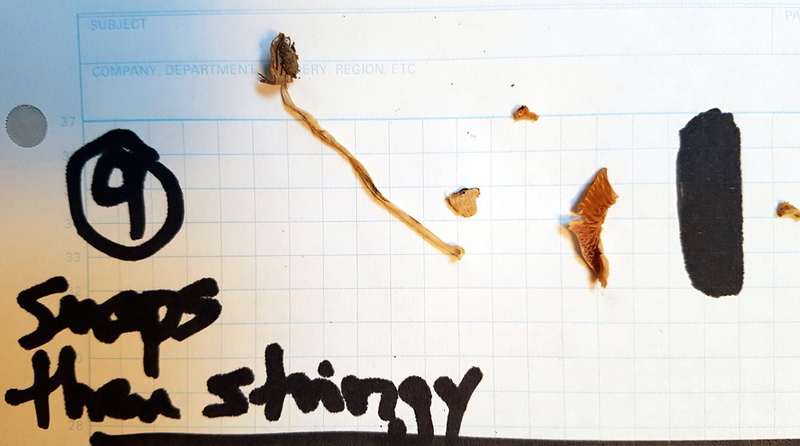 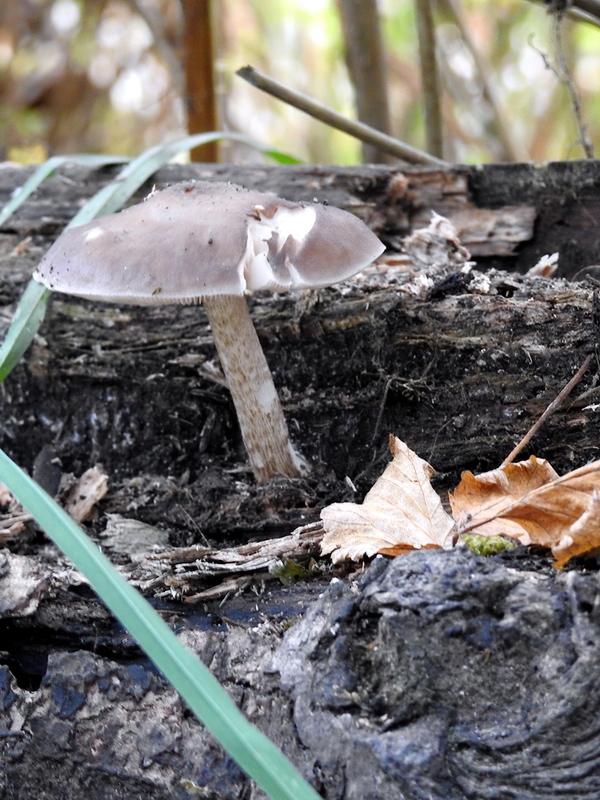 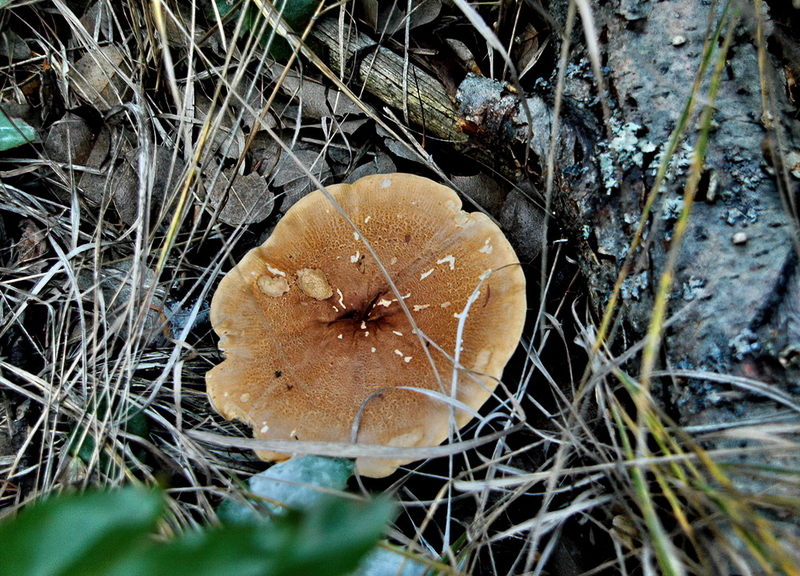 The following table provides information about every mushroom we THINK we have found. 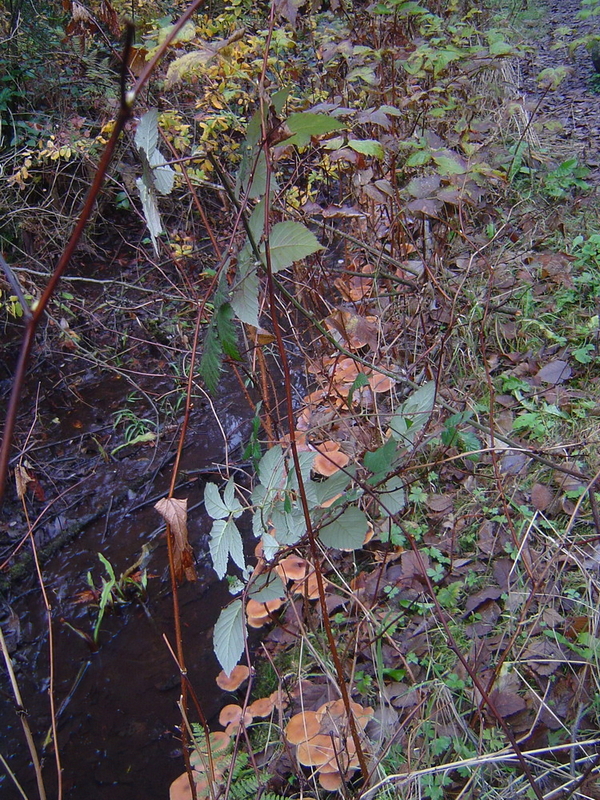 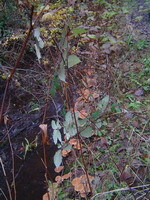 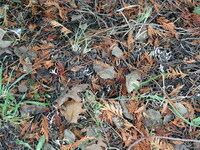 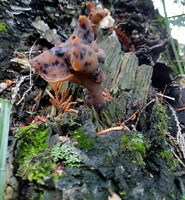 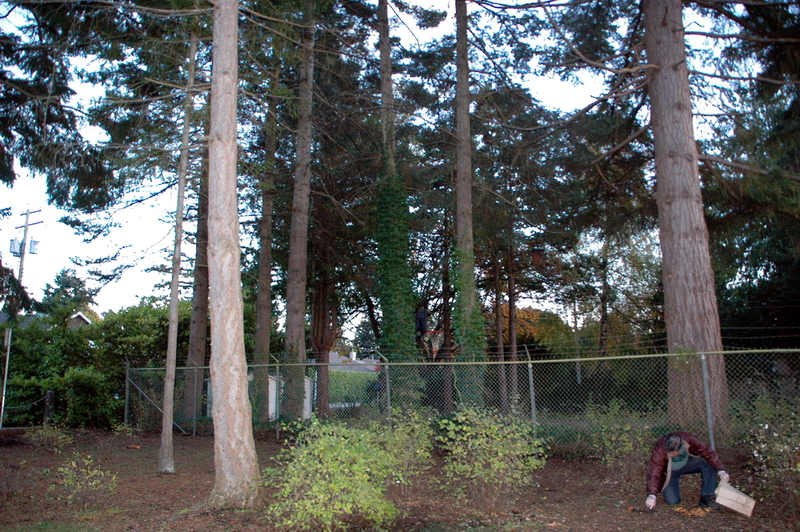 But be warned, identification of many species is very difficult and if you are wrong, it can be toxic or deadly. 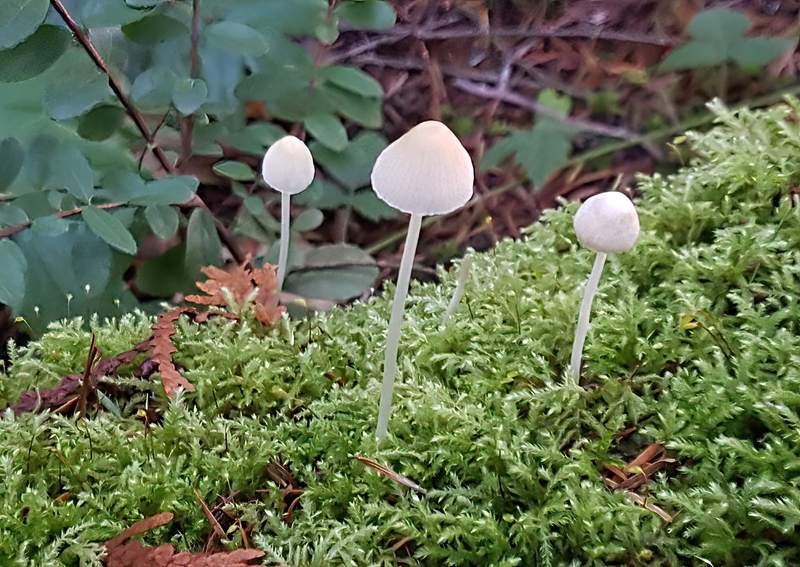 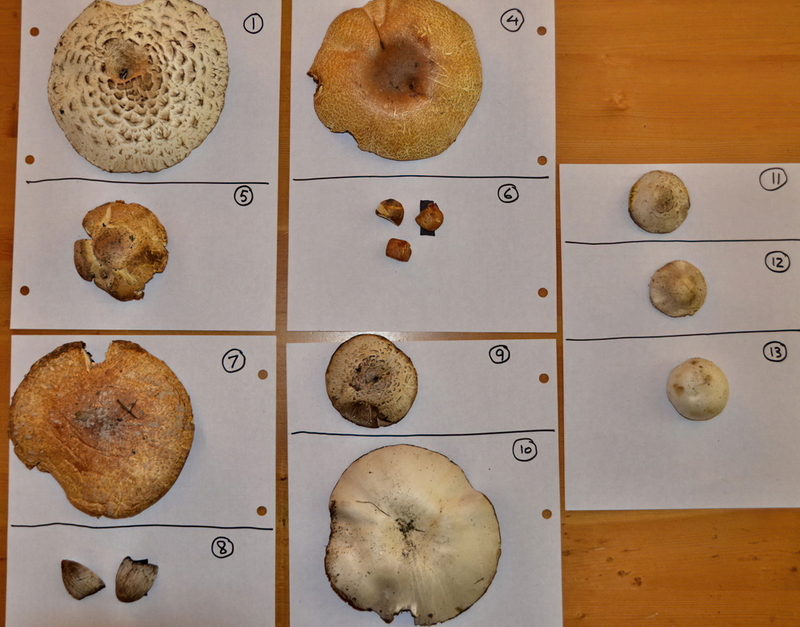 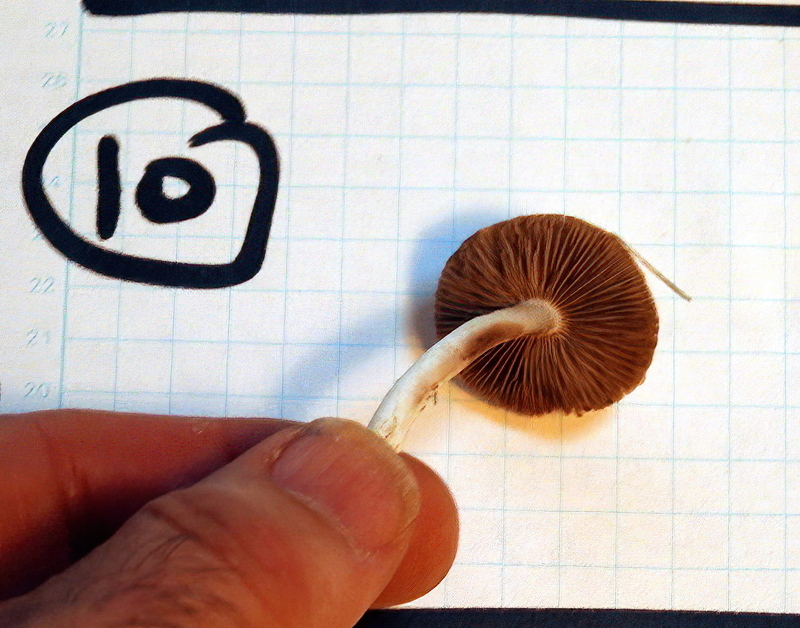 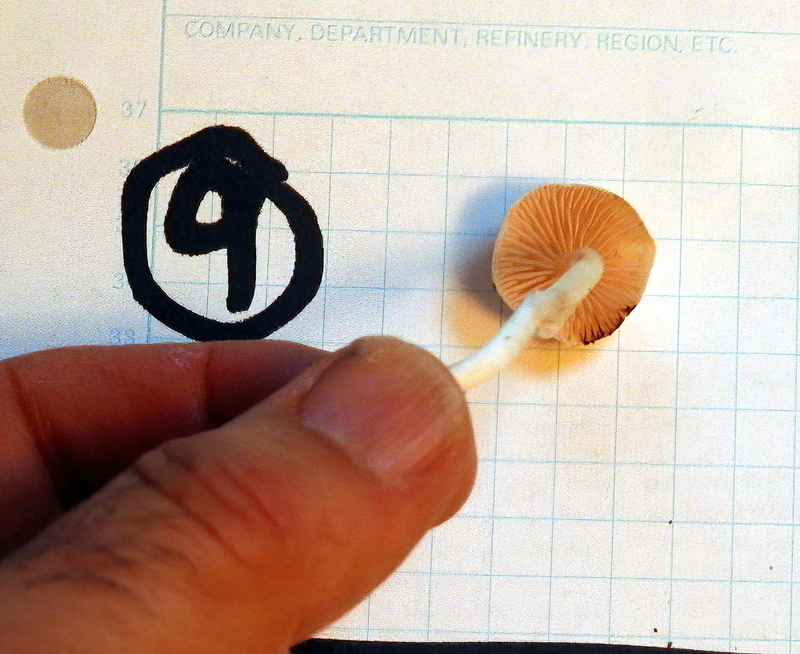 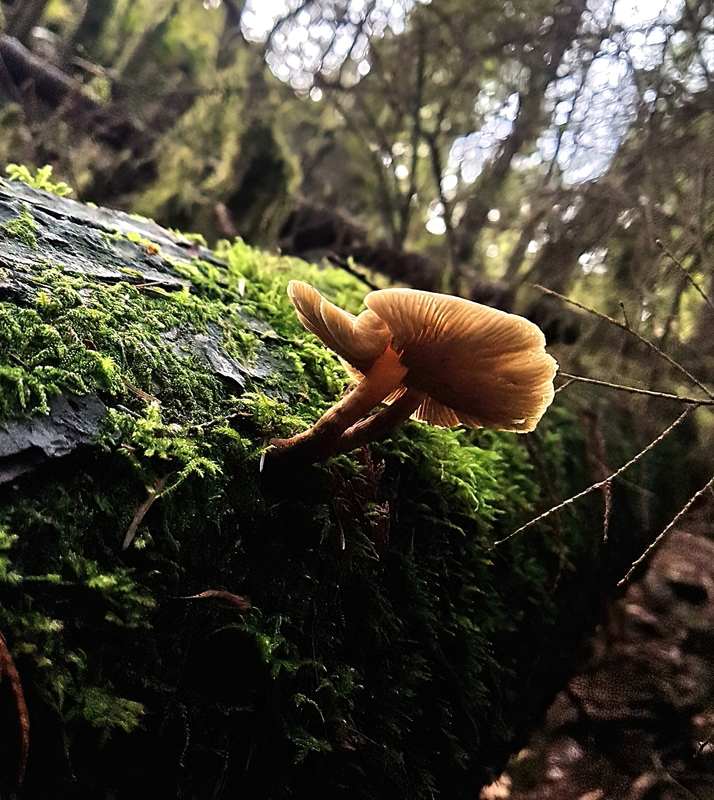 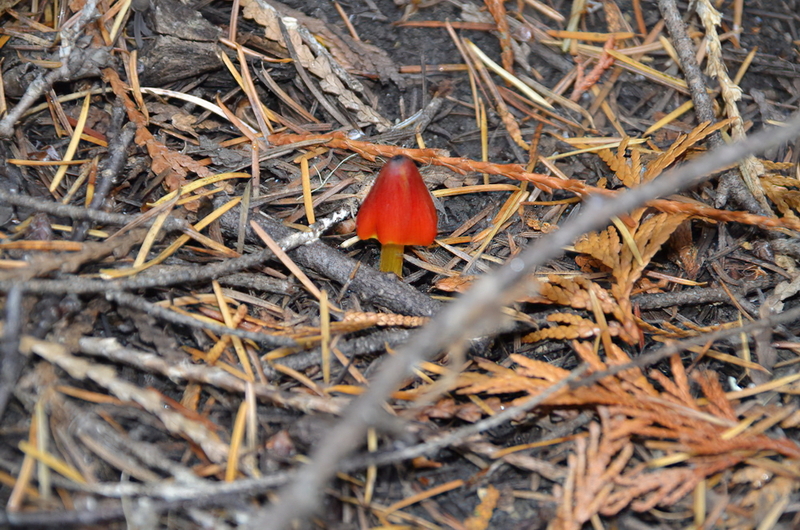 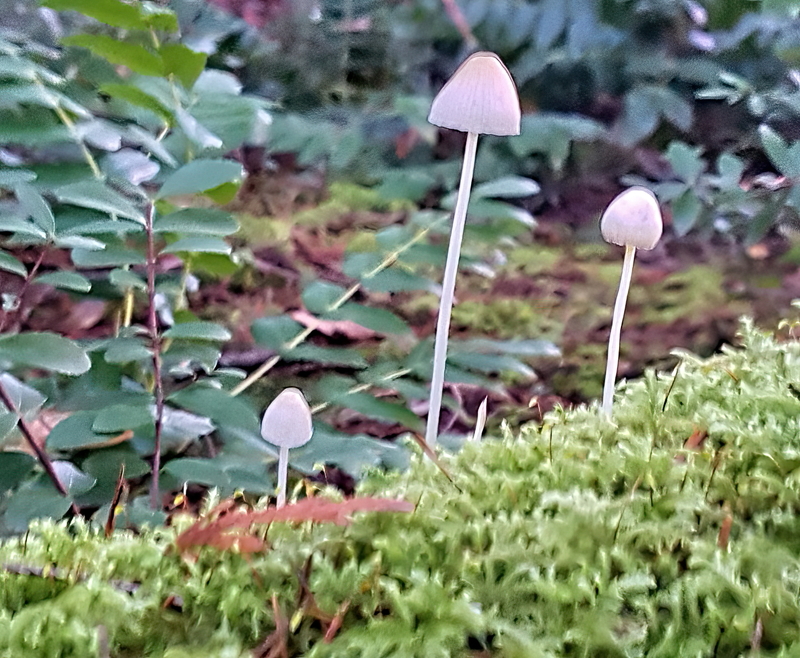 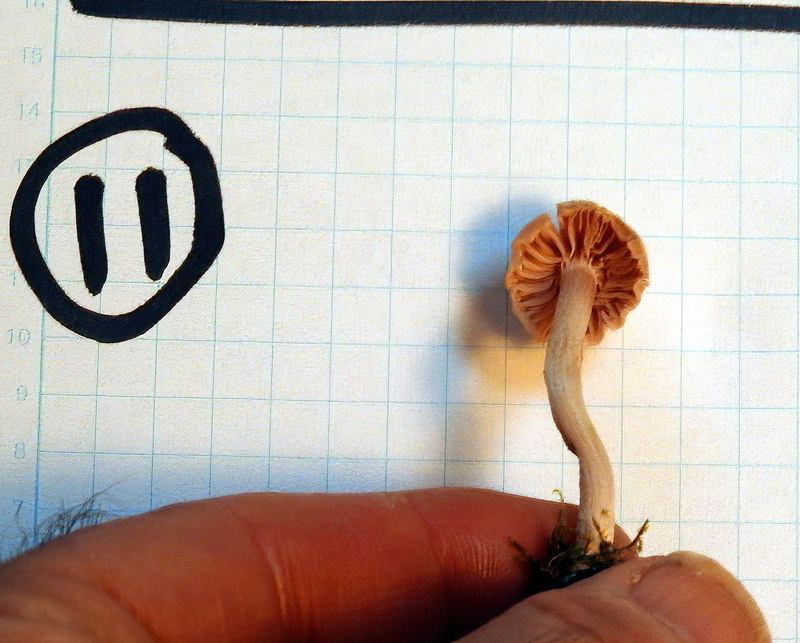 We have no useful expertise in mushroom identification yet, and the Confidence value in the table points out how sure (or not) we think we are of our identifications. 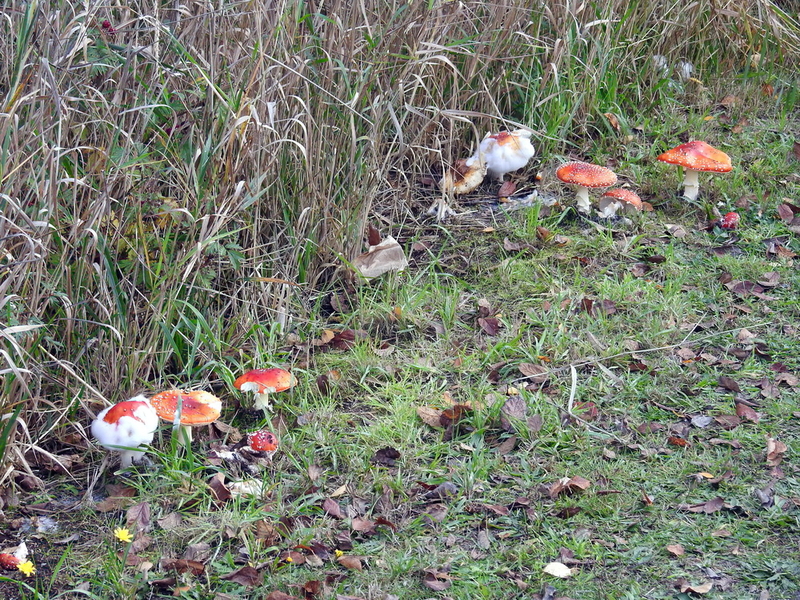 You'll notice that for most of them we're not very confident! You should not use this web page as a knowlegable resource, and any use of this material is at your own risk. 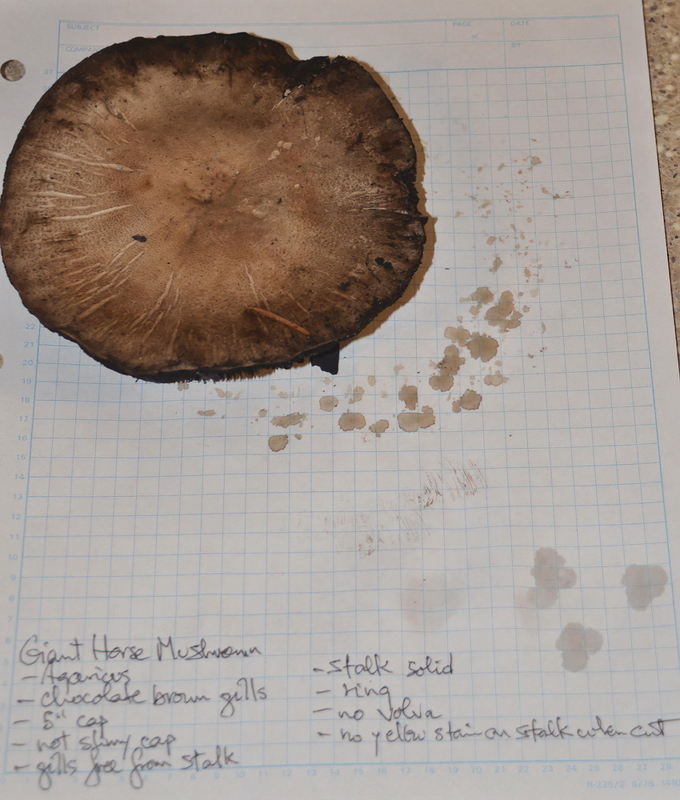 In the following table, click on any row to show/hide the detailed information for that mushroom, or click here to show/hide the details for the whole list or show all or hide all. 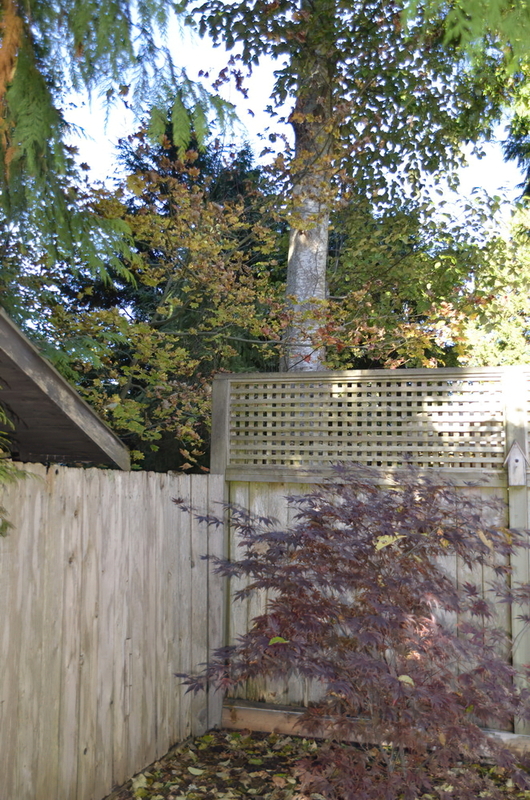 There are a lot of images, so it might take a while to load this page completely. Mouse over an image to see the description. 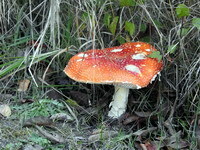 Click on any image to see it full size in a new browser tab or window. 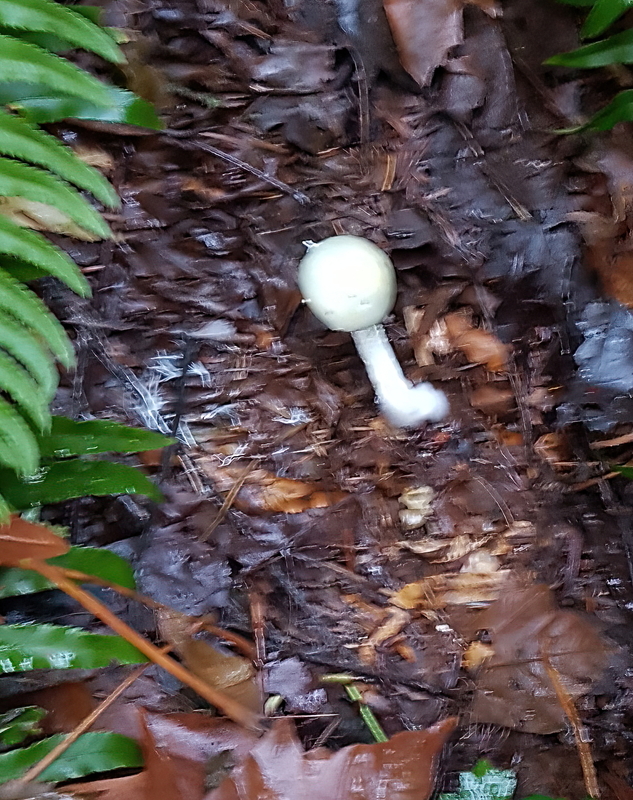 Can I eat it? 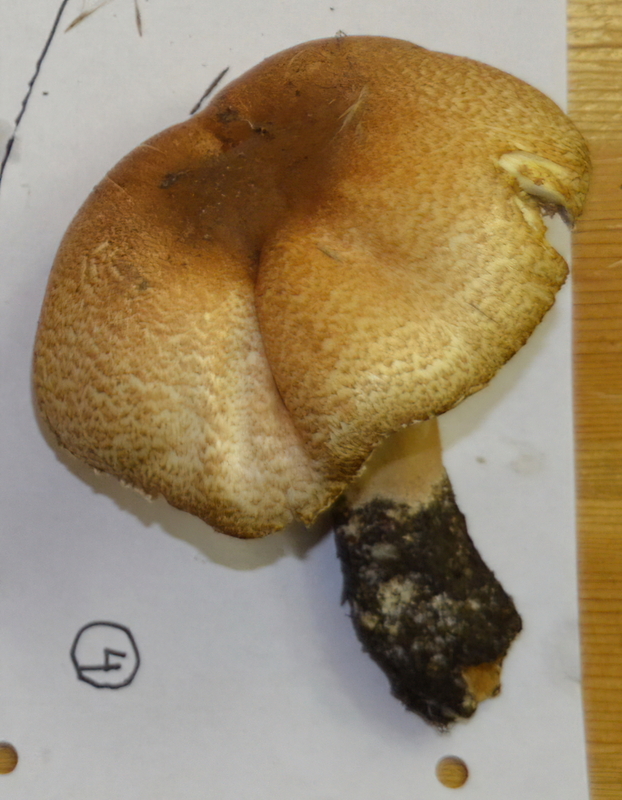 A popular favourite if campestris, else ??? Can I eat it? ? Can I eat it? 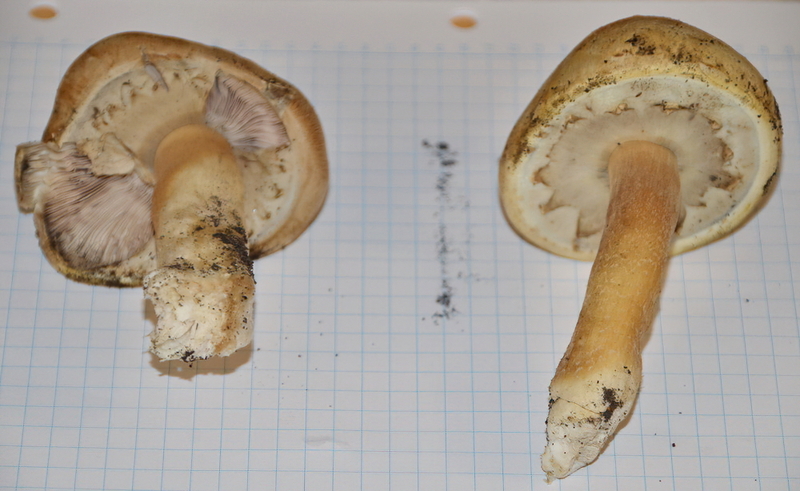 Edible when firm, but bland. 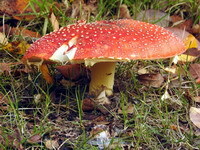 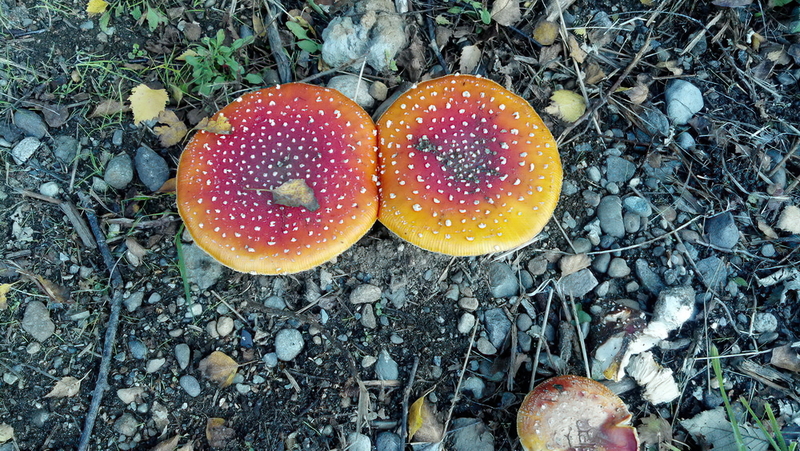 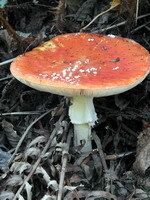 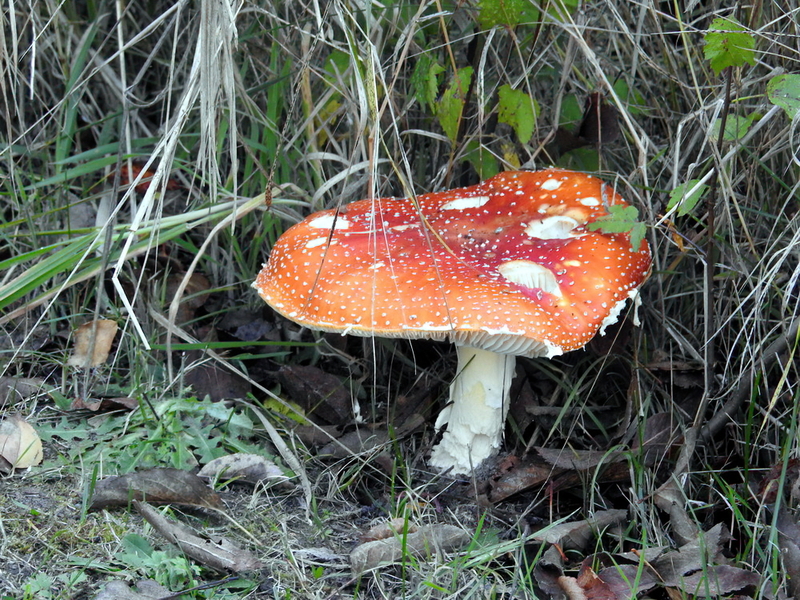 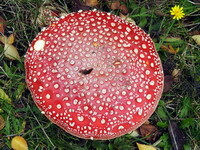 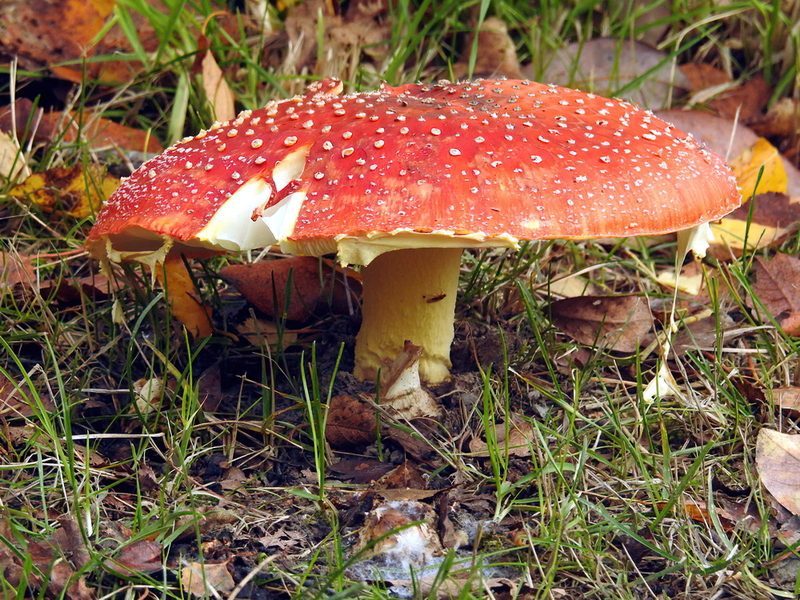 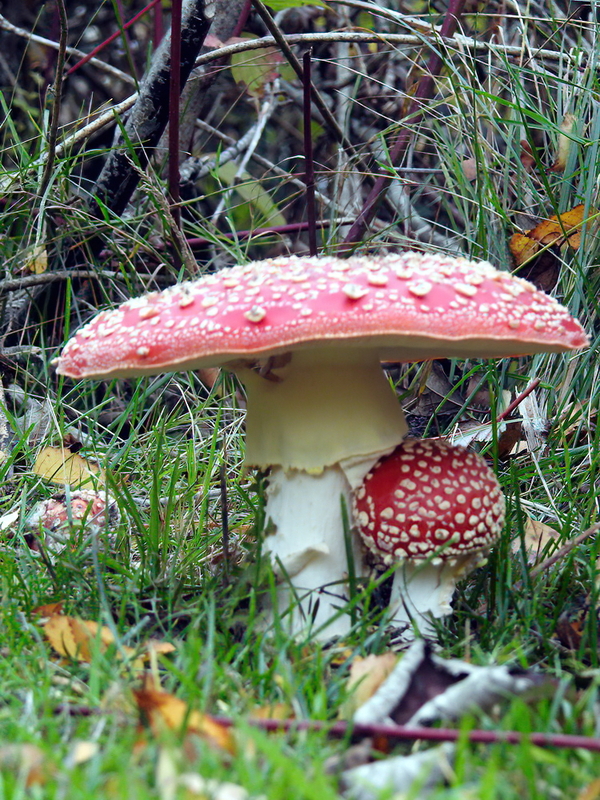 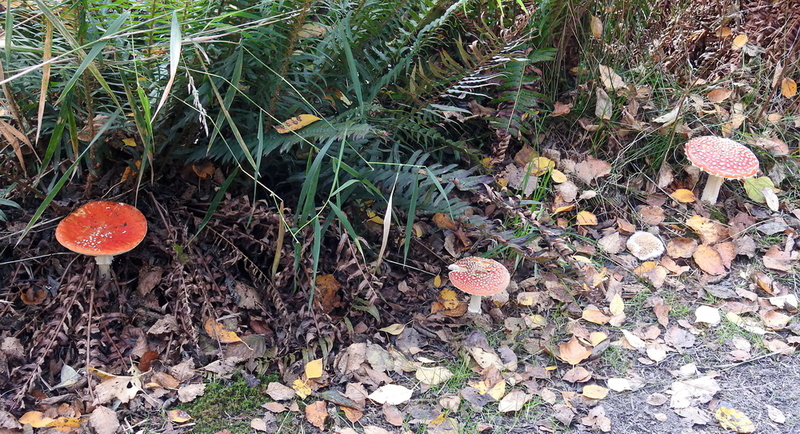 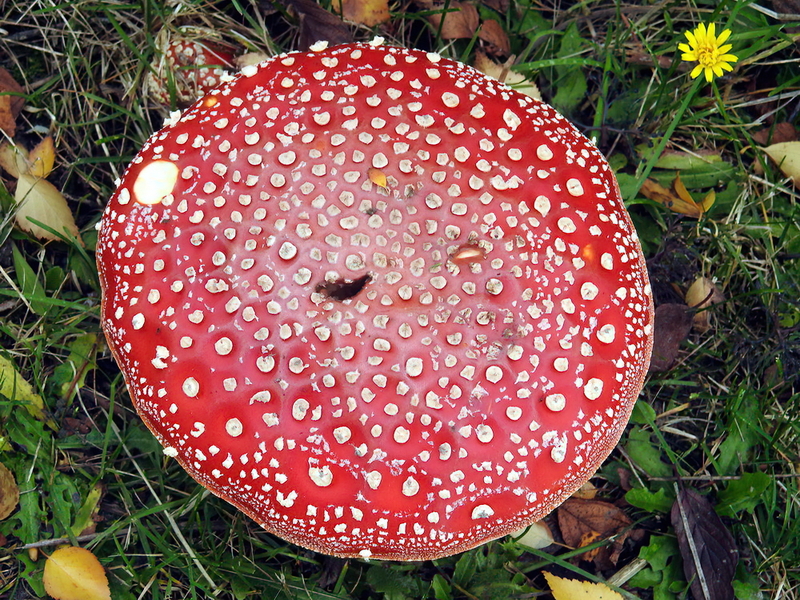 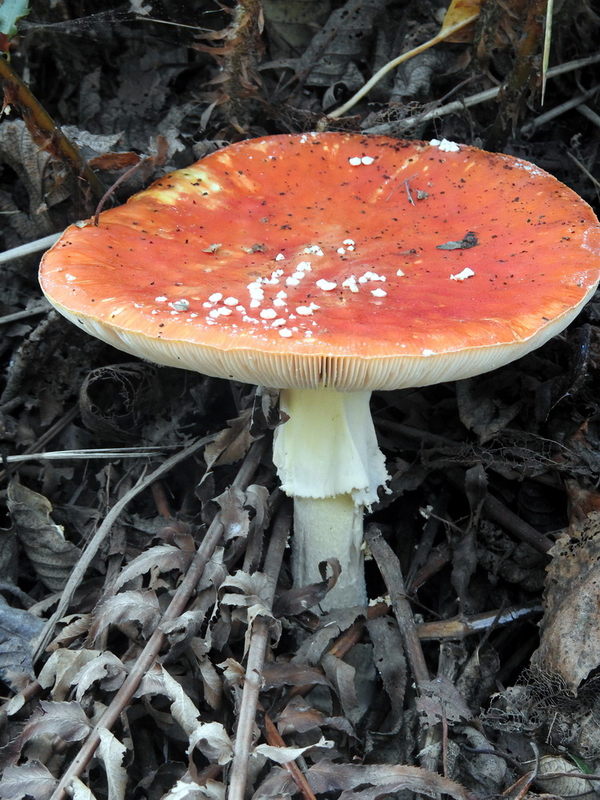 Many Amanitas are poisonous so be sure! 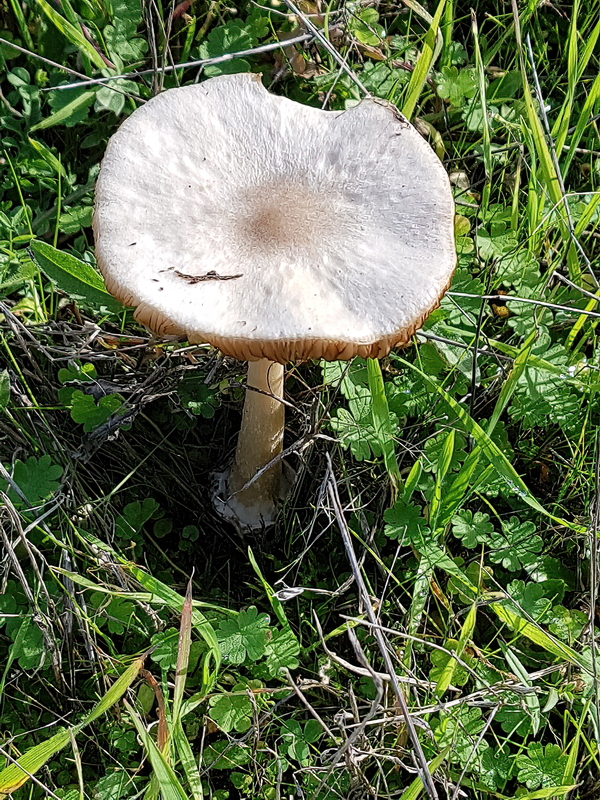 Can I eat it? 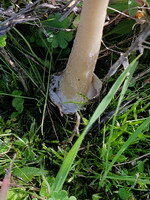 Most people are fine with them, but many people get nauseous if they consume wine within days of eating Shaggies. 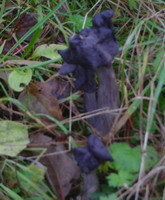 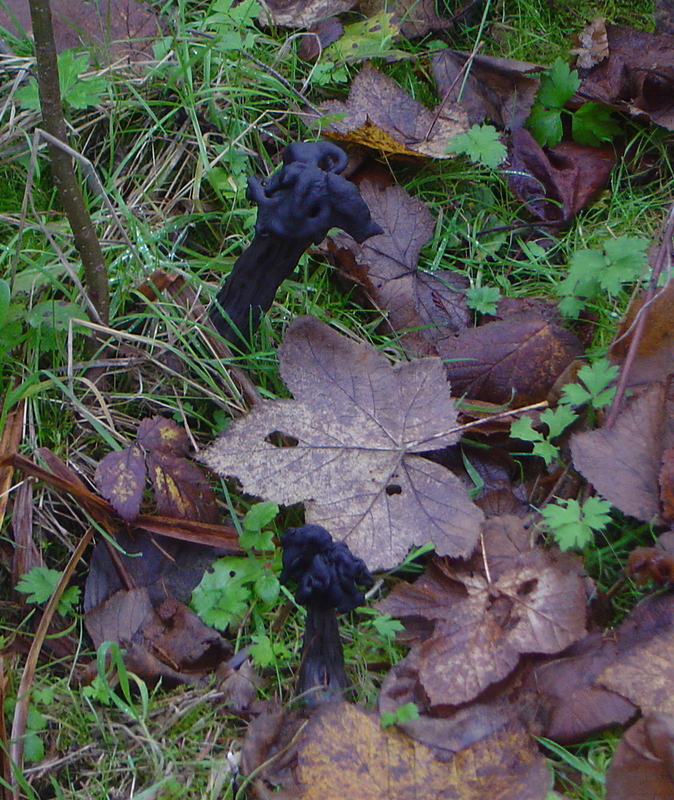 Don't eat them if they've started to go black. 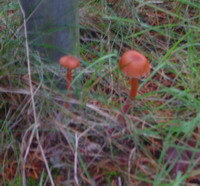 Experience These are one of the few we are certain we can identify and Glen has eaten them a few times found in different locations. Can I eat it? 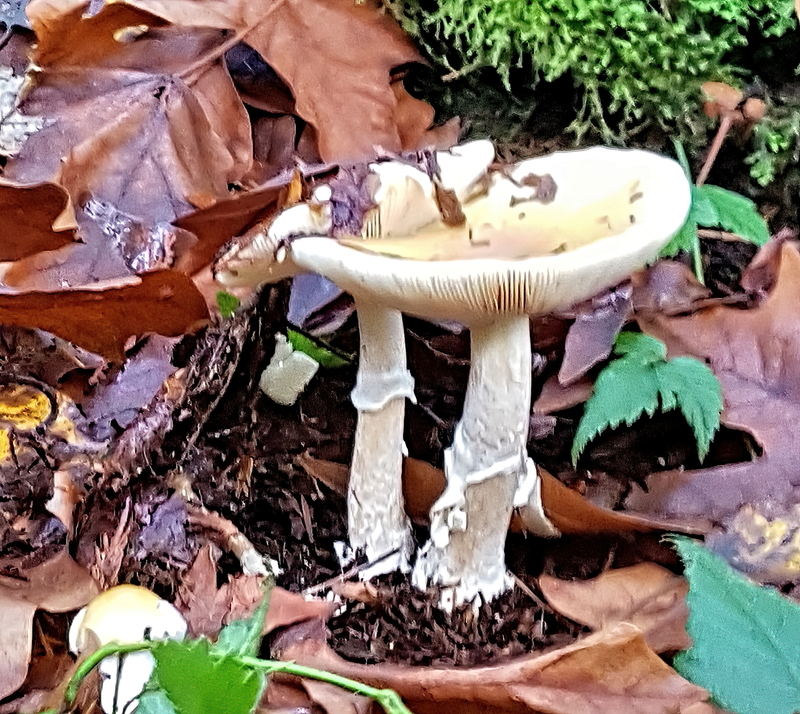 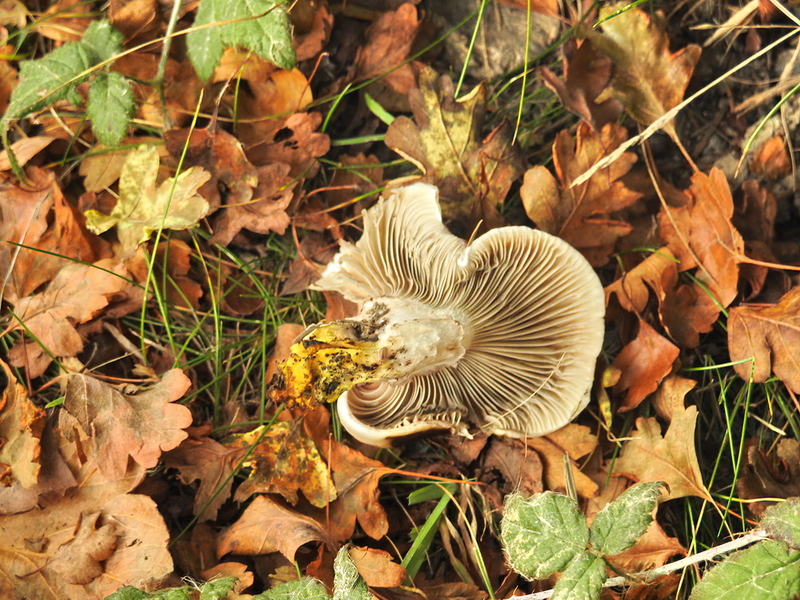 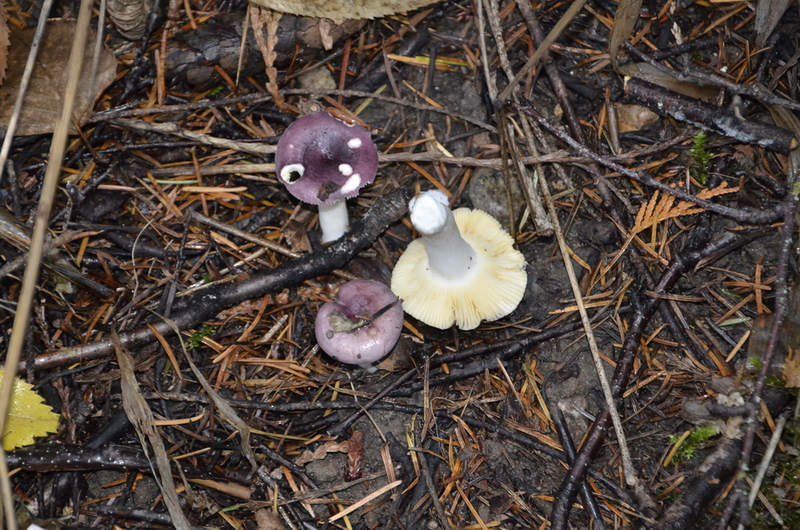 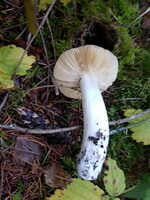 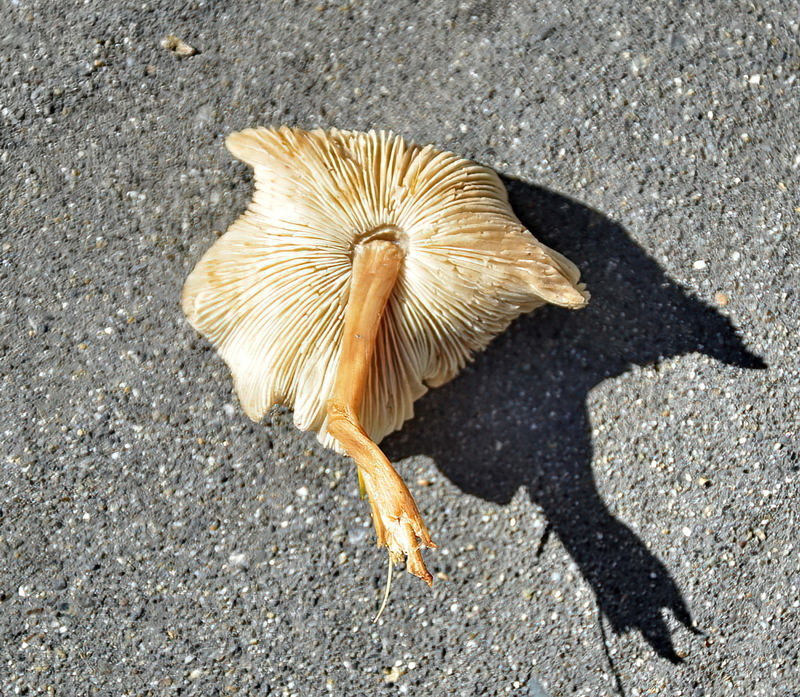 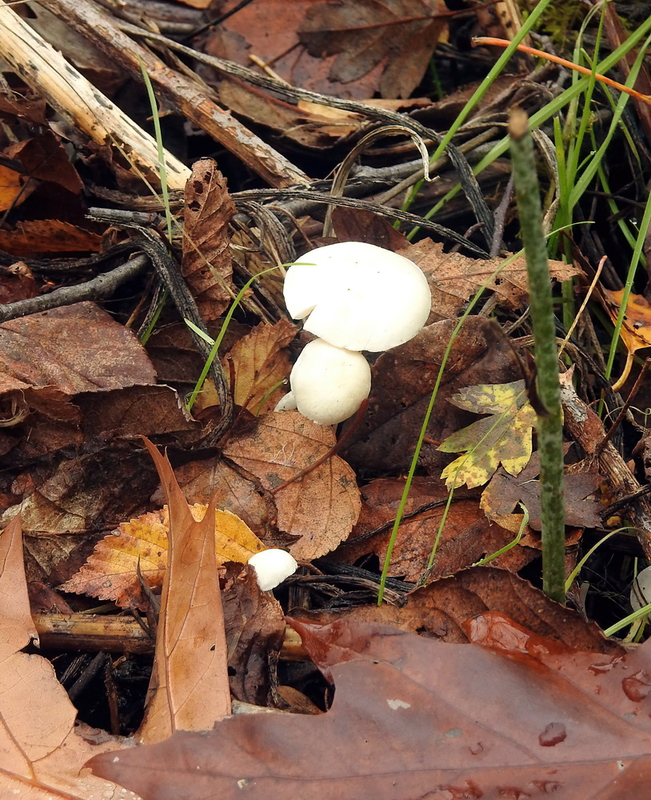 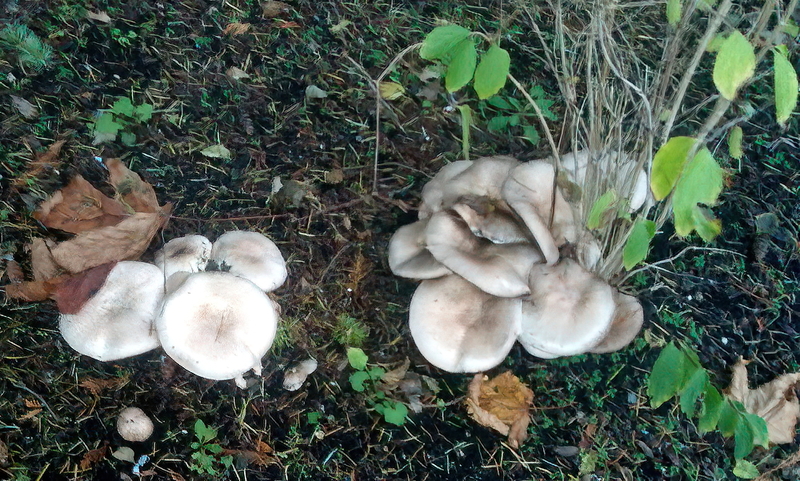 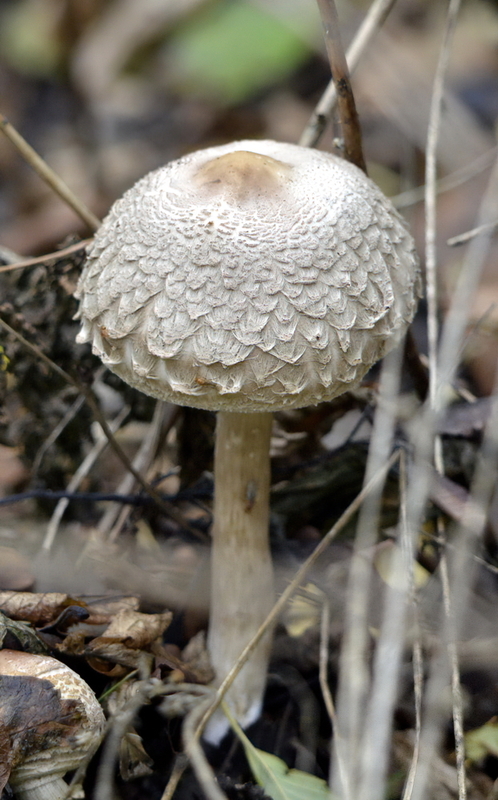 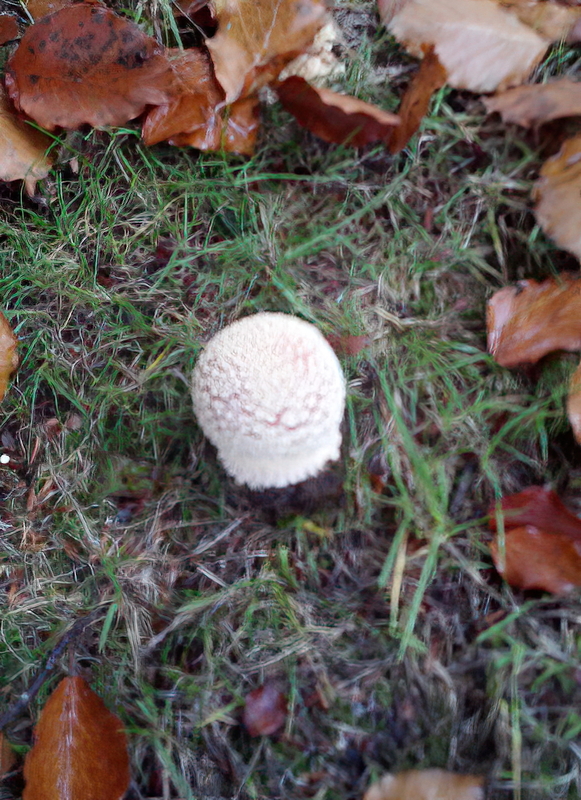 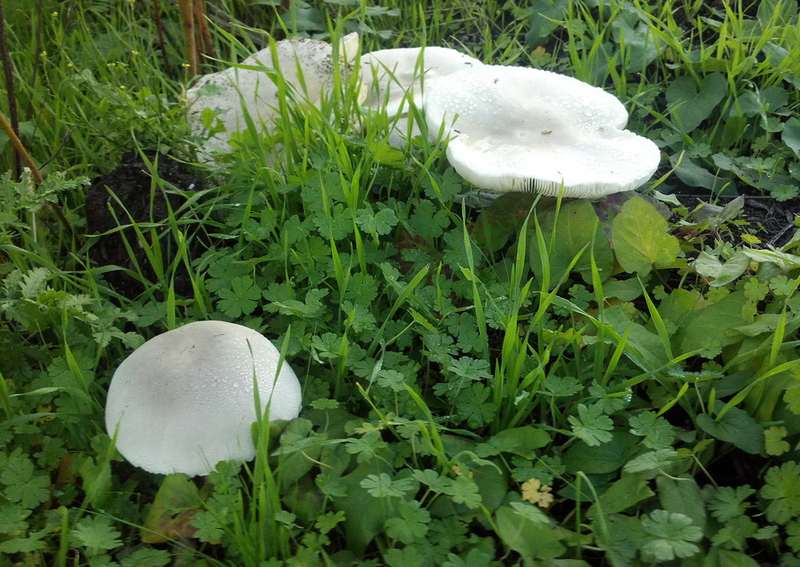 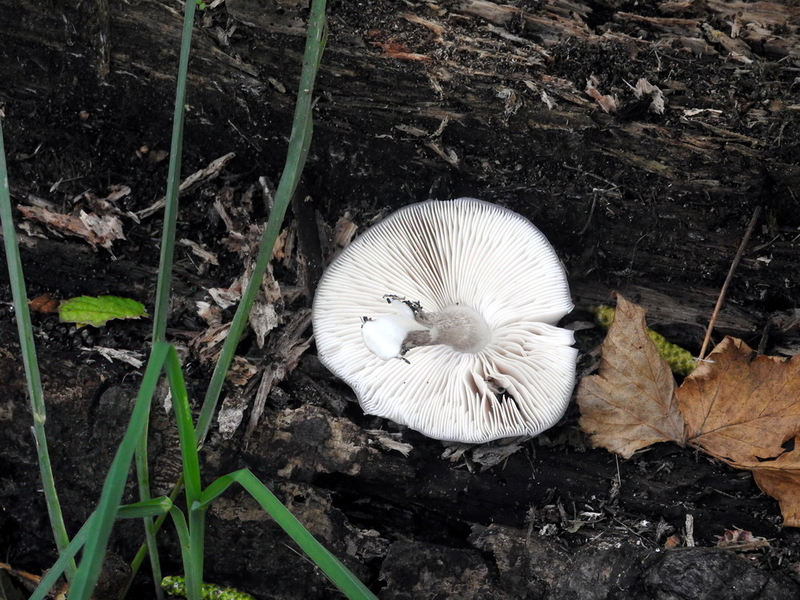 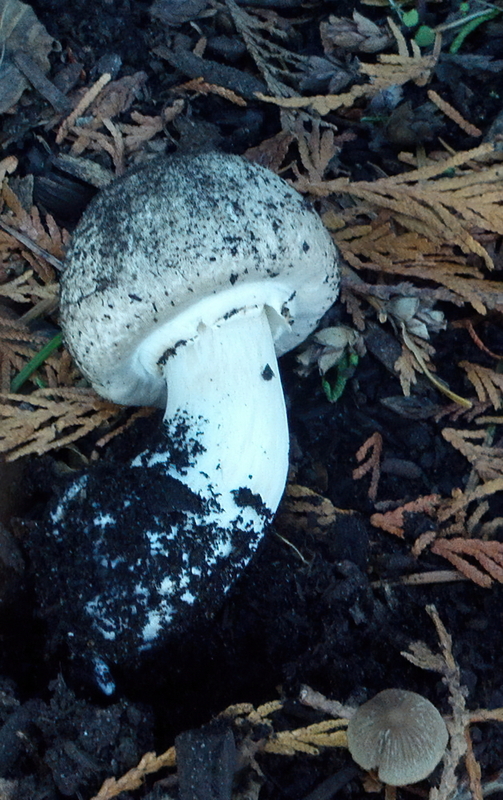 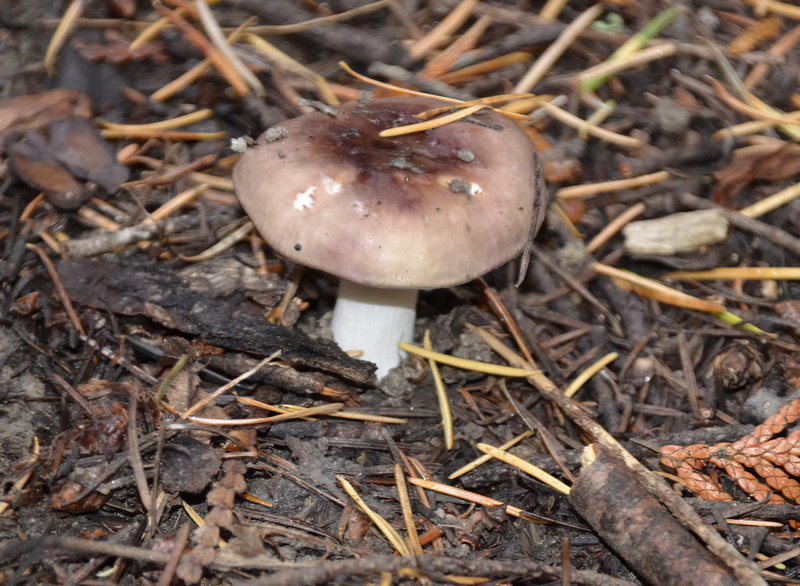 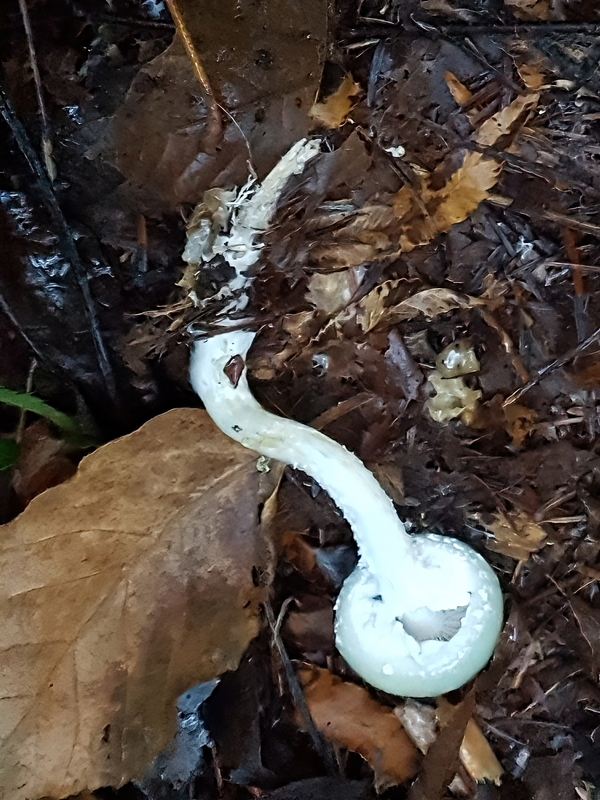 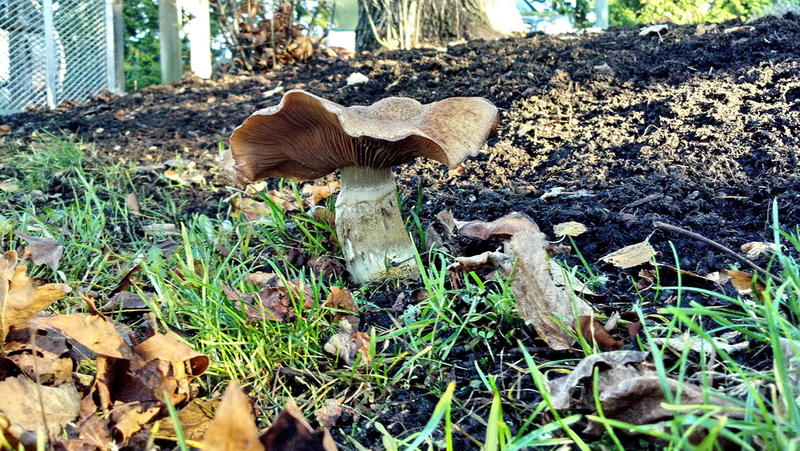 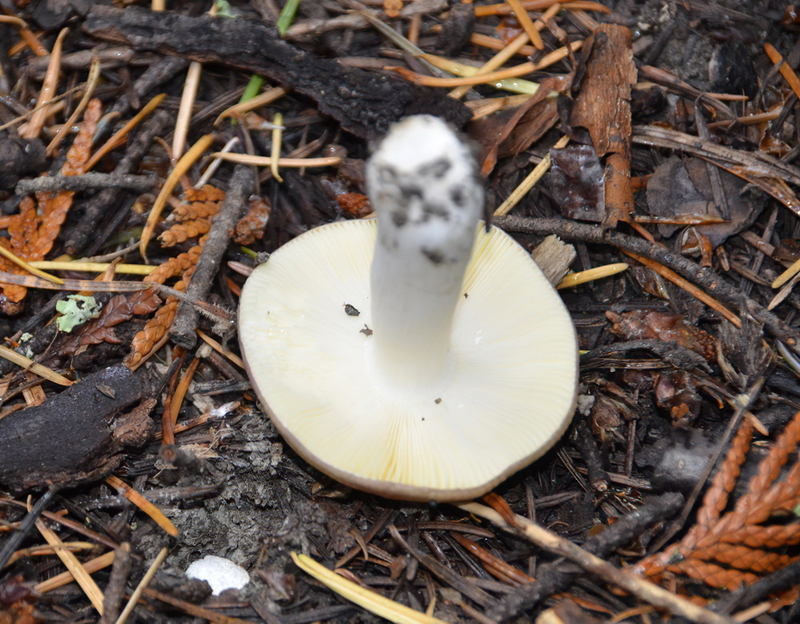 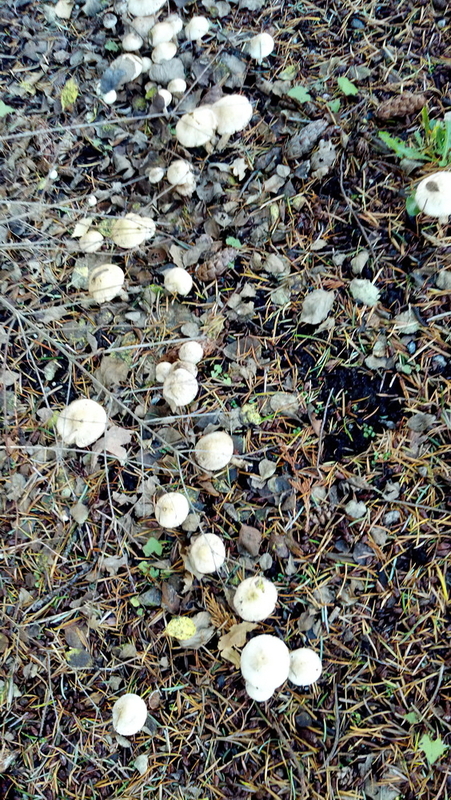 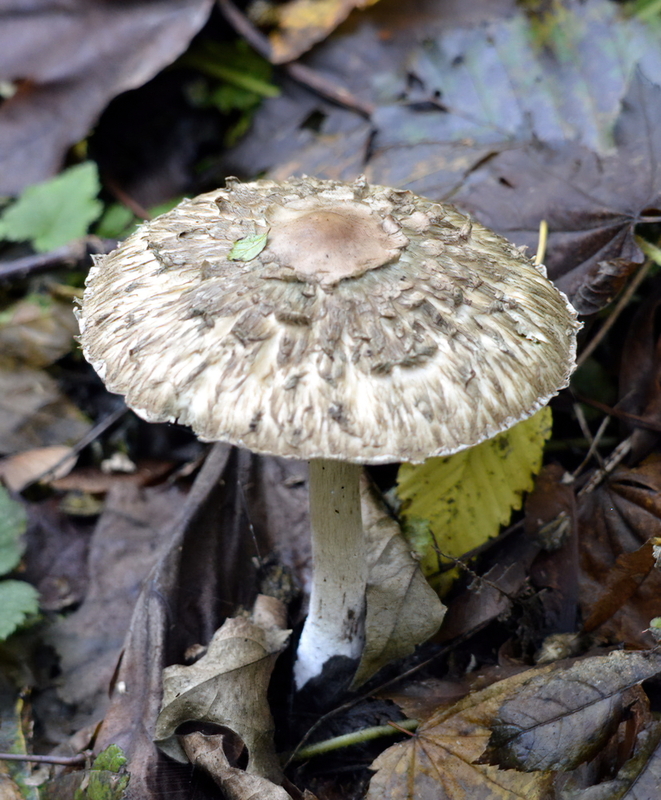 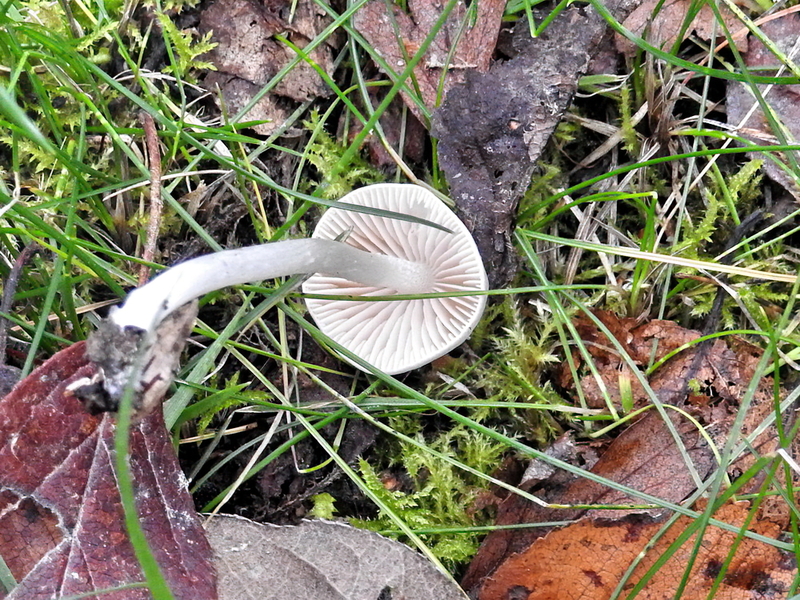 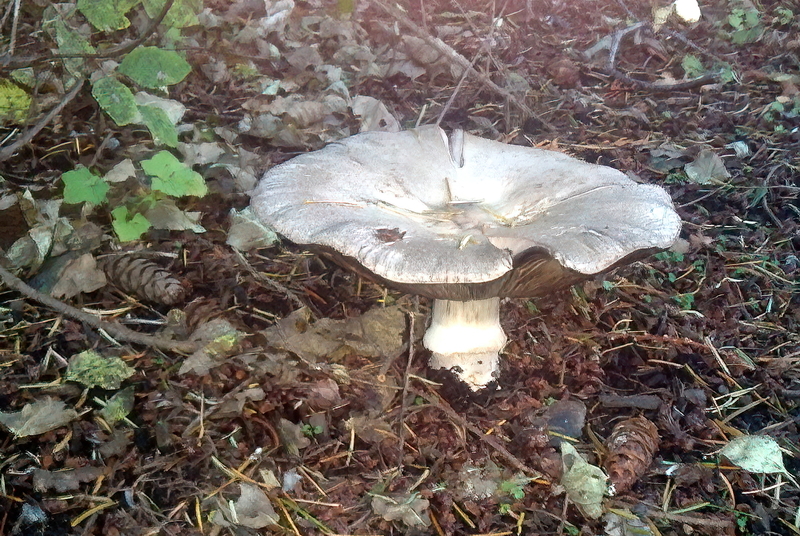 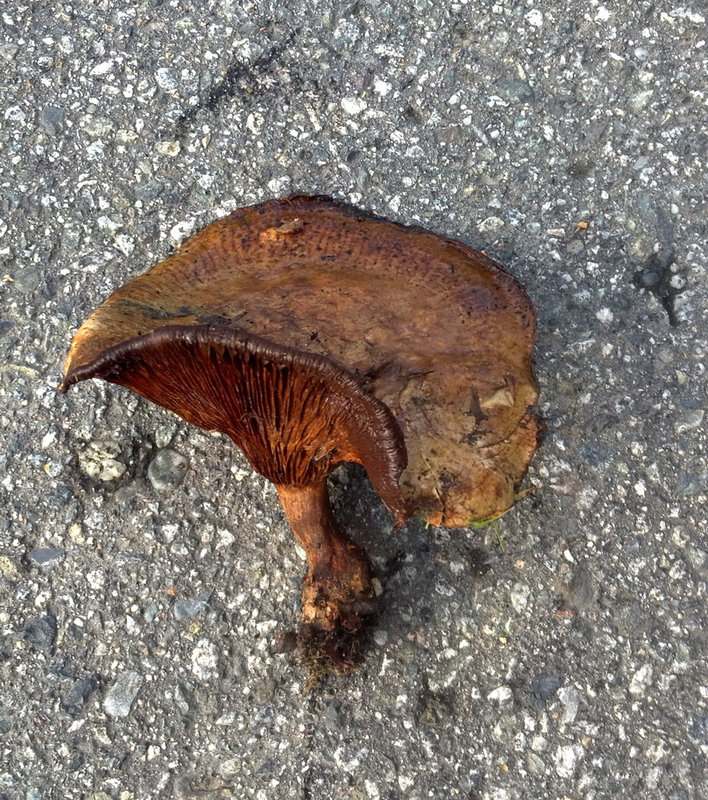 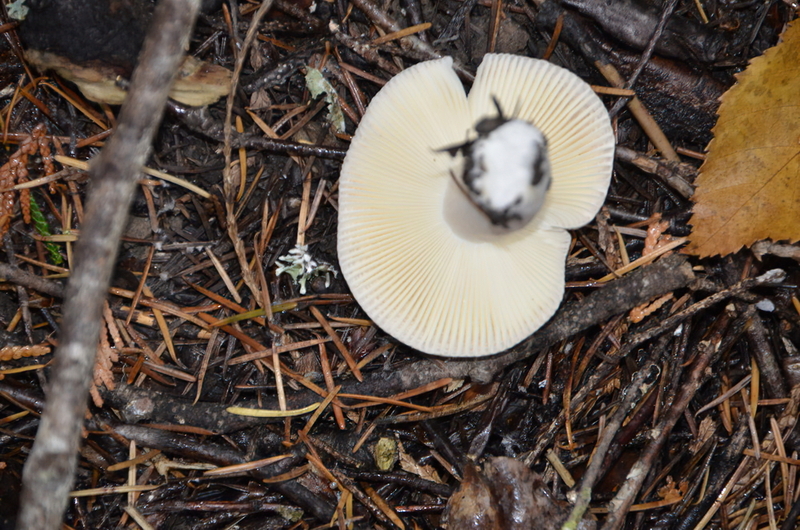 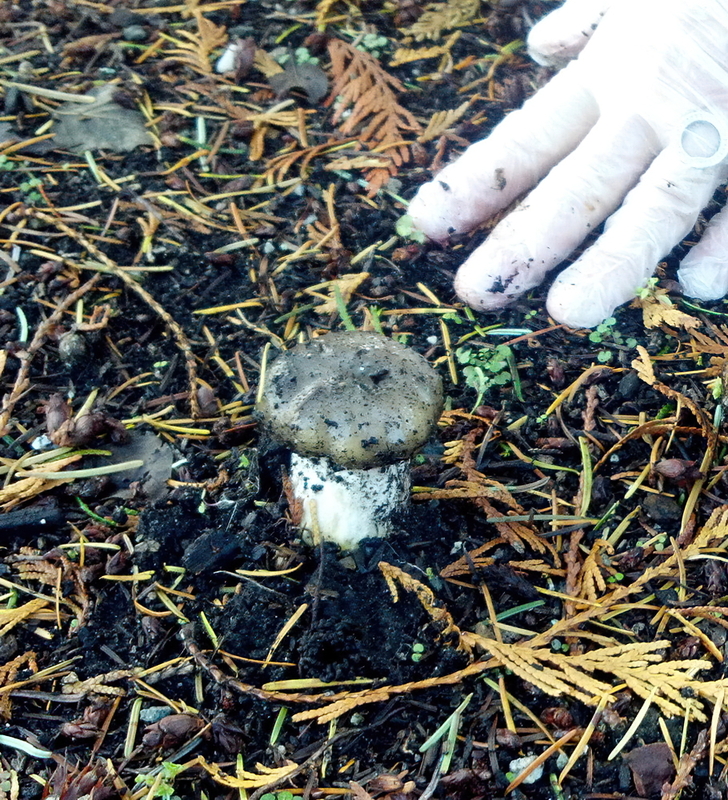 Delicious, but be careful not to confuse it with the Destroying Angel! 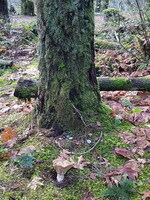 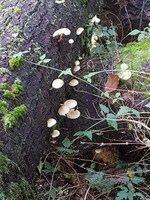 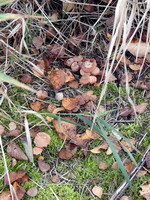 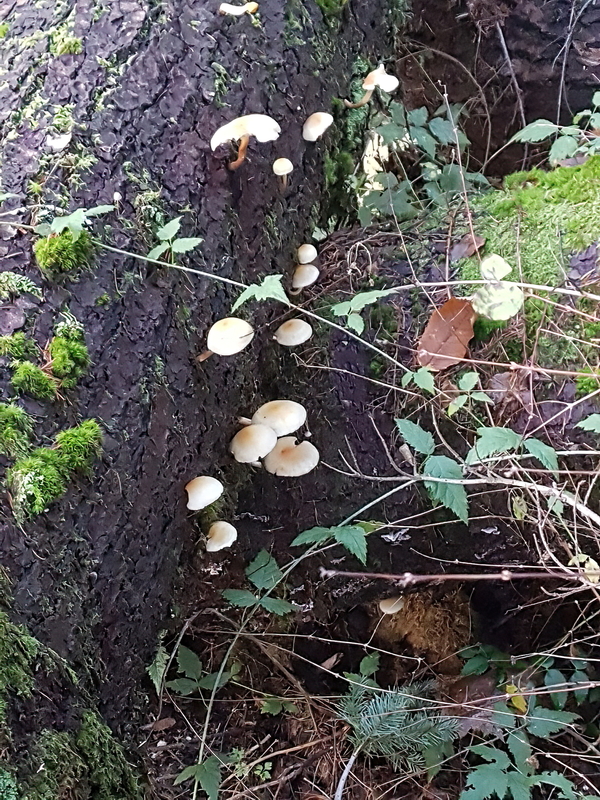 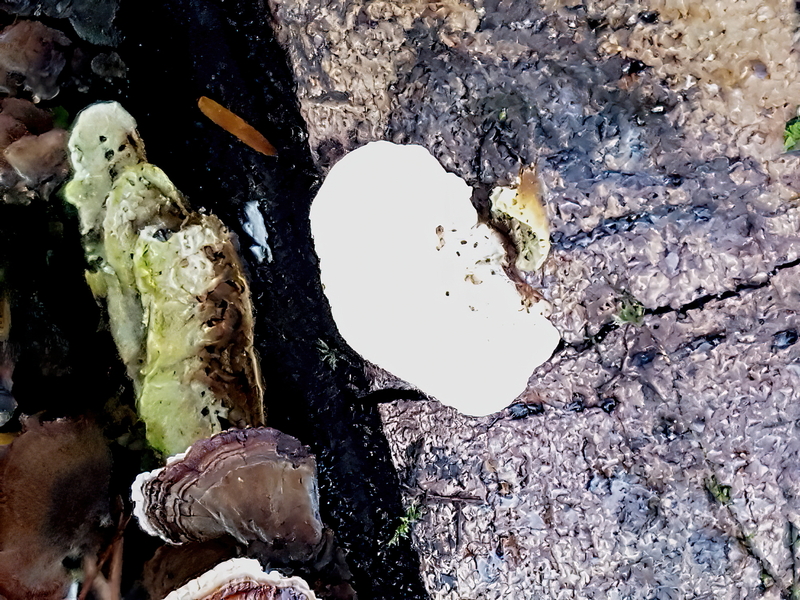 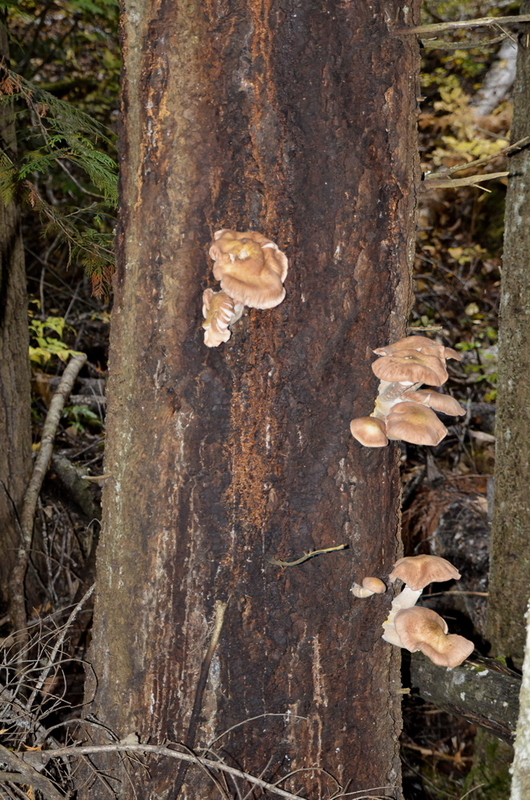 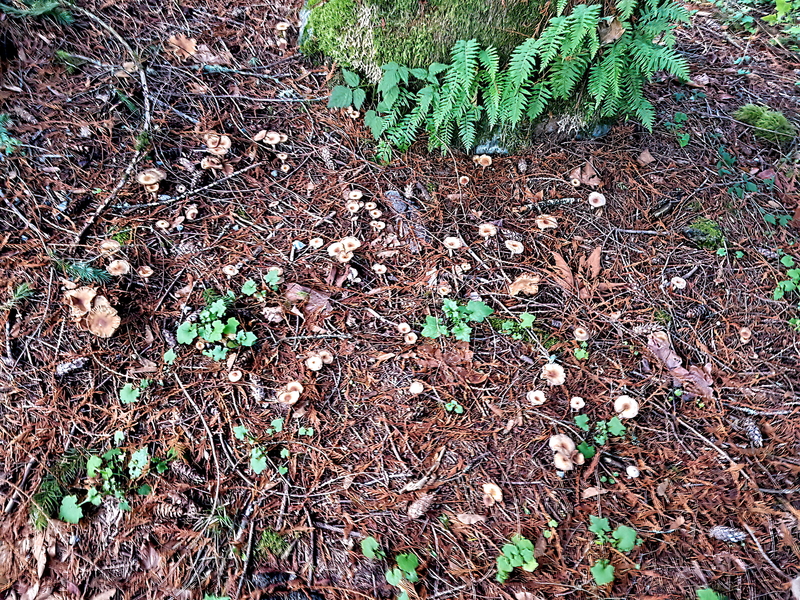 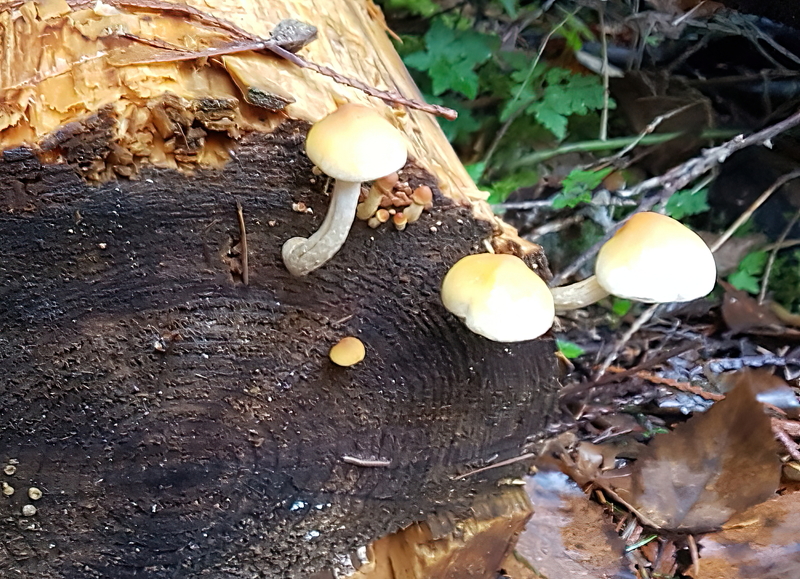 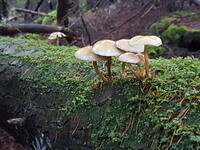 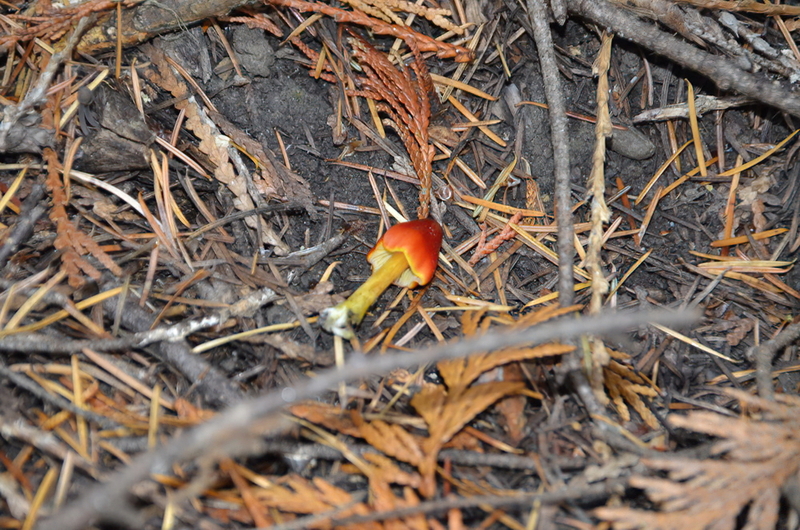 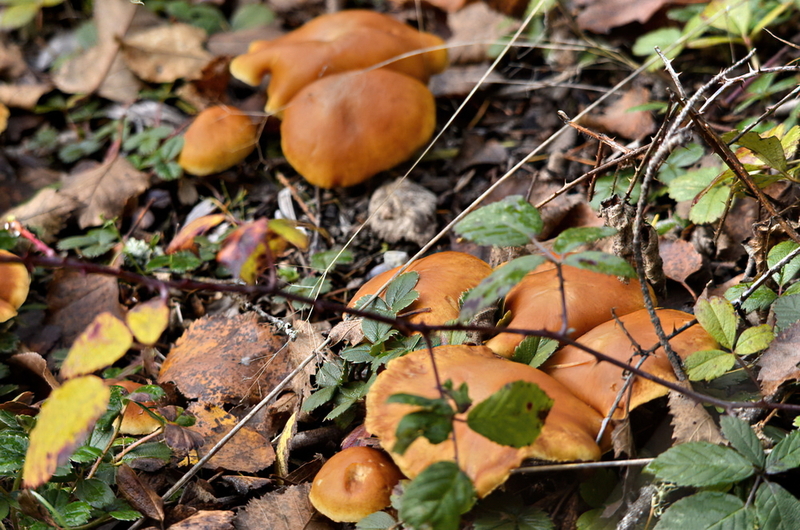 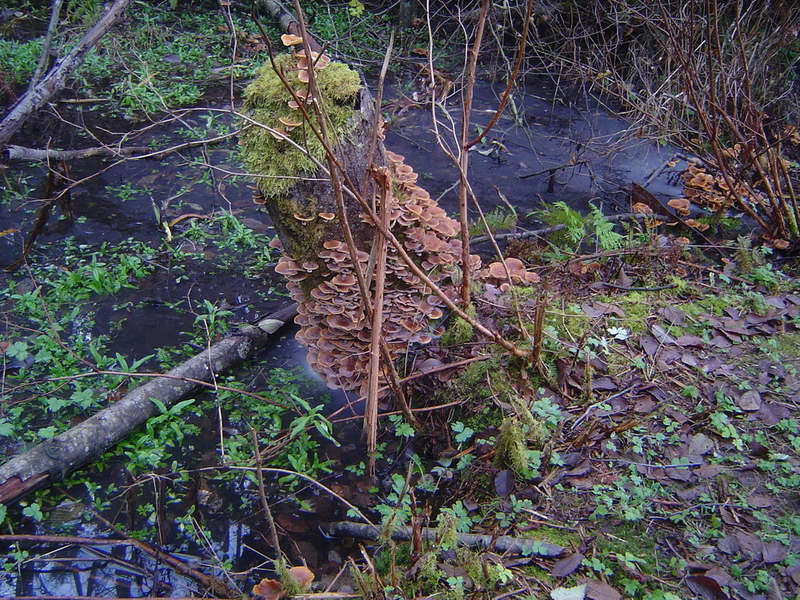 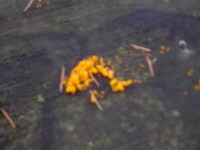 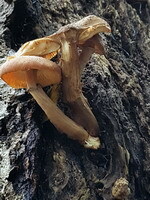 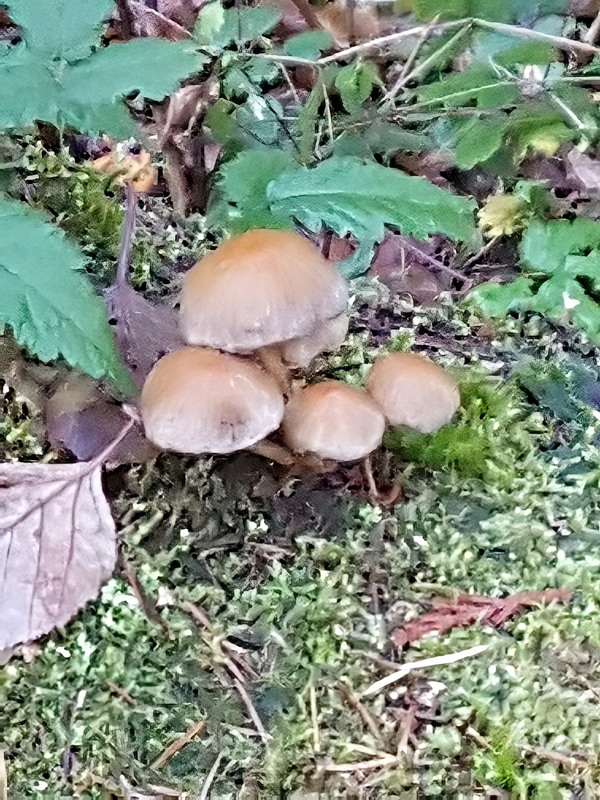 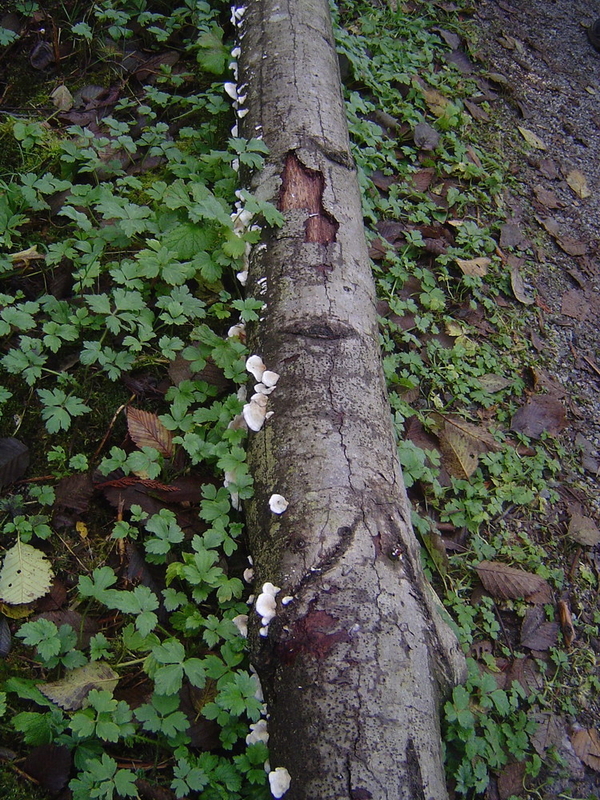 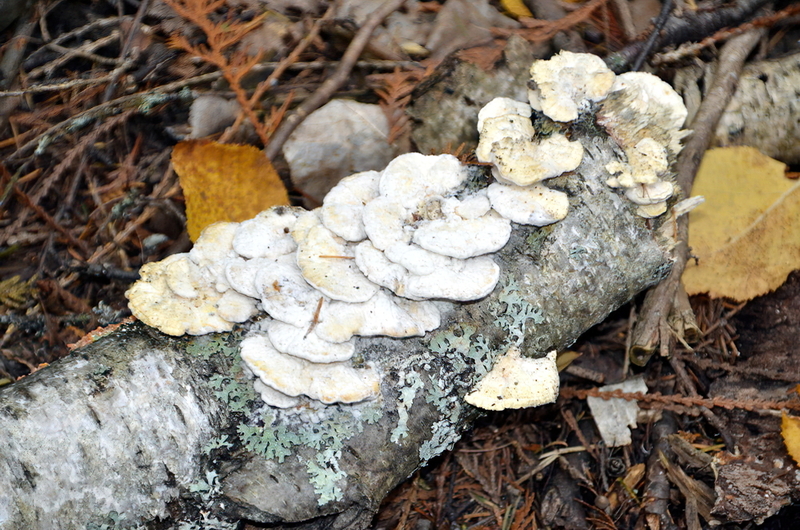 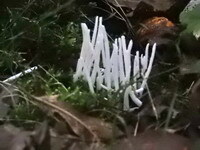 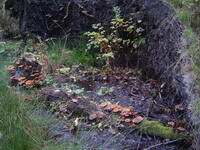 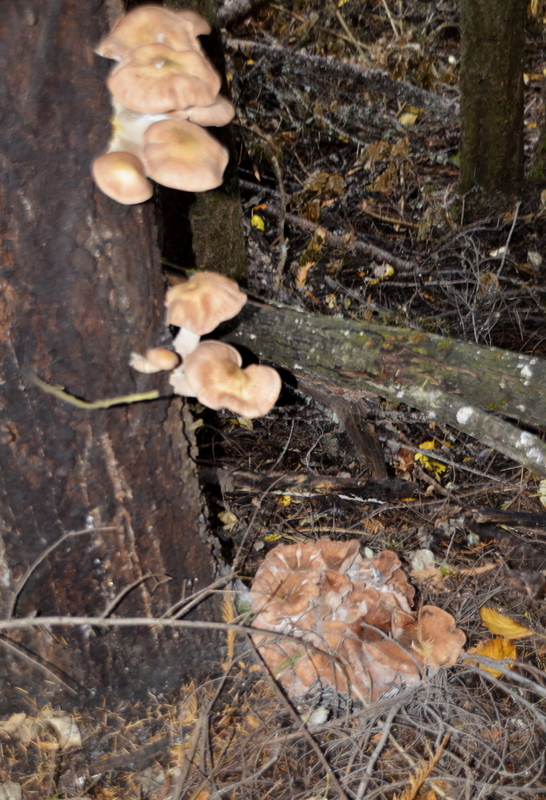 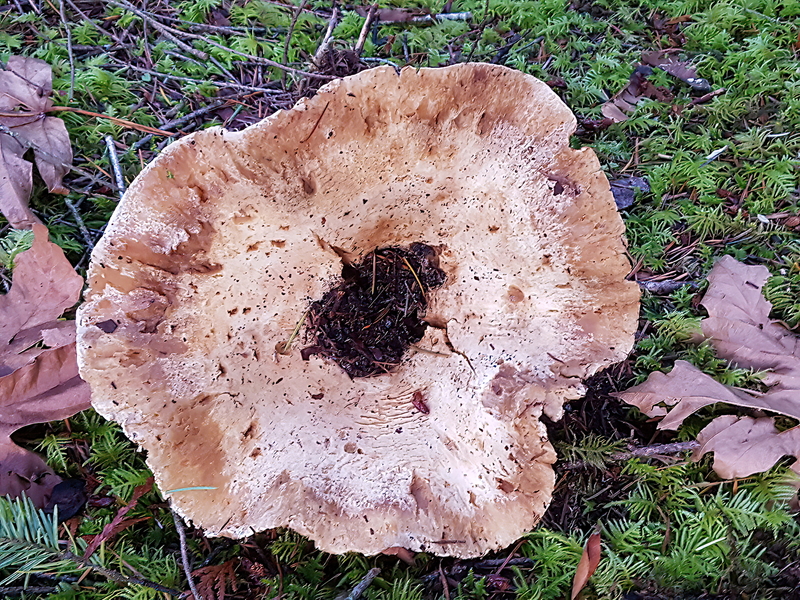 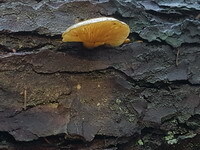 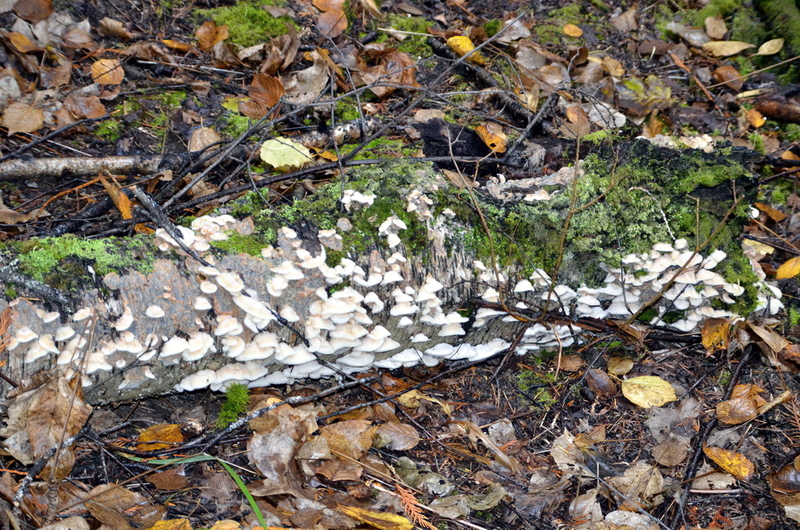 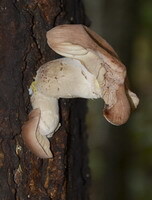 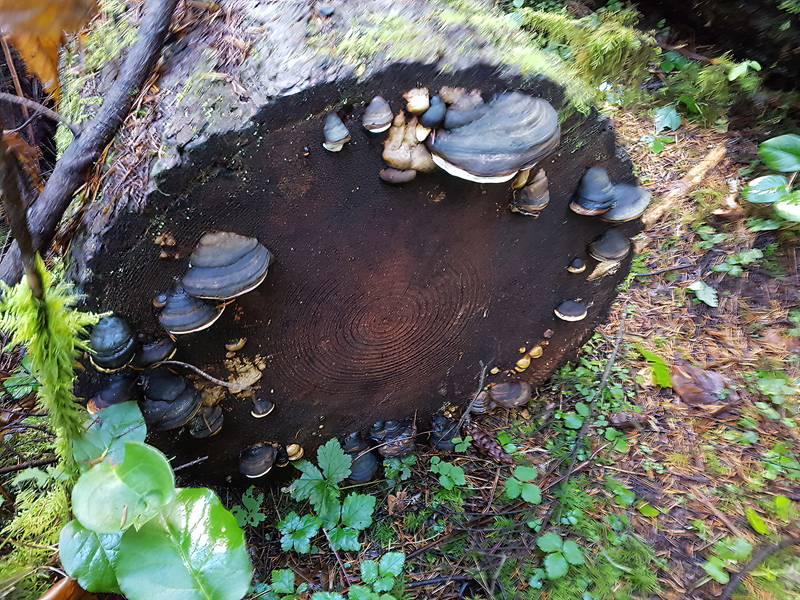 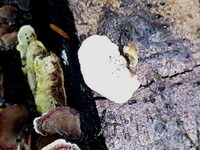 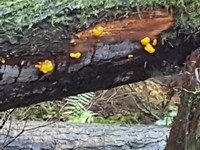 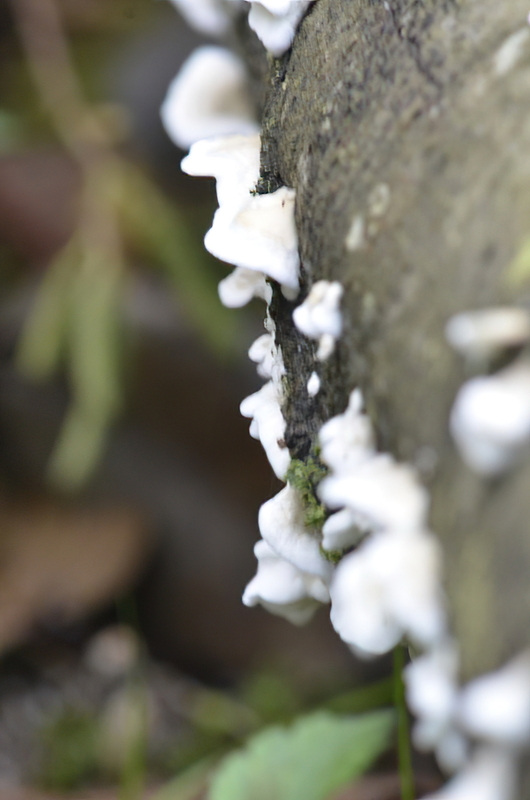 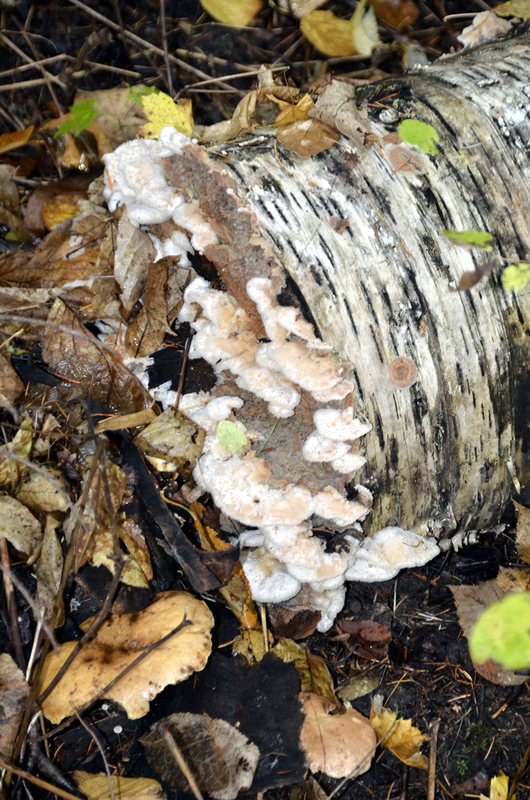 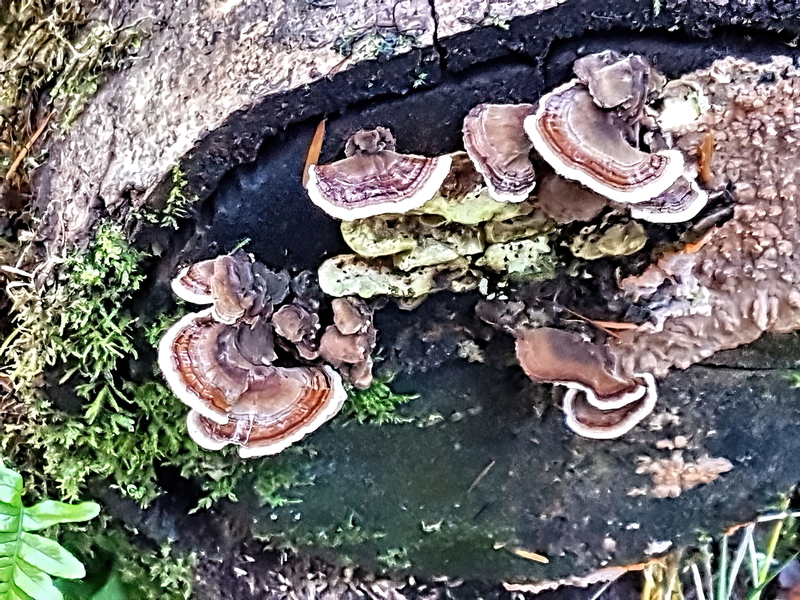 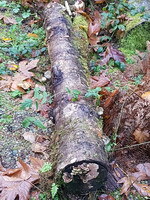 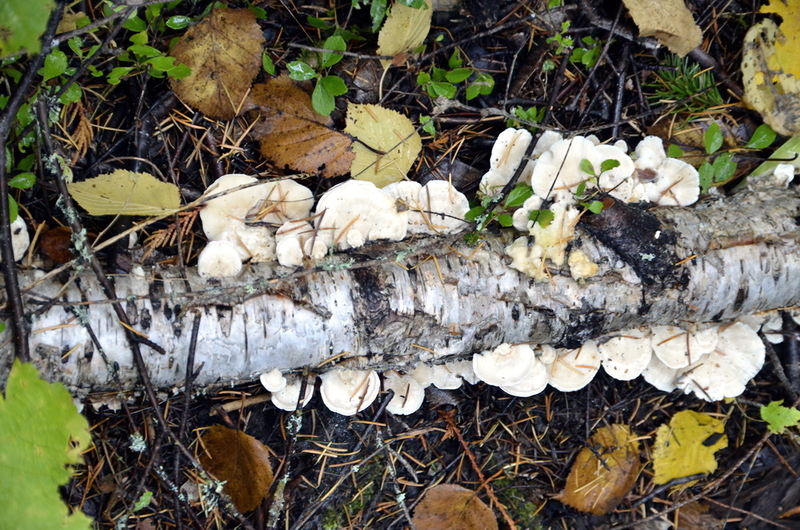 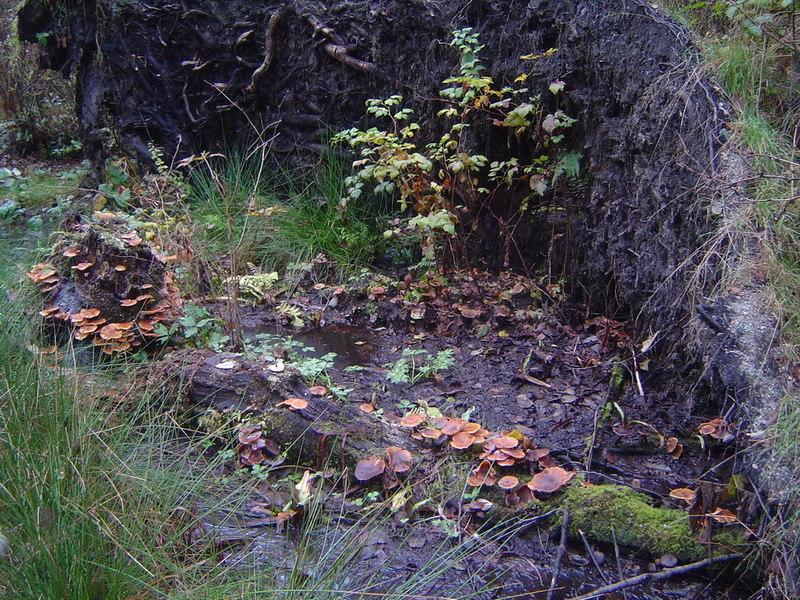 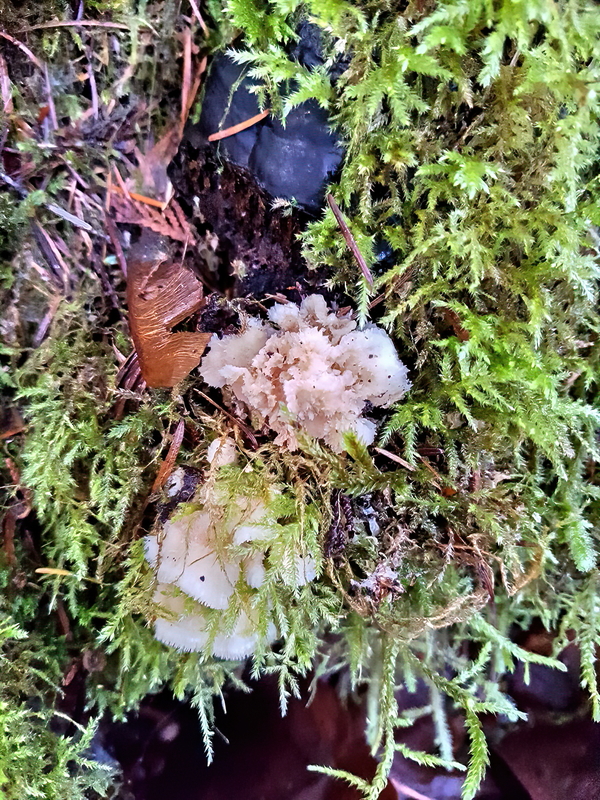 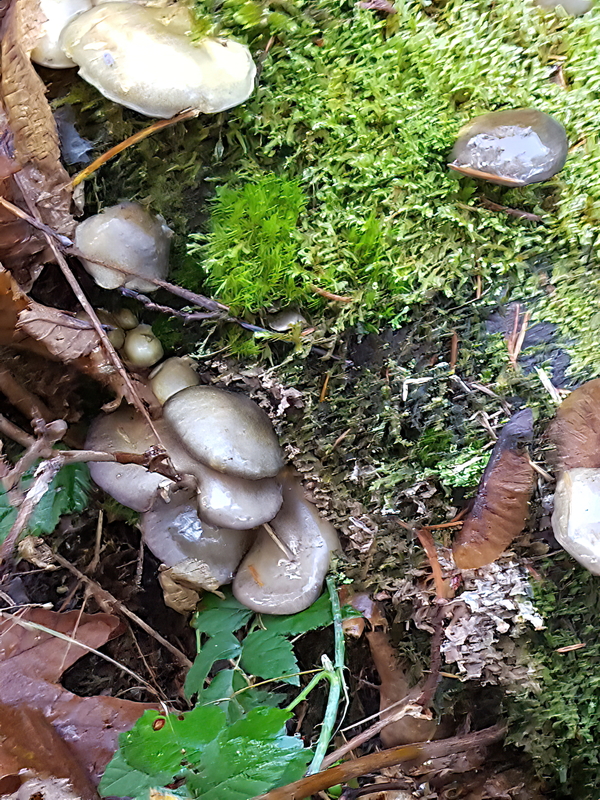 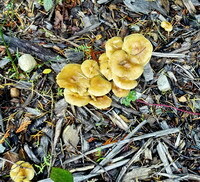 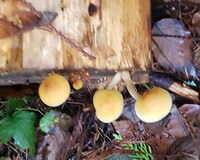 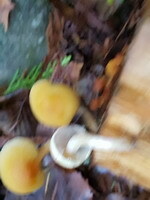 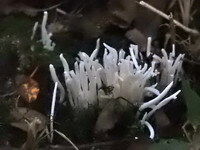 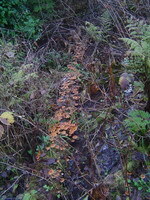 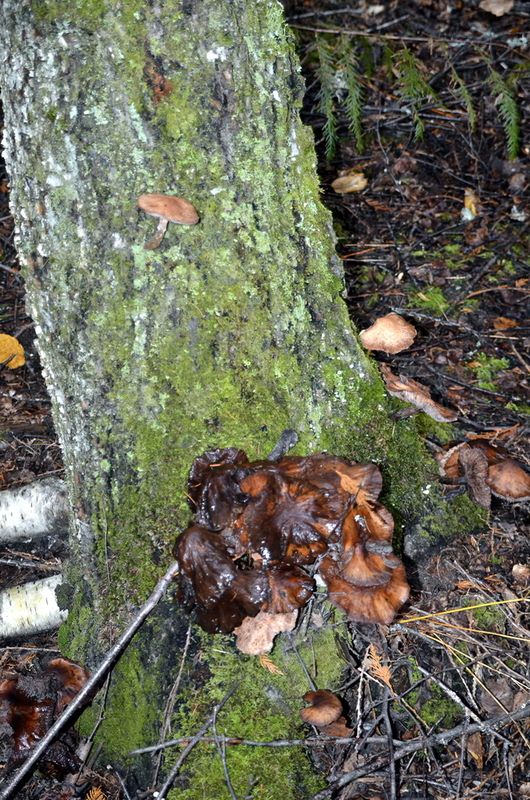 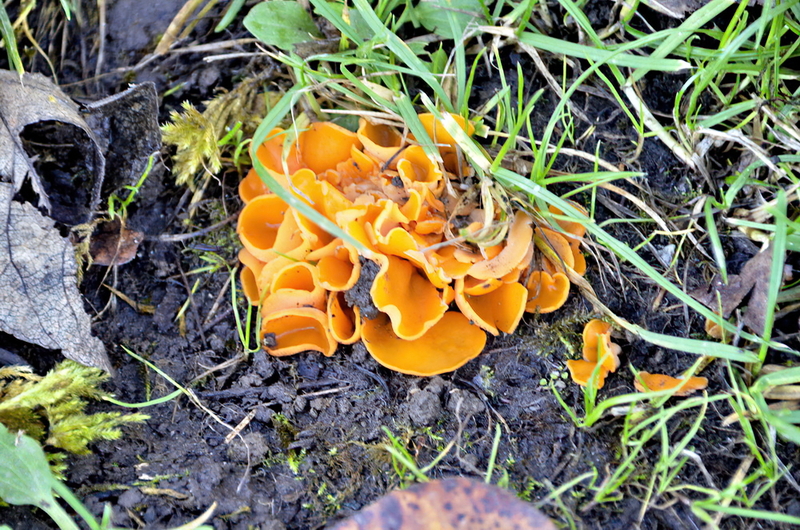 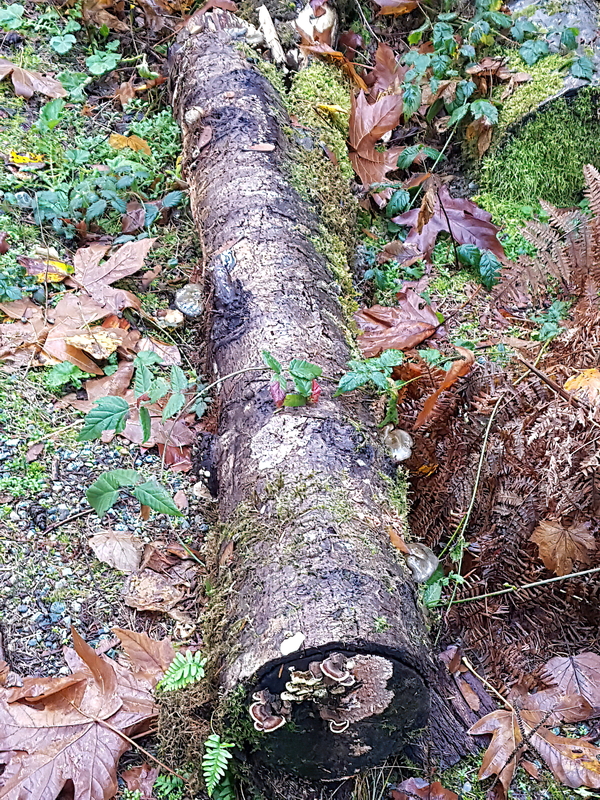 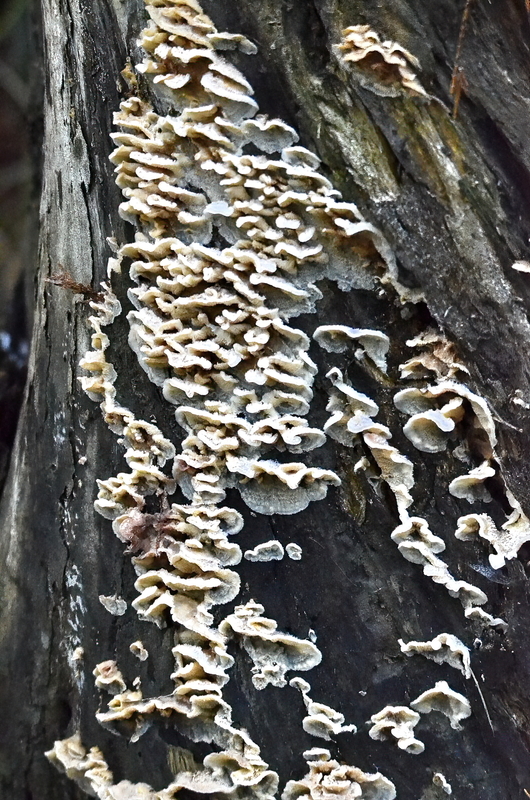 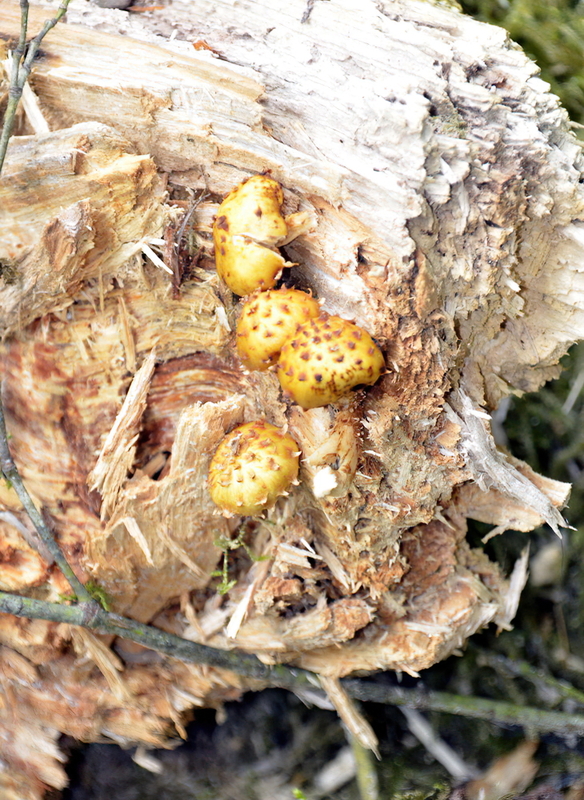 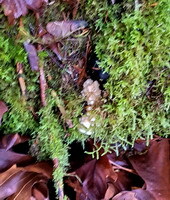 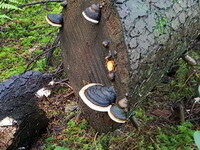 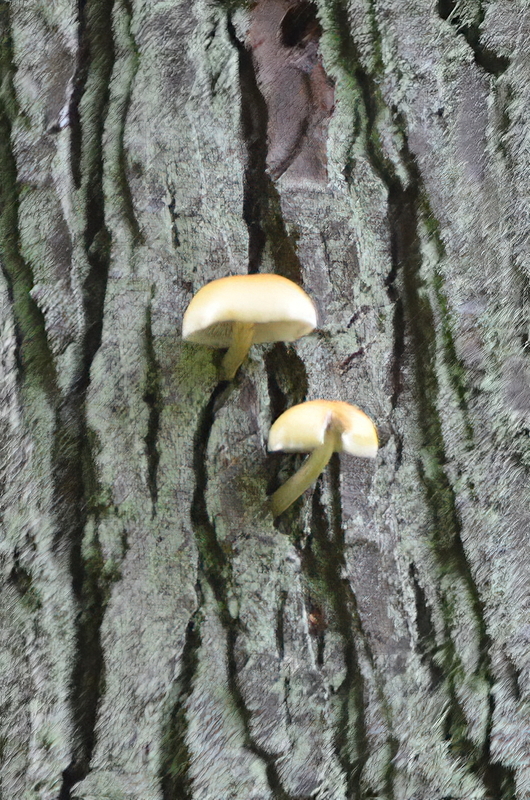 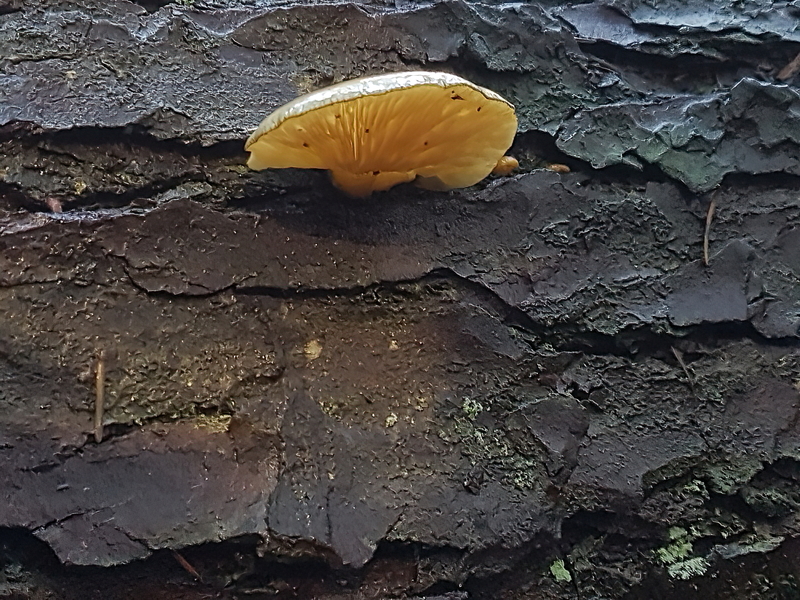 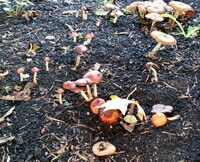 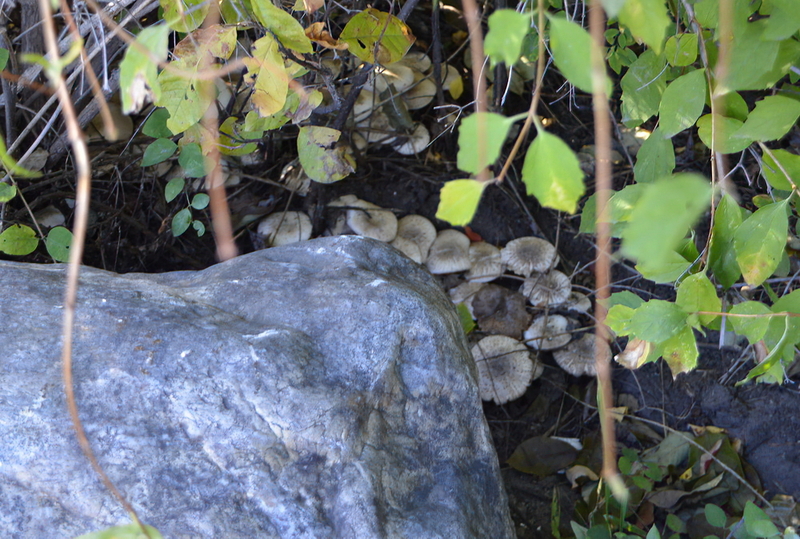 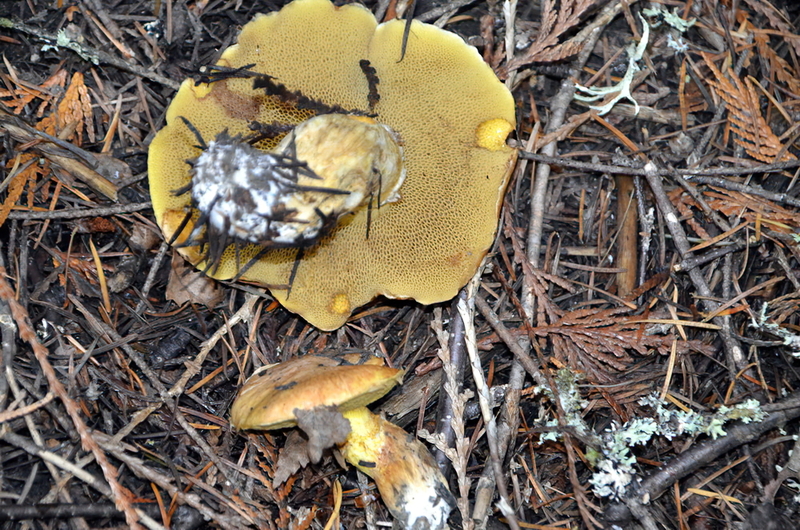 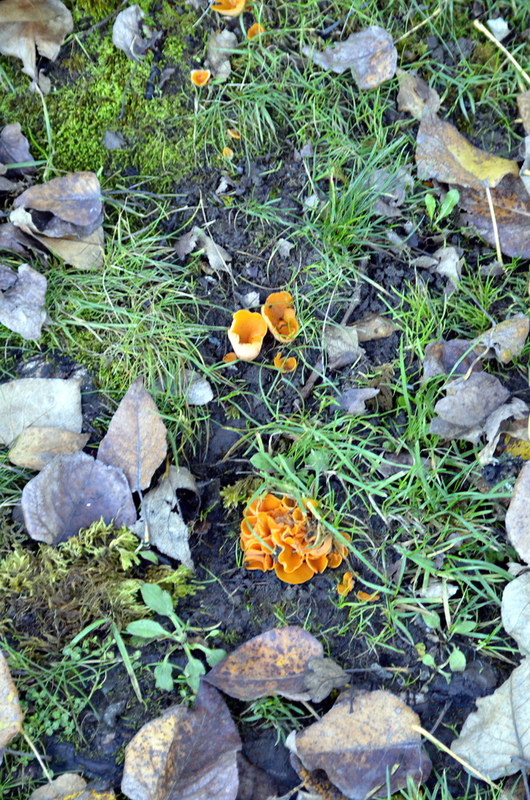 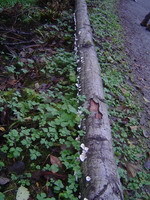 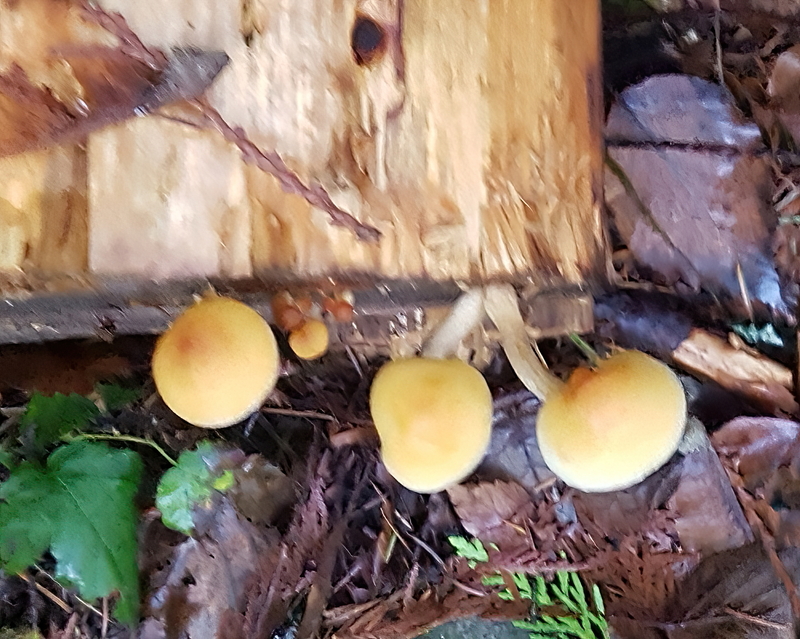 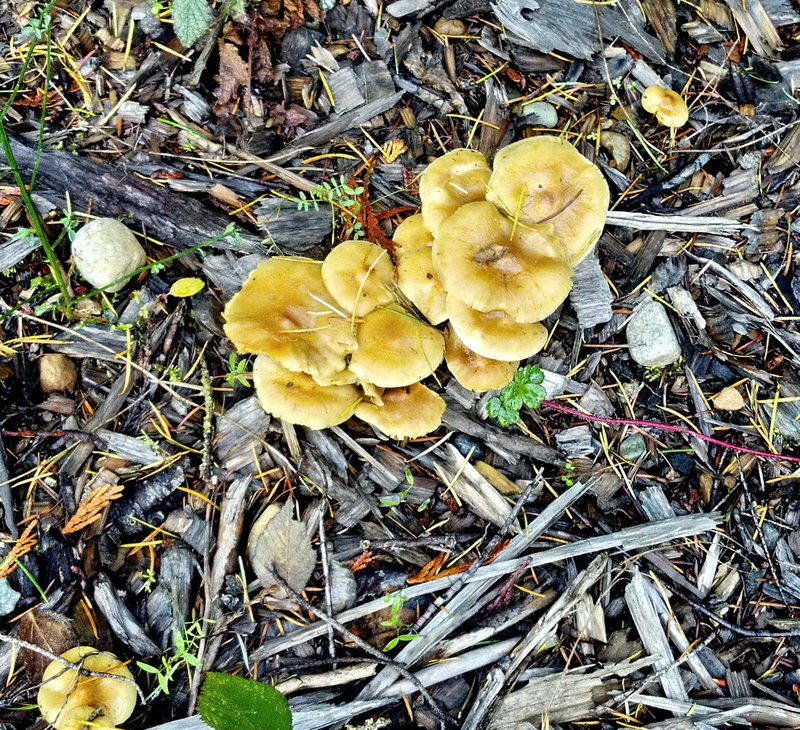 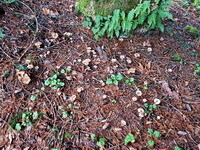 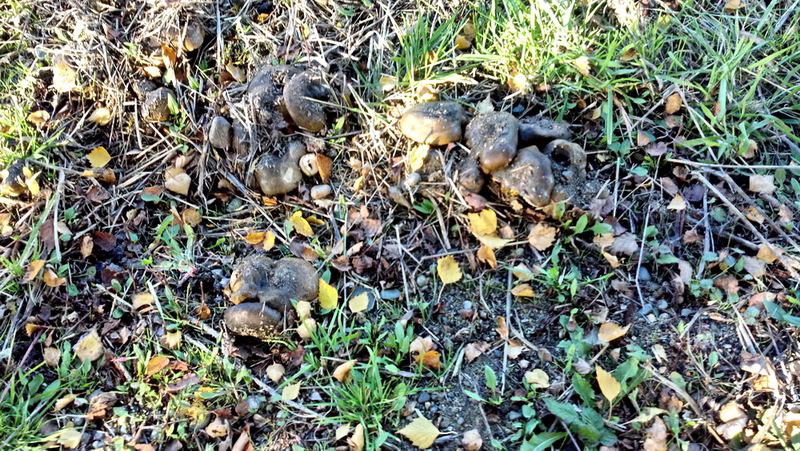 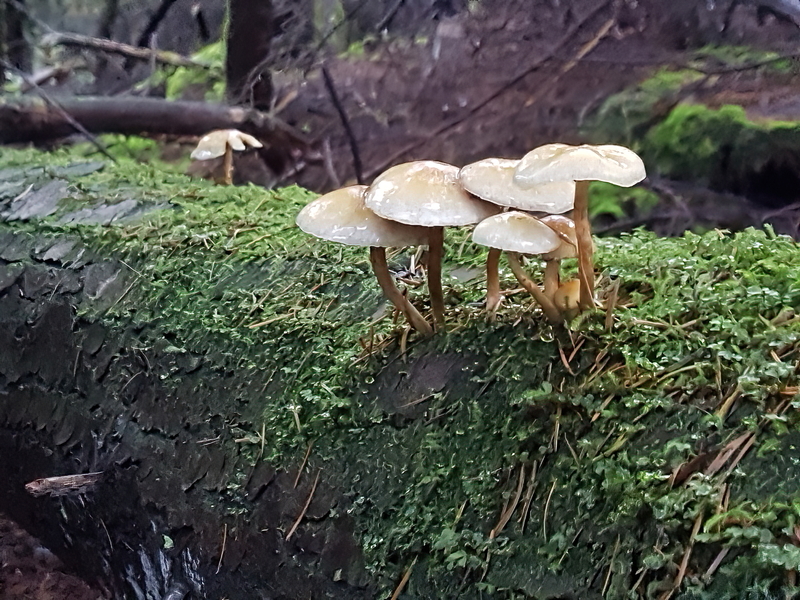 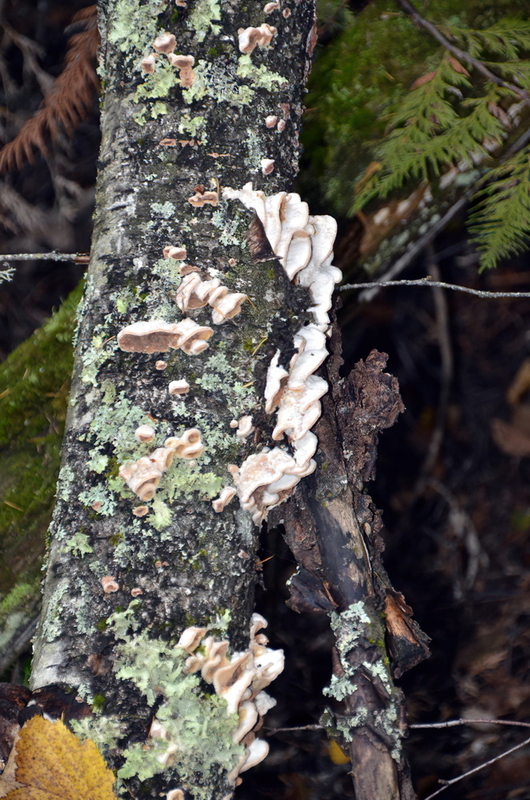 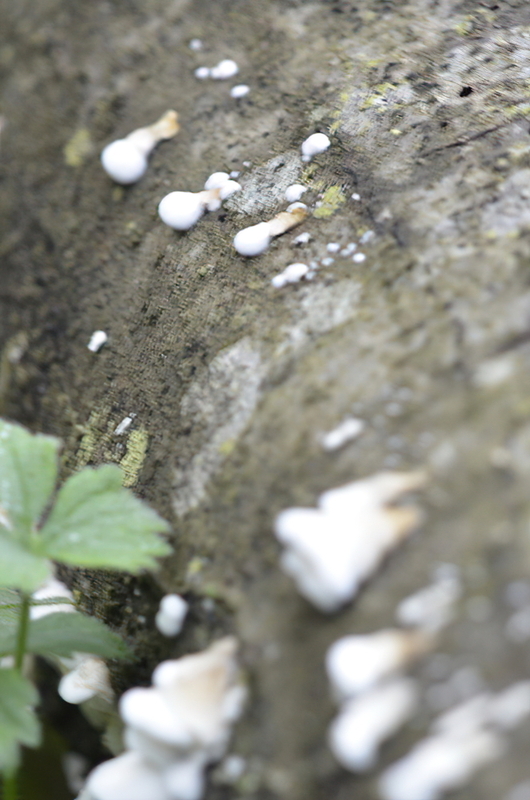 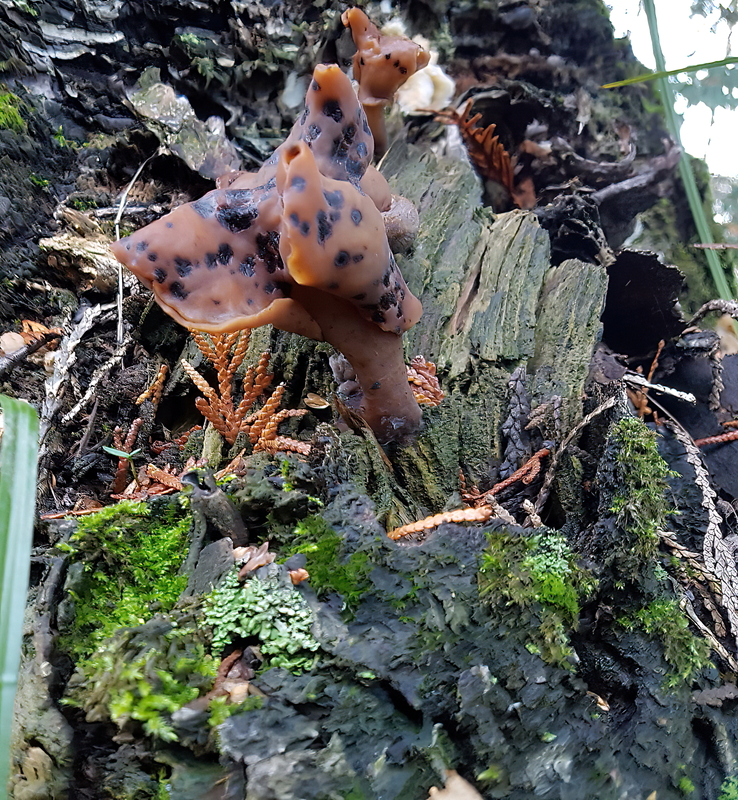 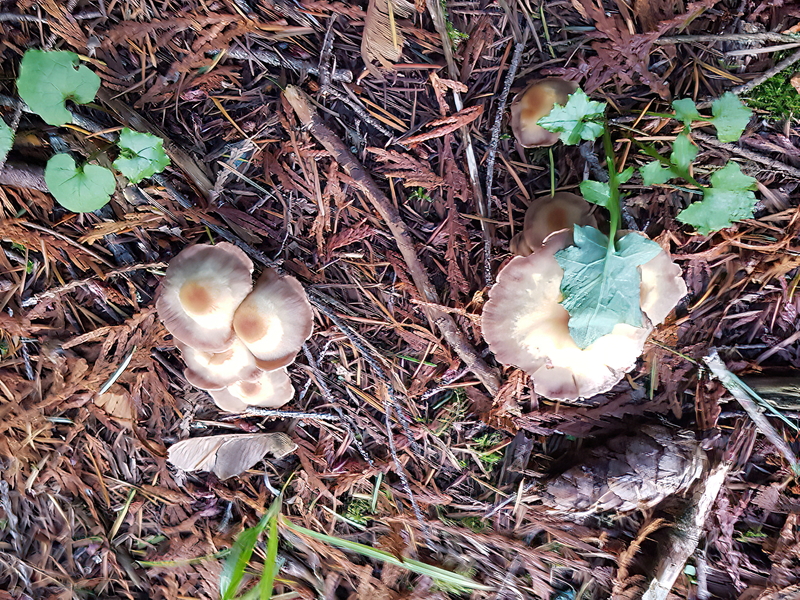 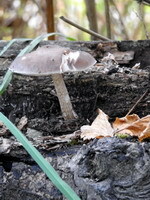 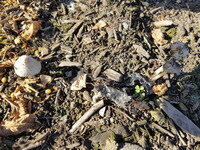 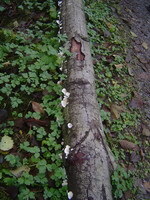 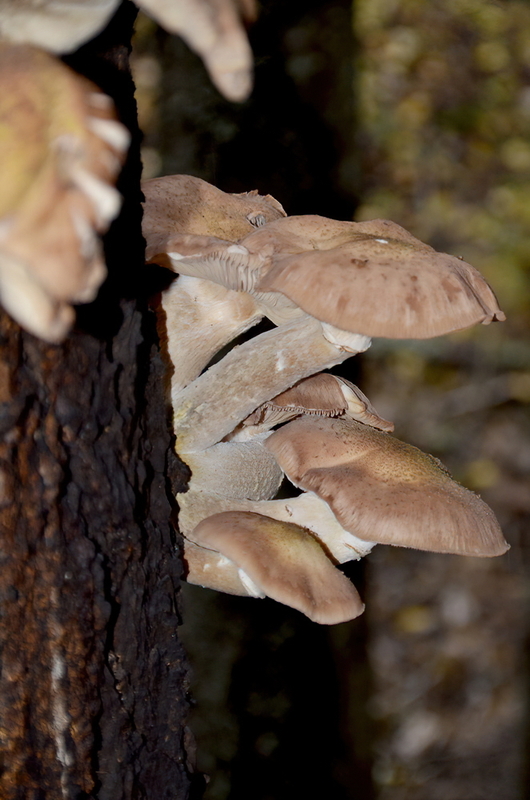 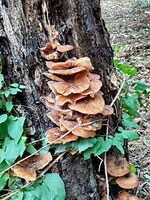 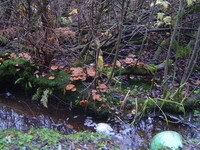 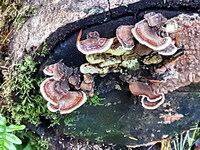 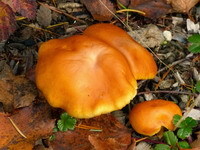 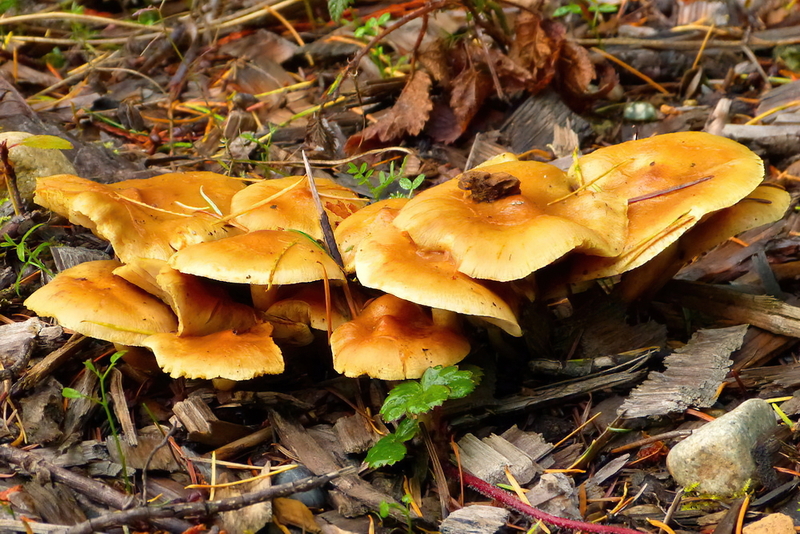 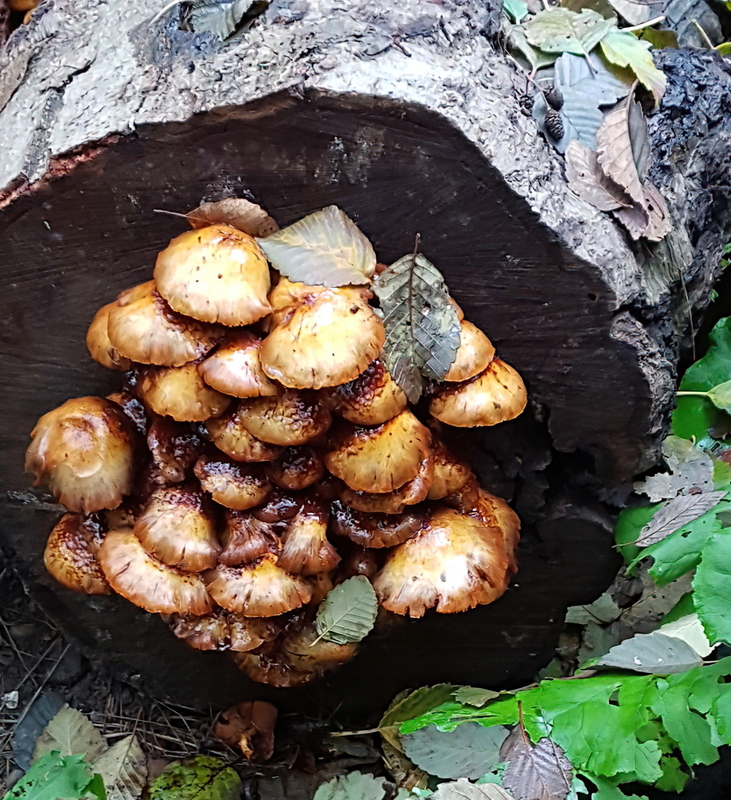 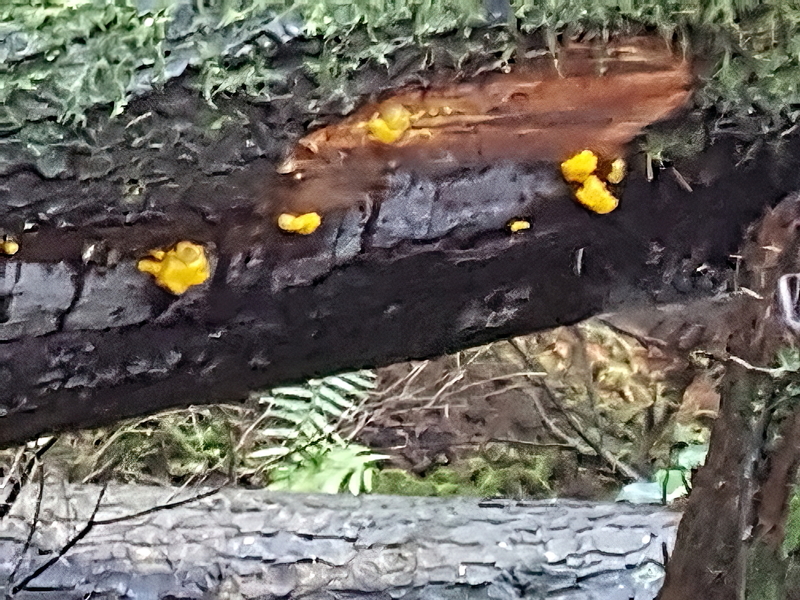 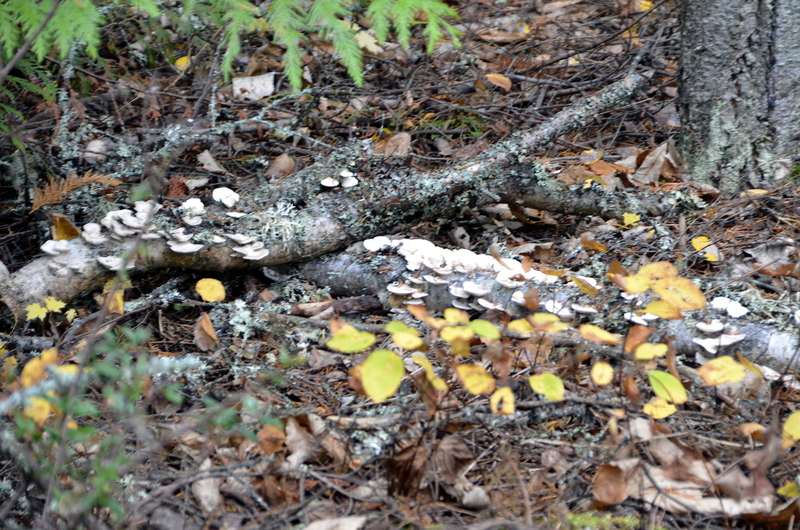 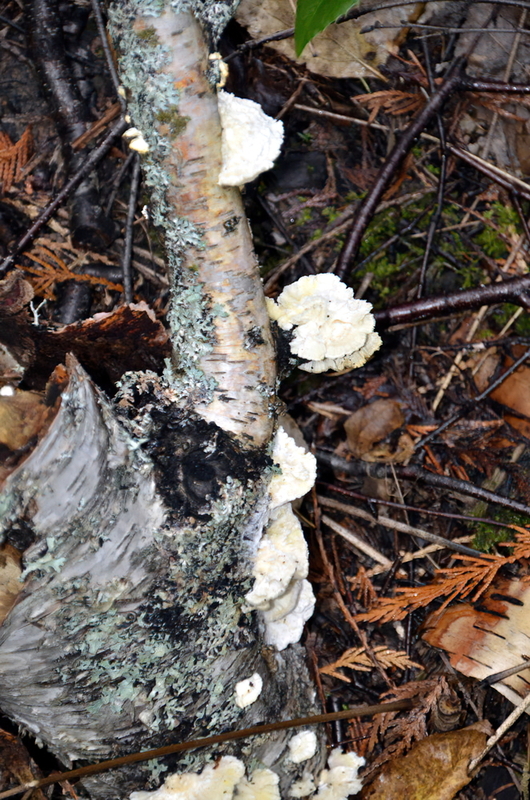 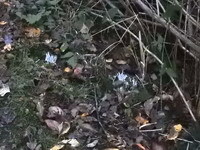 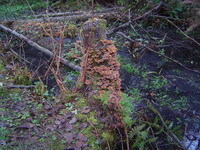 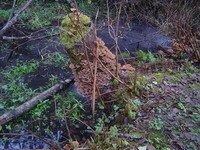 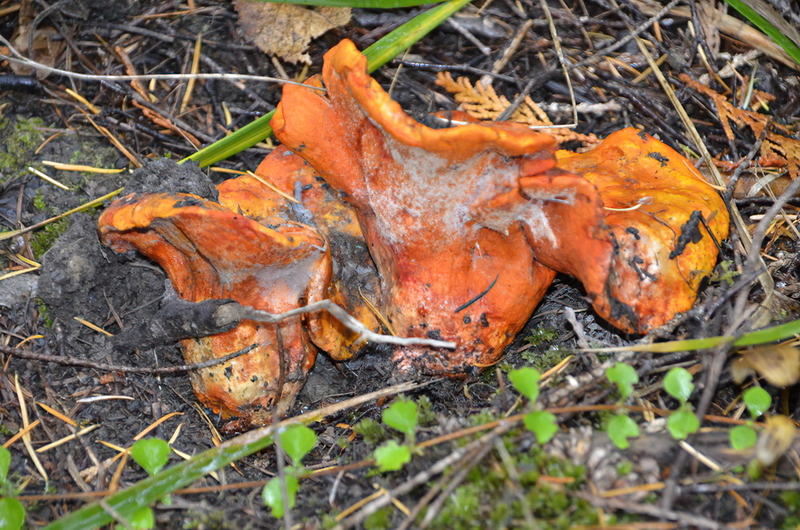 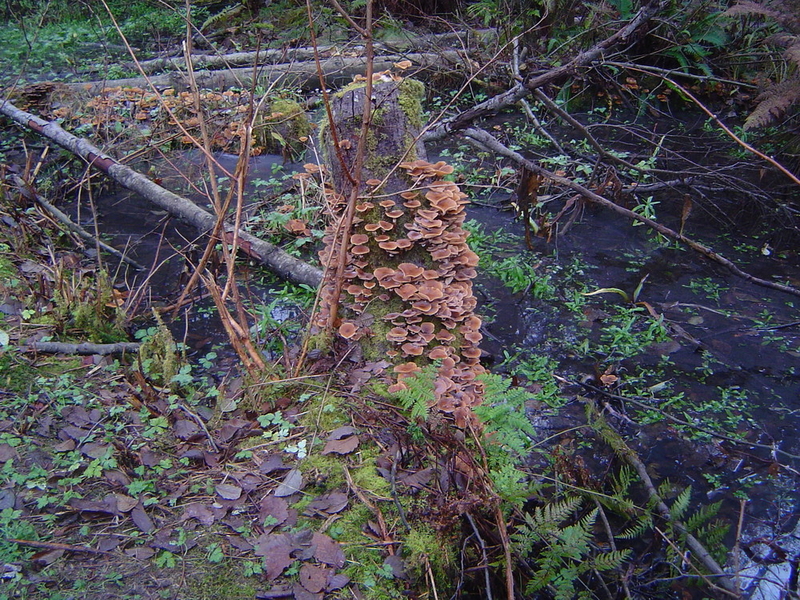 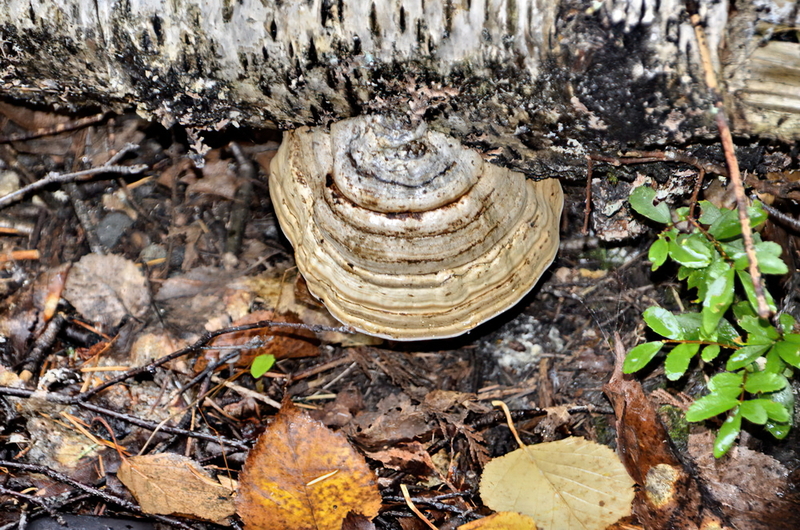 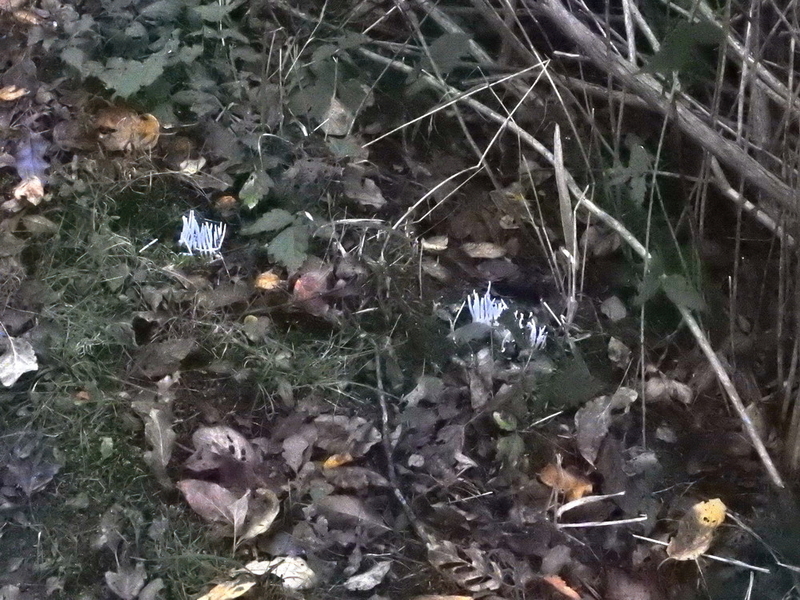 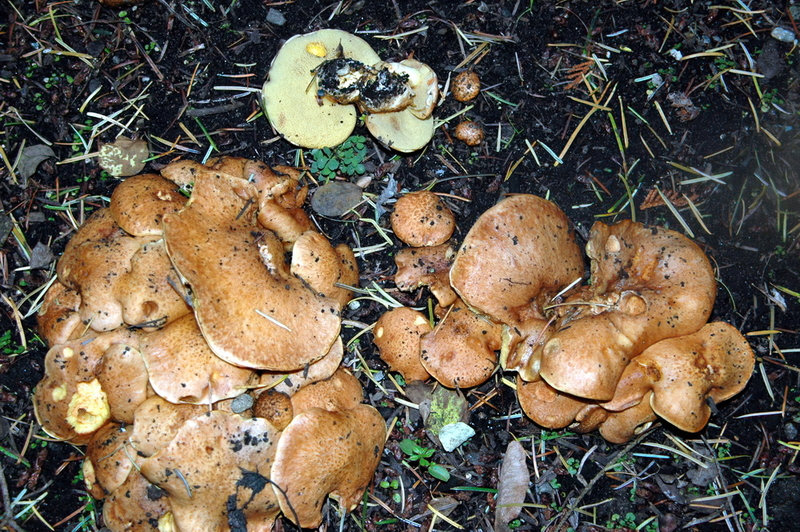 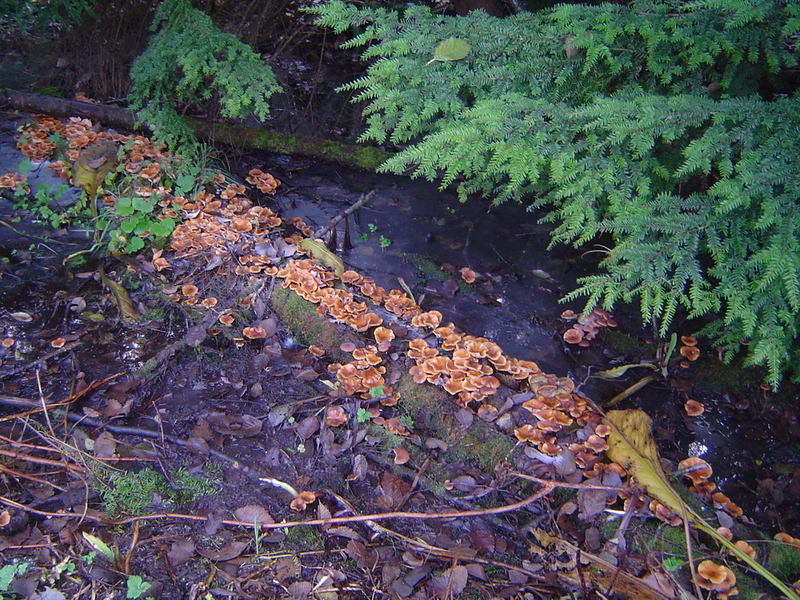 Other Seemed to be in small clusters on the ground under trees, NOT in large clusters on dead wood that one expects for Honeys, so they're probably connected underground. 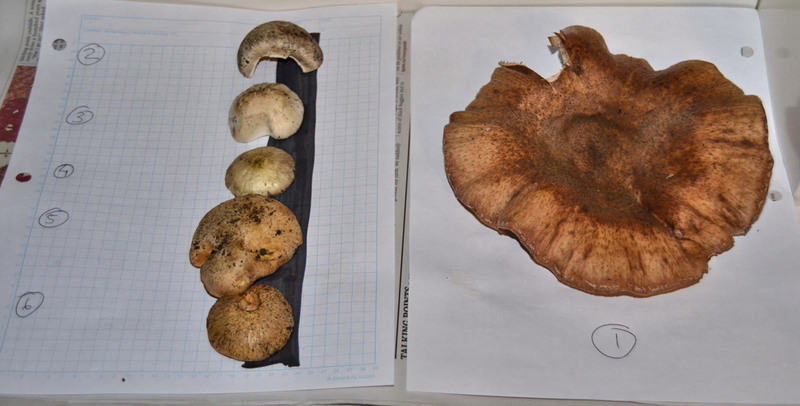 Other Not sure these 2 specimens are the same - specimen #2 might just be younger or it might be the Jumbo Gym. 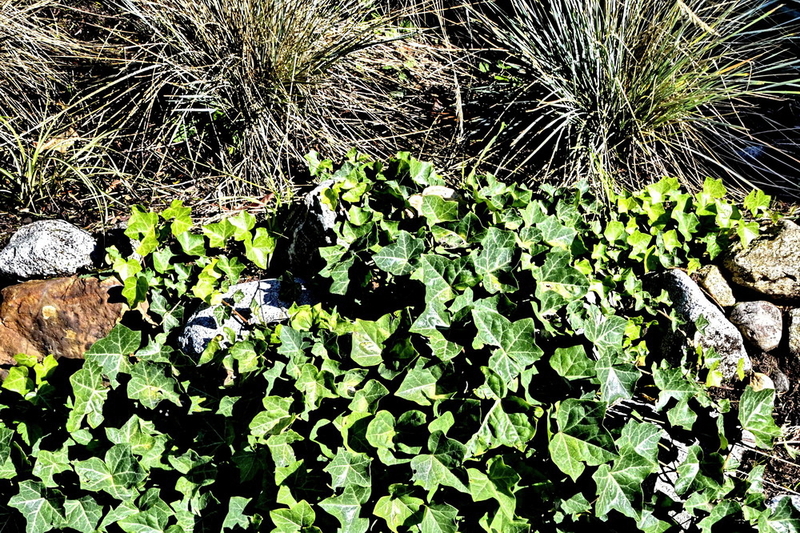 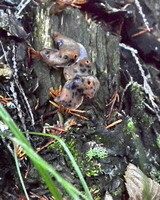 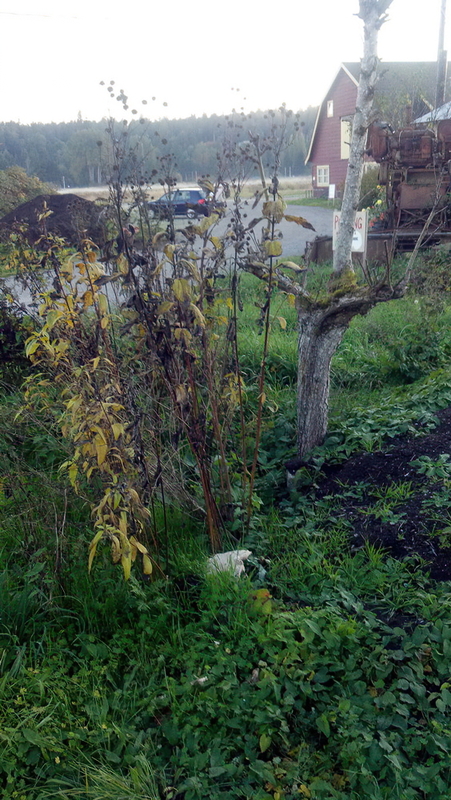 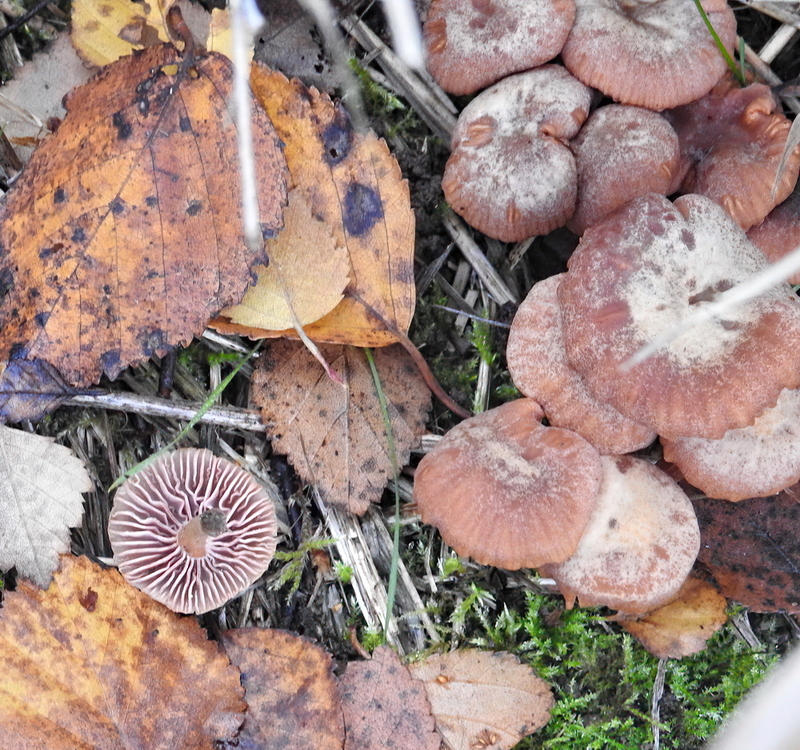 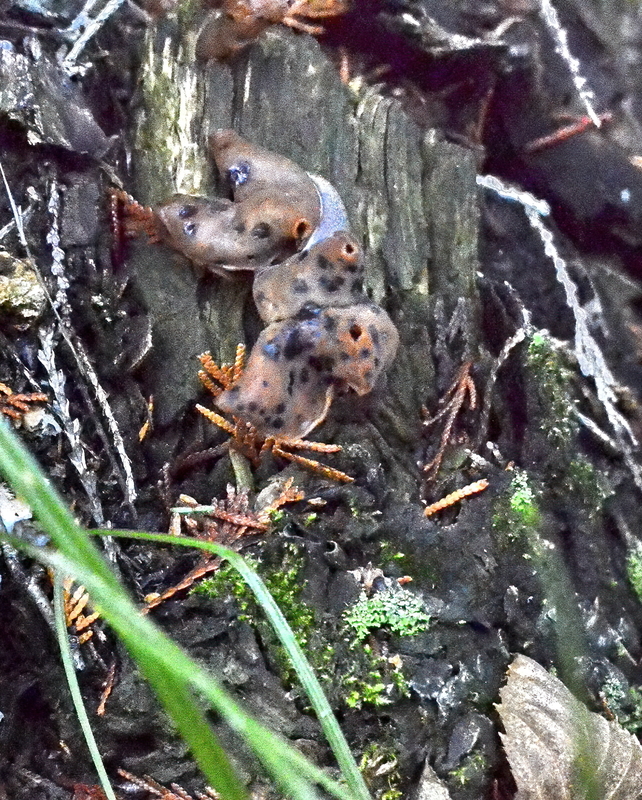 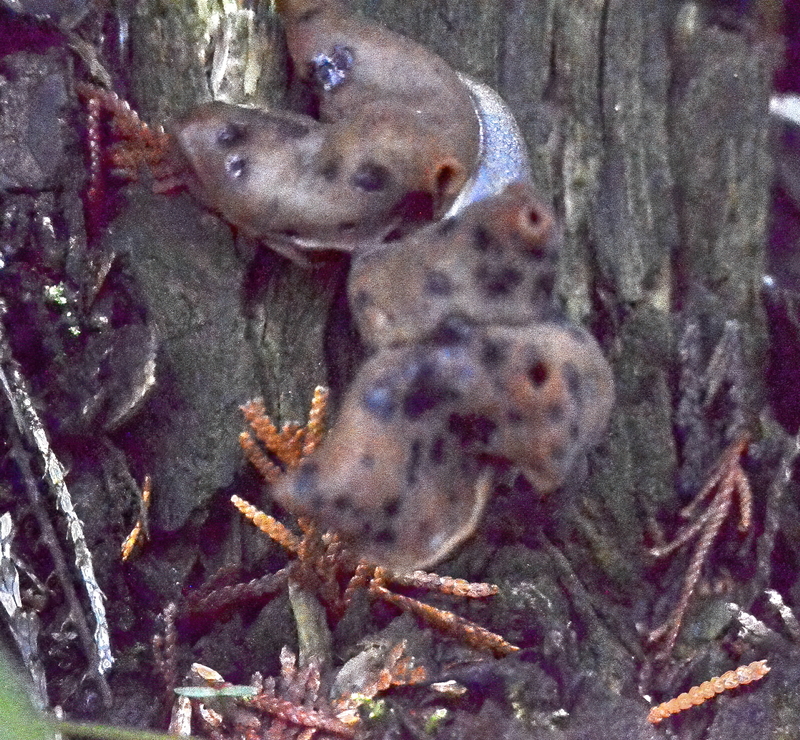 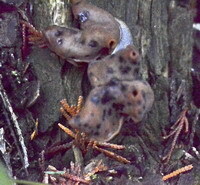 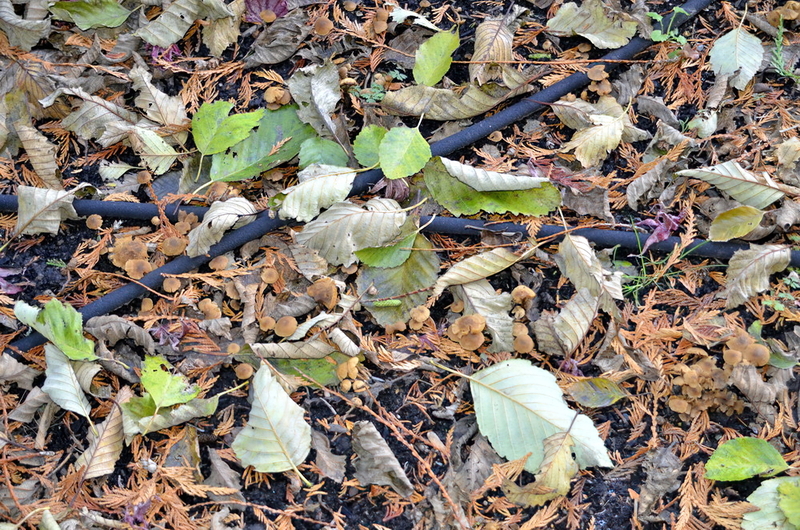 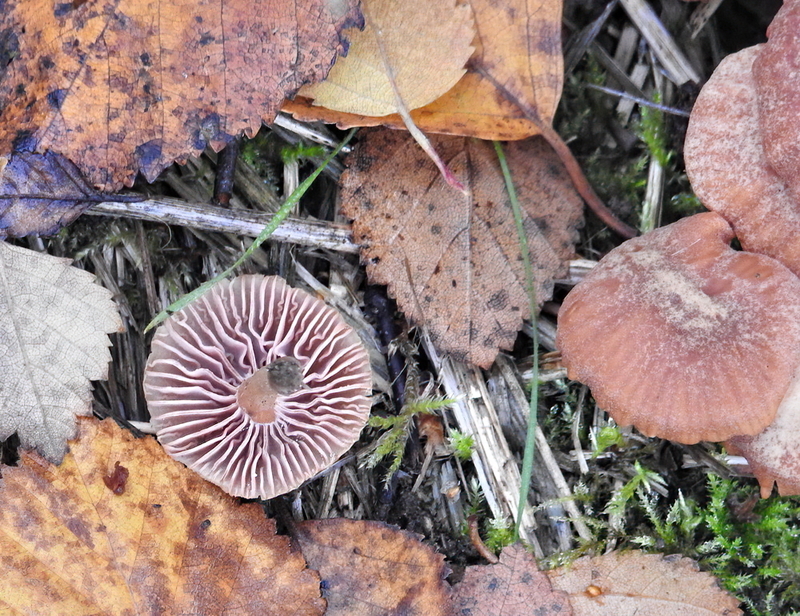 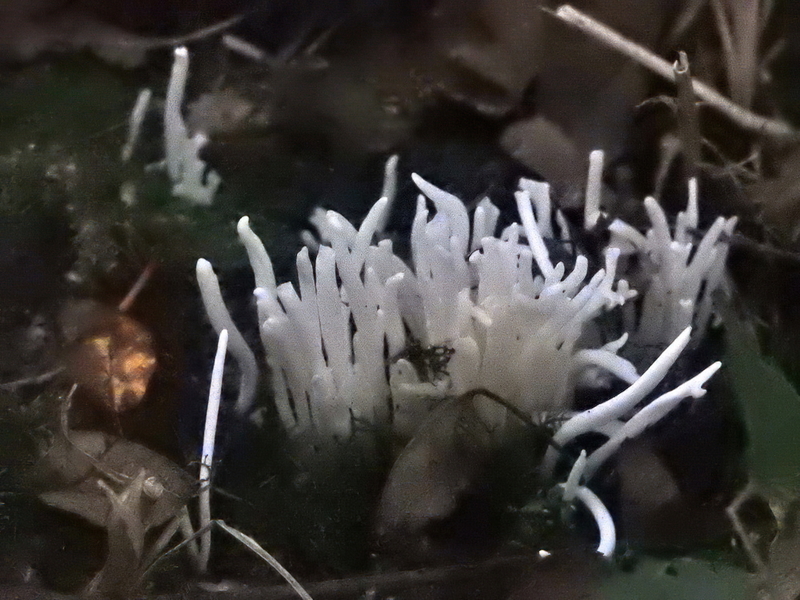 Always saw several speciemns together in a tight clump. 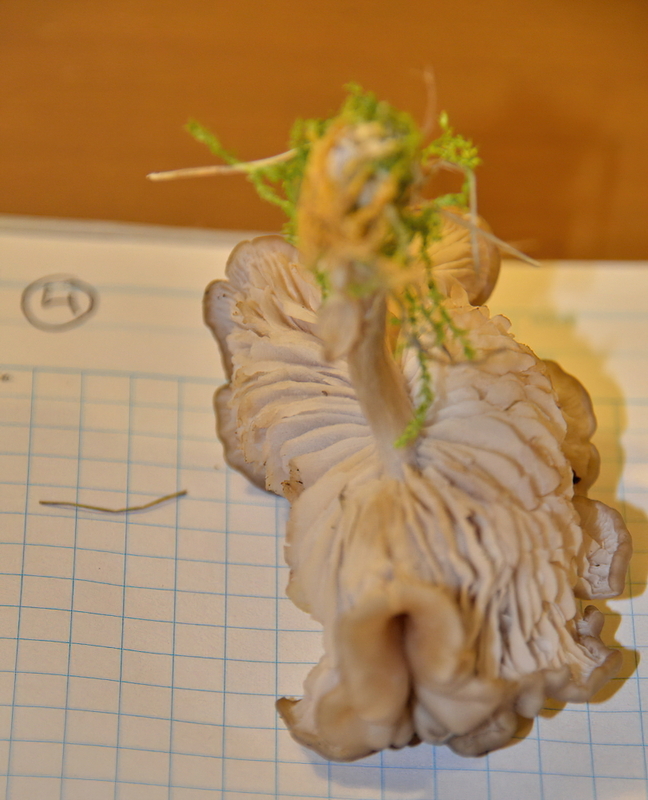 Did not test the smell or milkiness or brittleness or looked closely at the stem and gills which would have been valuable indications! 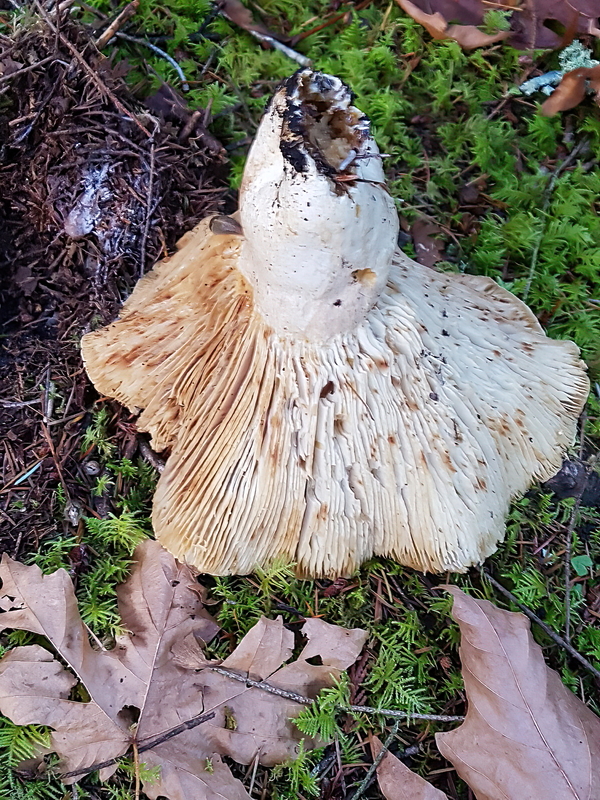 Can I eat it? 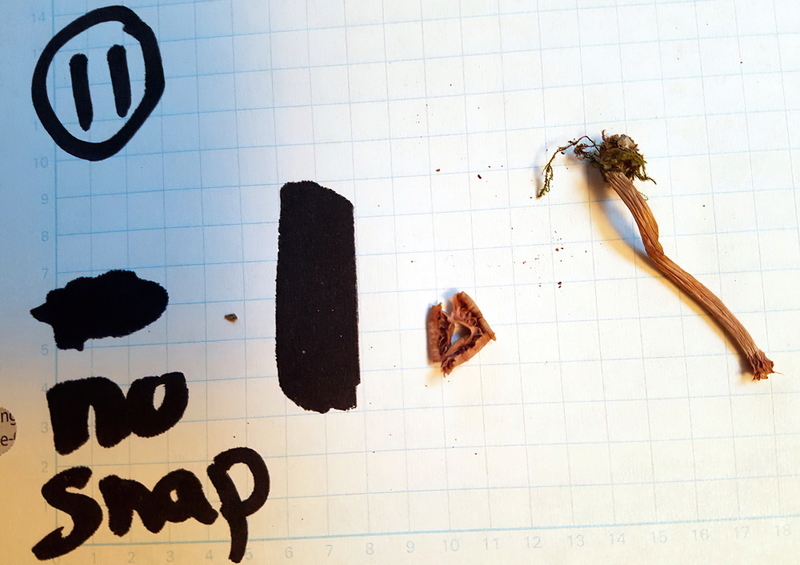 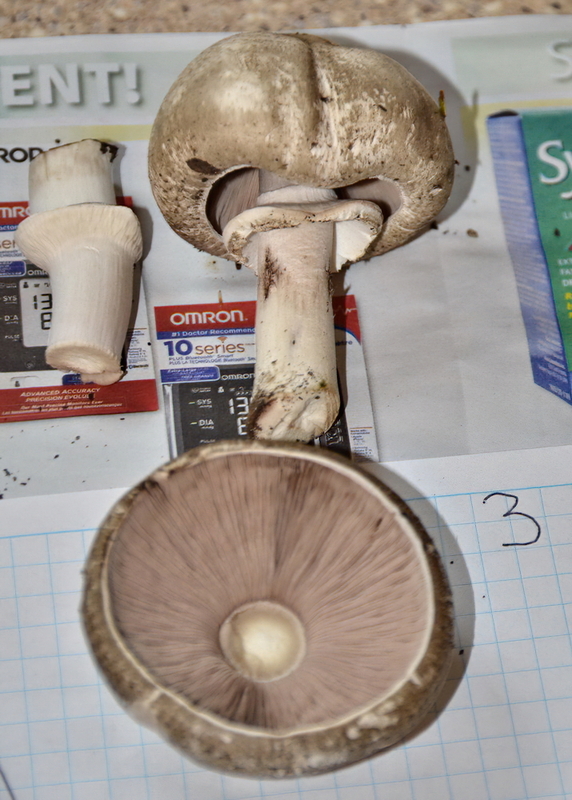 Candy Cap is delicious, sweet; Jumbo Gym is bitter and may be hallucinogenic. 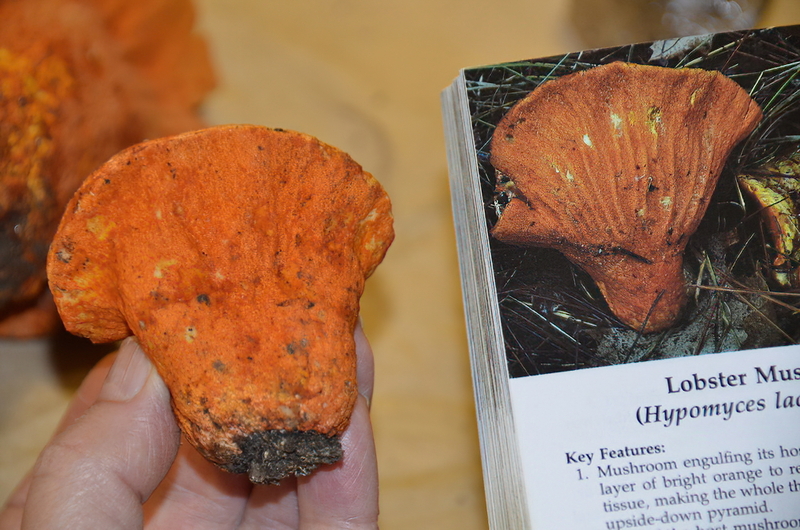 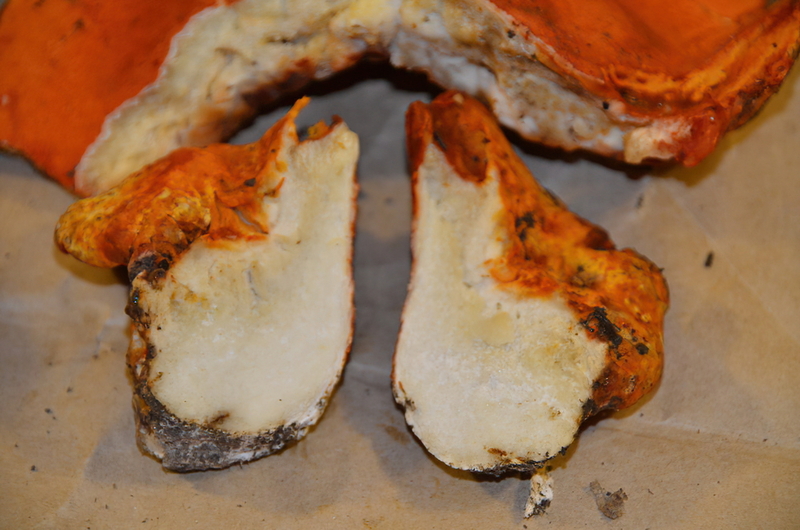 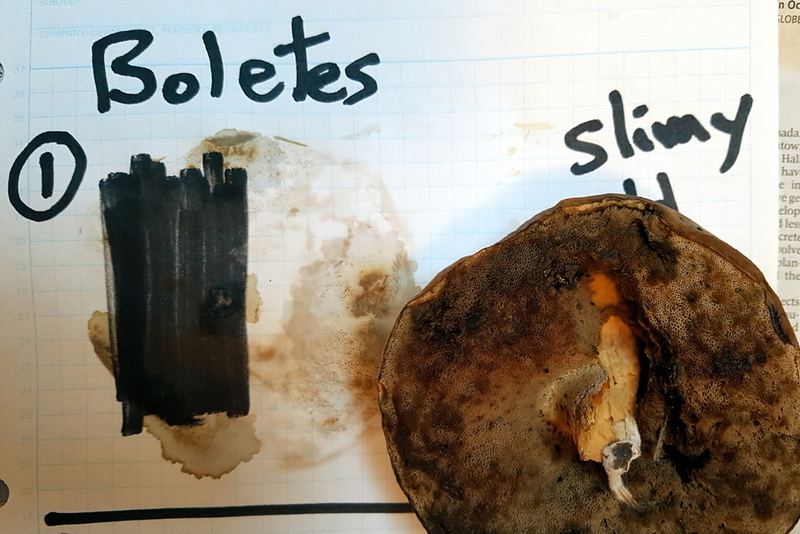 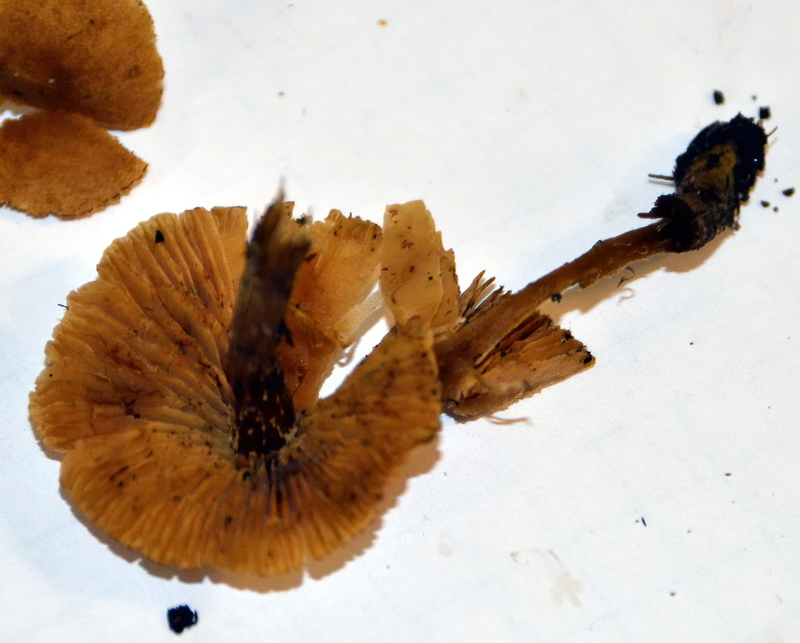 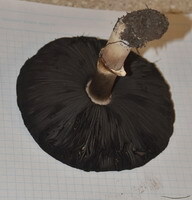 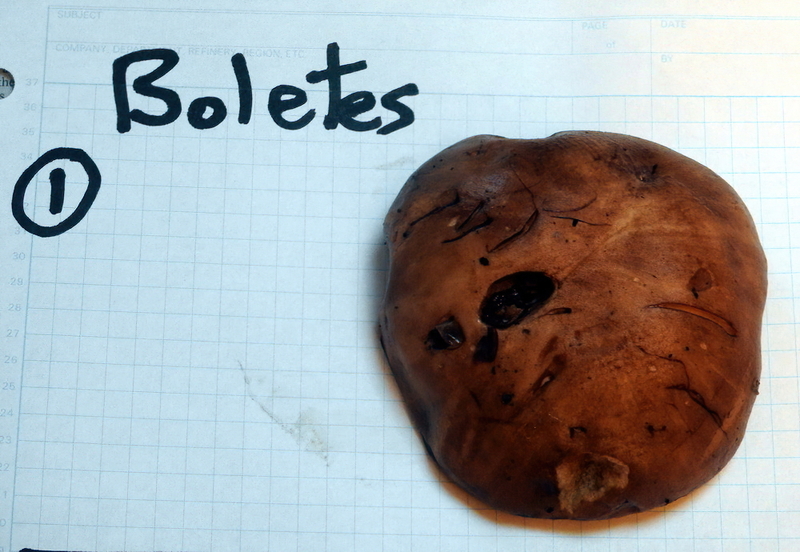 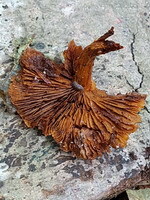 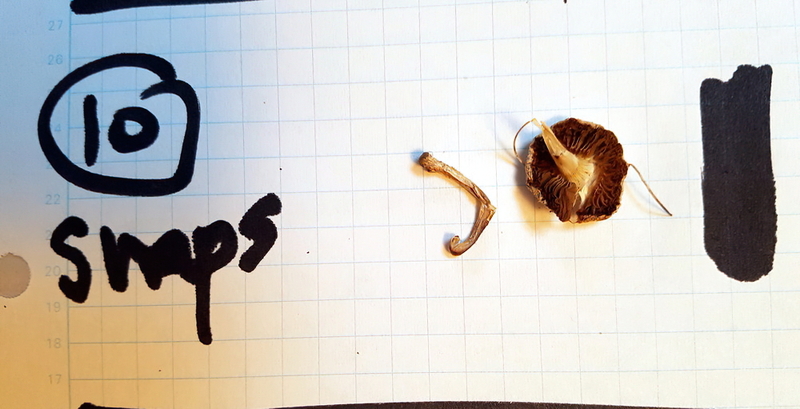 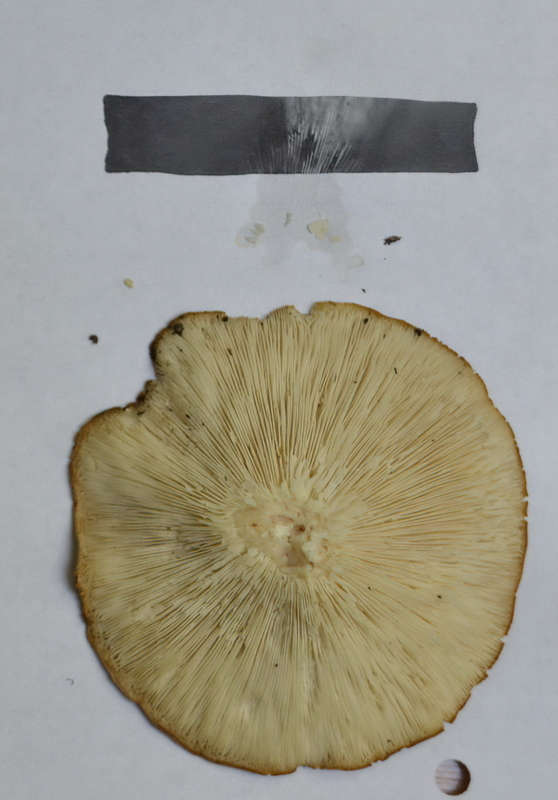 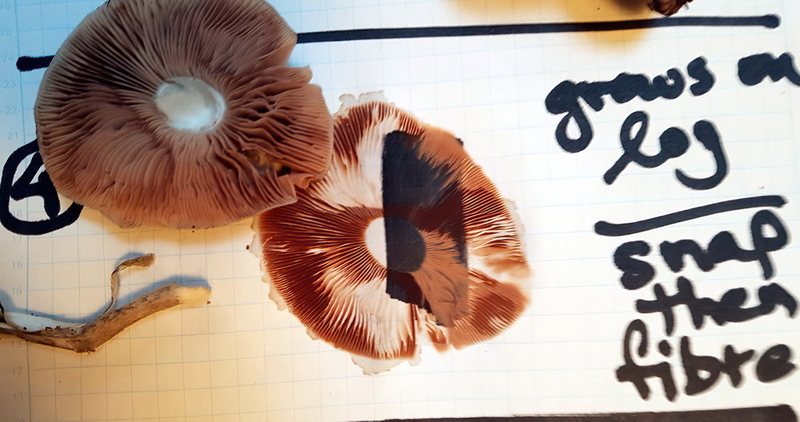 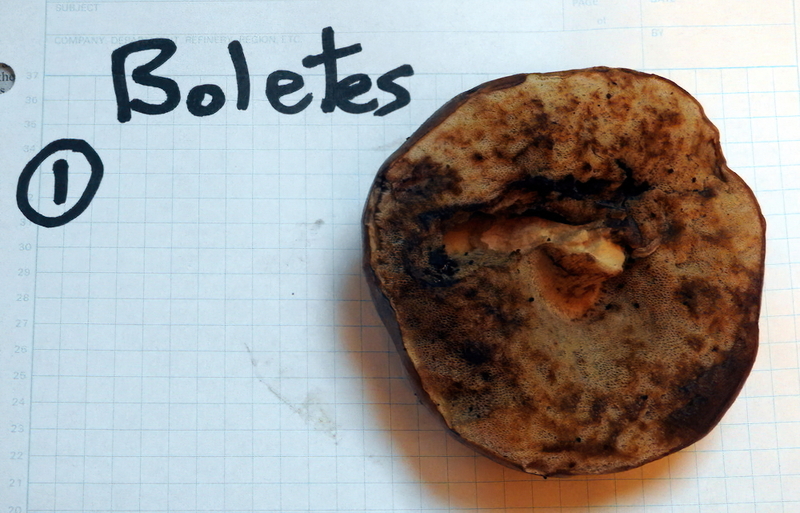 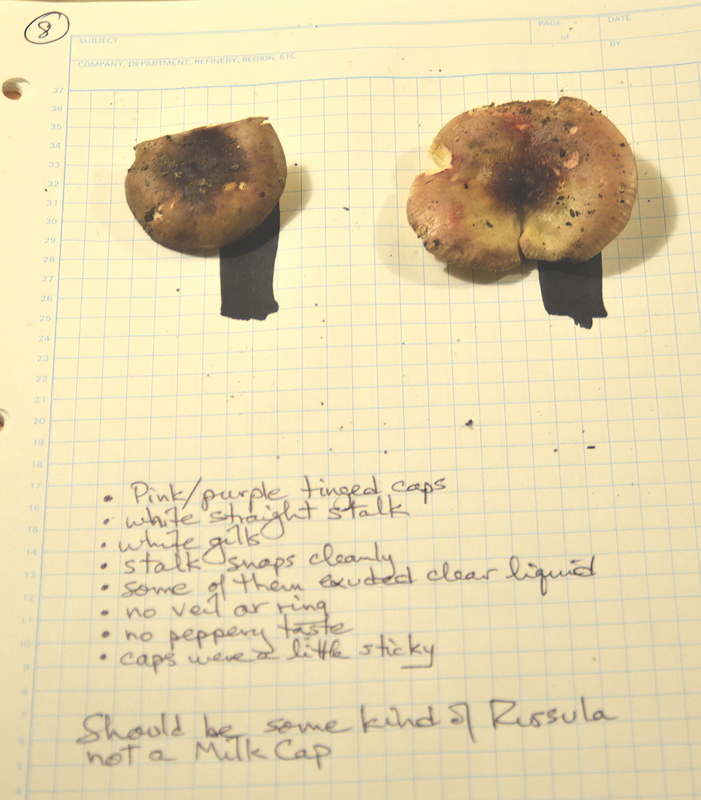 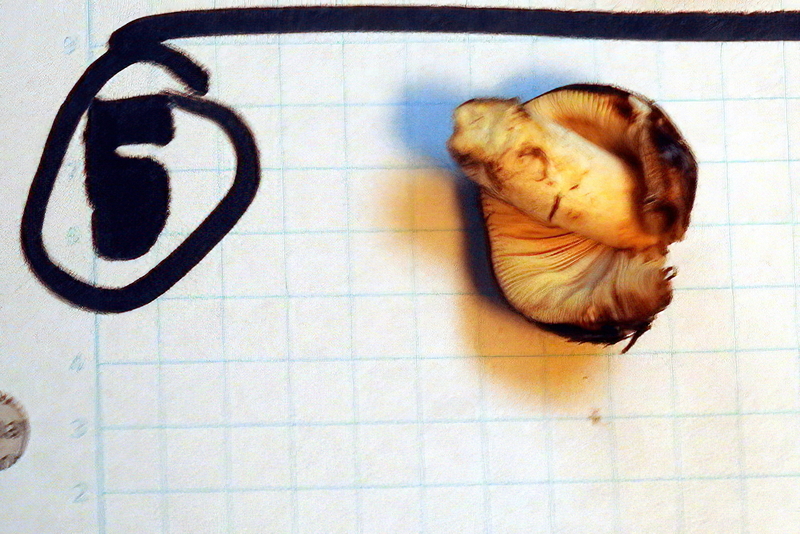 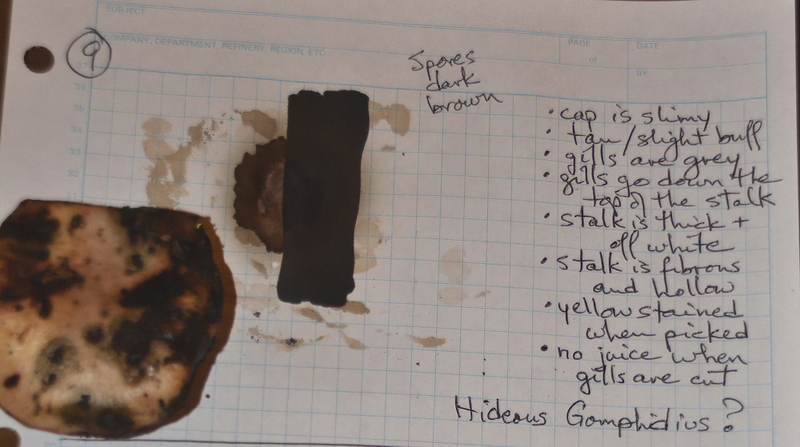 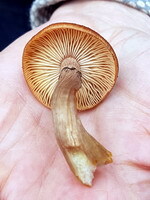 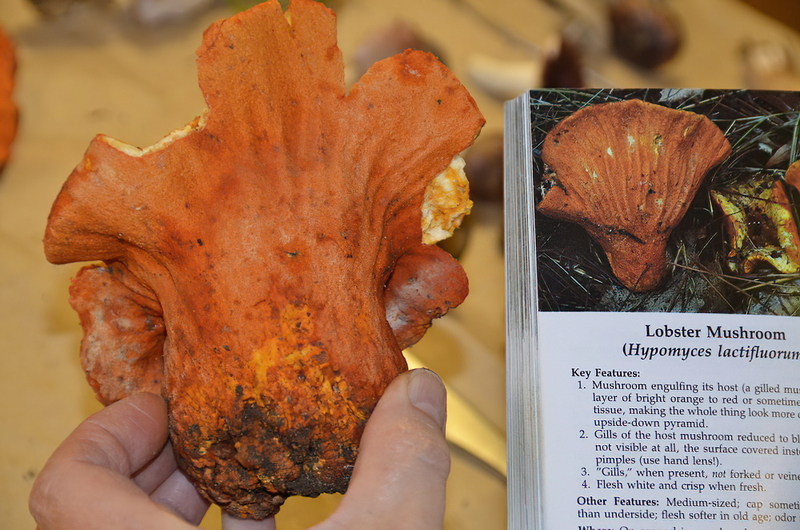 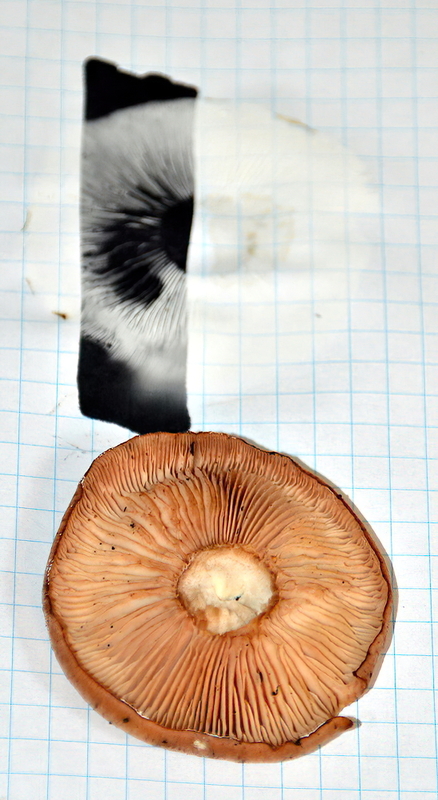 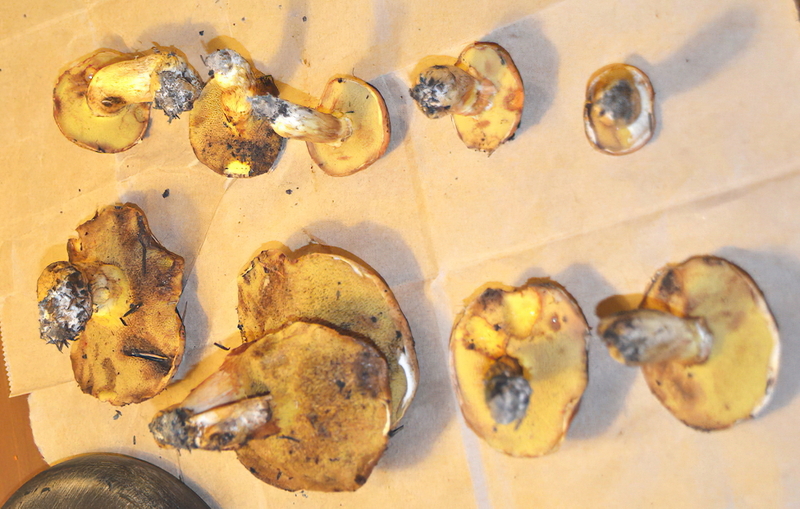 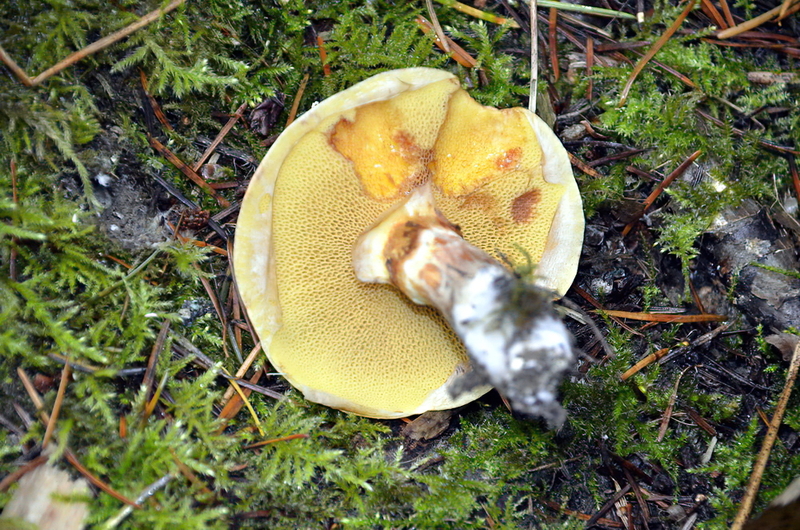 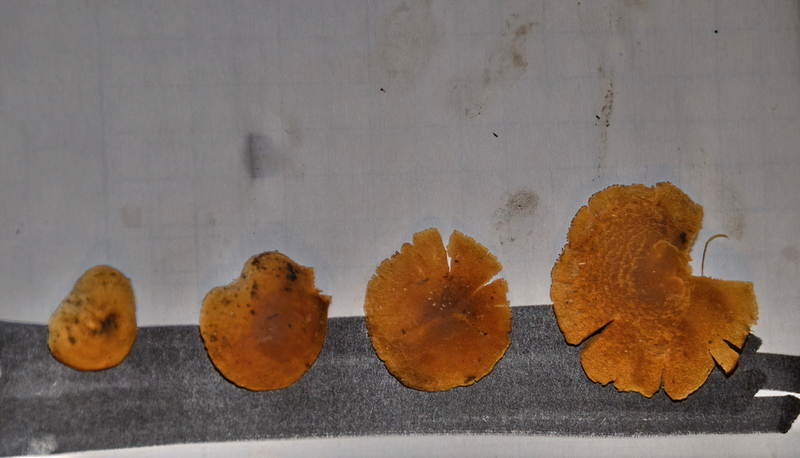 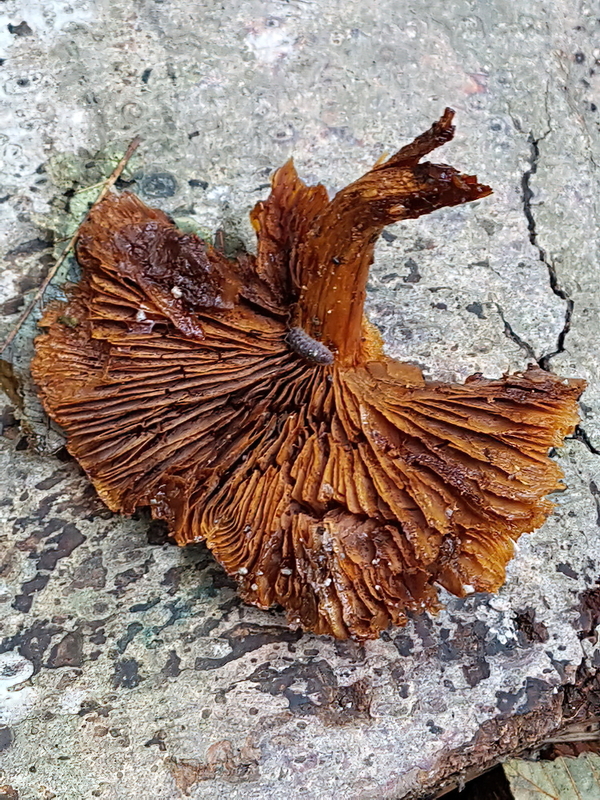 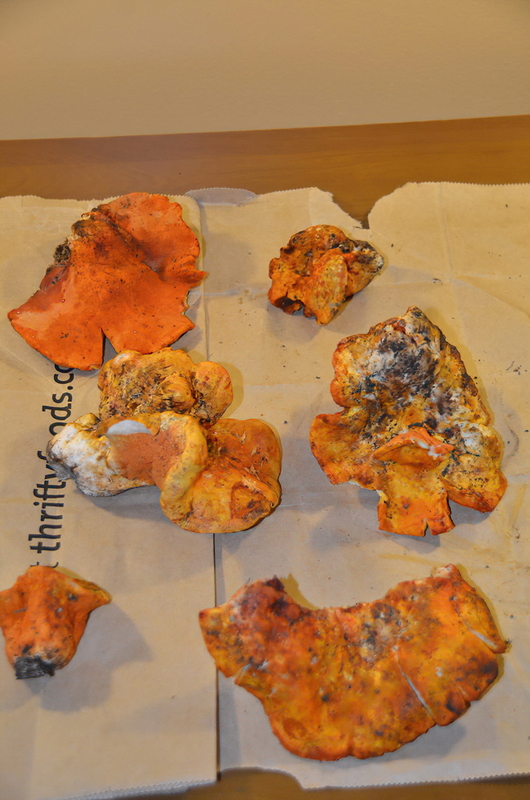 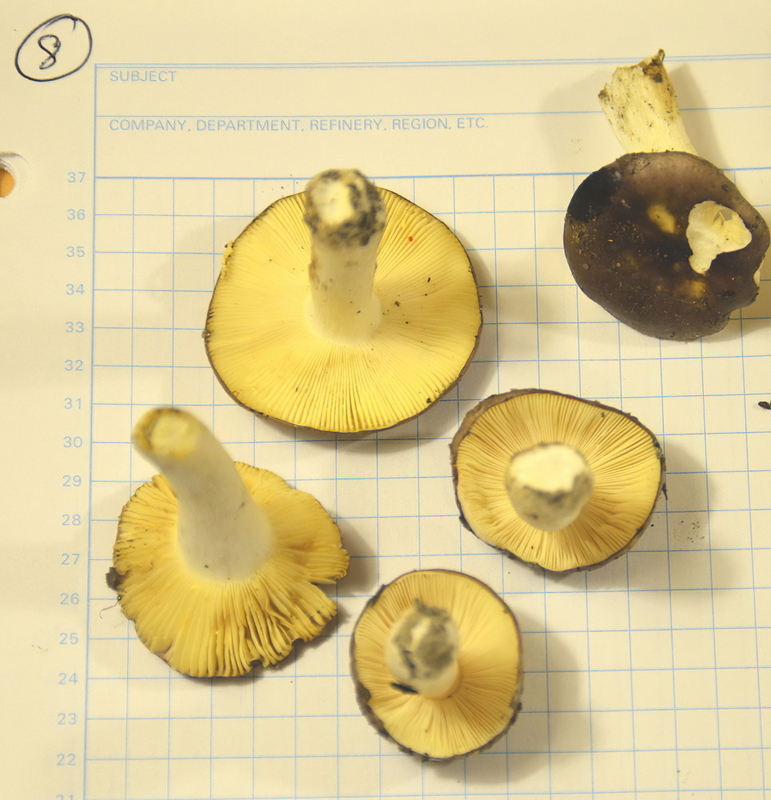 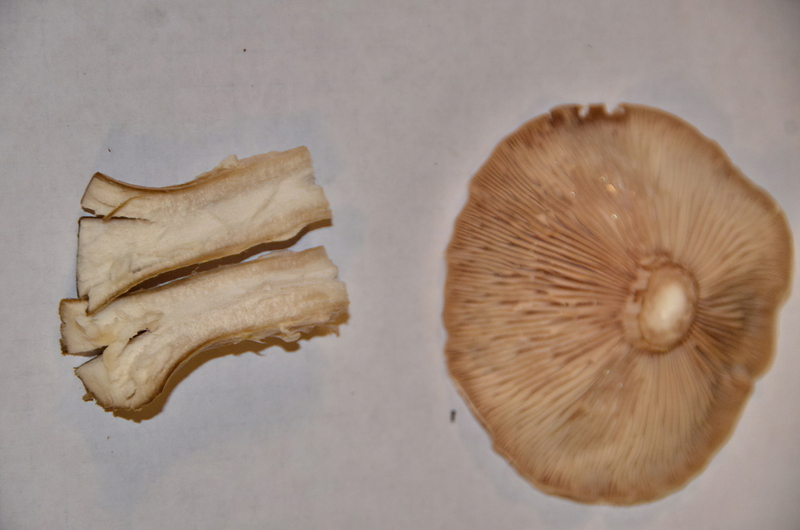 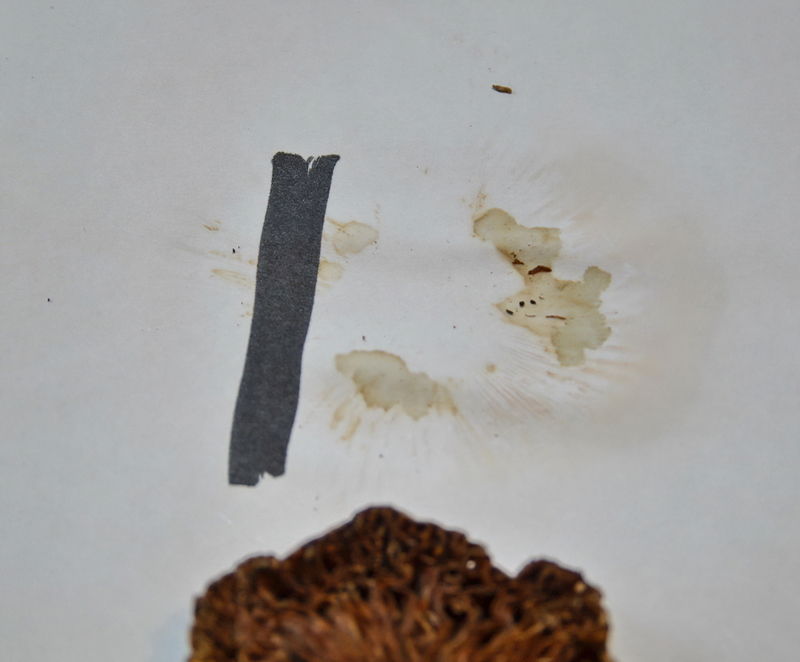 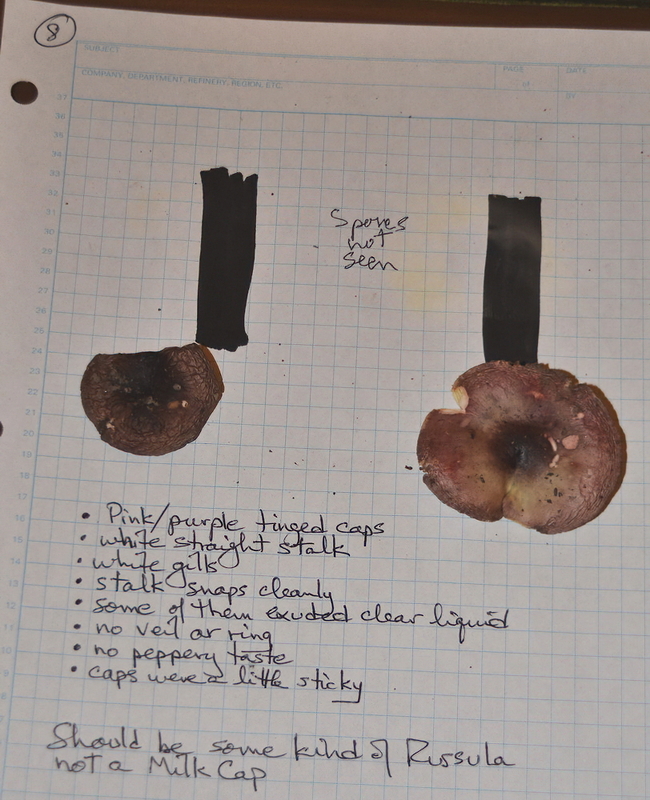 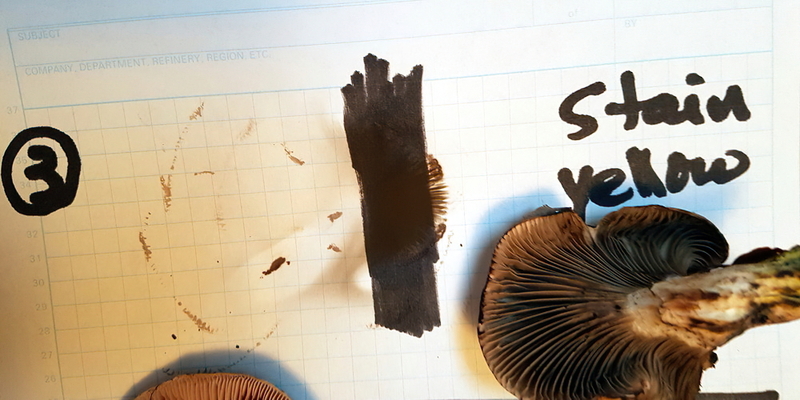 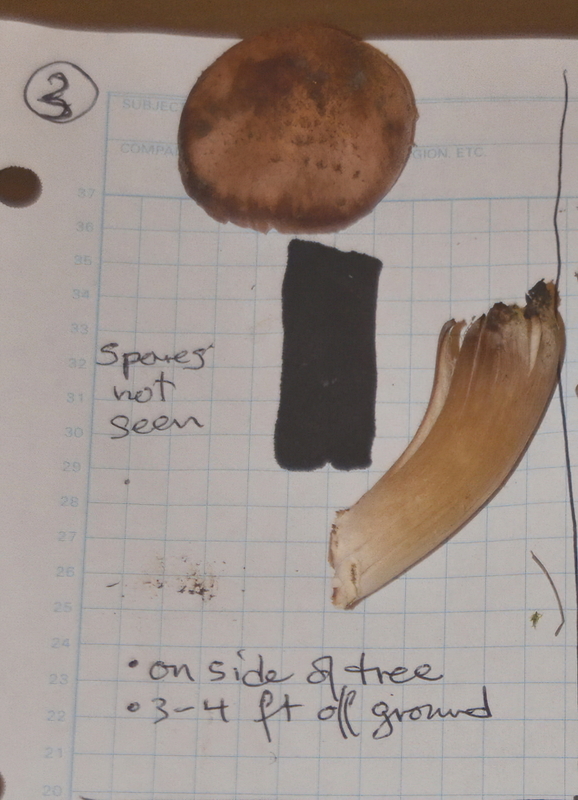 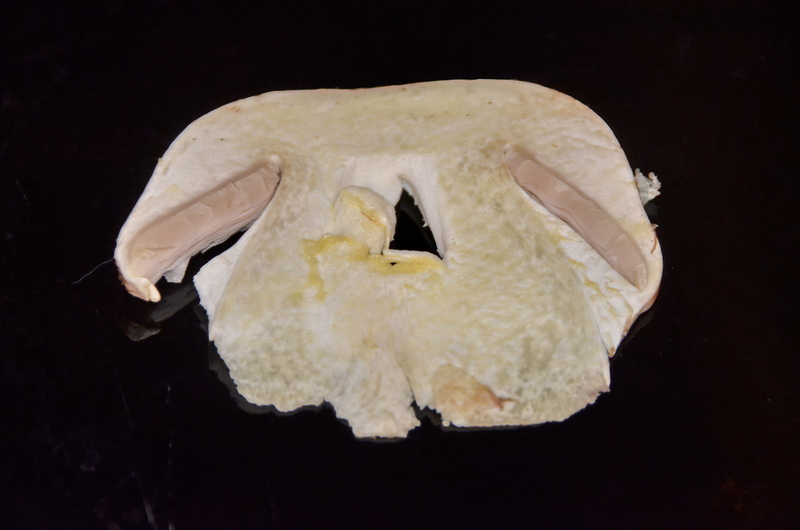 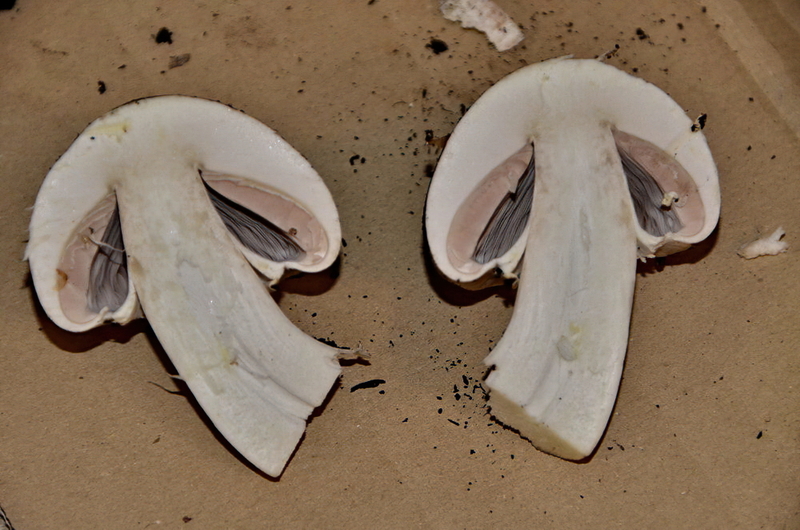 Other No staining when cut or rubbed, no smell, crisp flesh (snaps when broken apart) (see cap #2 in group picture to the right) This specimen is too young to see spores or full gill and ring development. 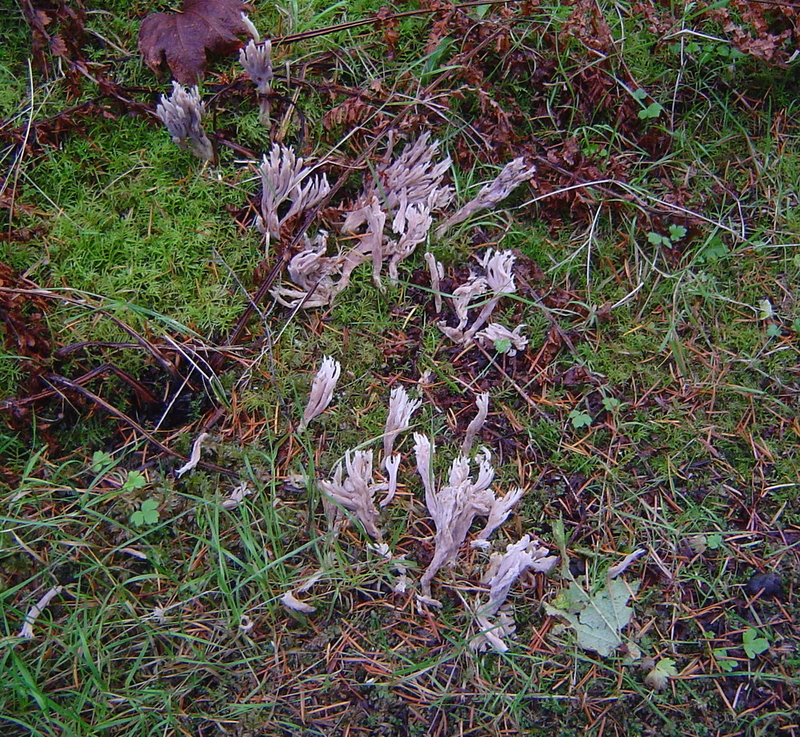 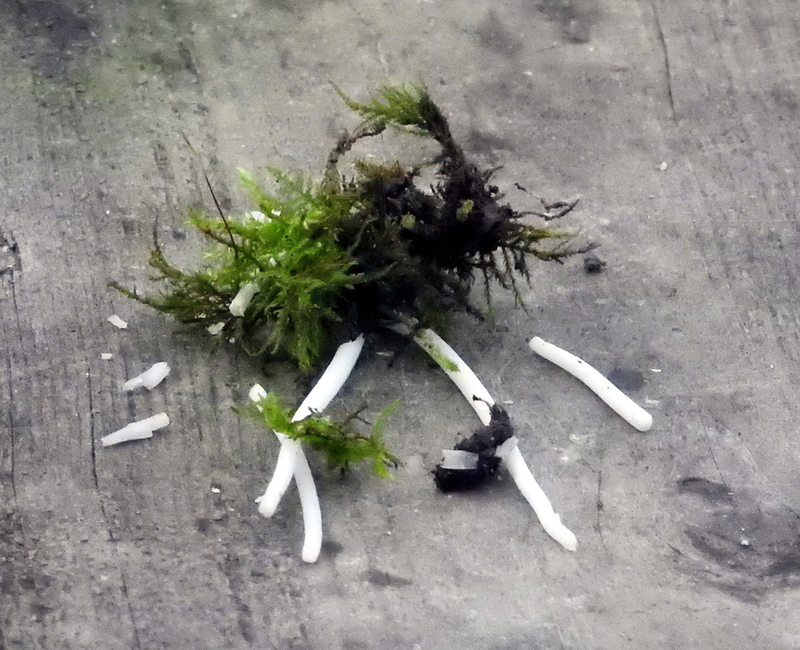 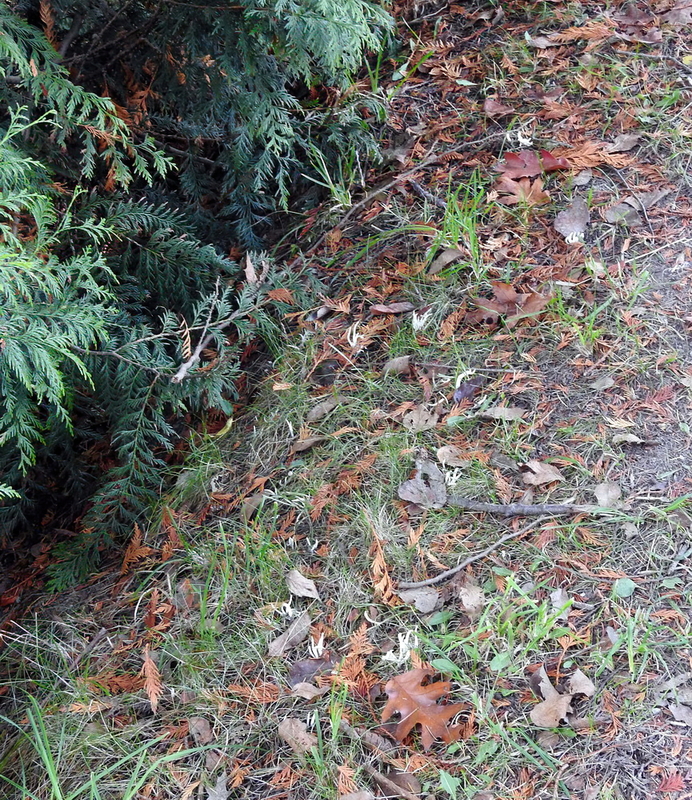 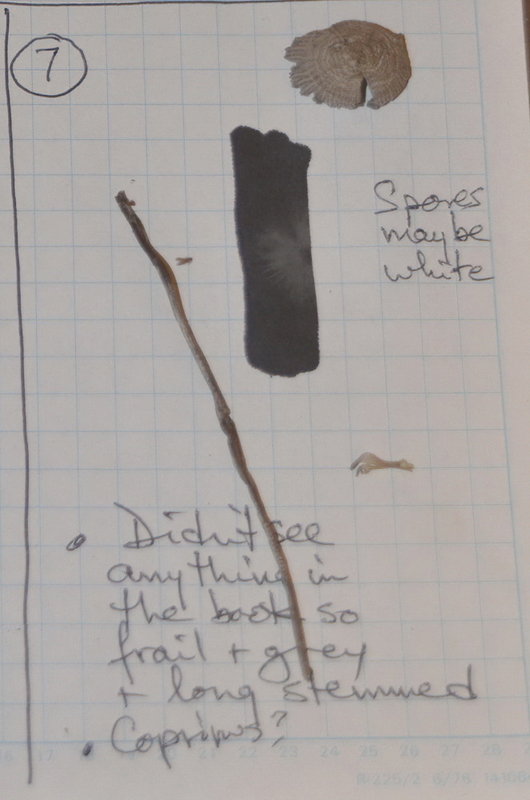 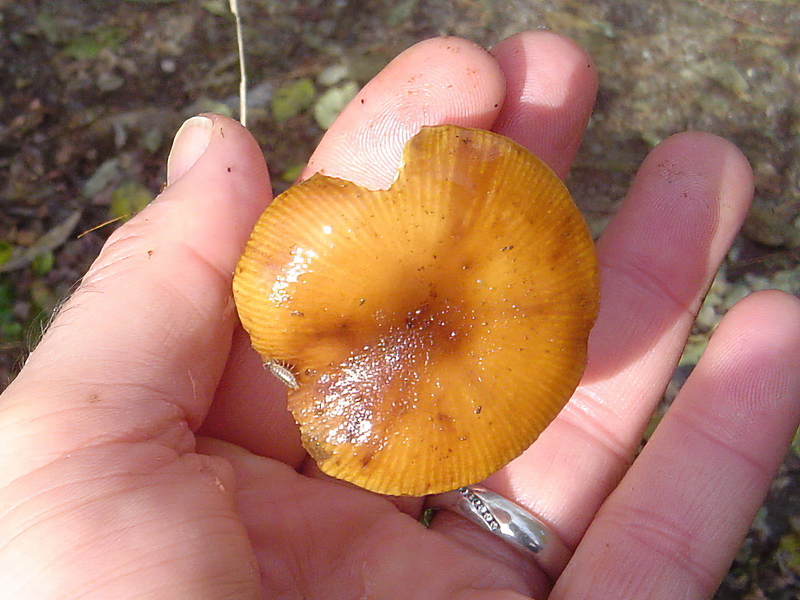 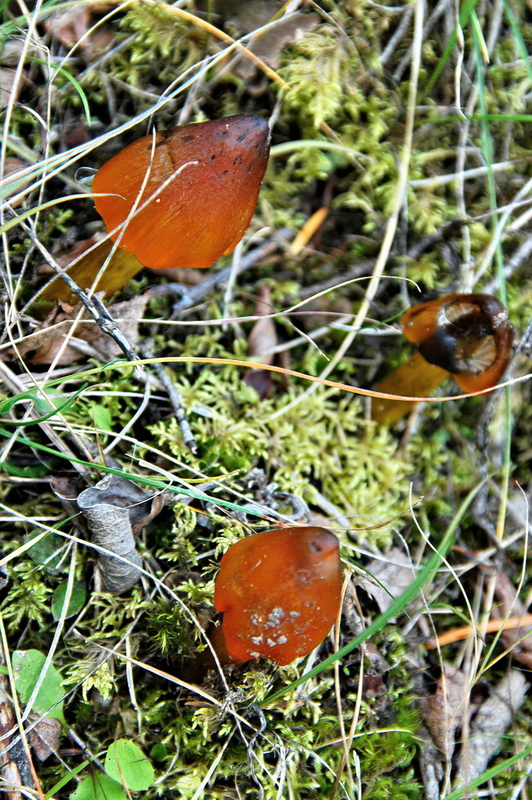 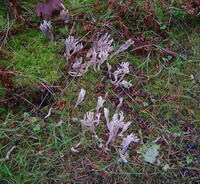 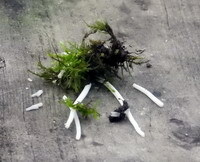 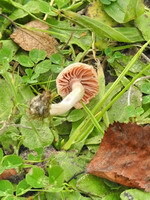 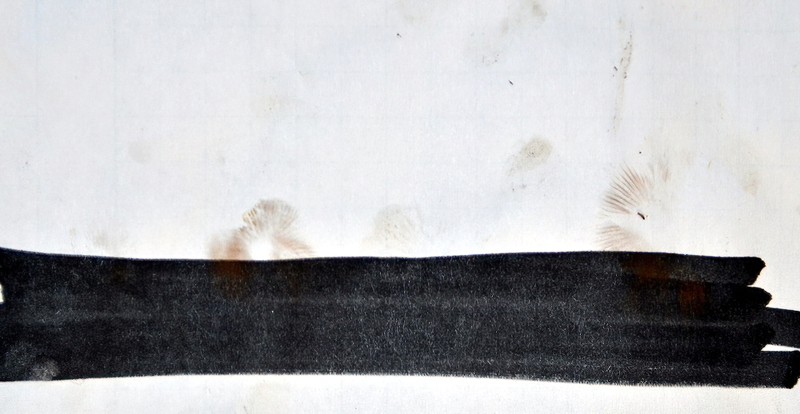 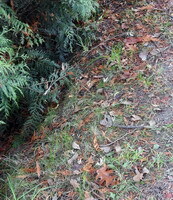 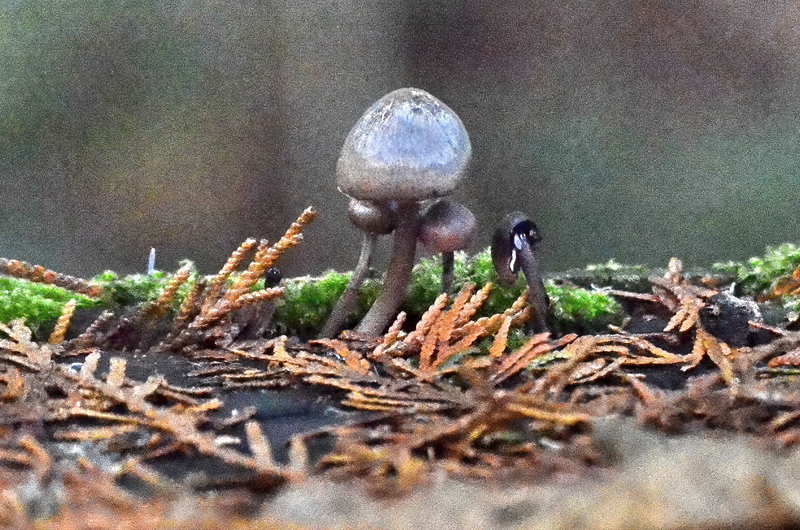 Other Specimens were very small and young, perhaps too soon to be able to properly identify the species. 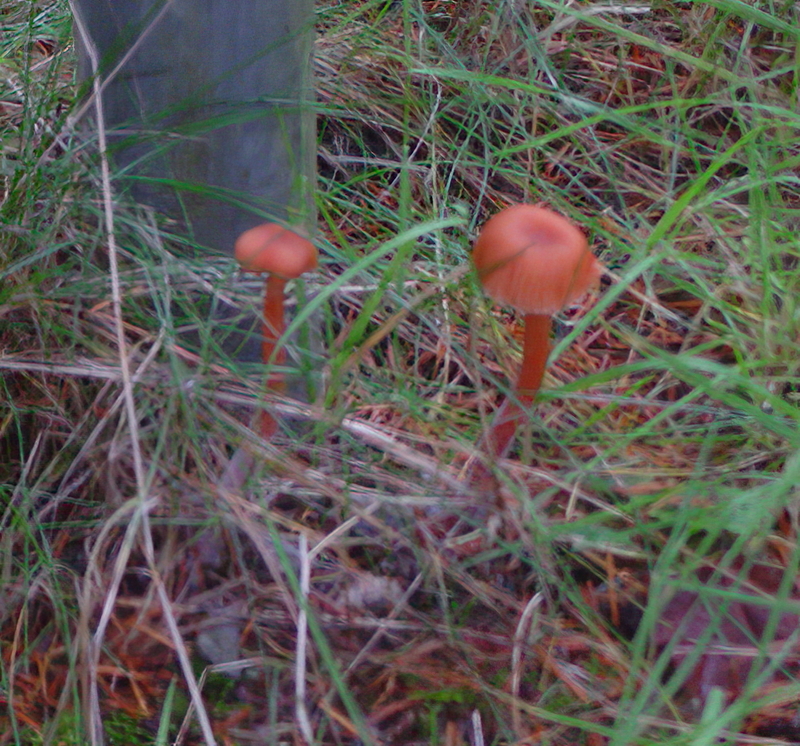 Other Quickly saw these as we passed by and took a quick shot before moving on. 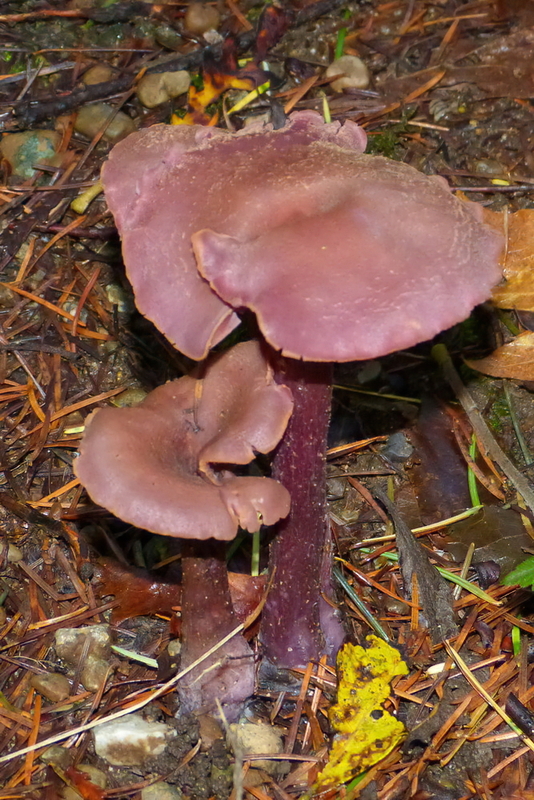 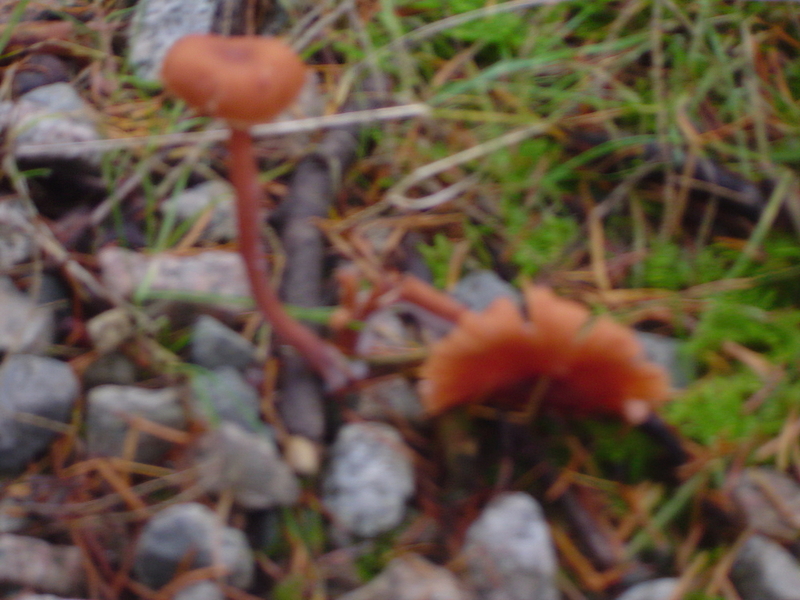 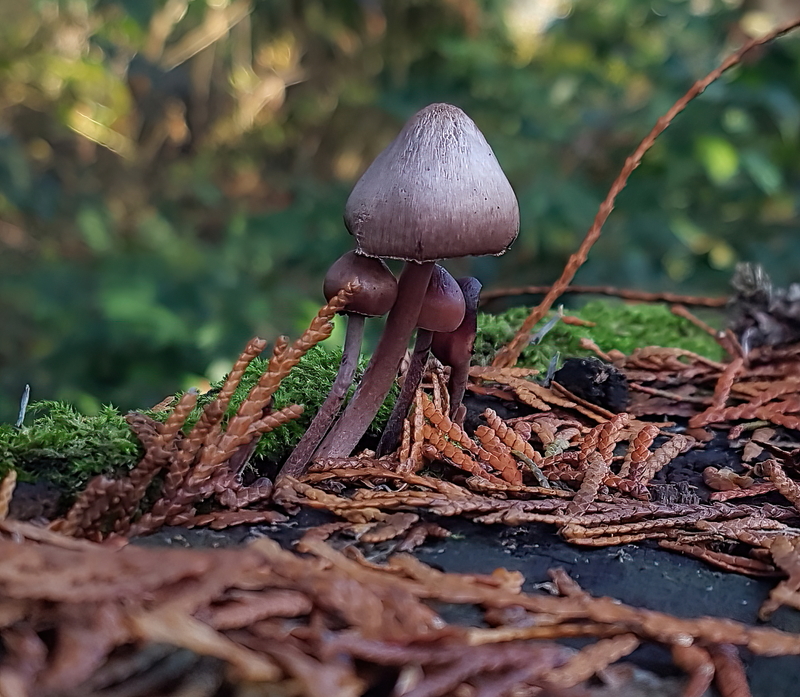 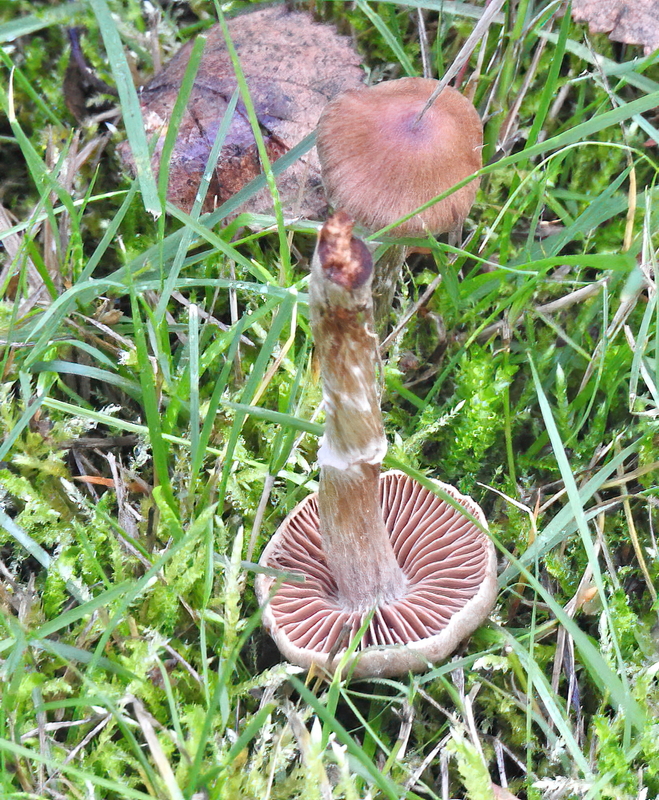 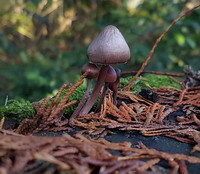 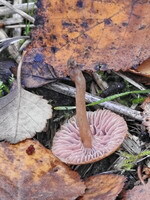 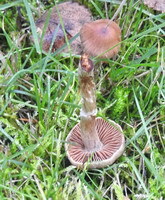 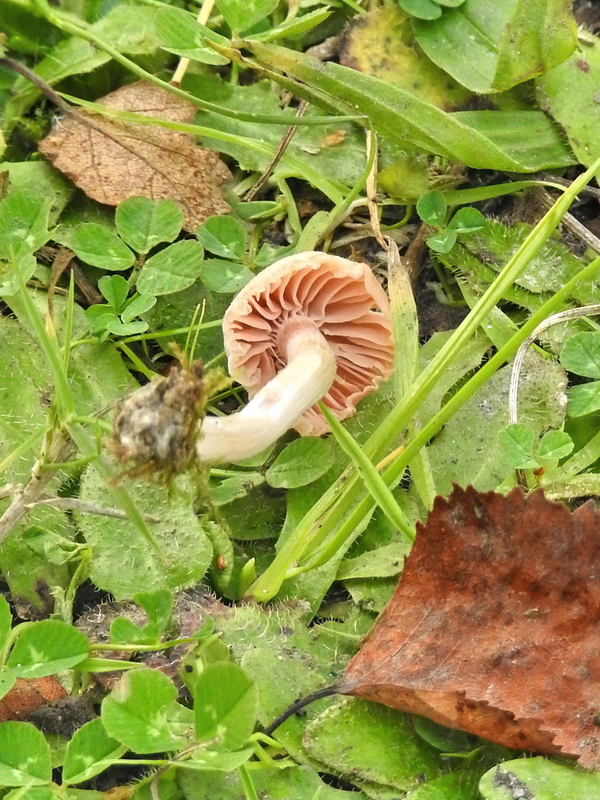 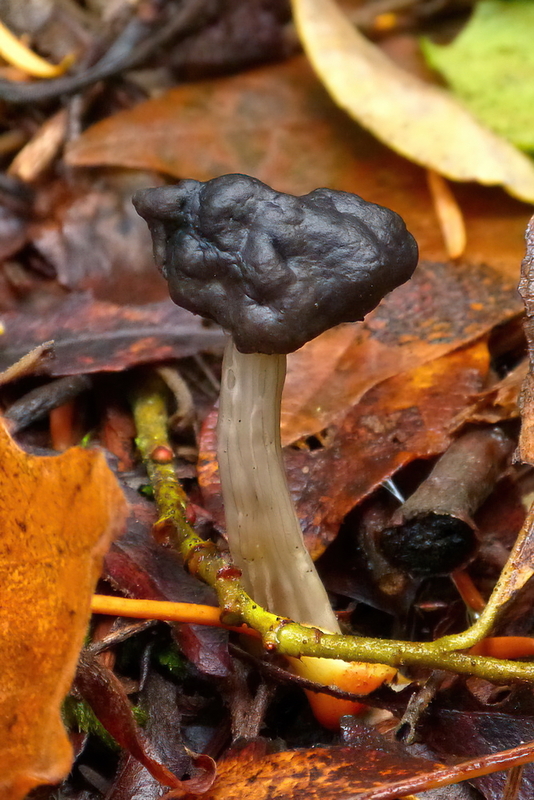 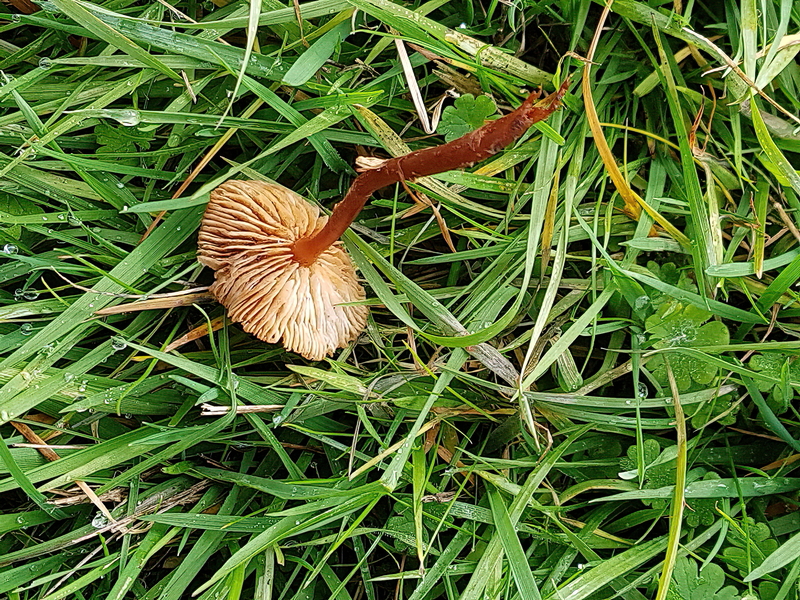 Not brown enough to be LBMs and not as pointed as I expected for a Witch's Hat, but I could think of no other likely identiifcation. May be the same as the one above. 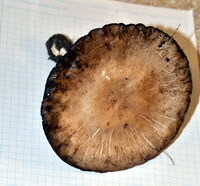 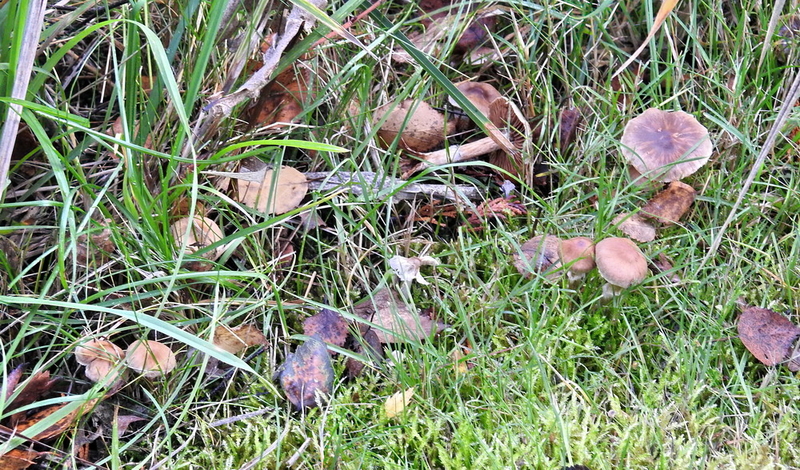 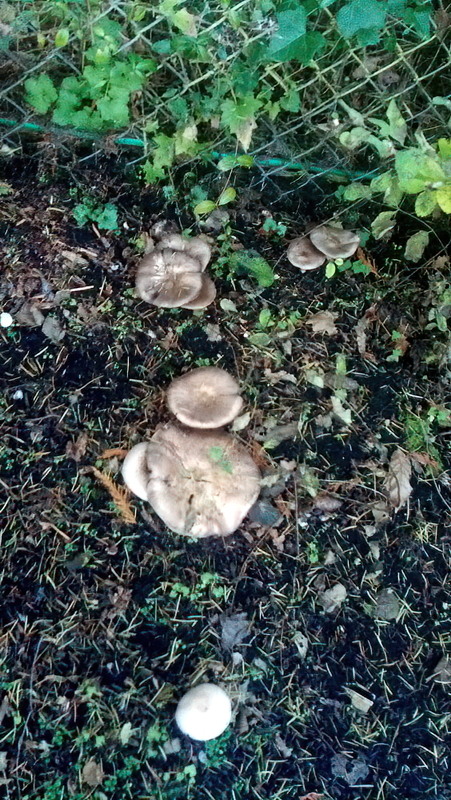 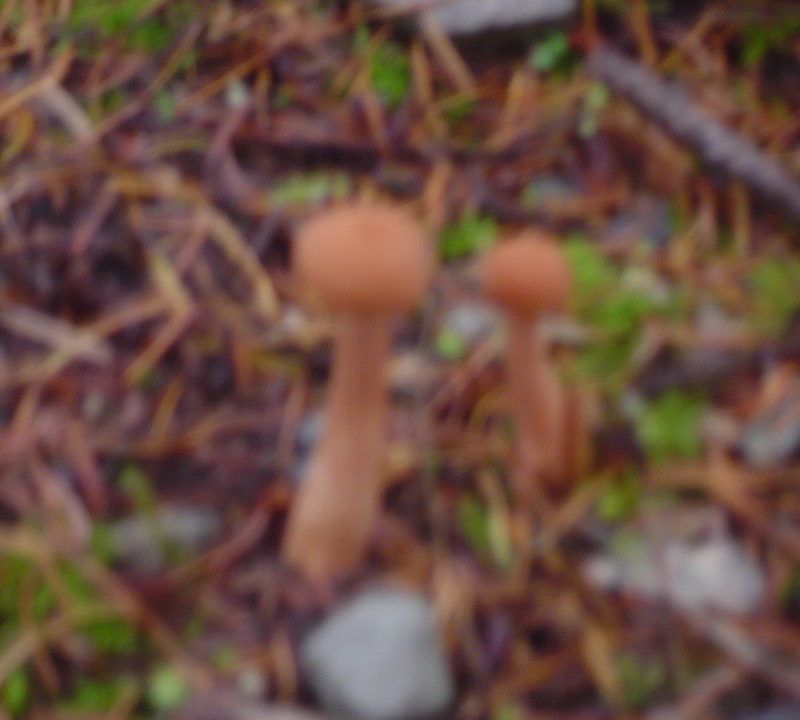 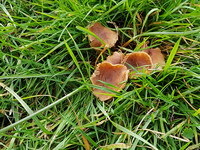 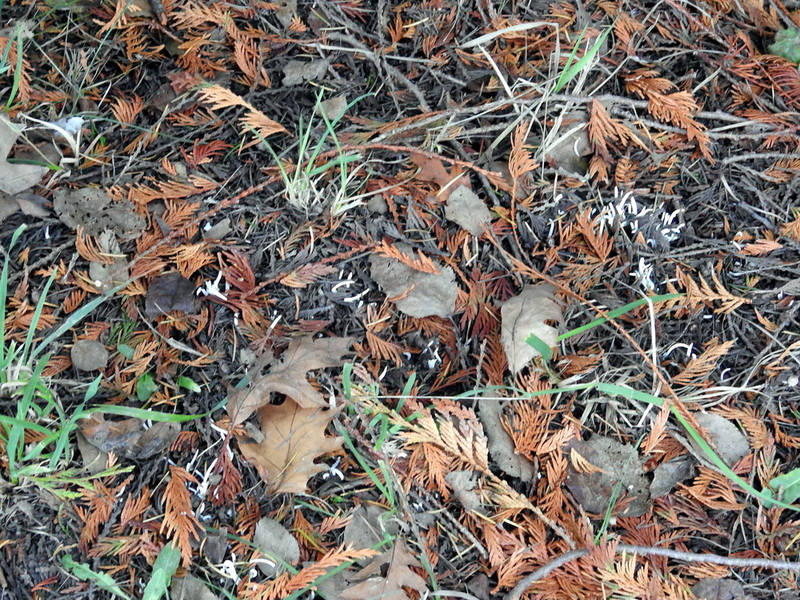 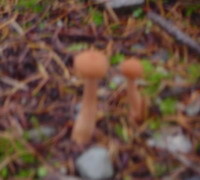 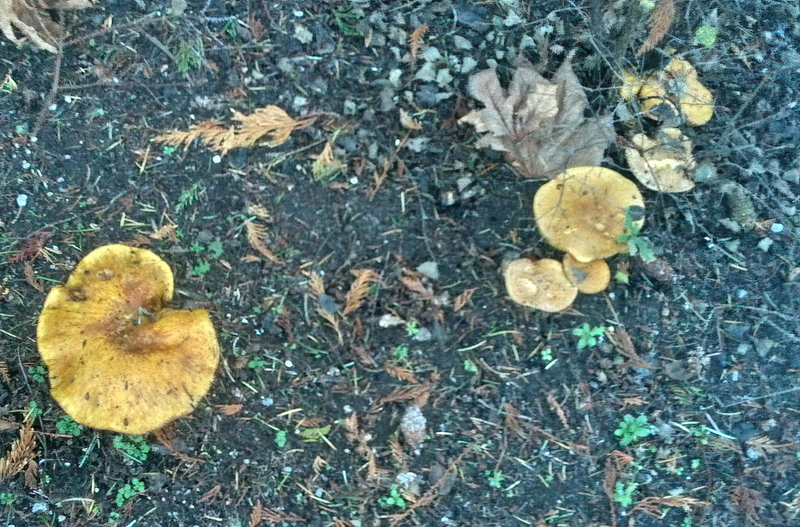 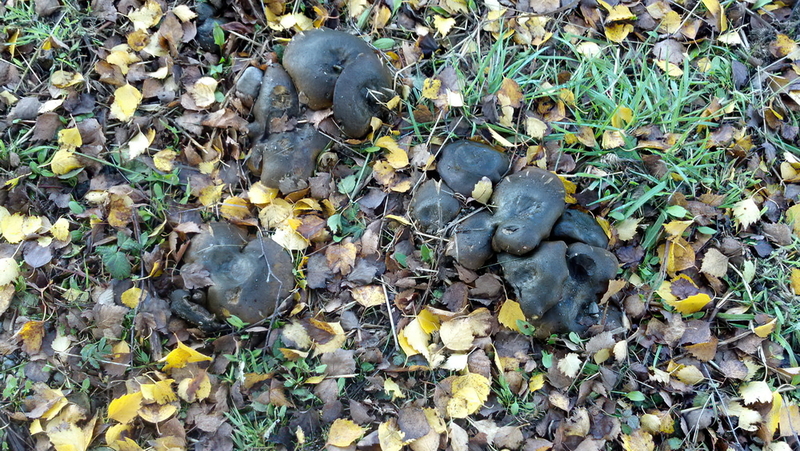 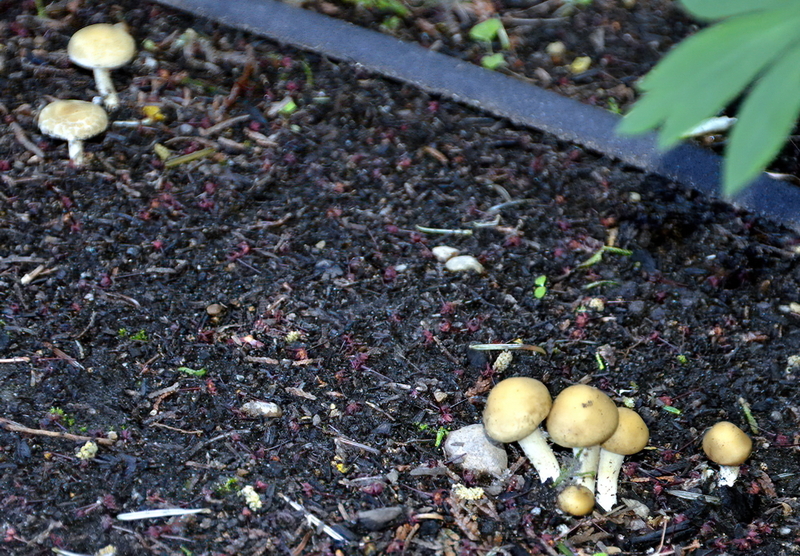 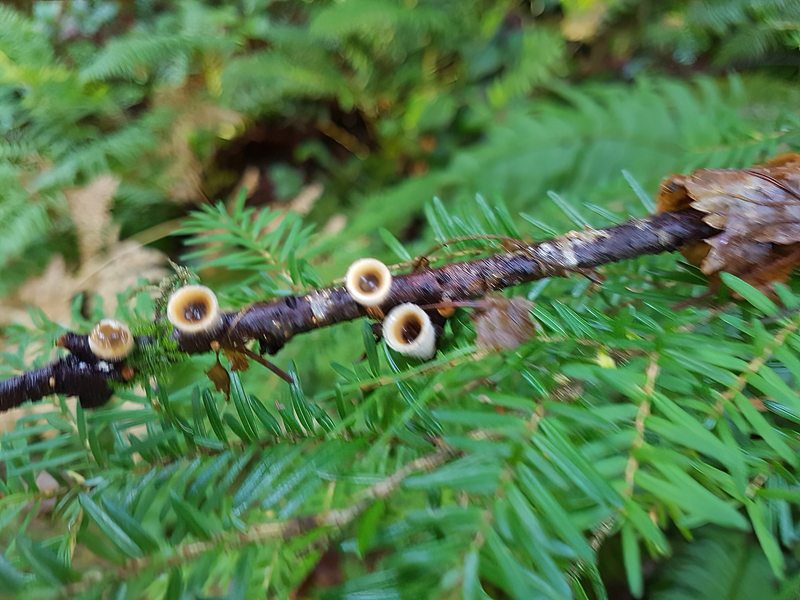 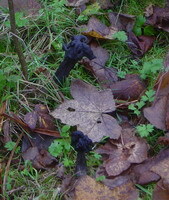 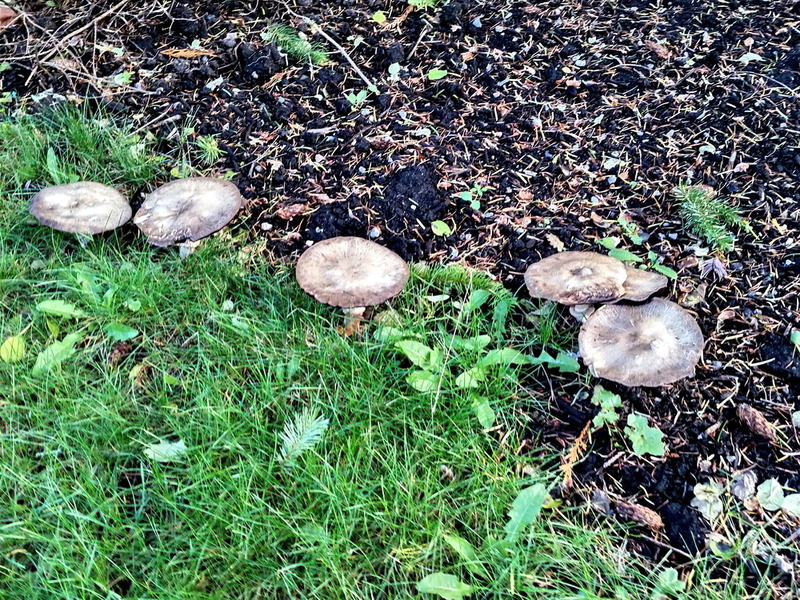 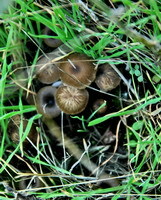 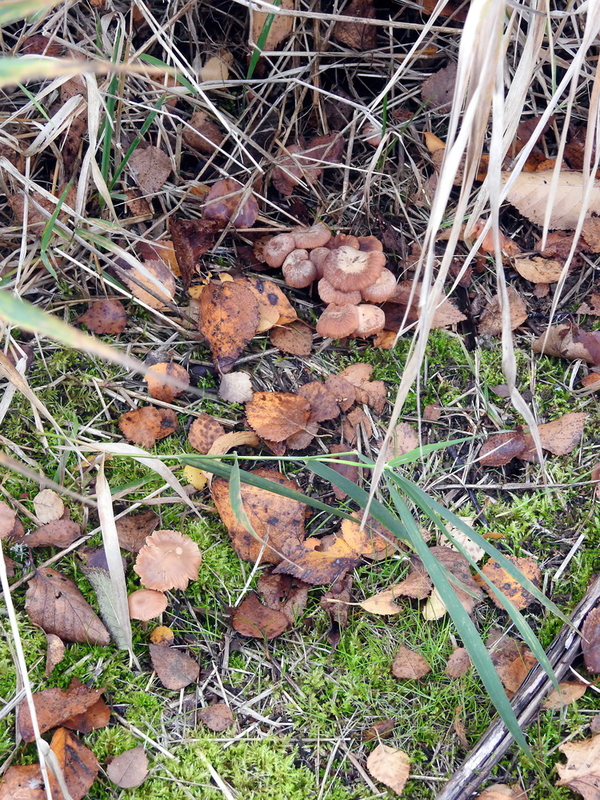 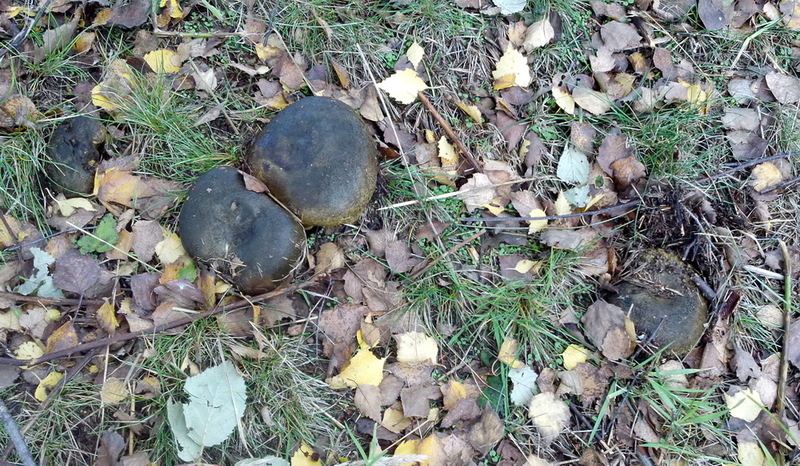 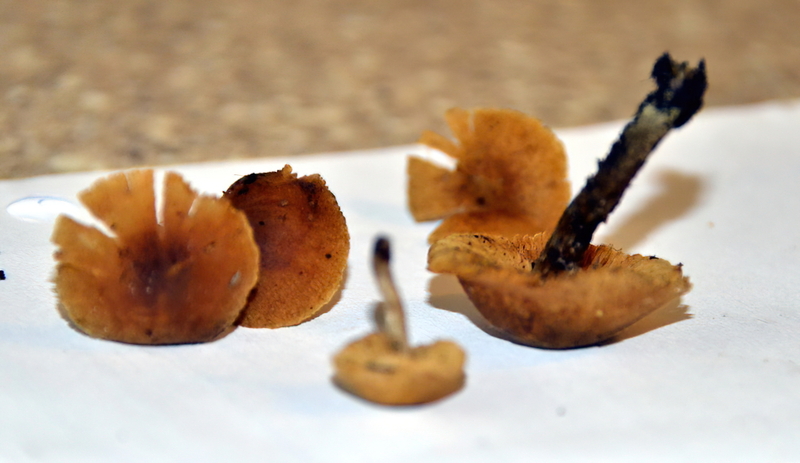 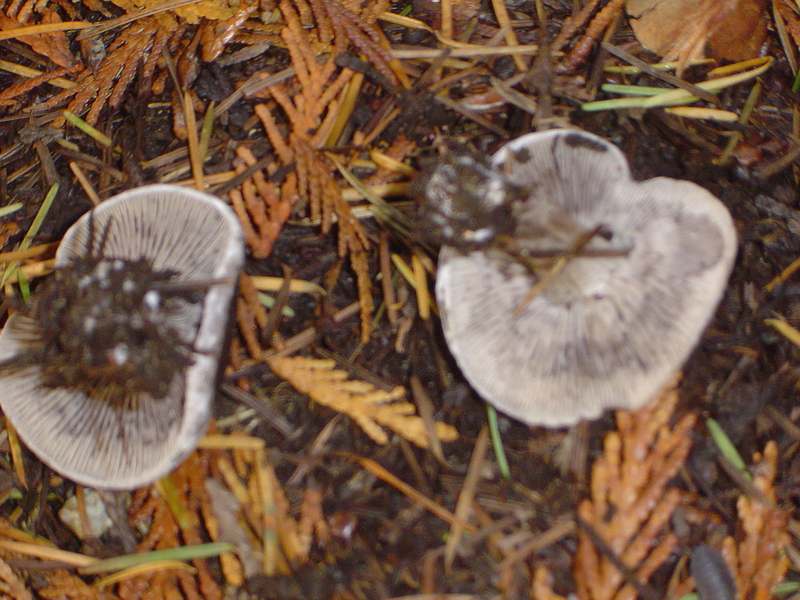 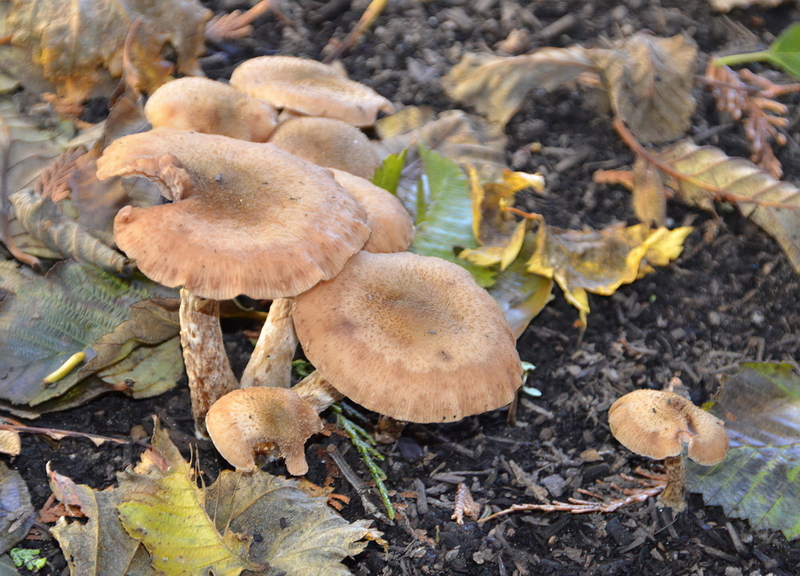 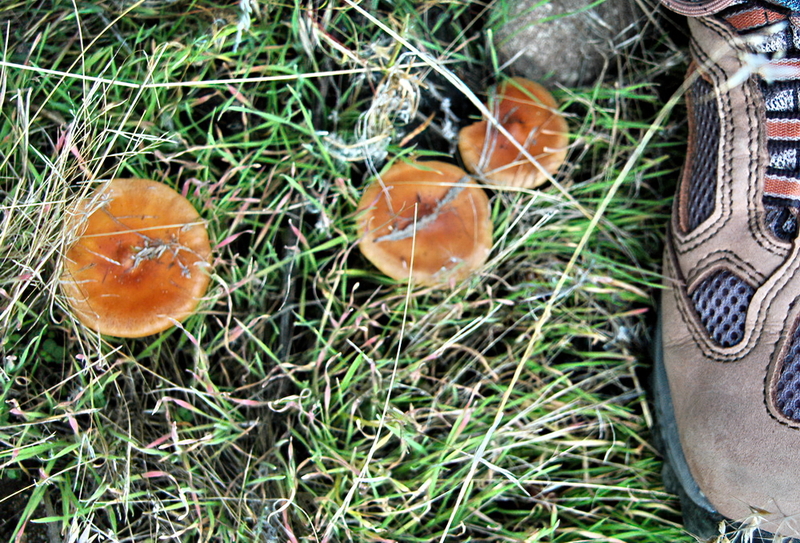 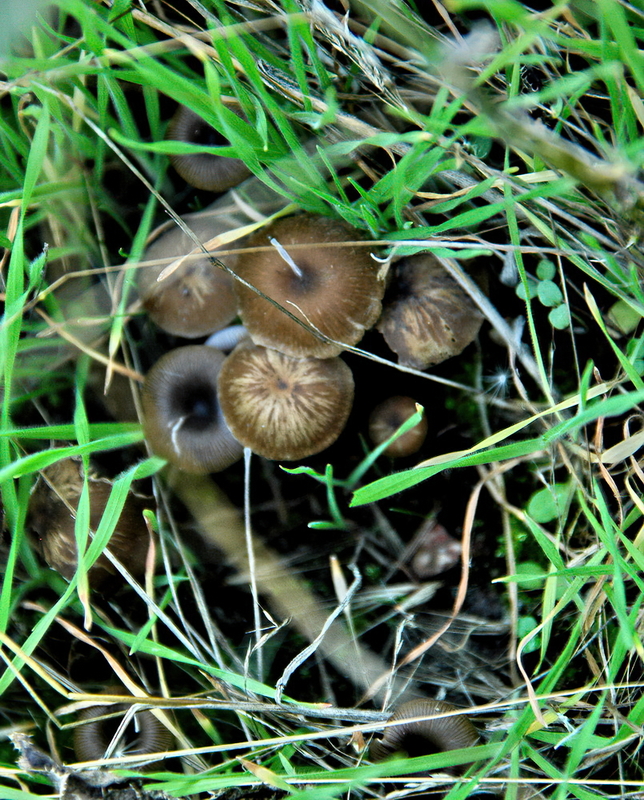 Other Thought these might be Honey Mushrooms initially but no ring, thin black stalk and not in such clusters. 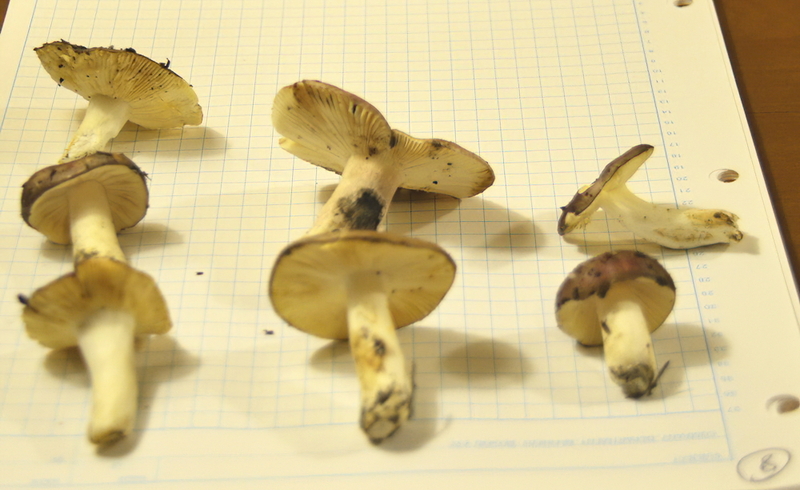 Experience Glen fried some of these and ate them. No adverse effects. Waited too long before eating them so they were a little squishy. 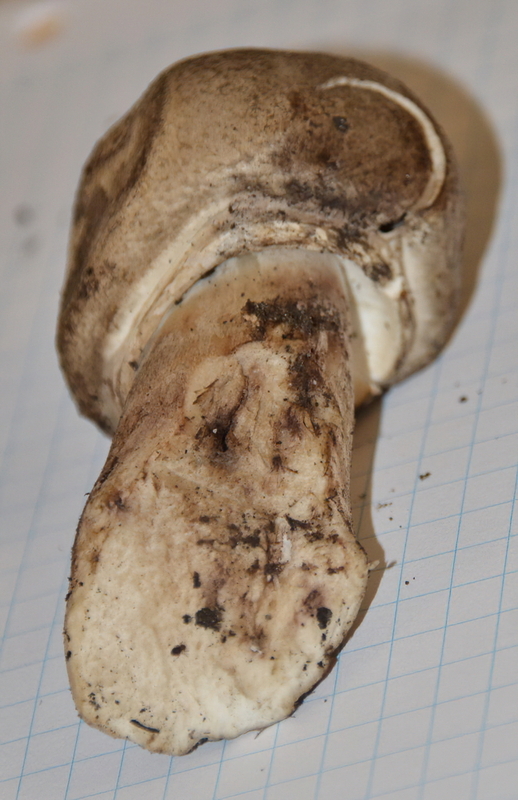 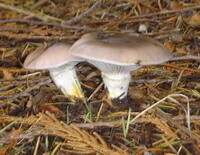 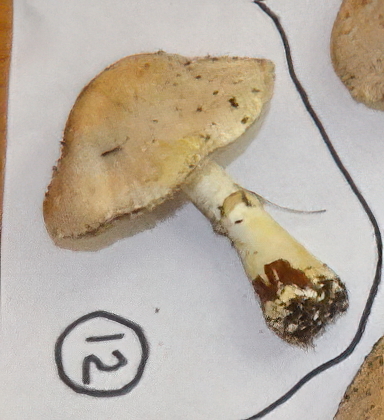 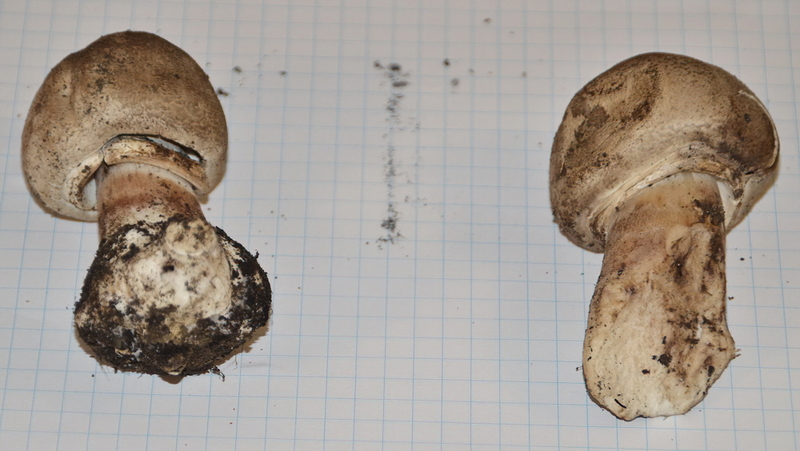 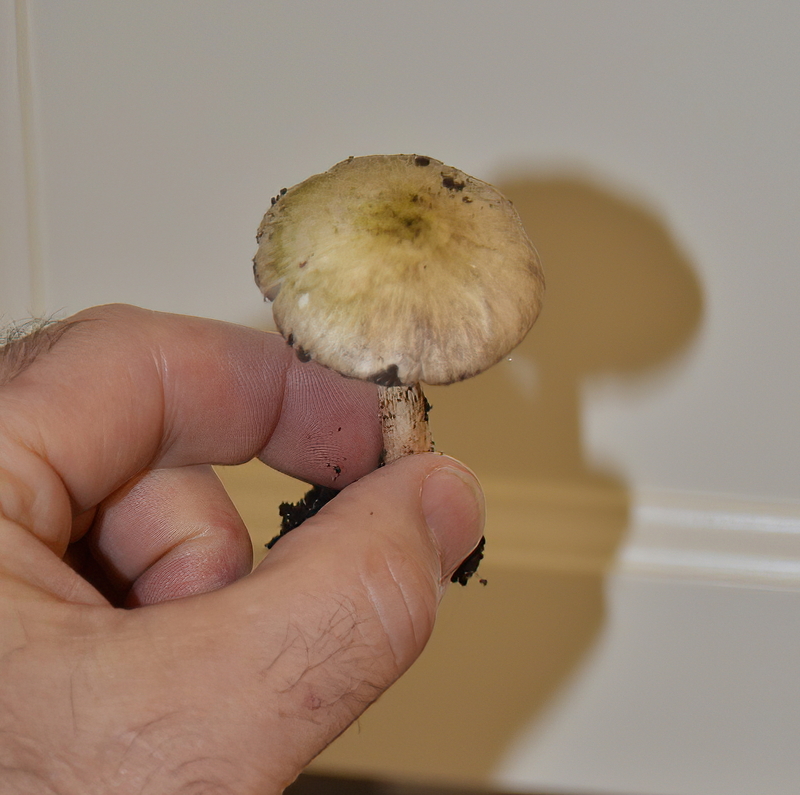 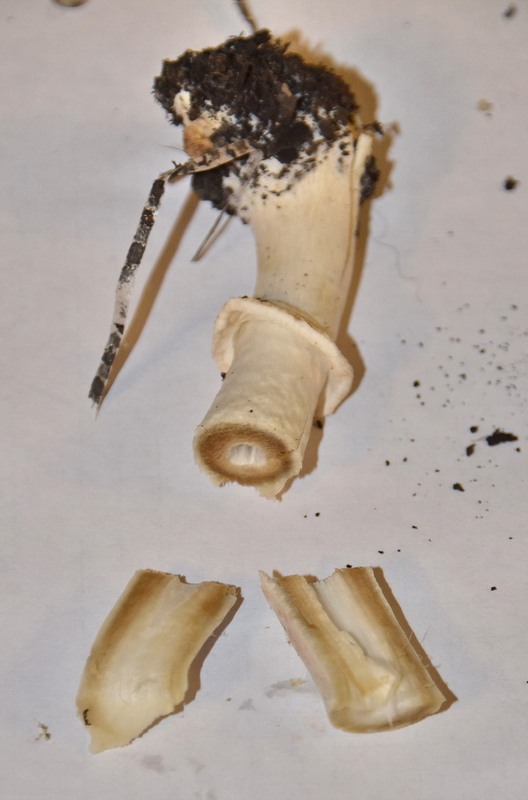 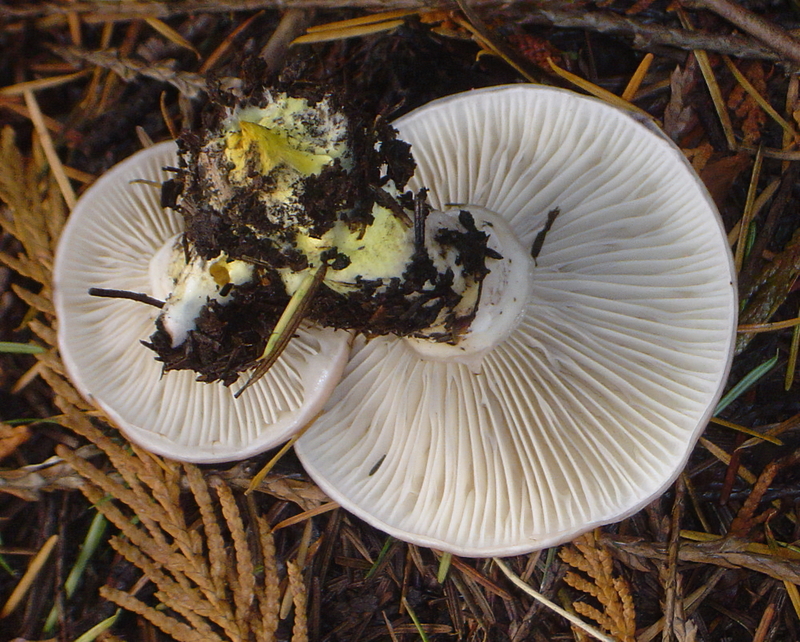 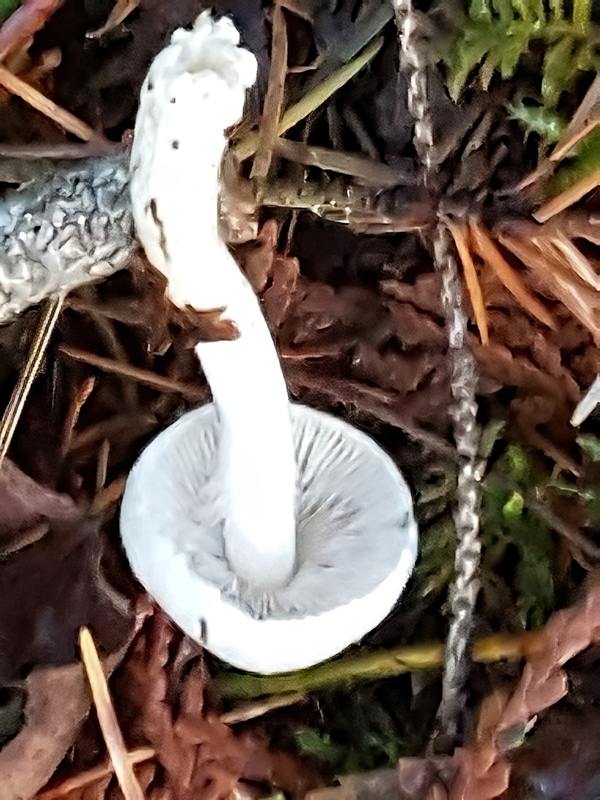 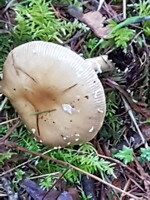 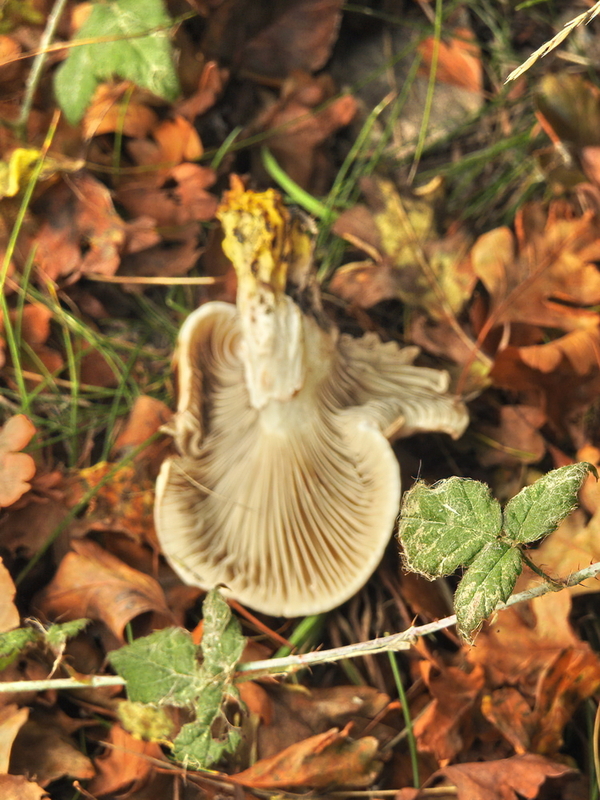 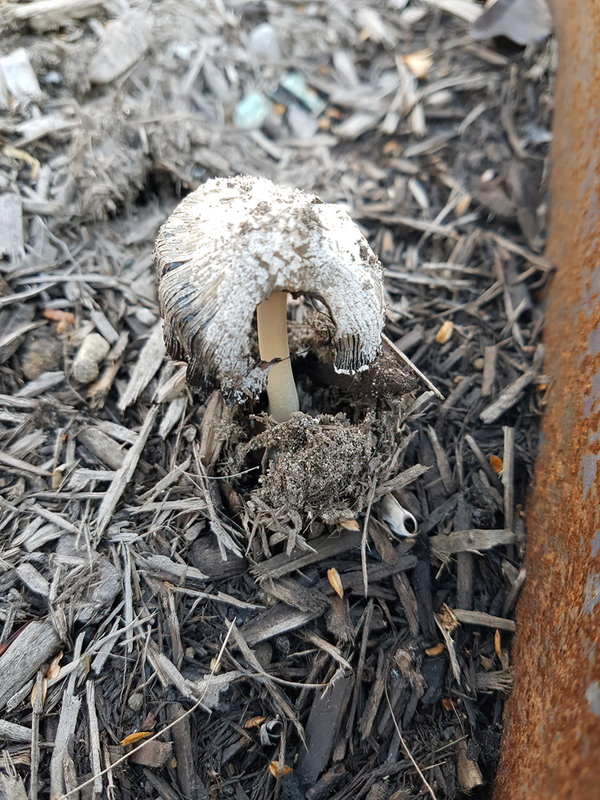 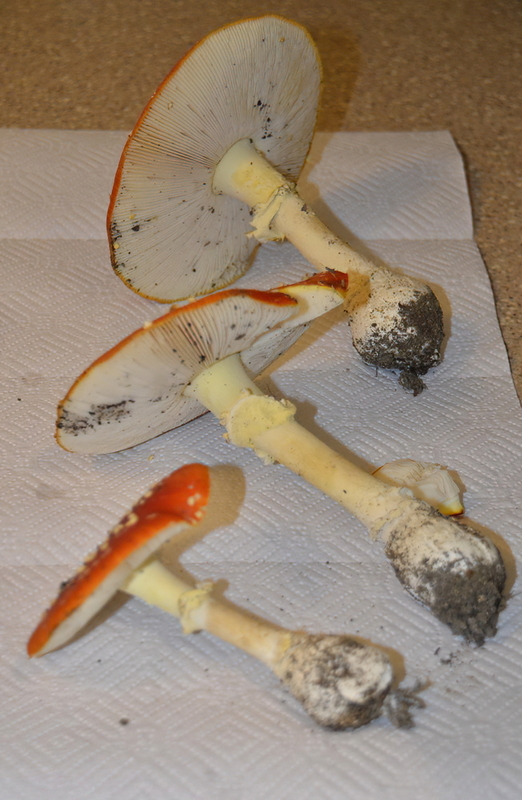 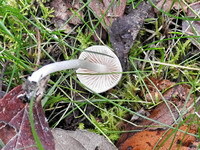 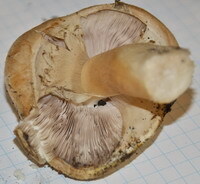 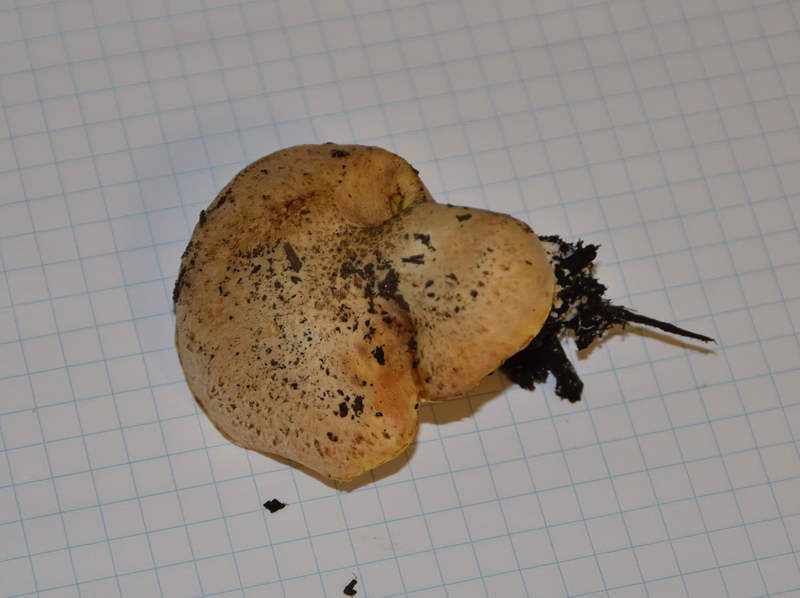 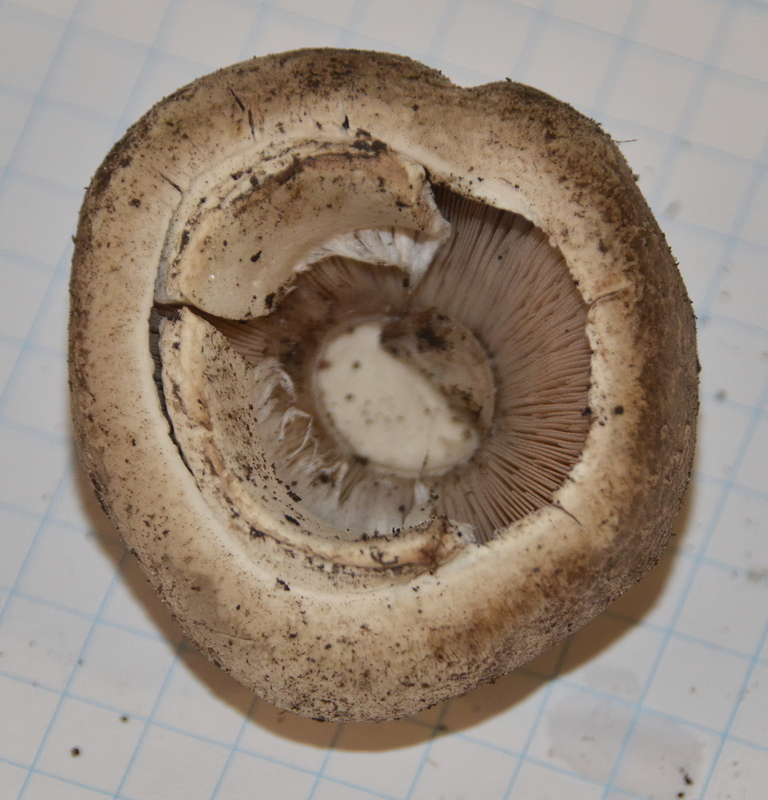 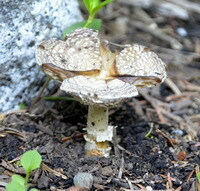 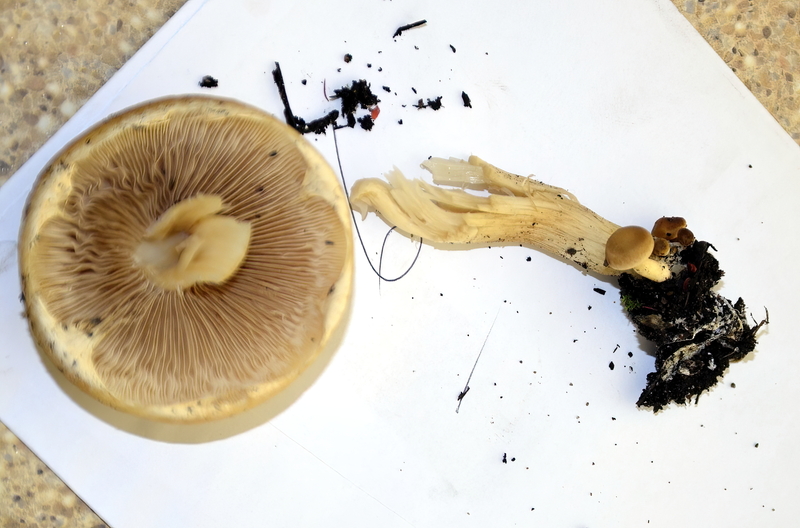 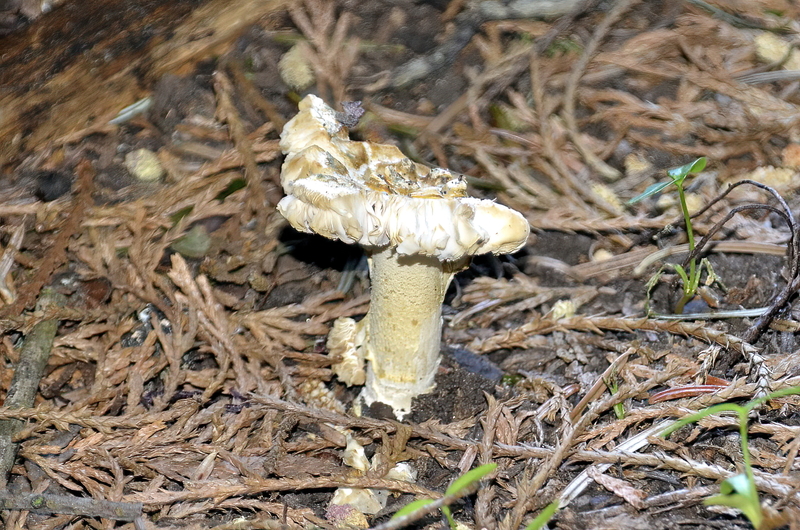 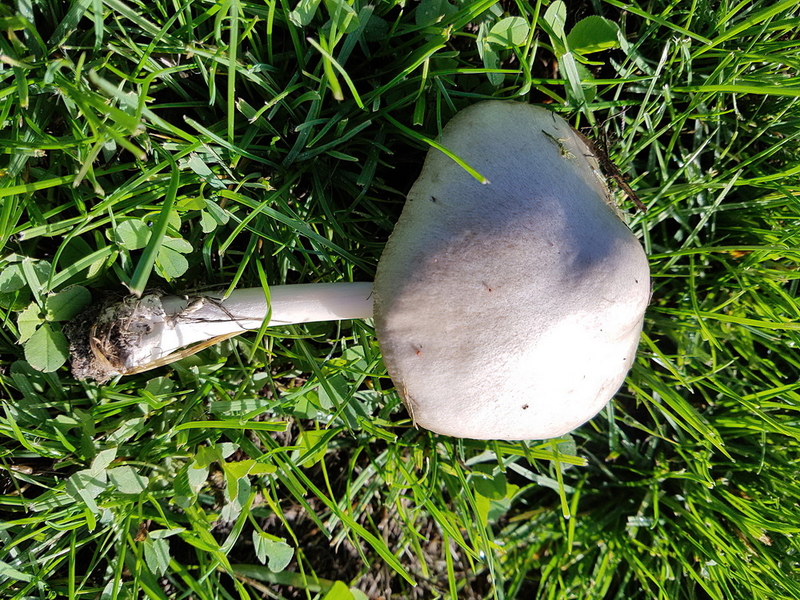 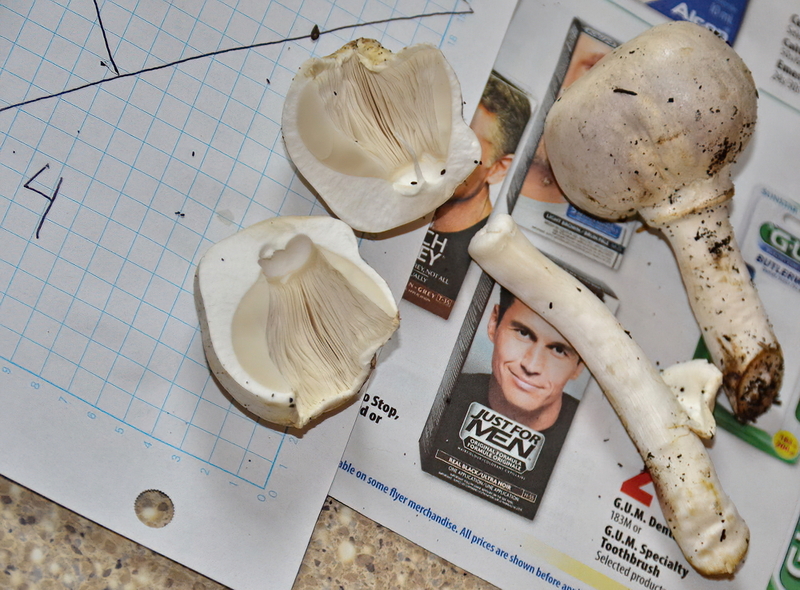 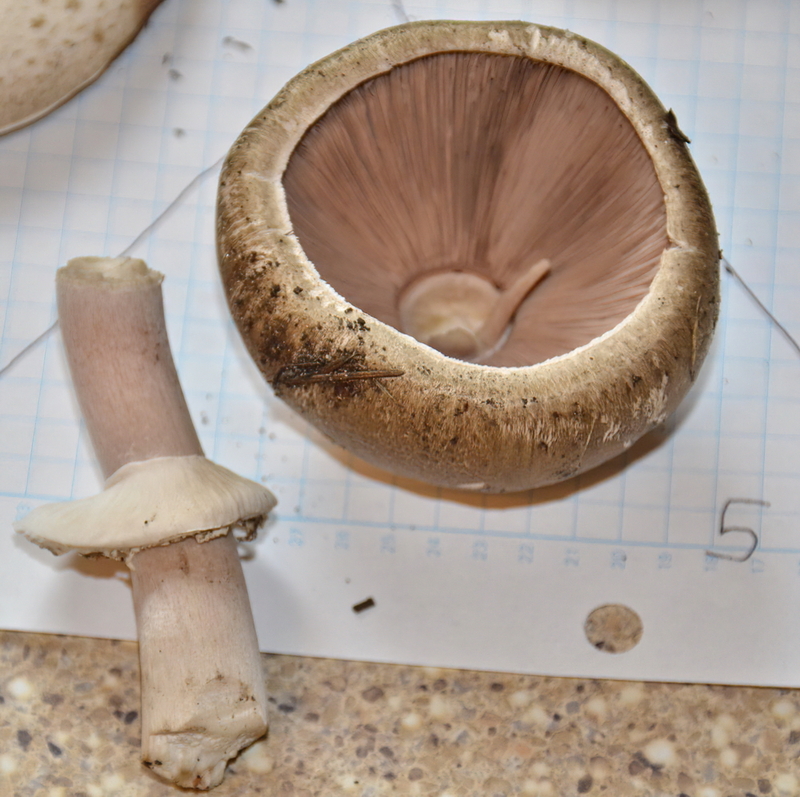 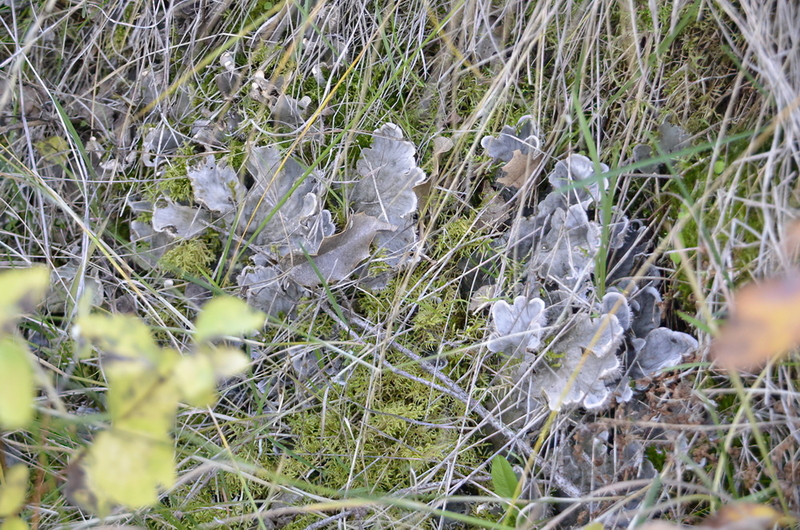 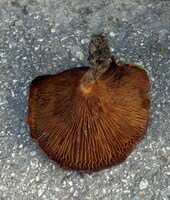 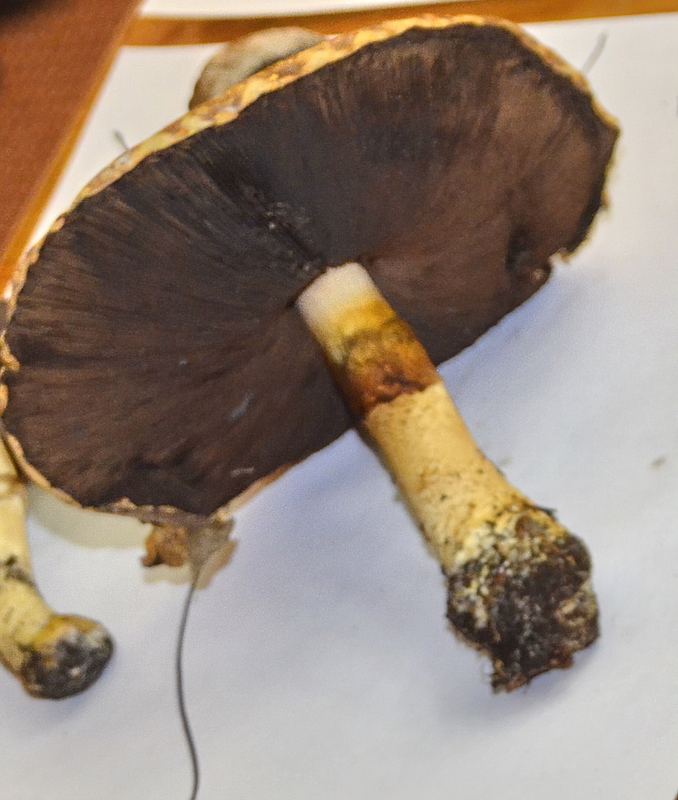 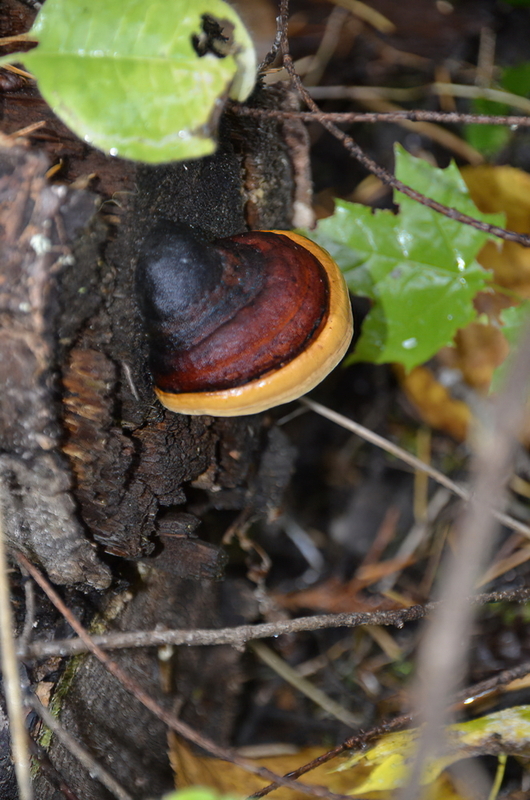 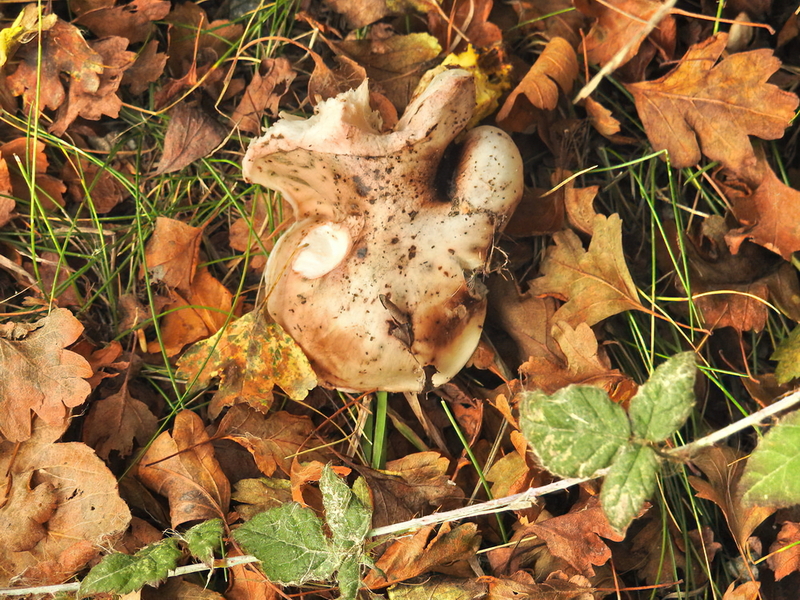 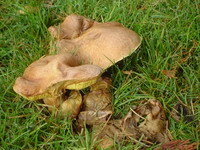 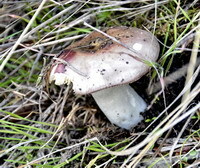 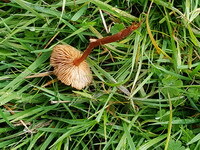 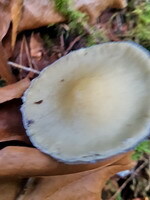 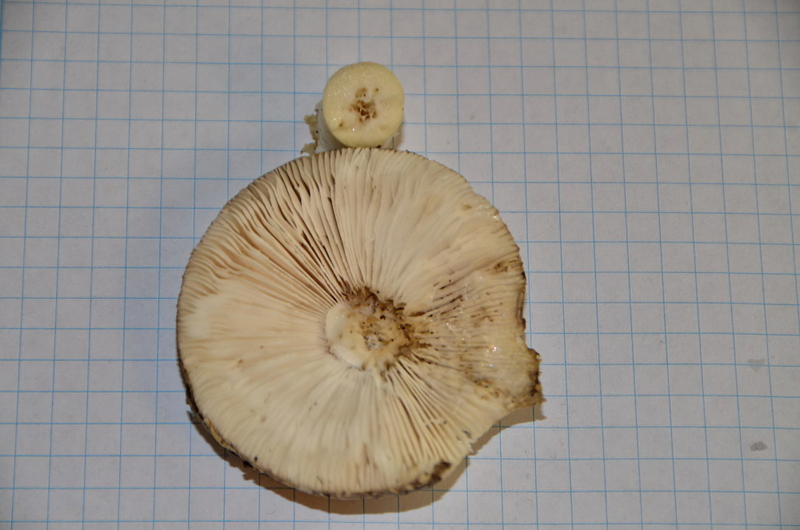 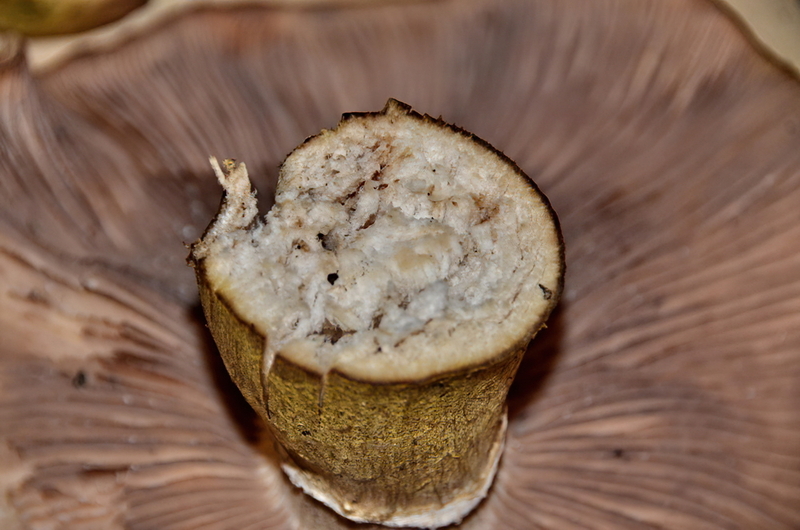 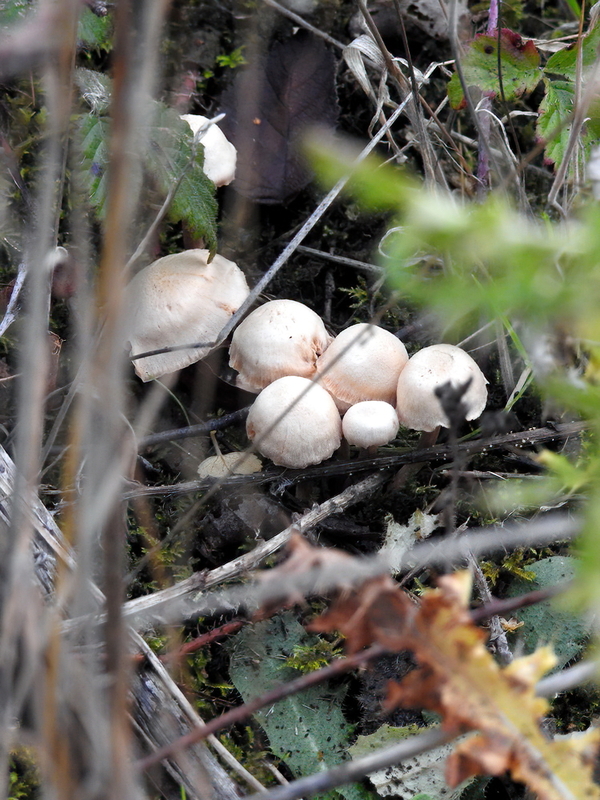 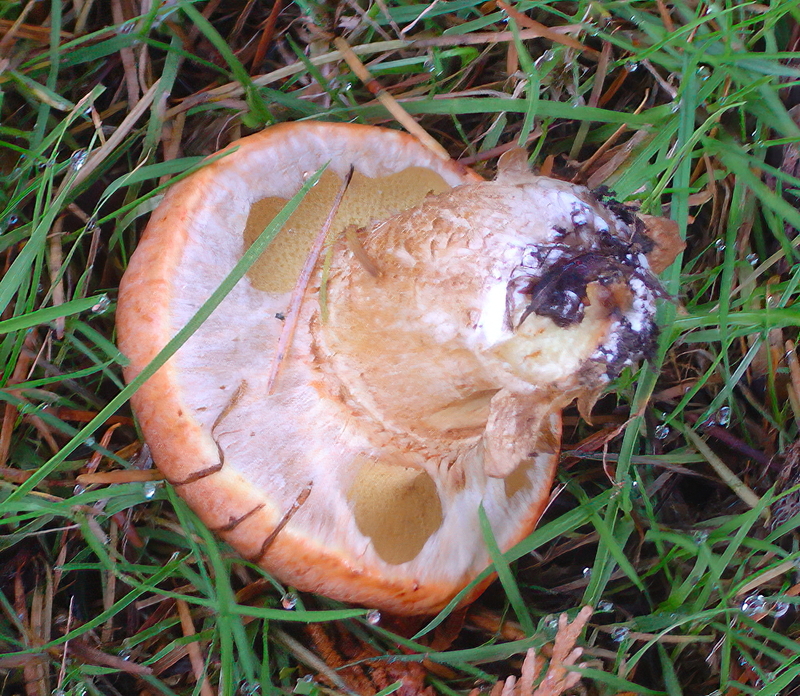 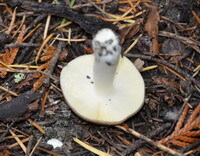 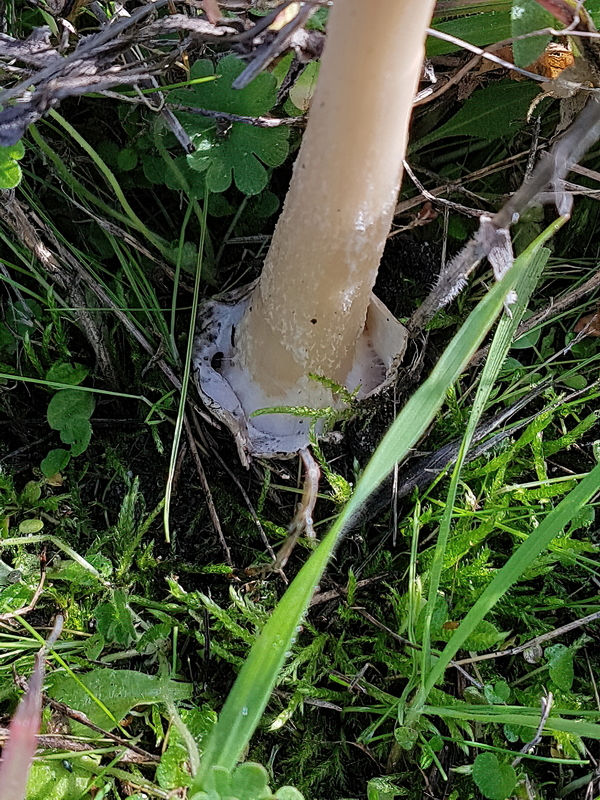 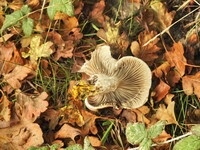 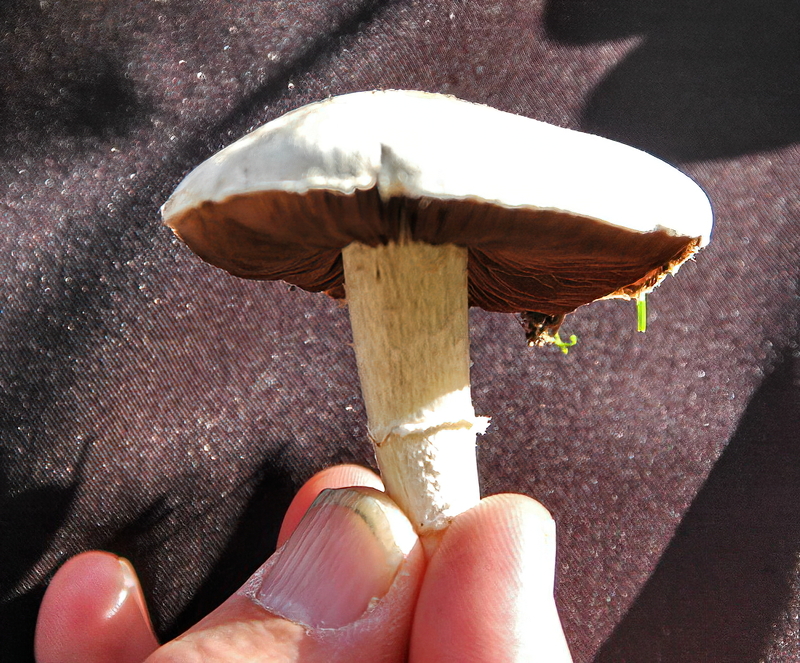 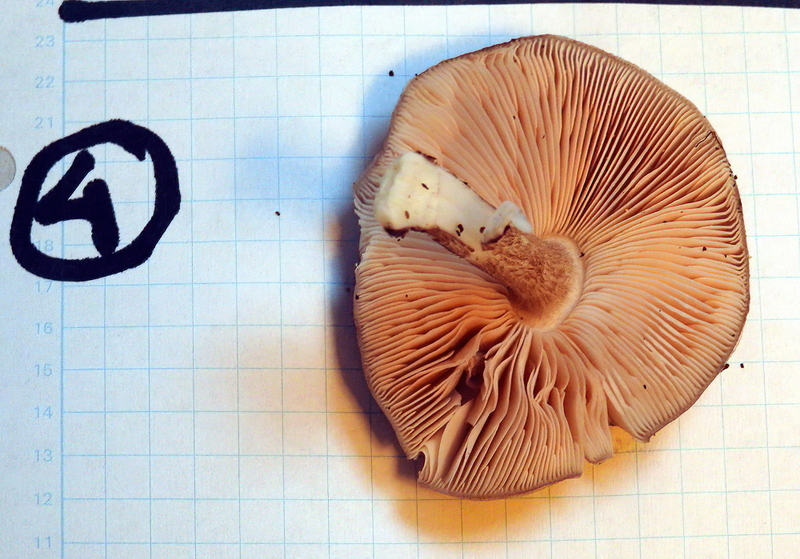 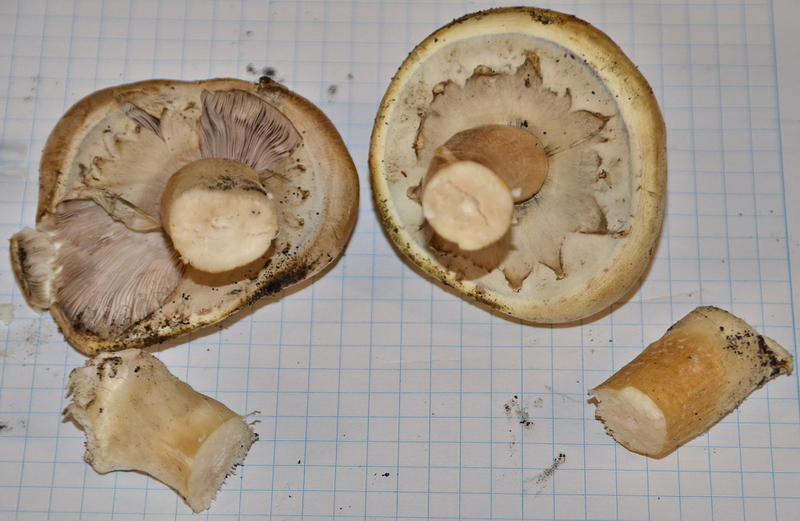 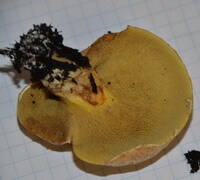 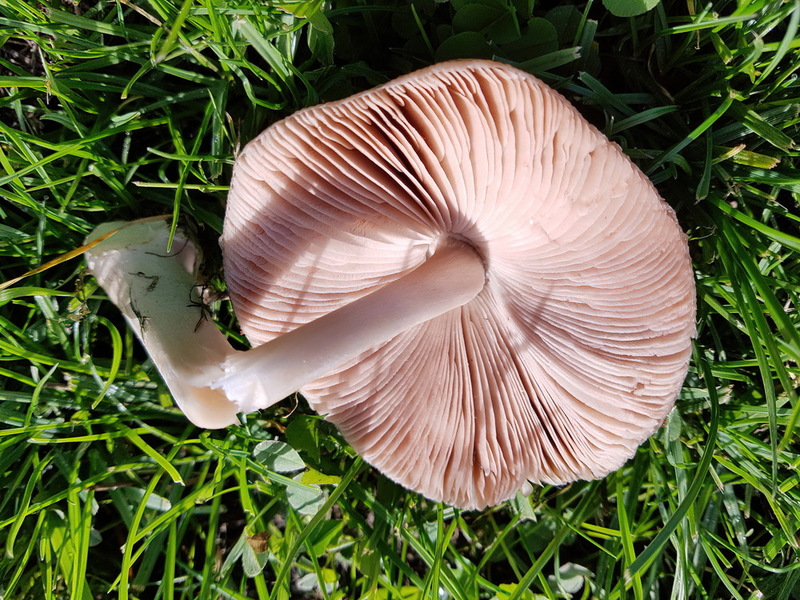 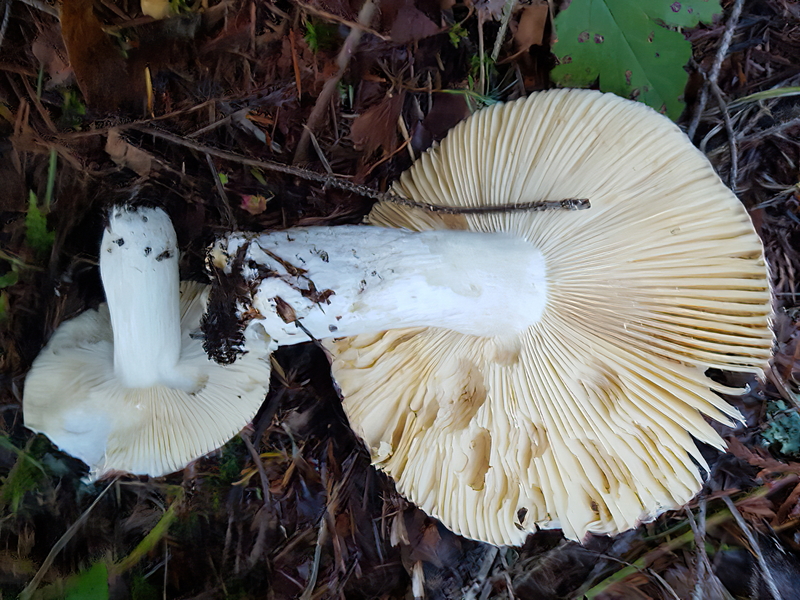 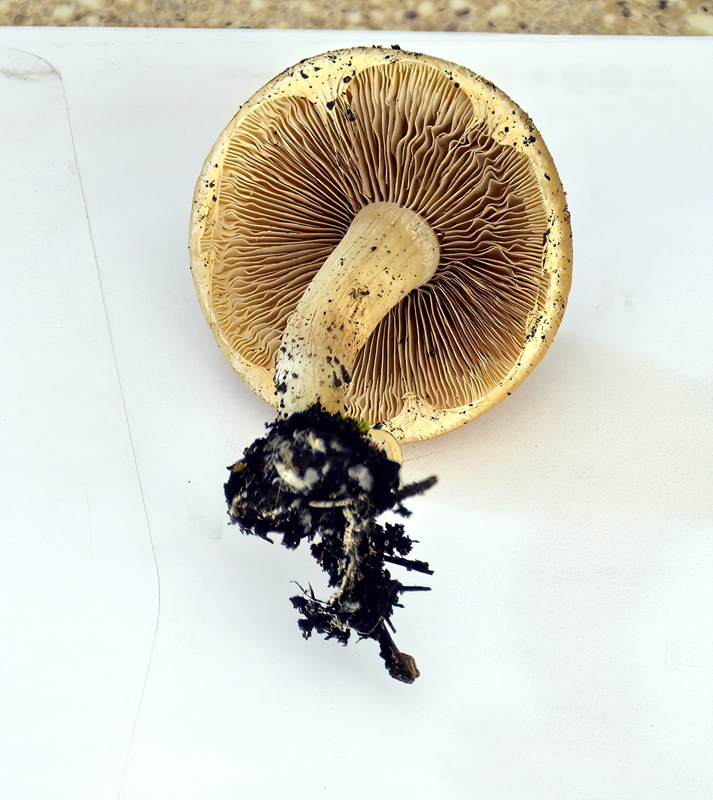 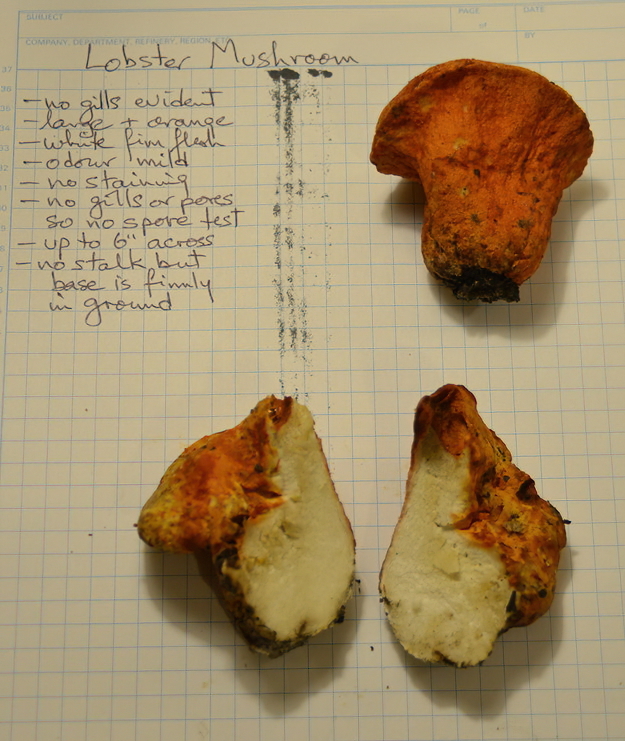 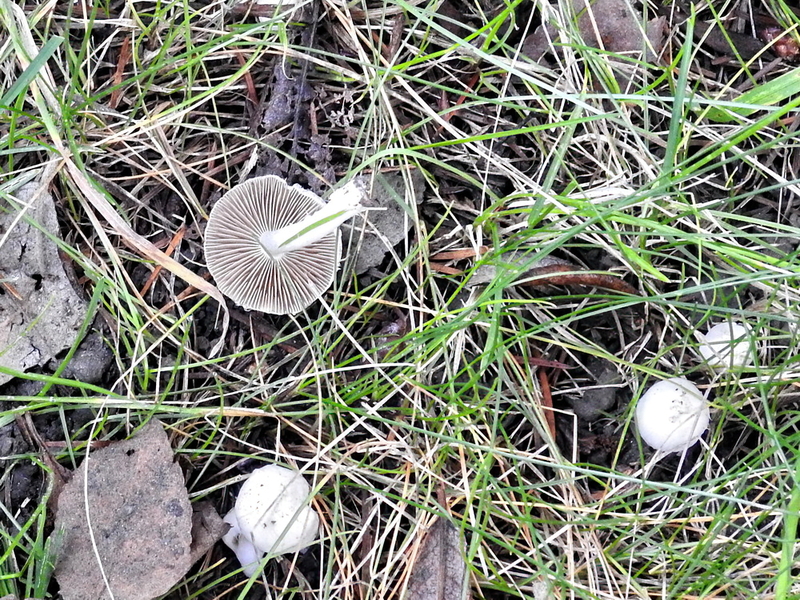 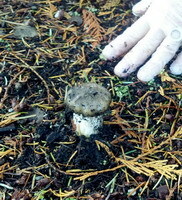 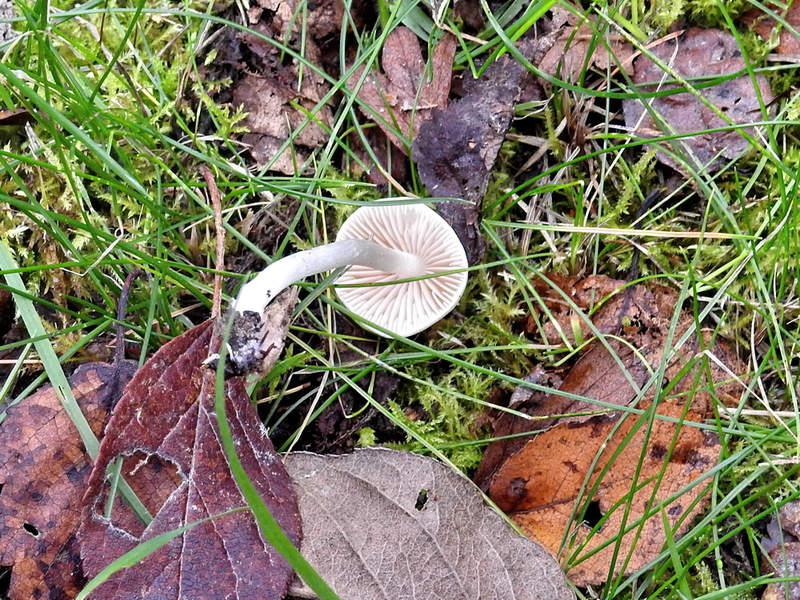 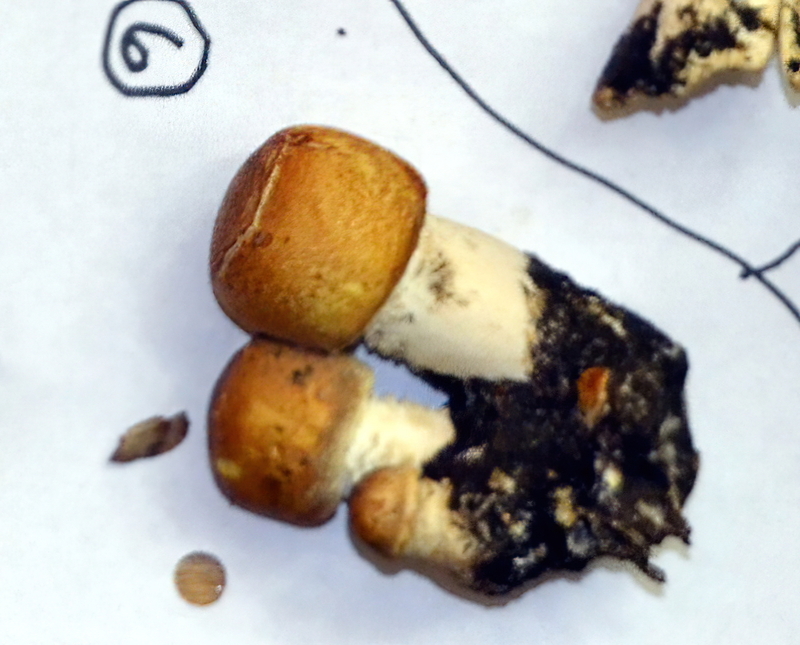 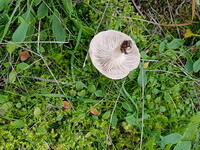 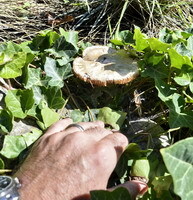 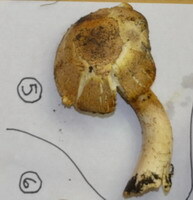 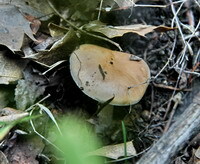 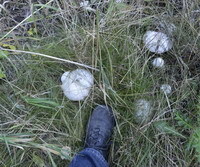 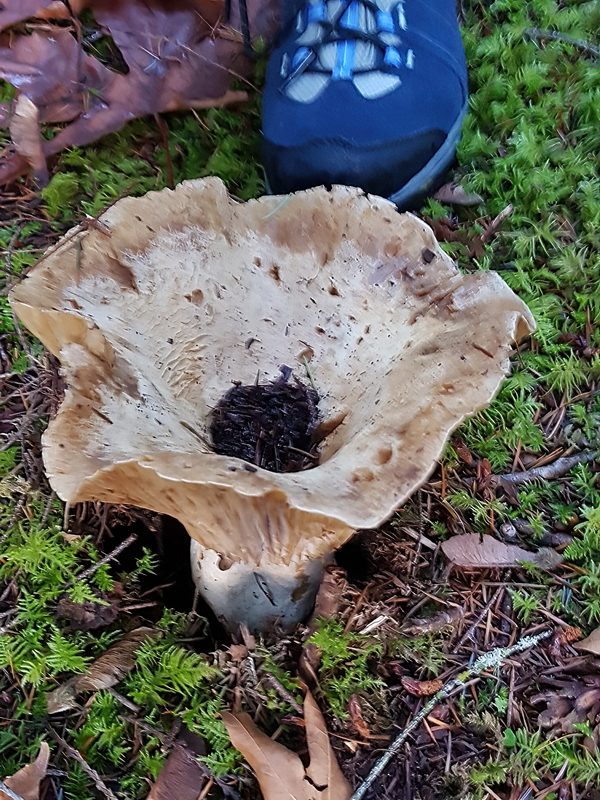 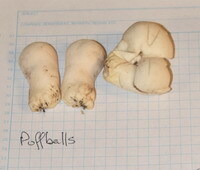 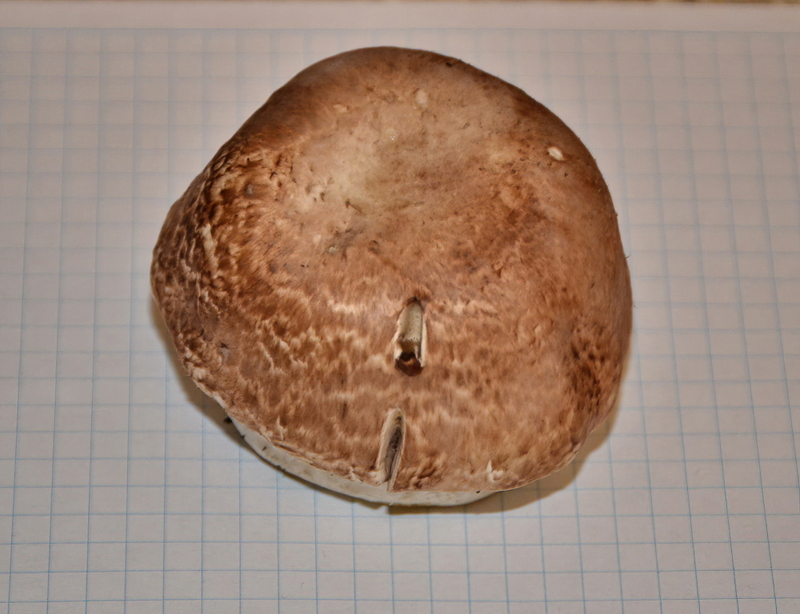 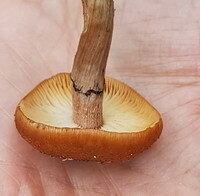 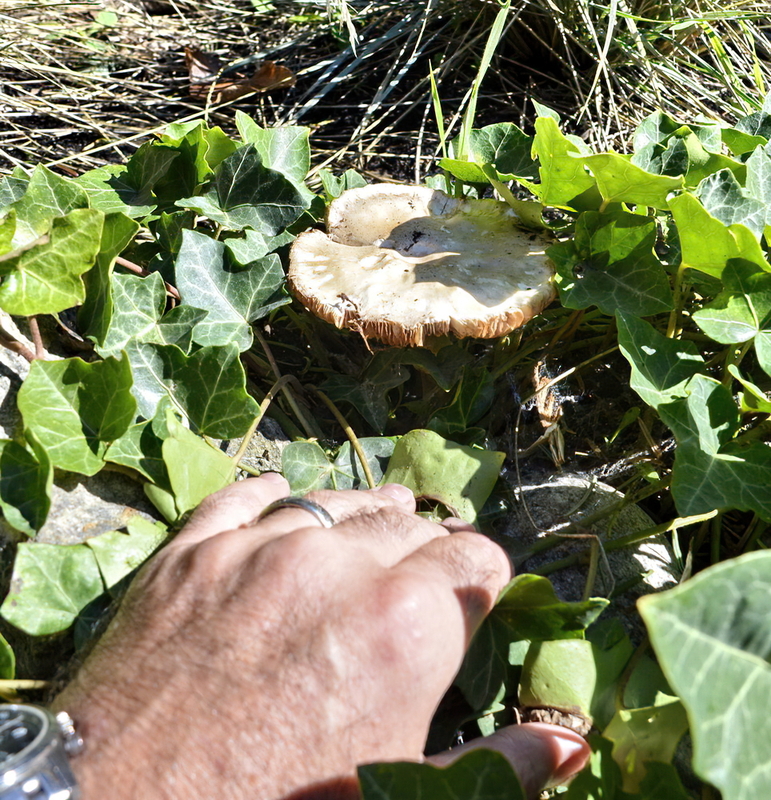 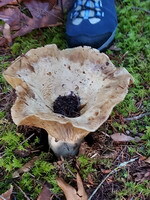 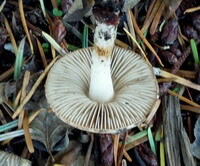 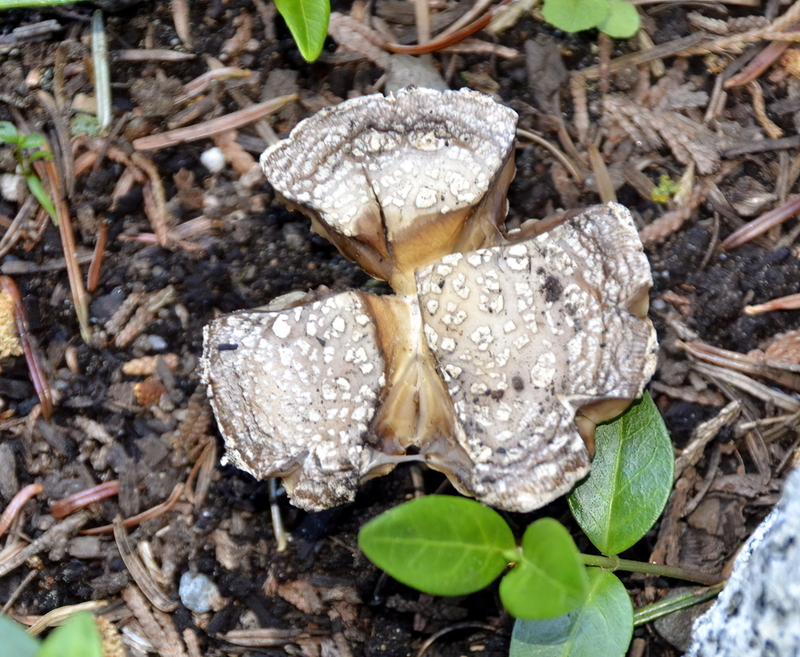 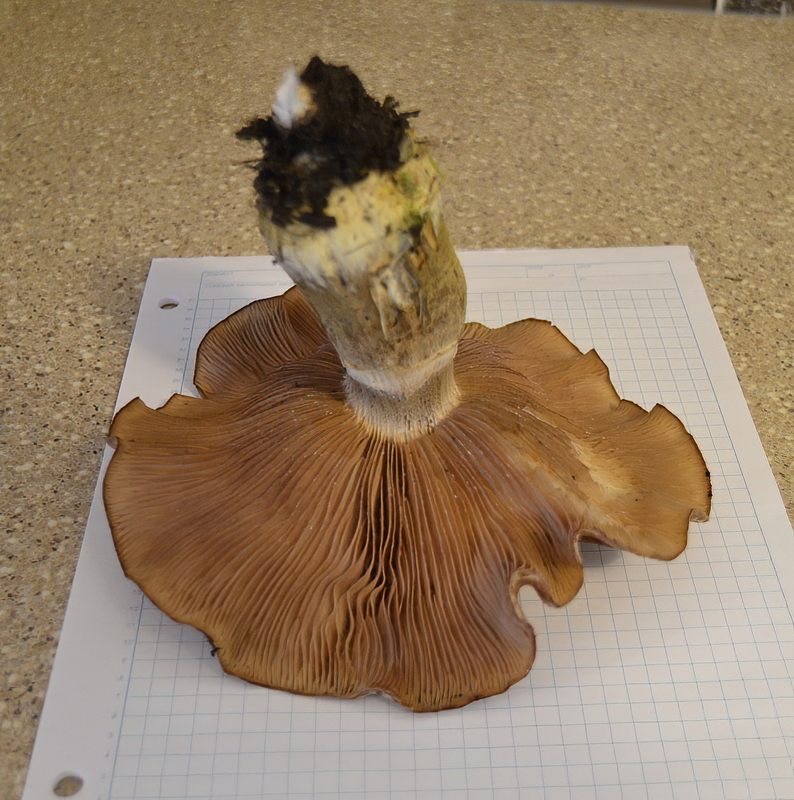 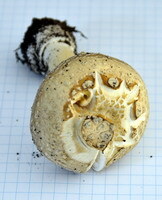 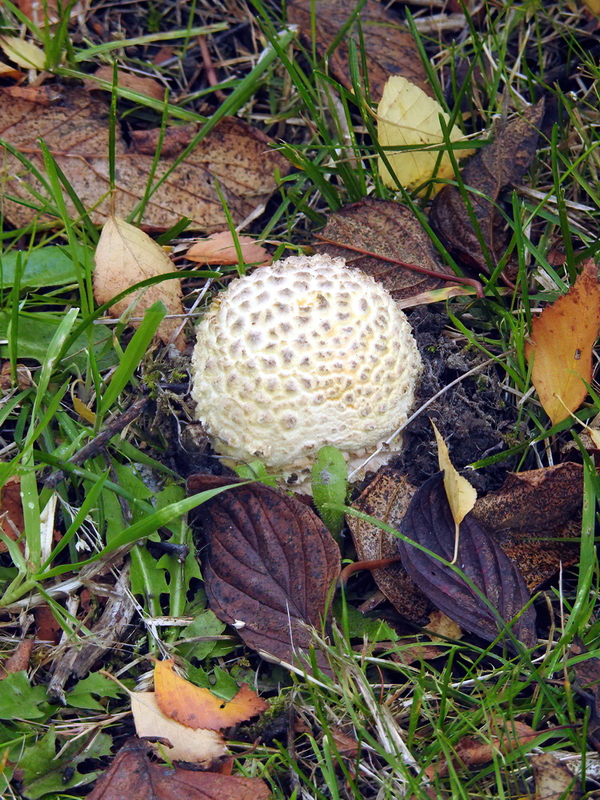 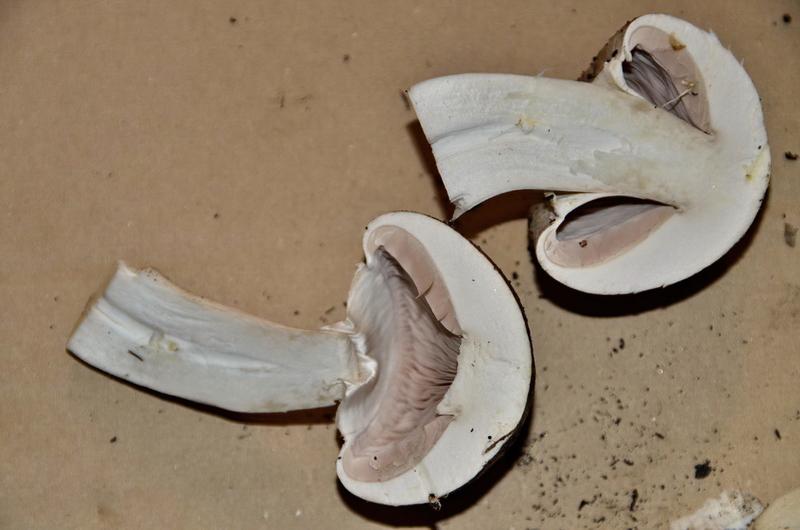 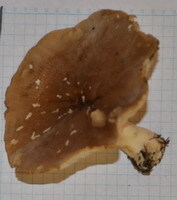 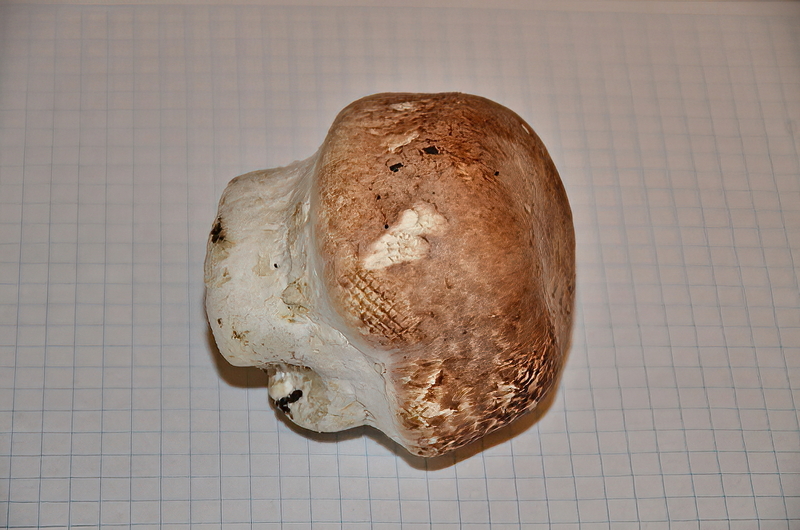 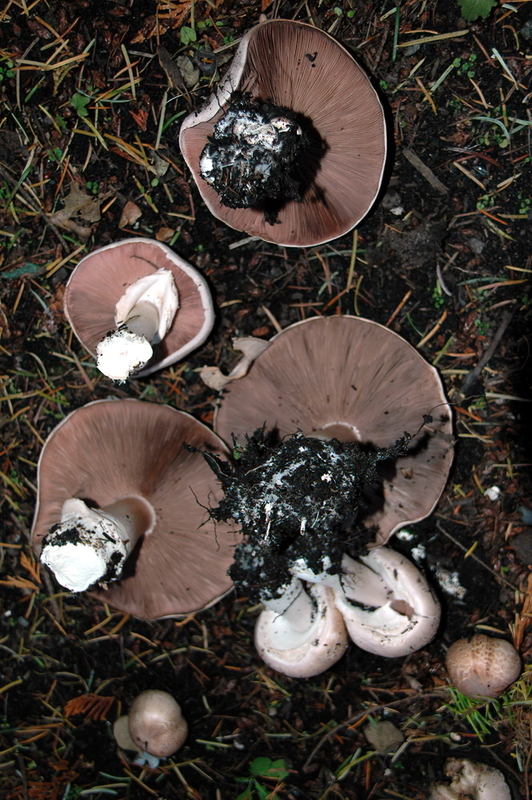 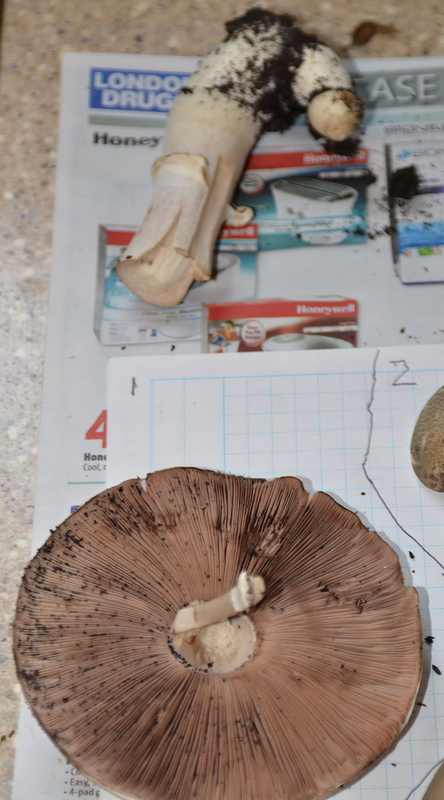 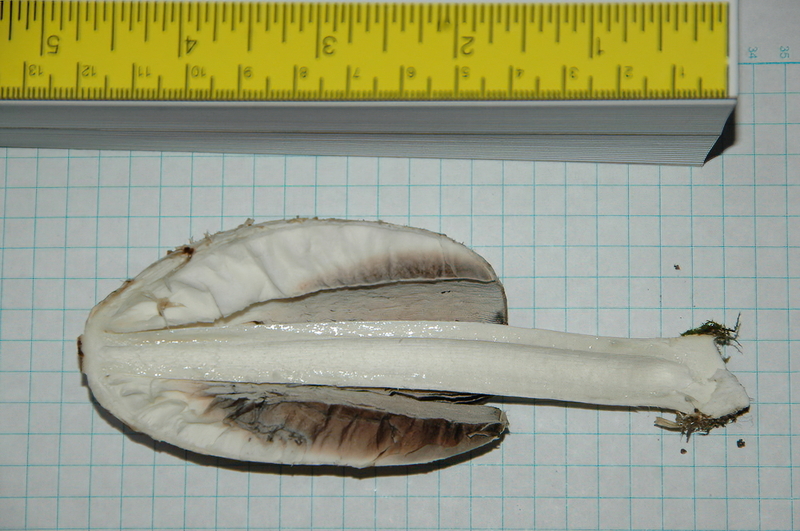 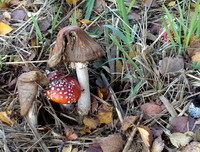 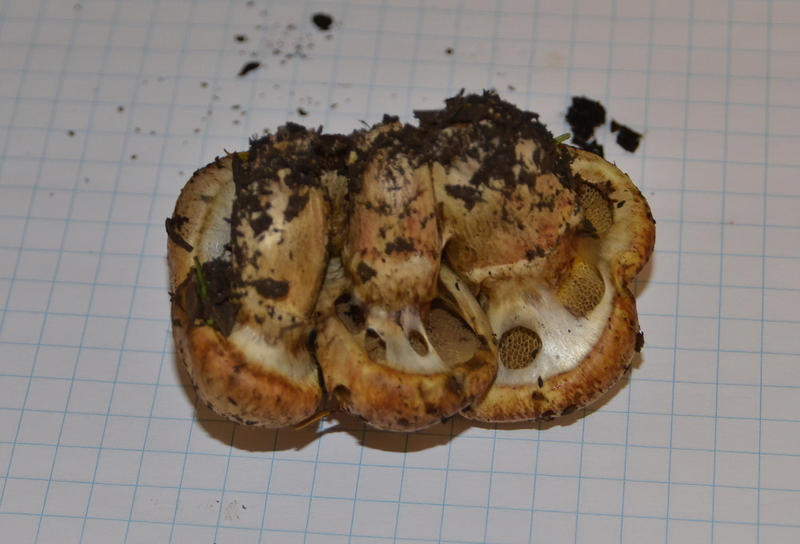 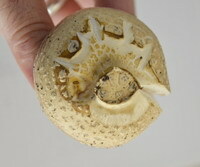 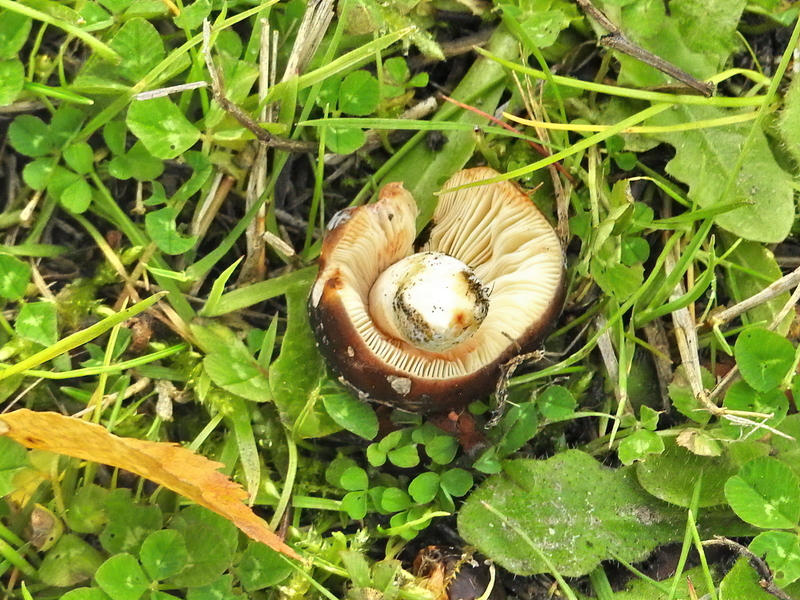 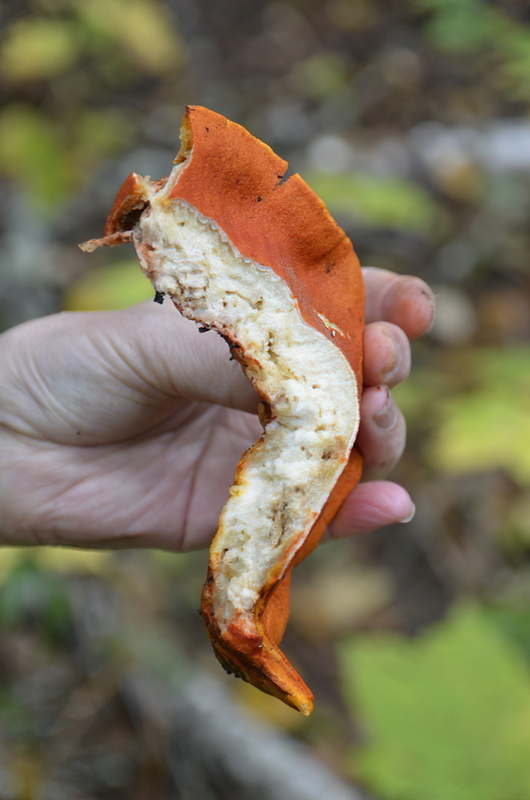 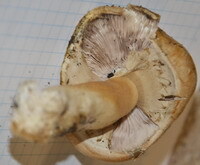 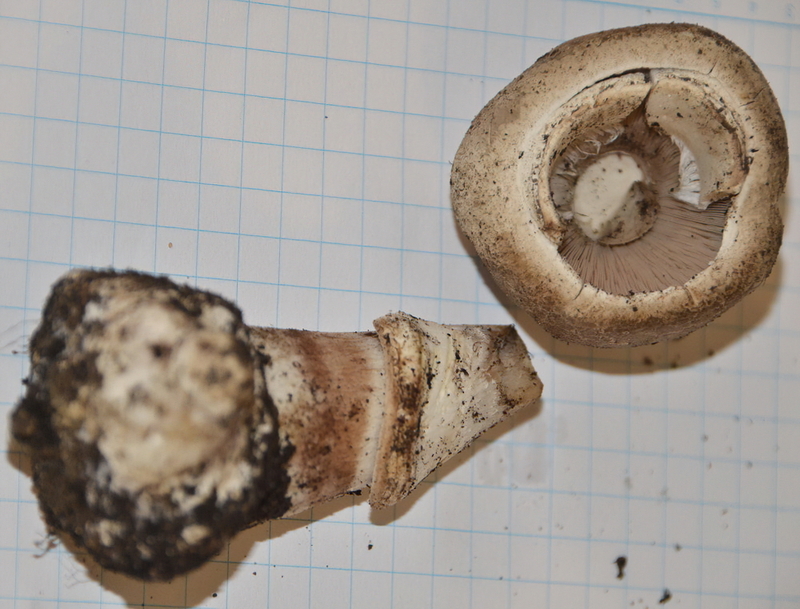 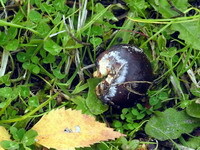 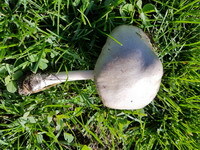 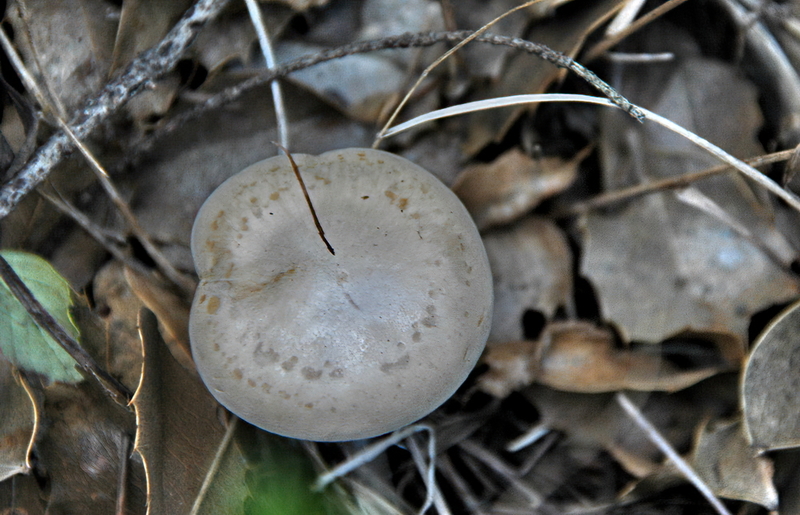 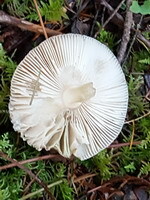 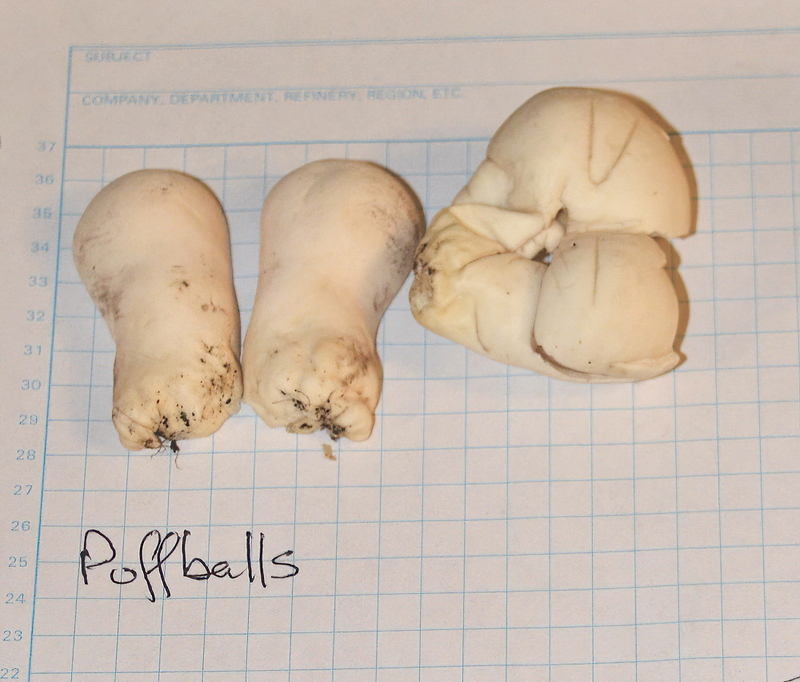 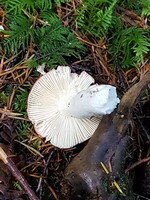 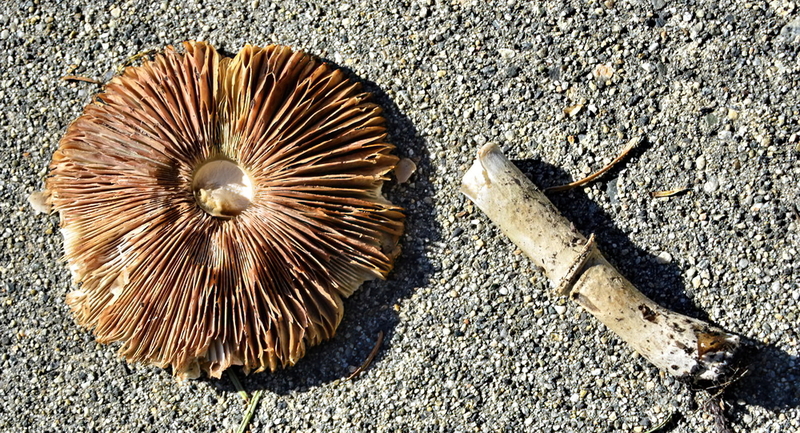 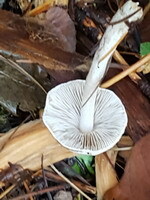 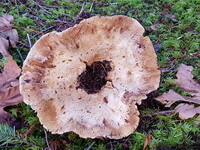 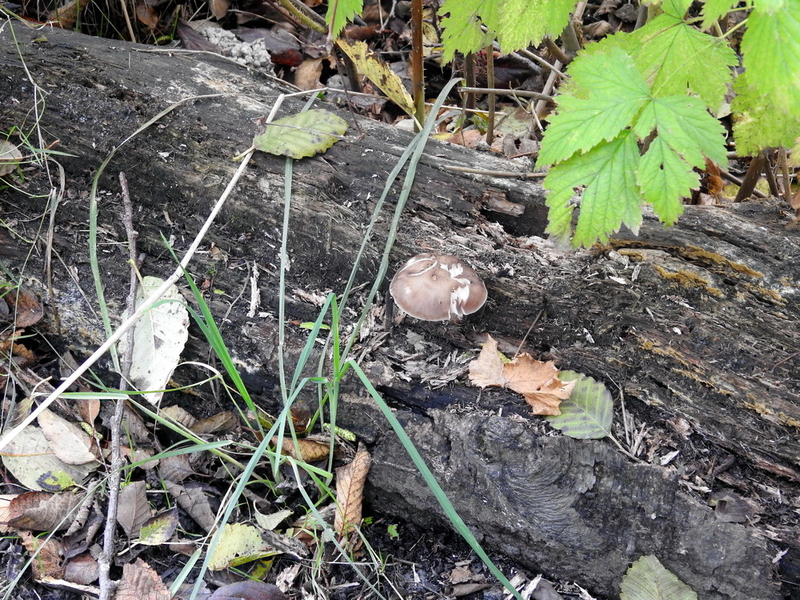 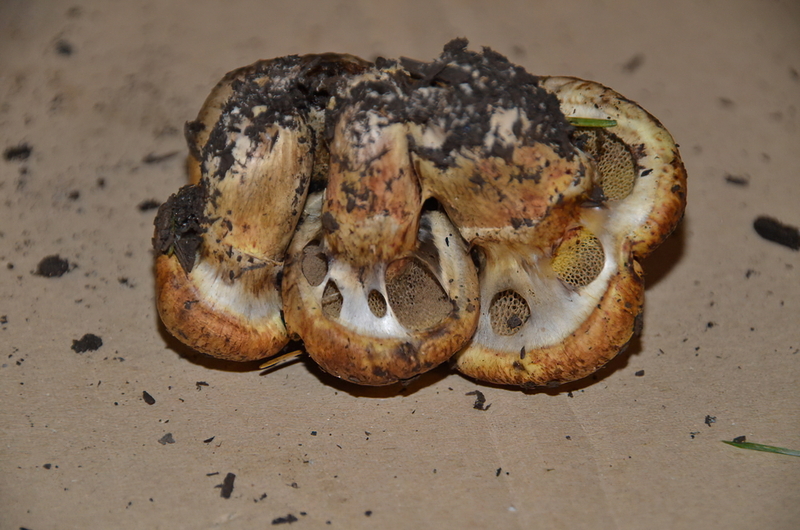 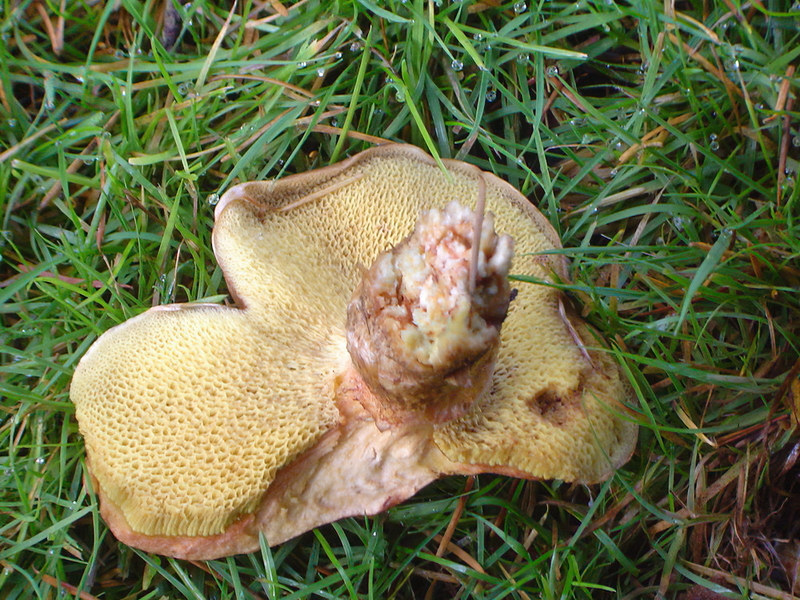 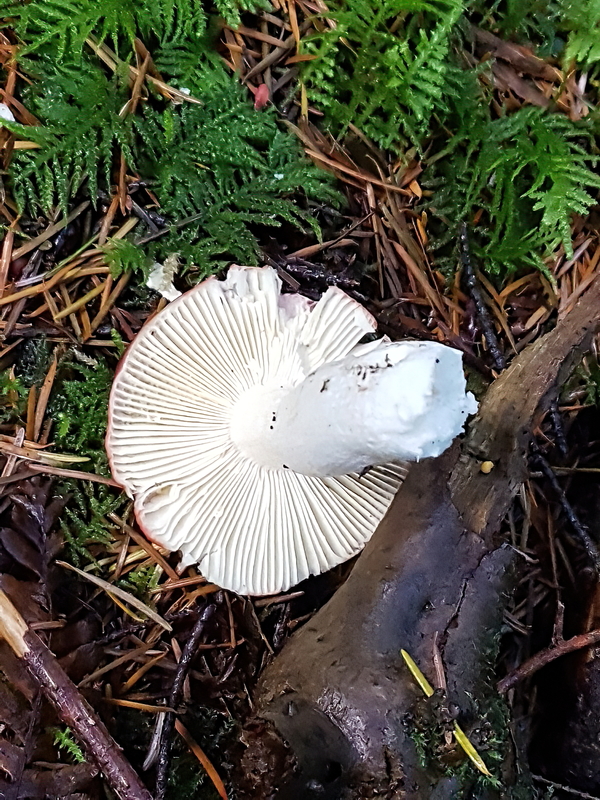 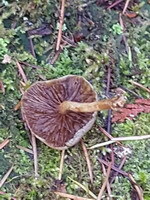 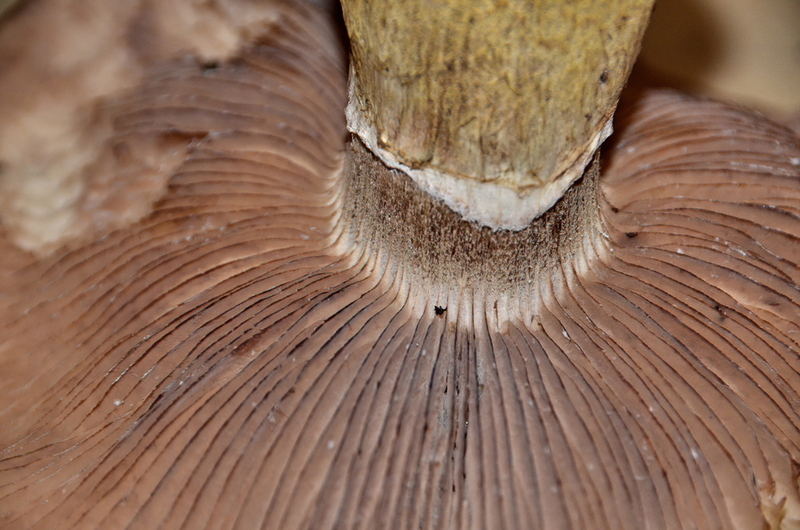 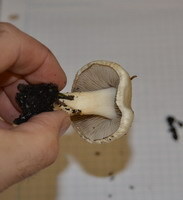 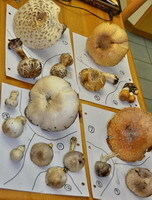 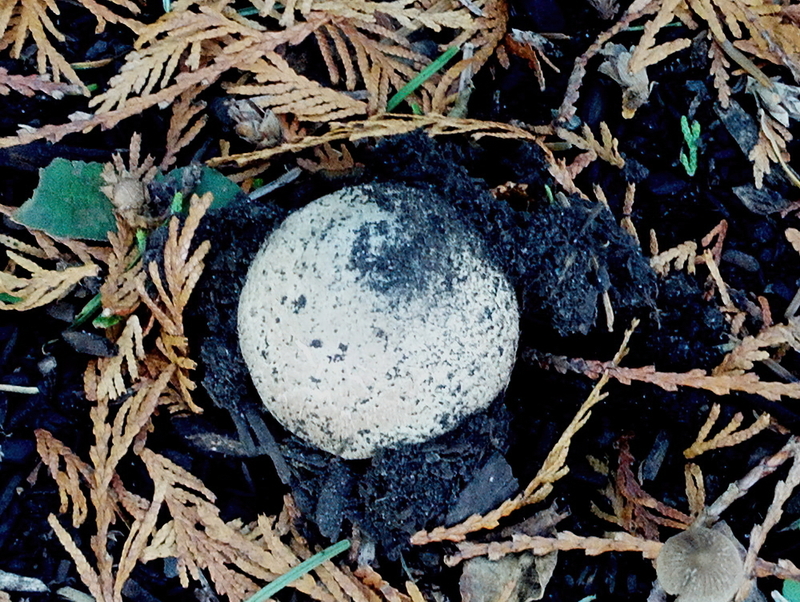 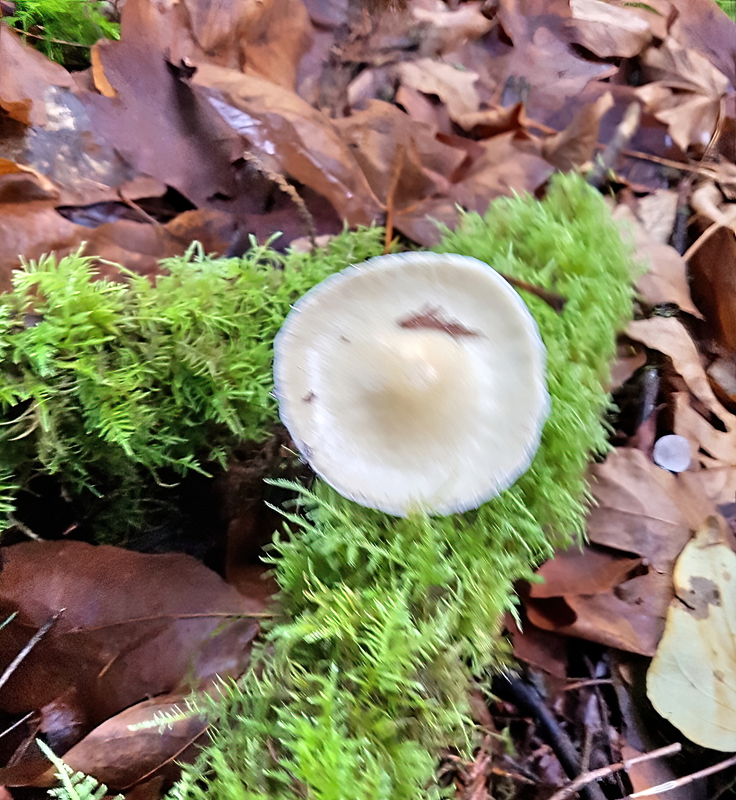 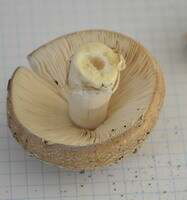 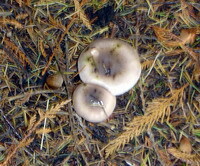 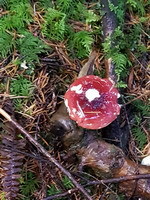 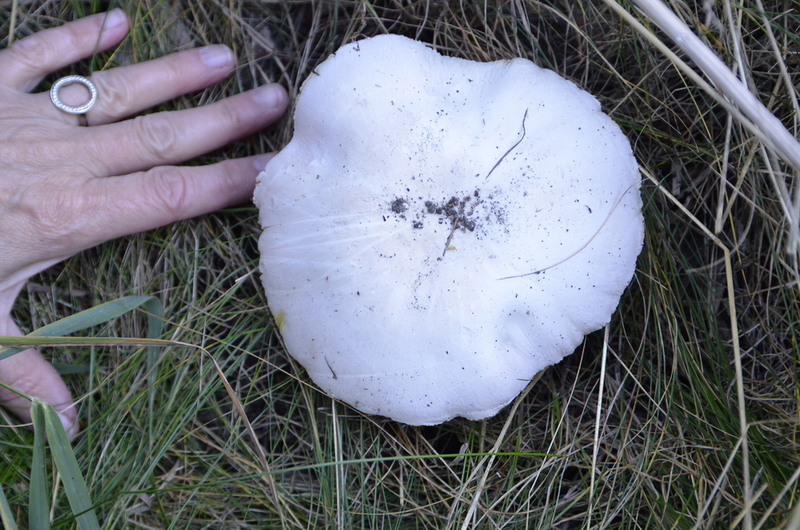 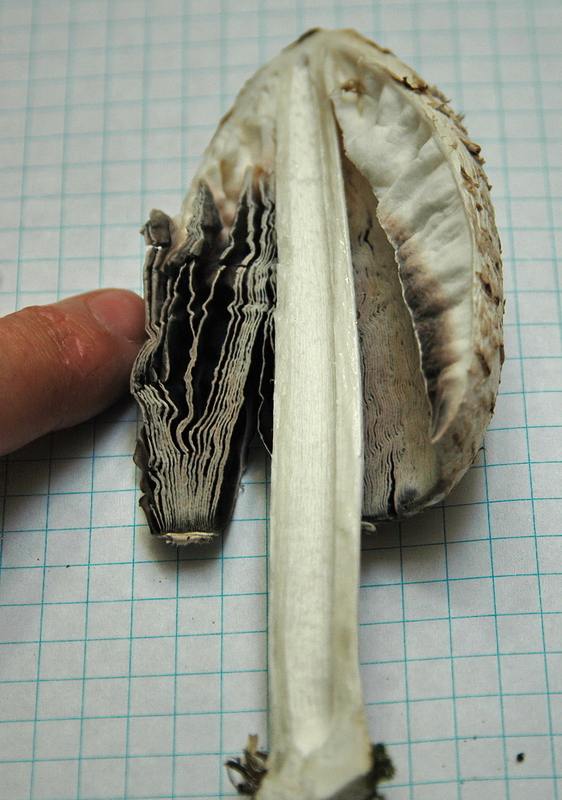 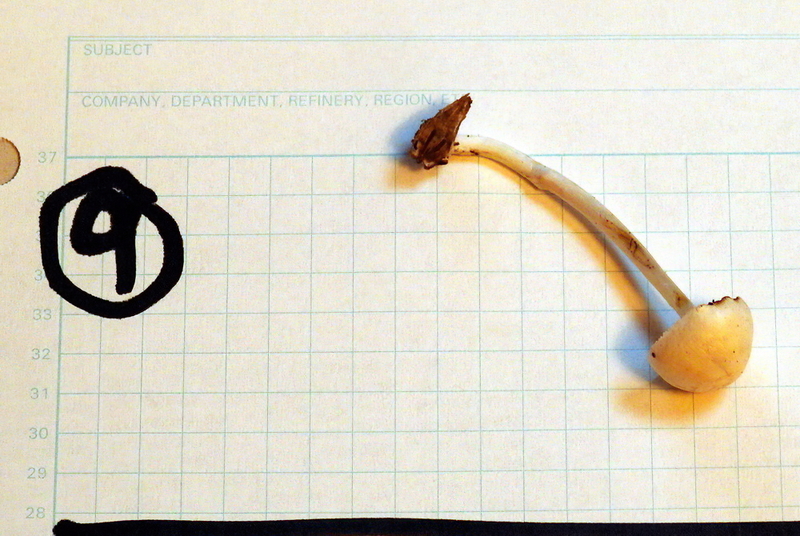 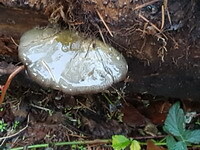 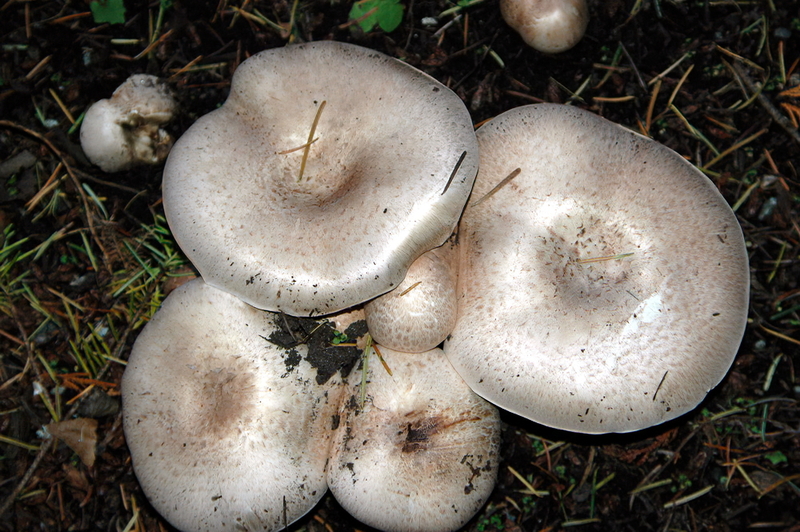 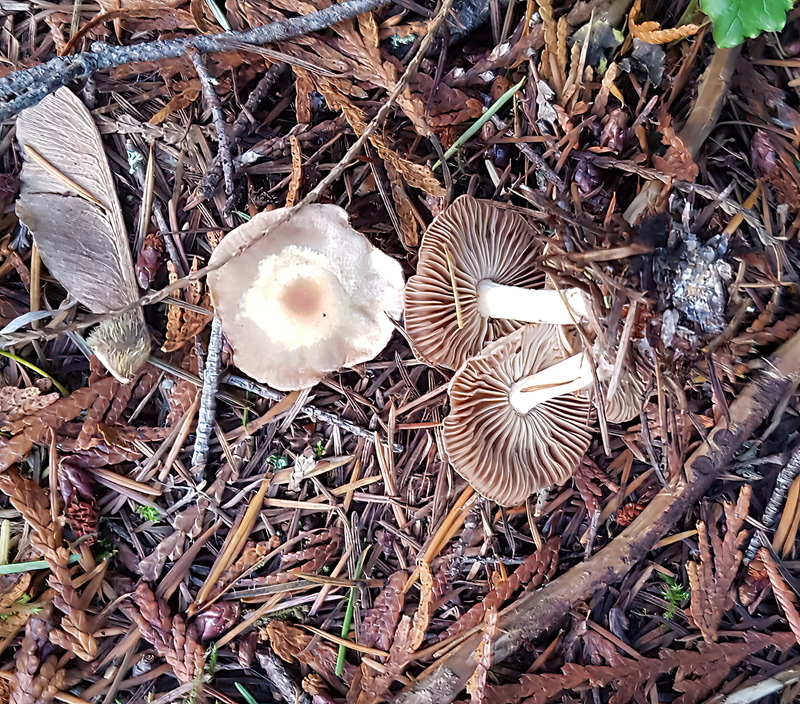 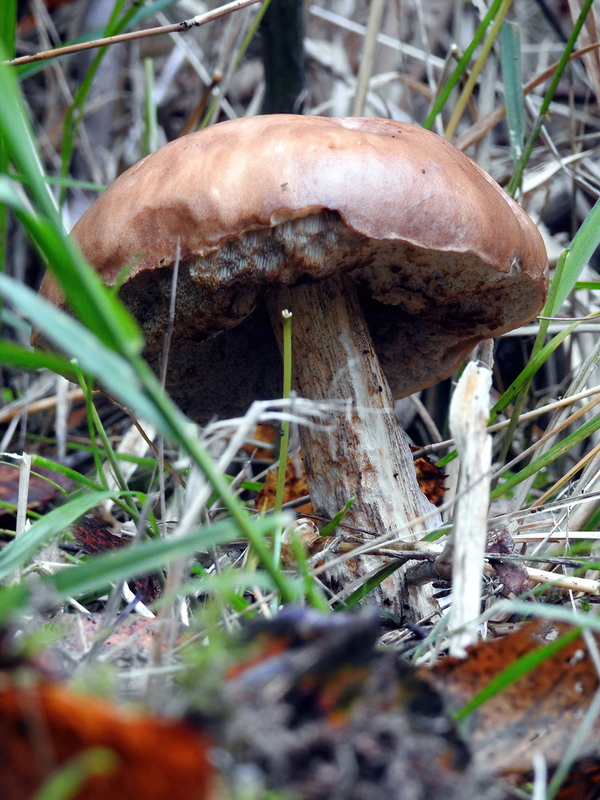 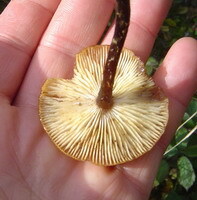 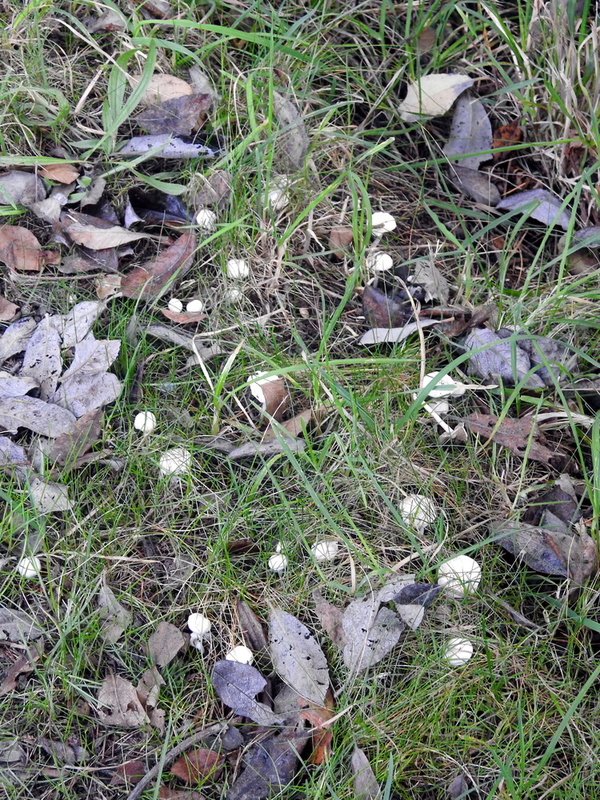 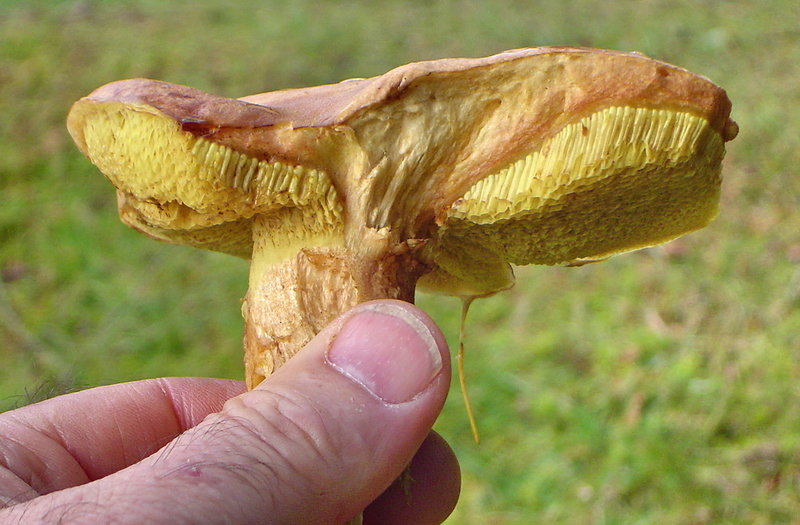 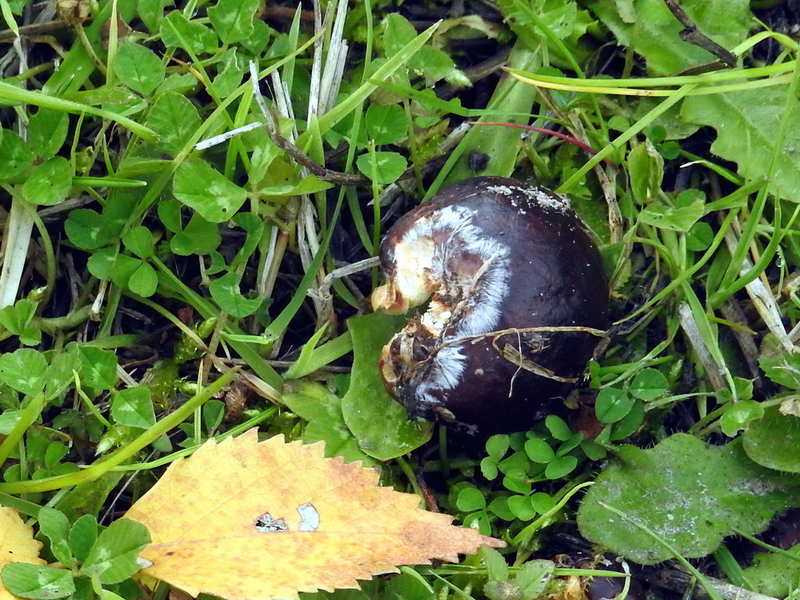 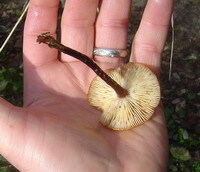 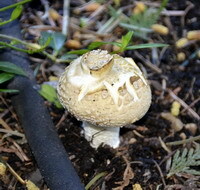 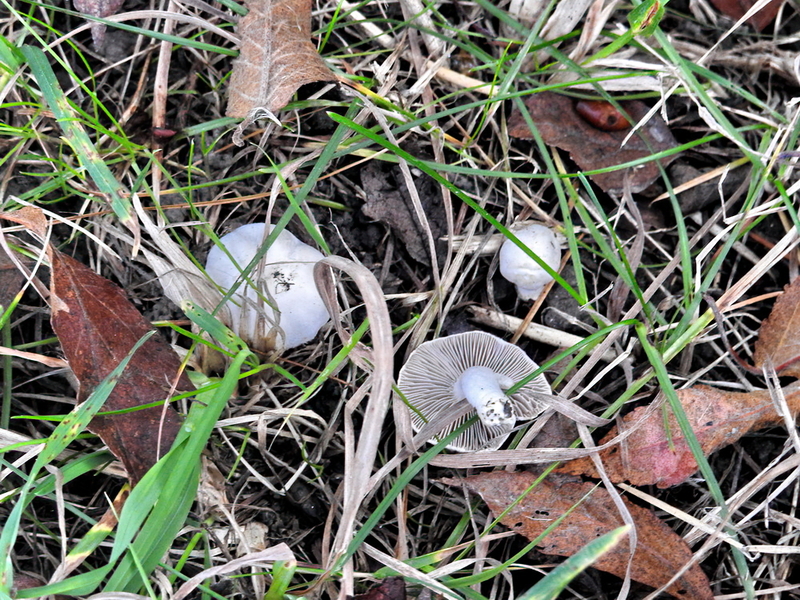 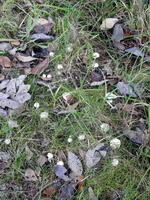 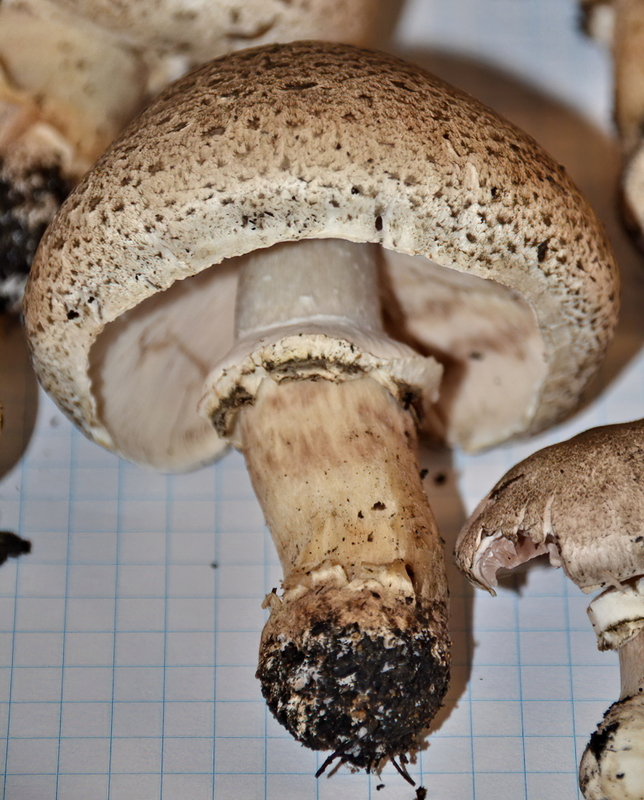 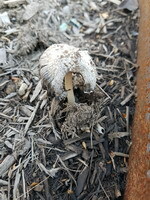 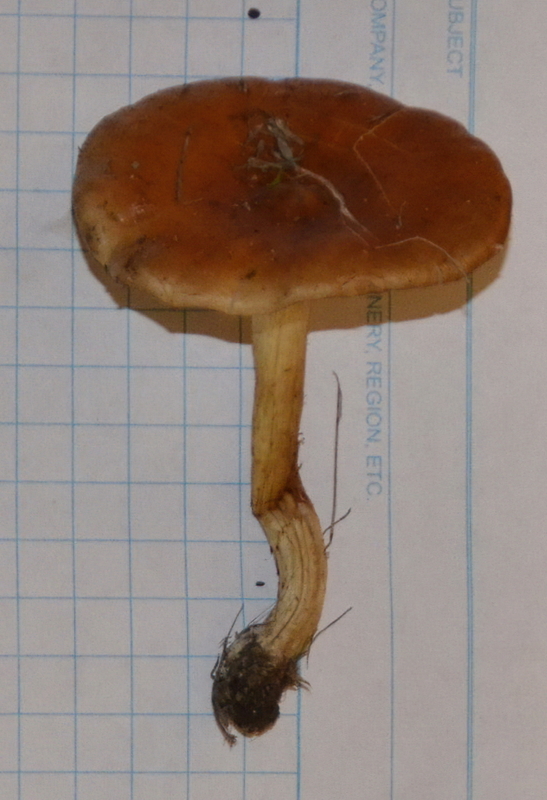 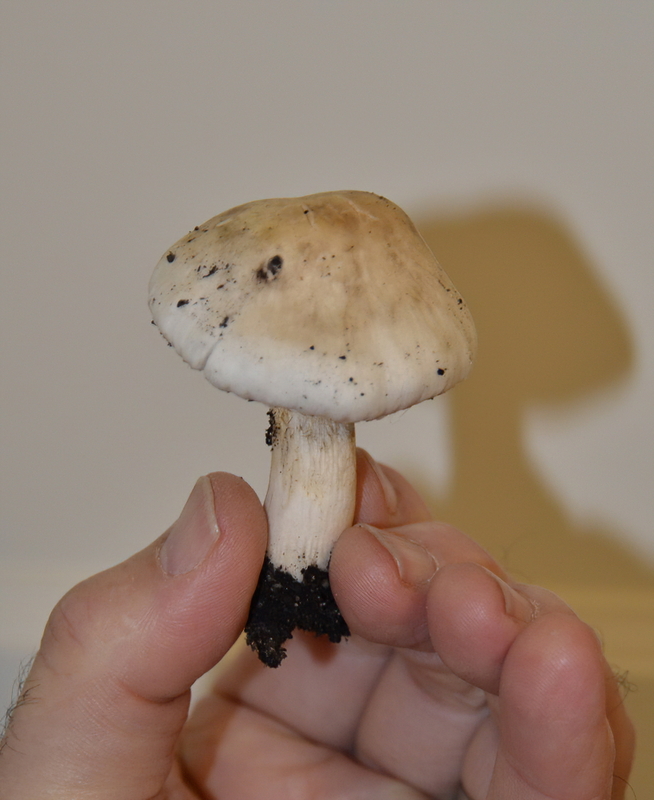 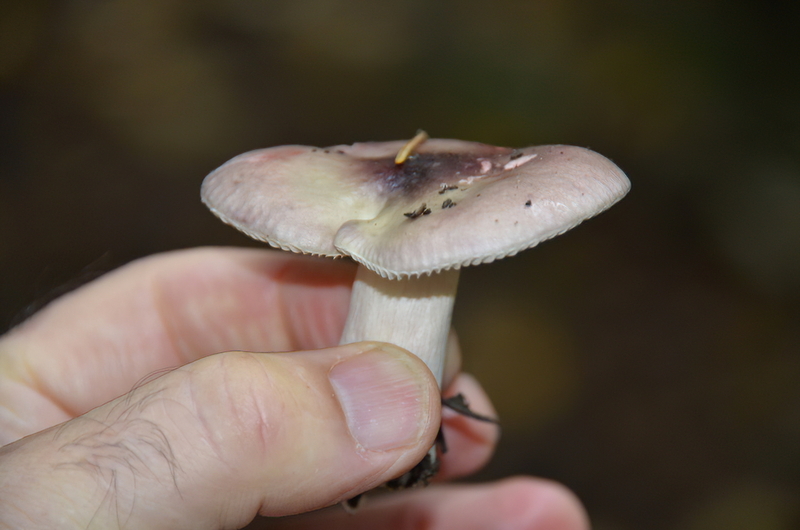 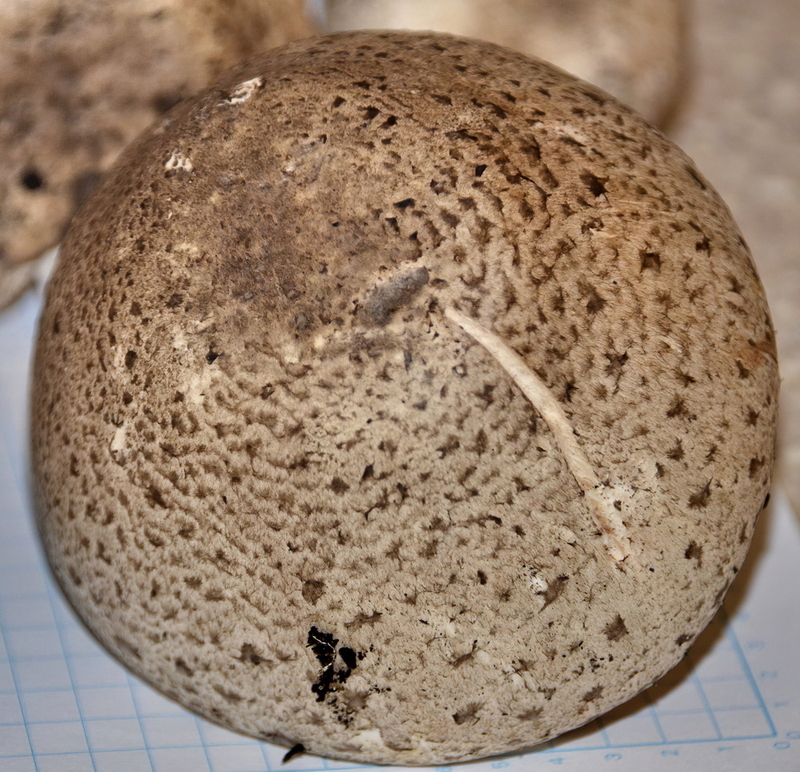 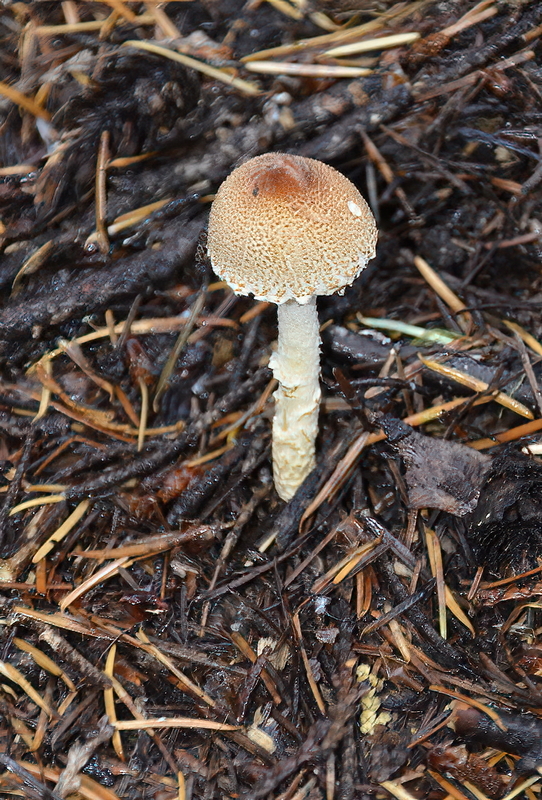 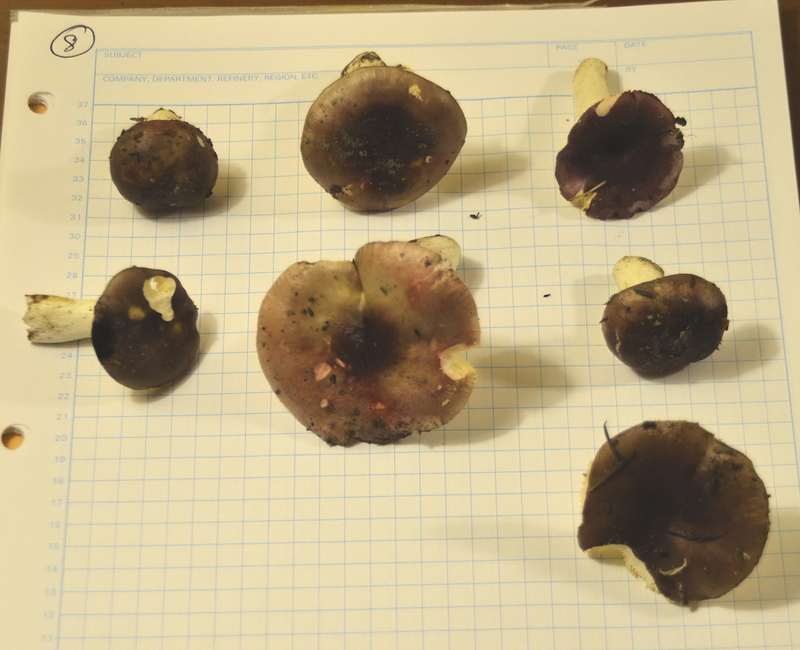 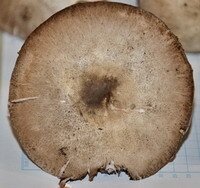 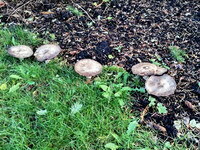 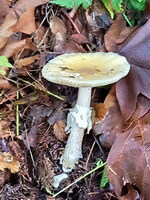 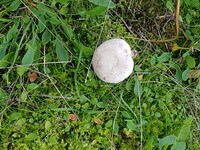 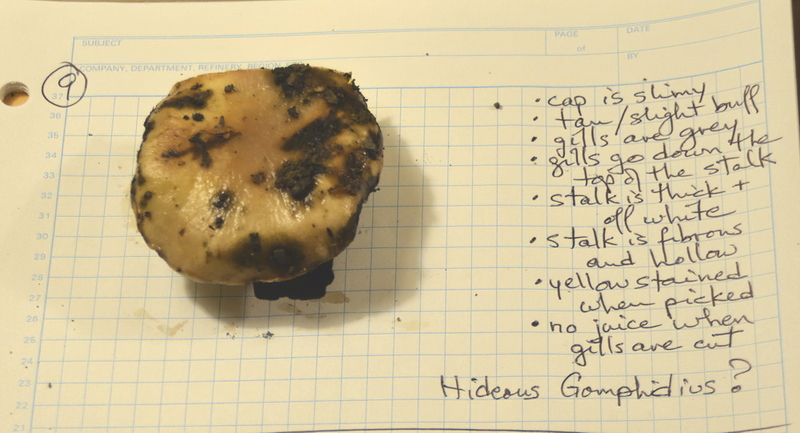 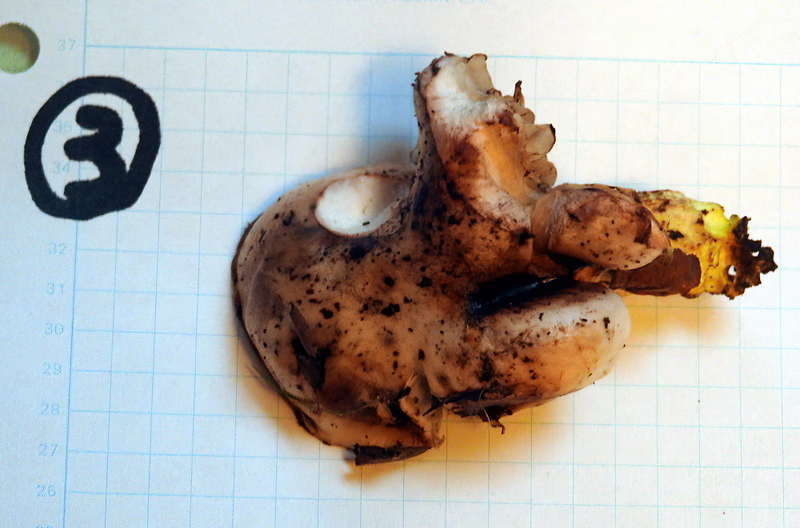 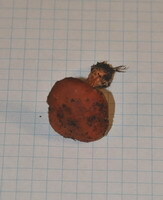 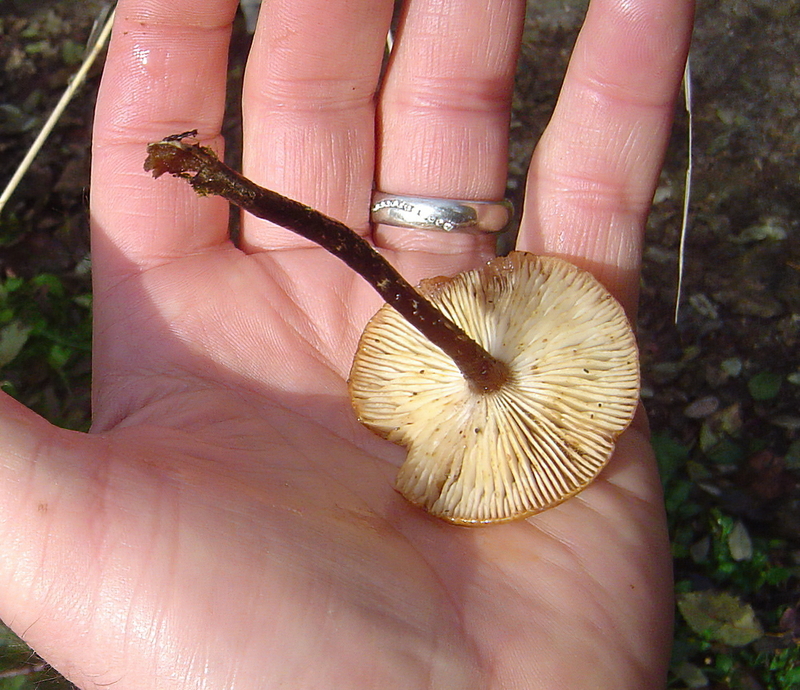 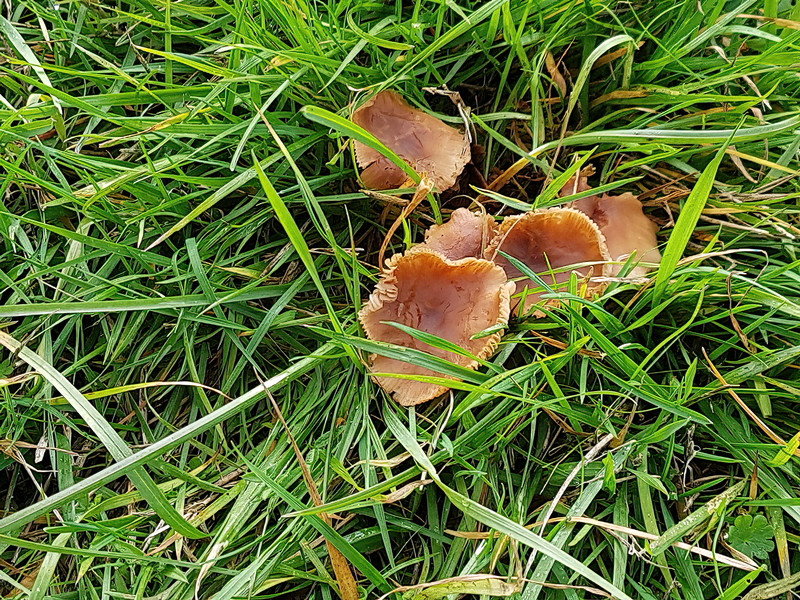 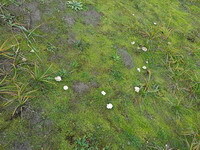 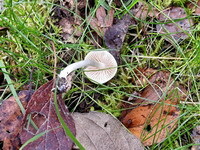 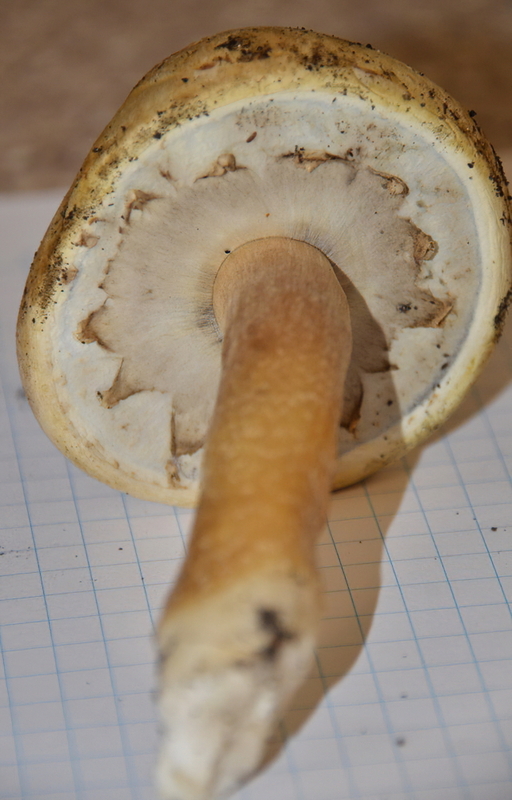 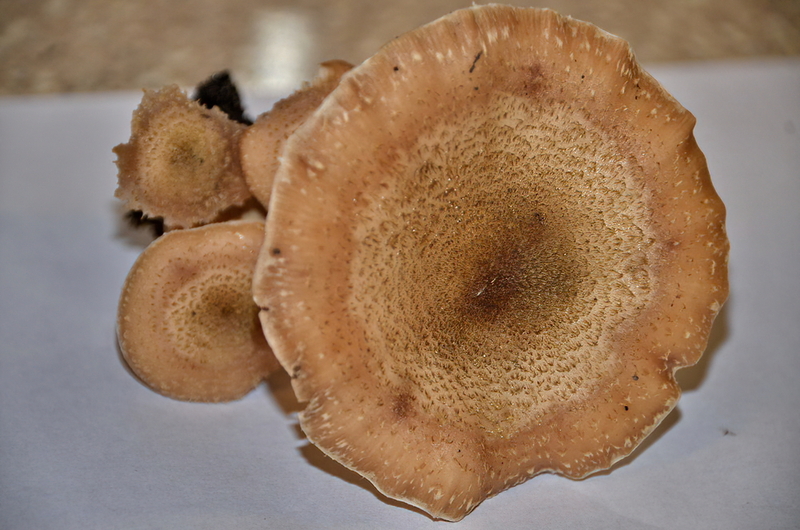 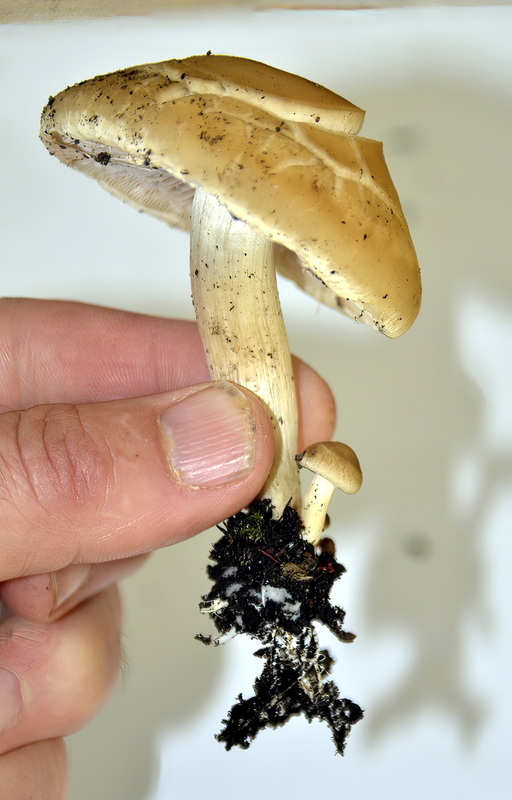 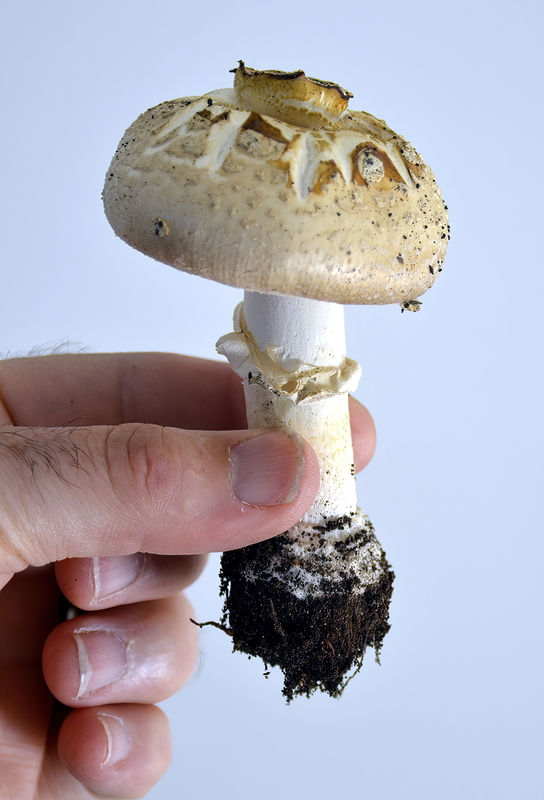 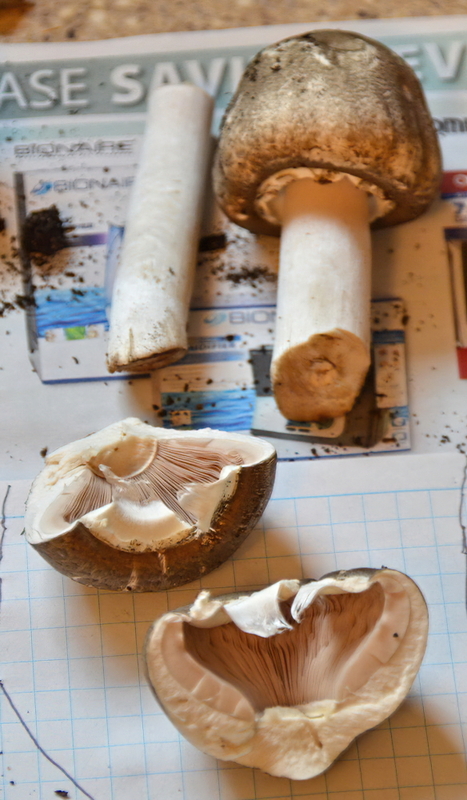 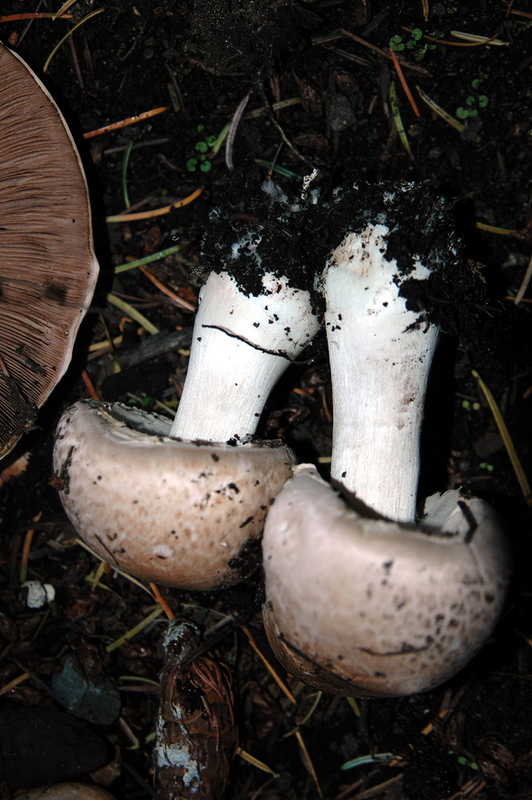 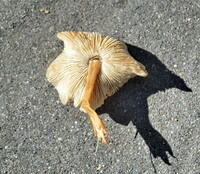 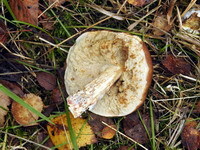 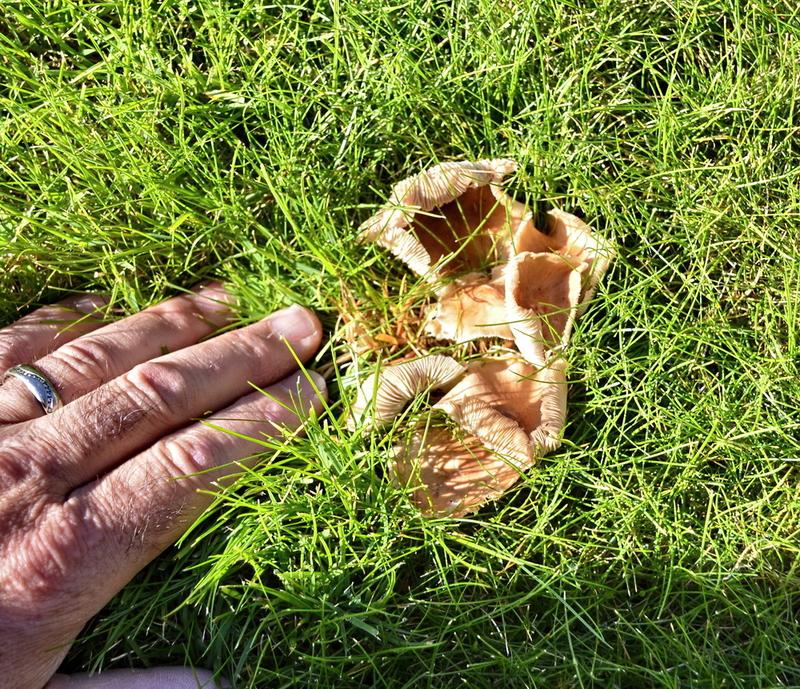 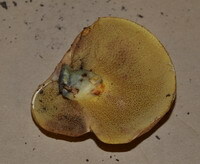 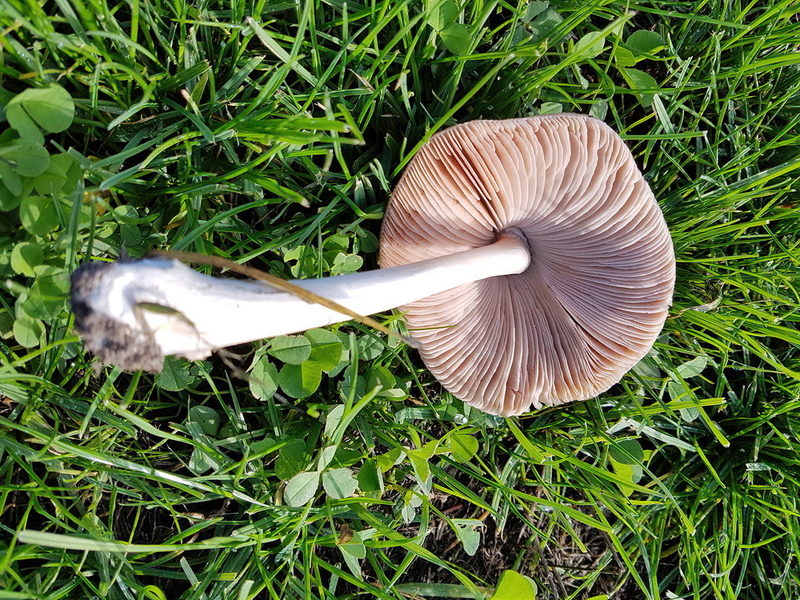 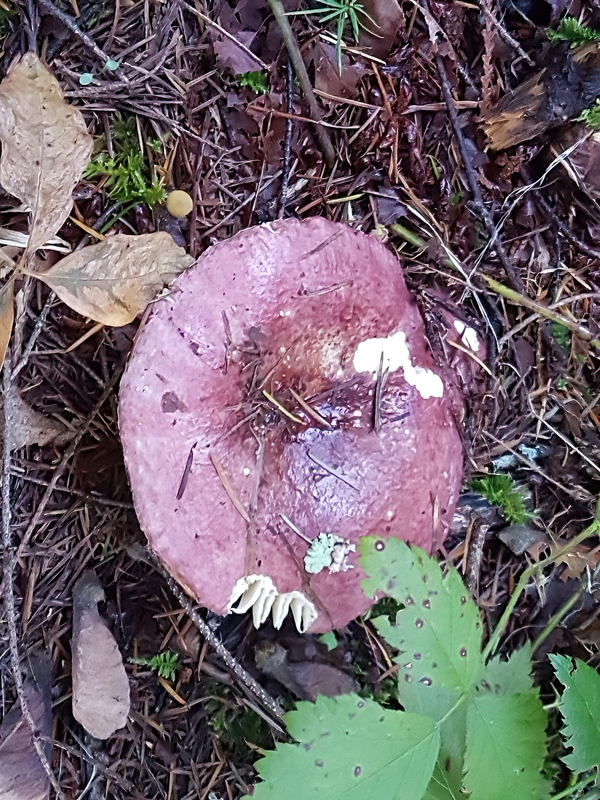 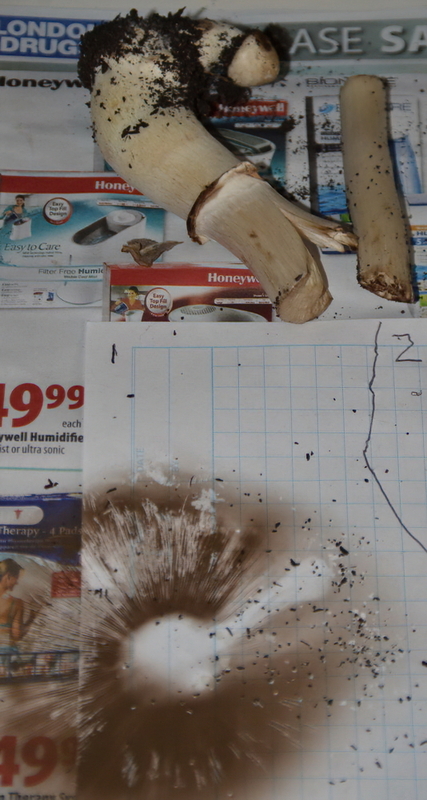 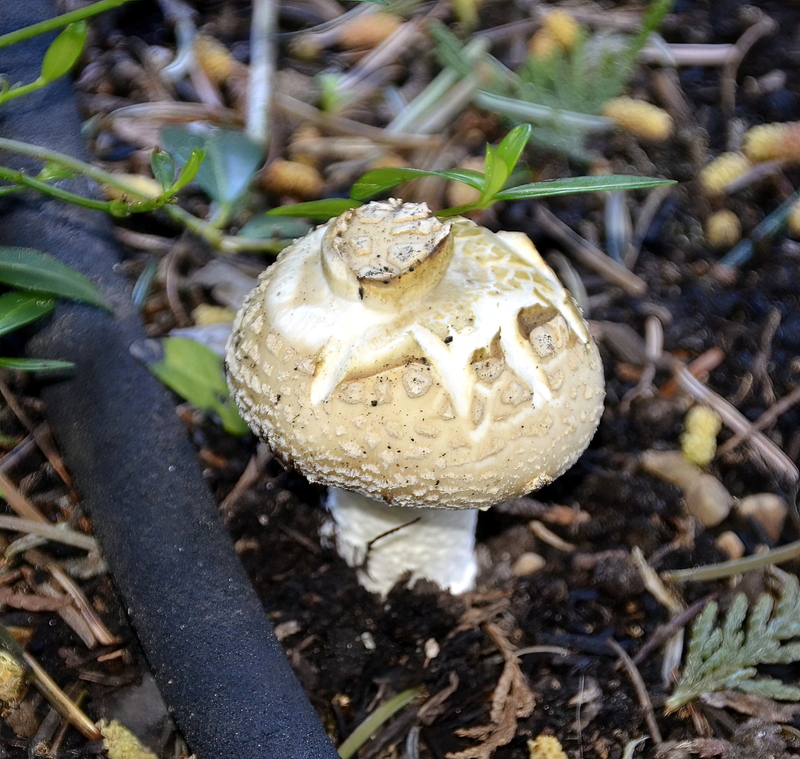 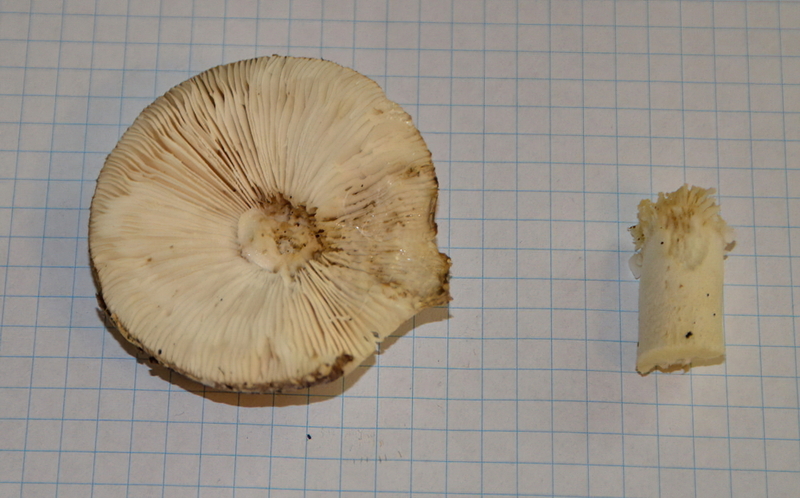 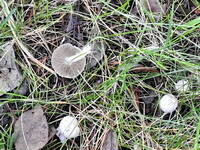 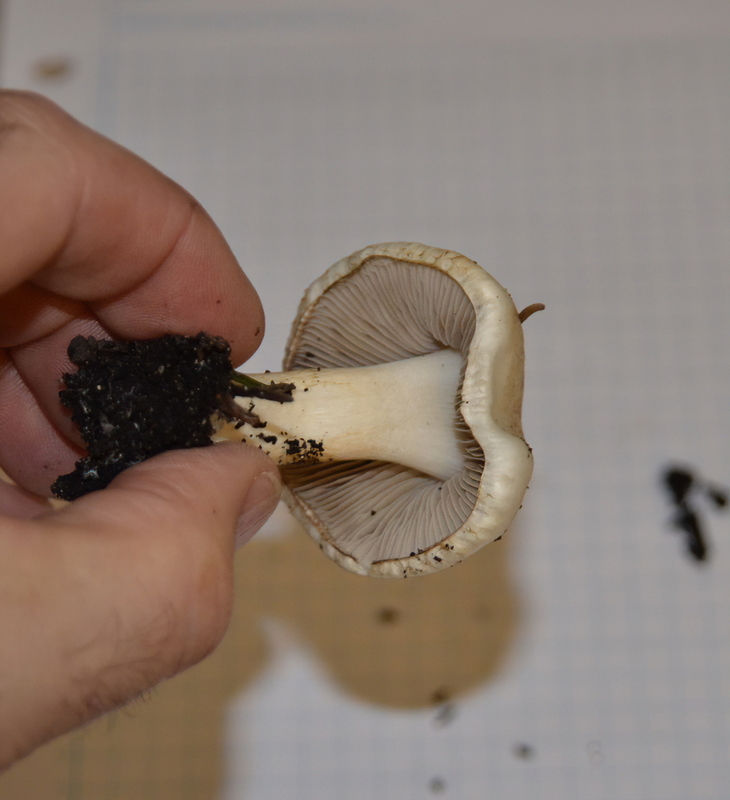 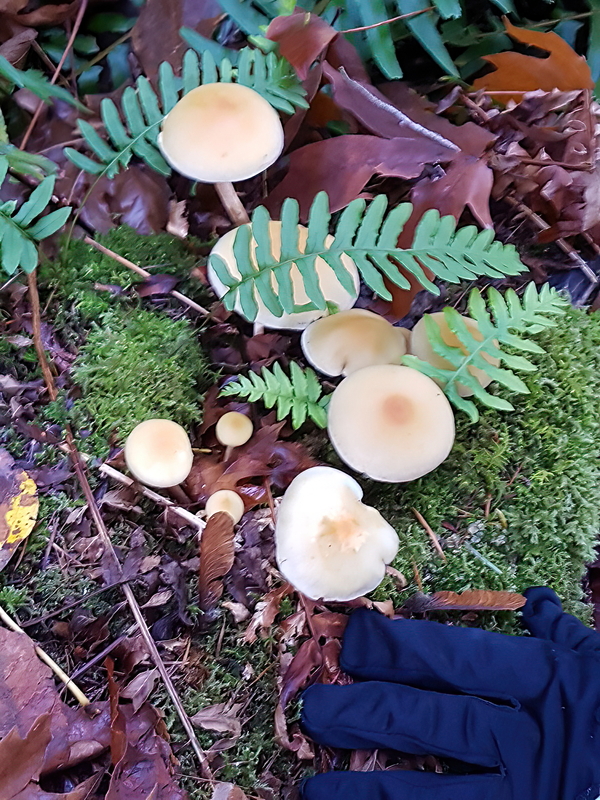 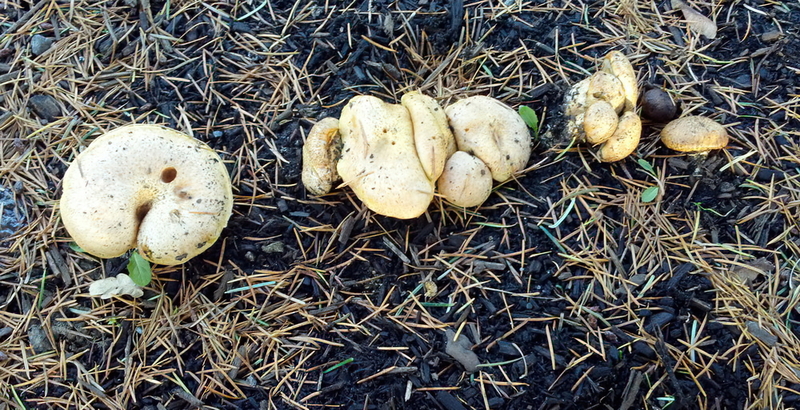 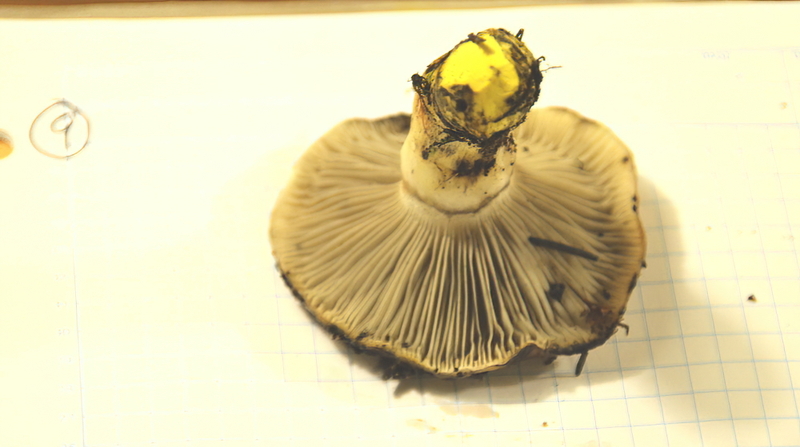 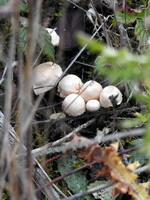 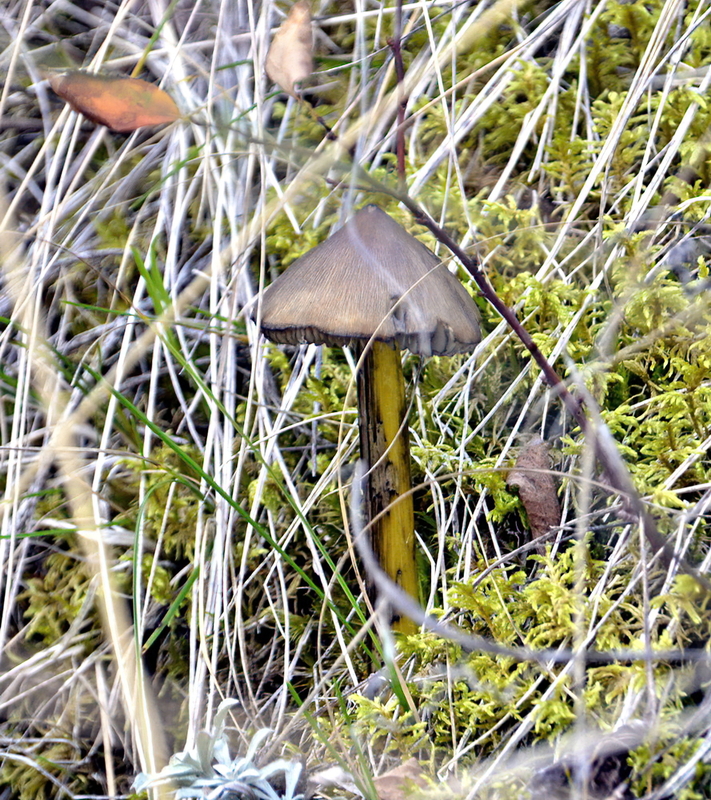 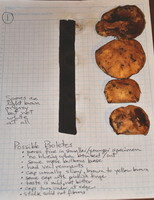 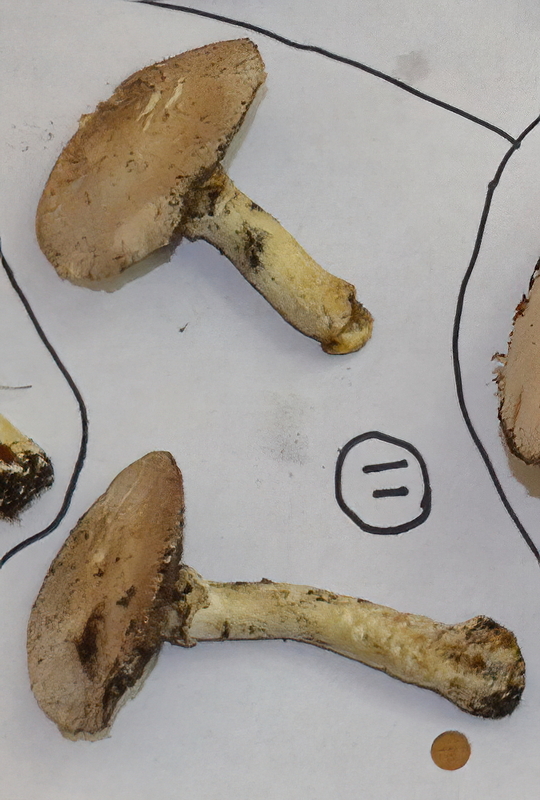 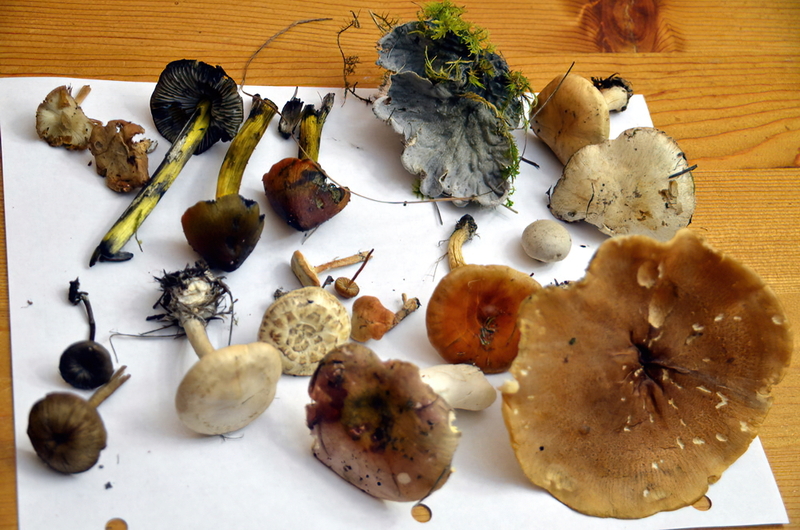 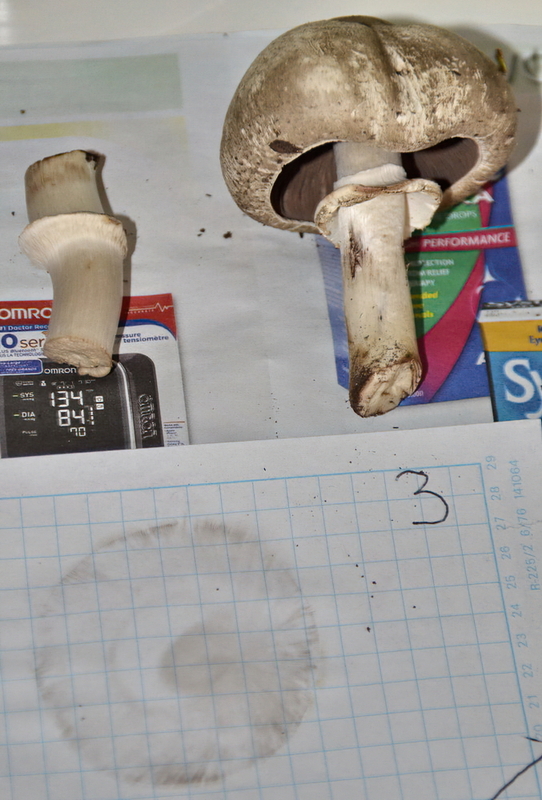 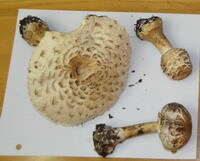 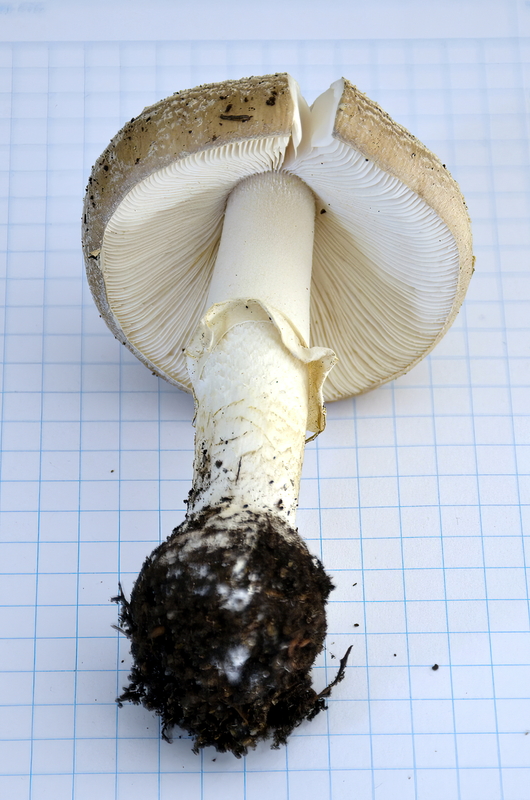 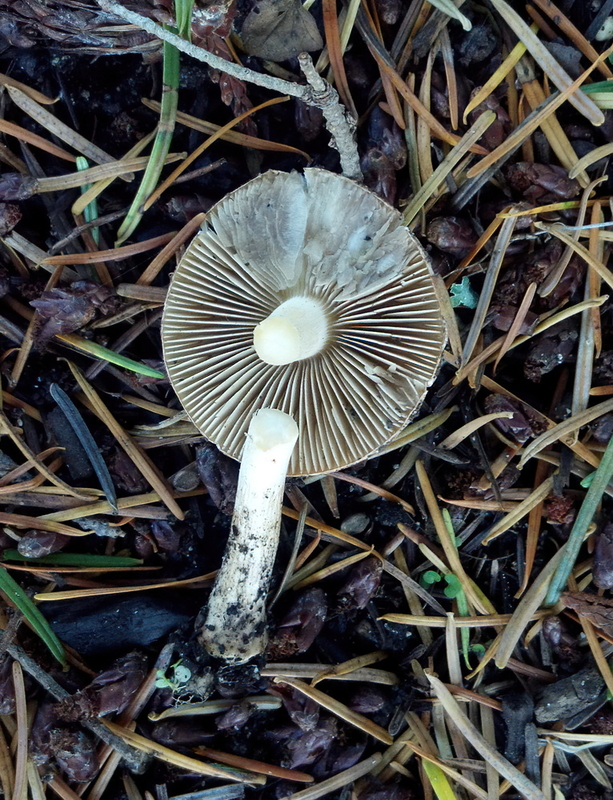 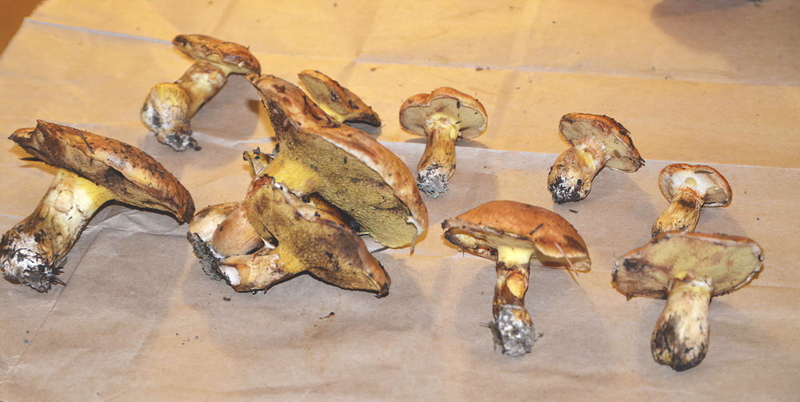 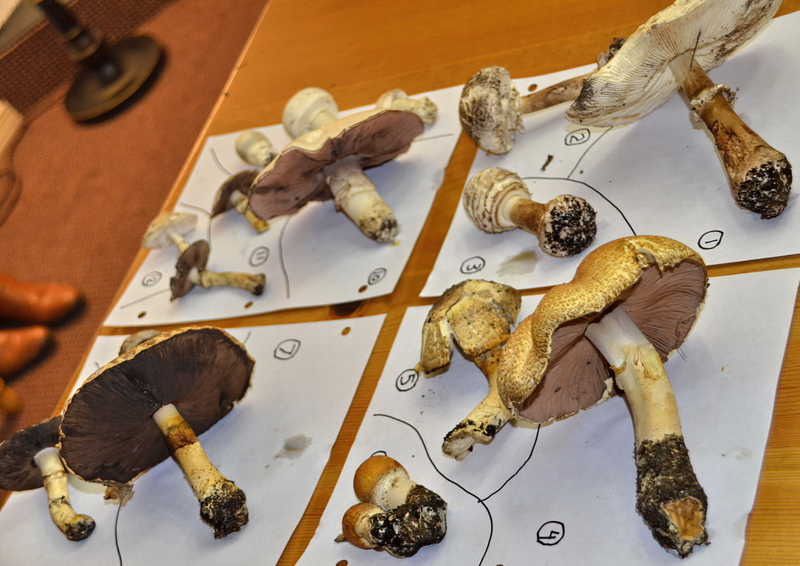 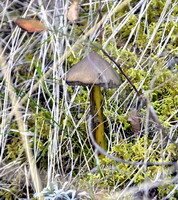 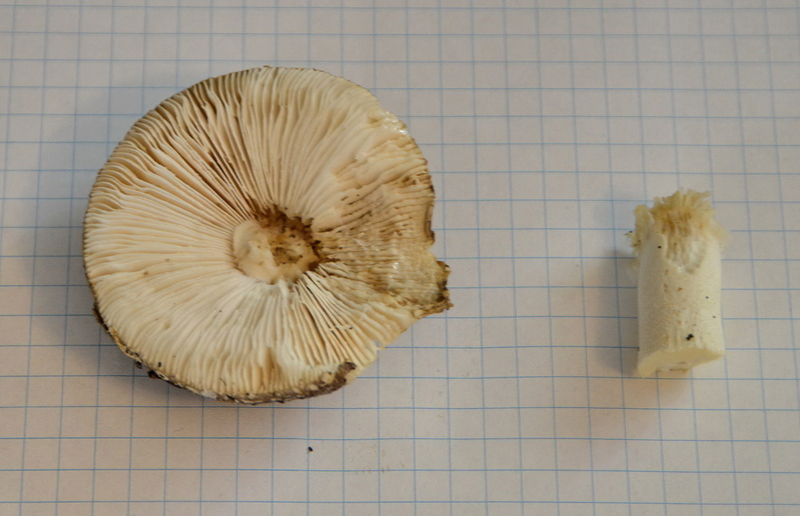 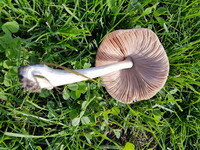 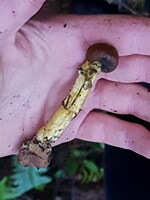 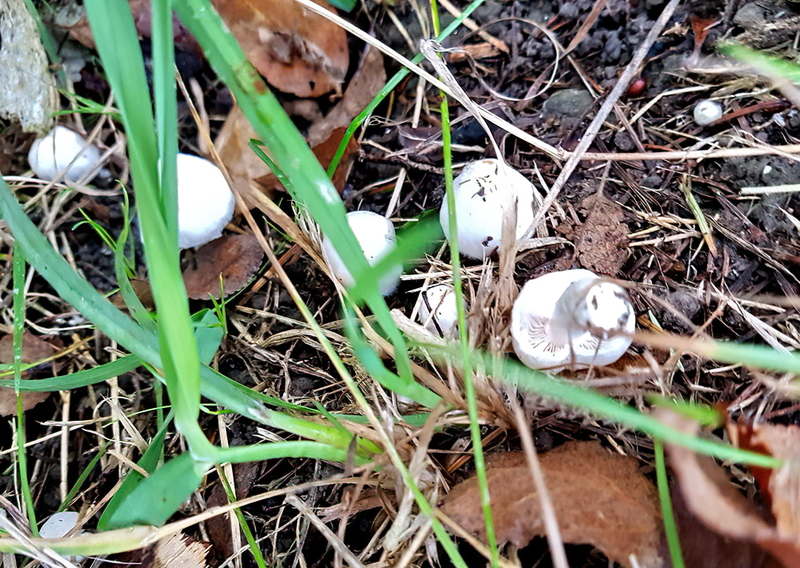 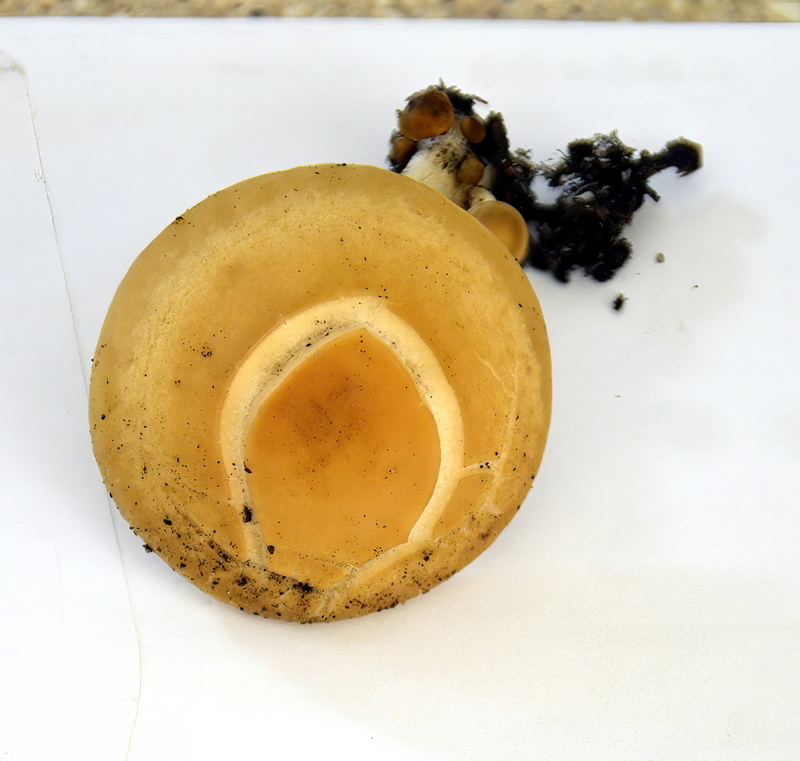 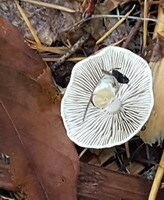 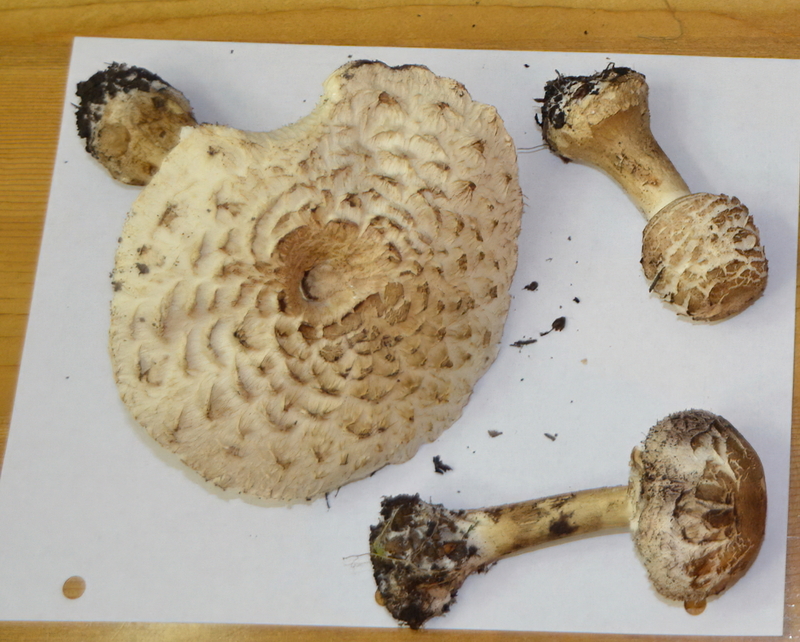 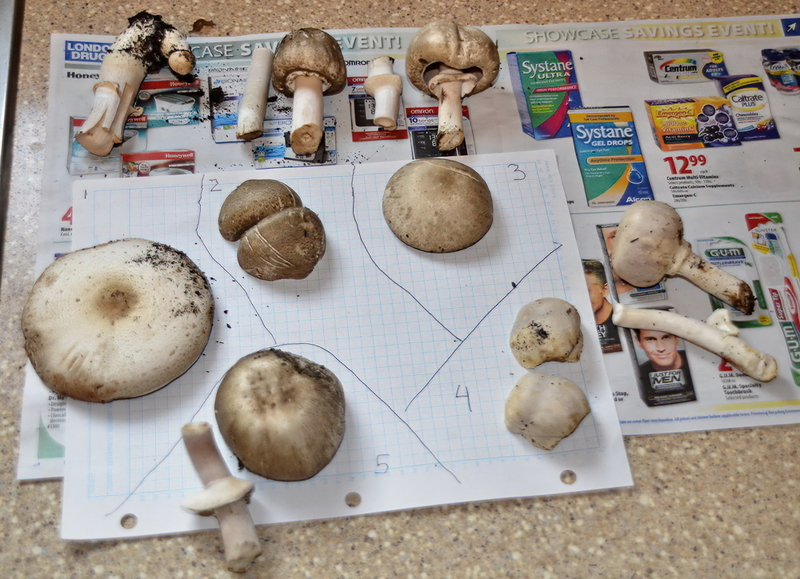 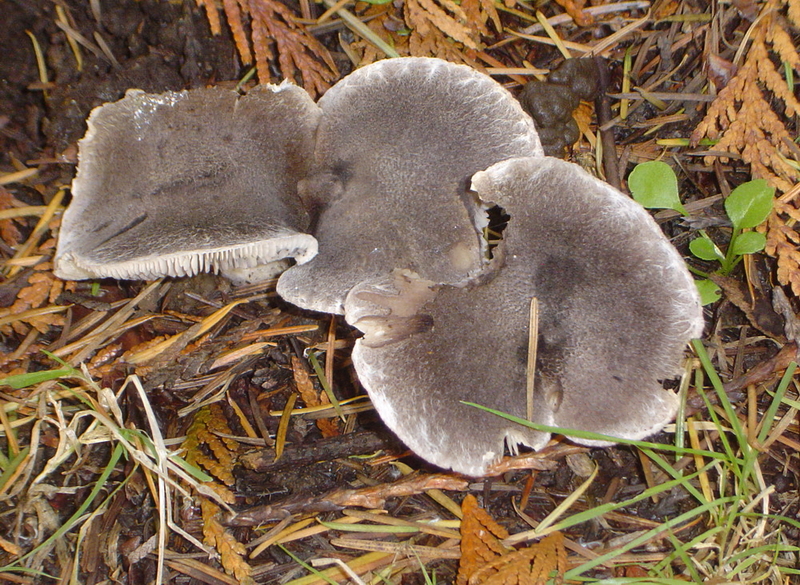 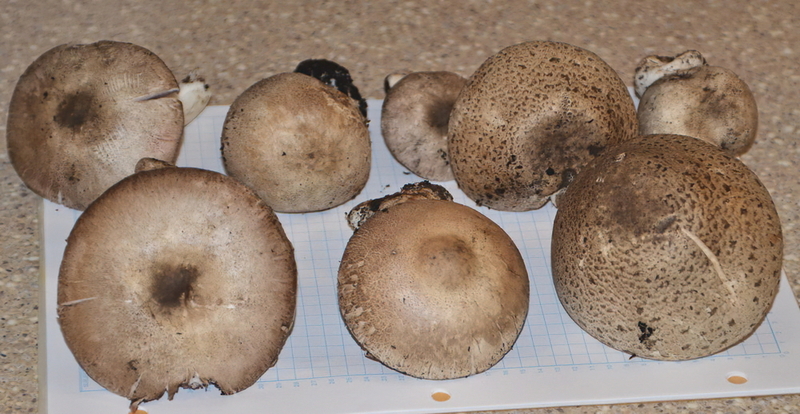 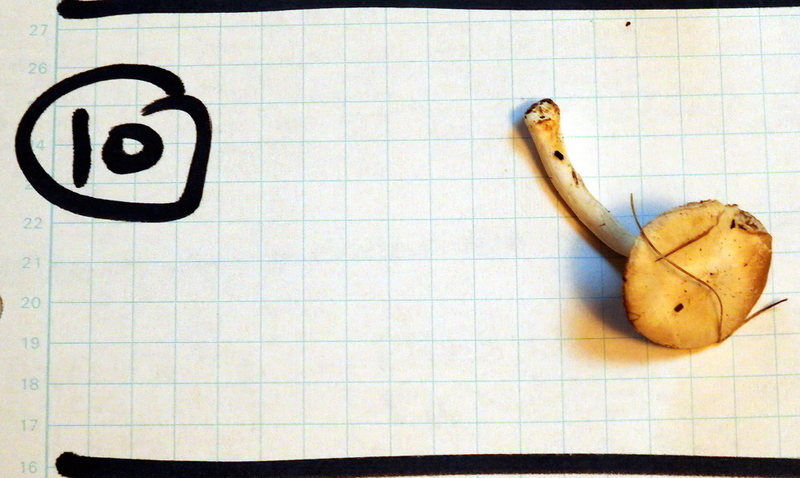 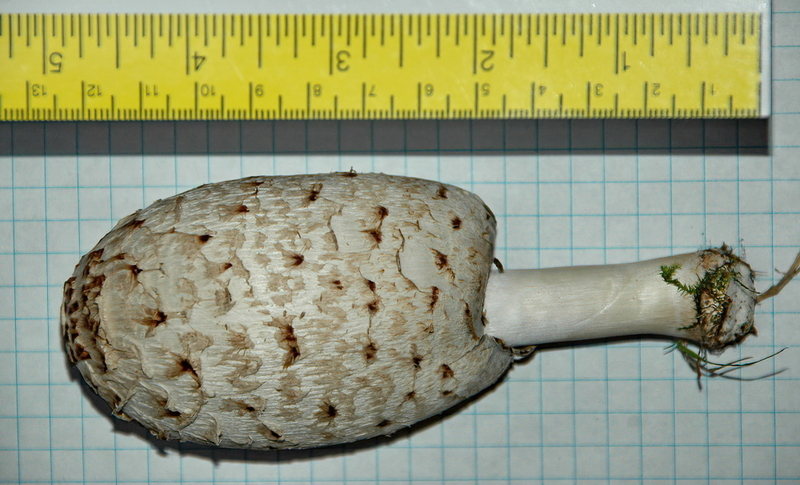 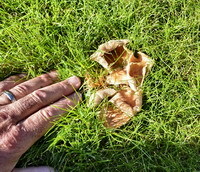 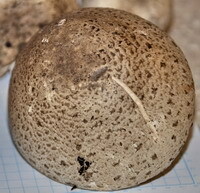 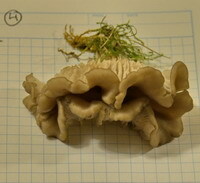 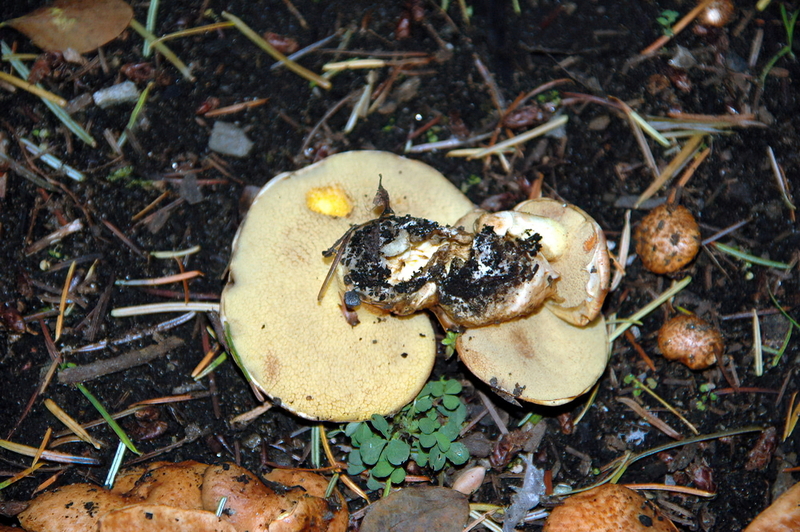 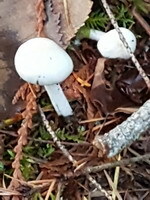 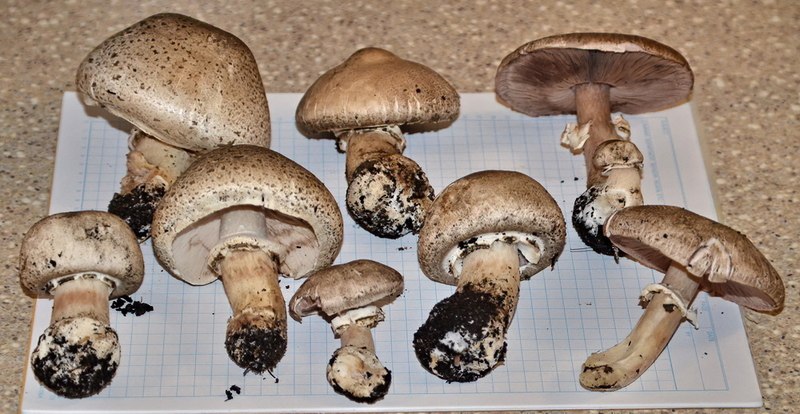 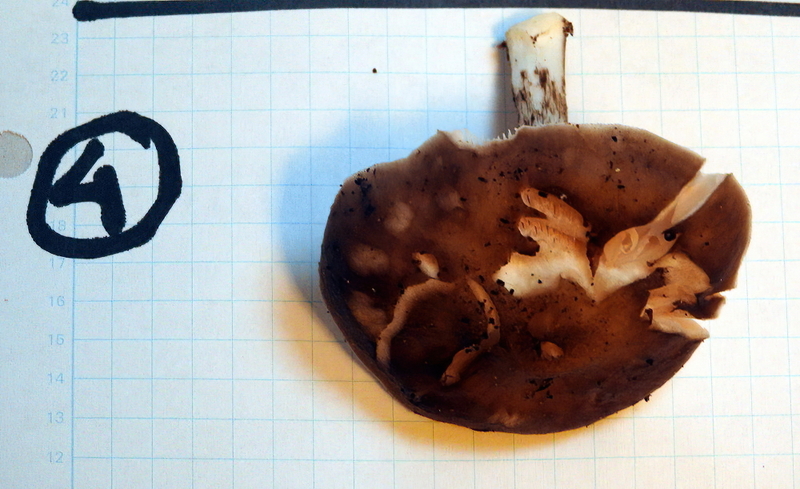 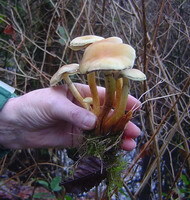 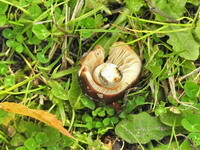 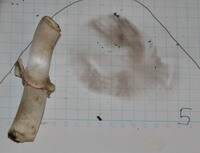 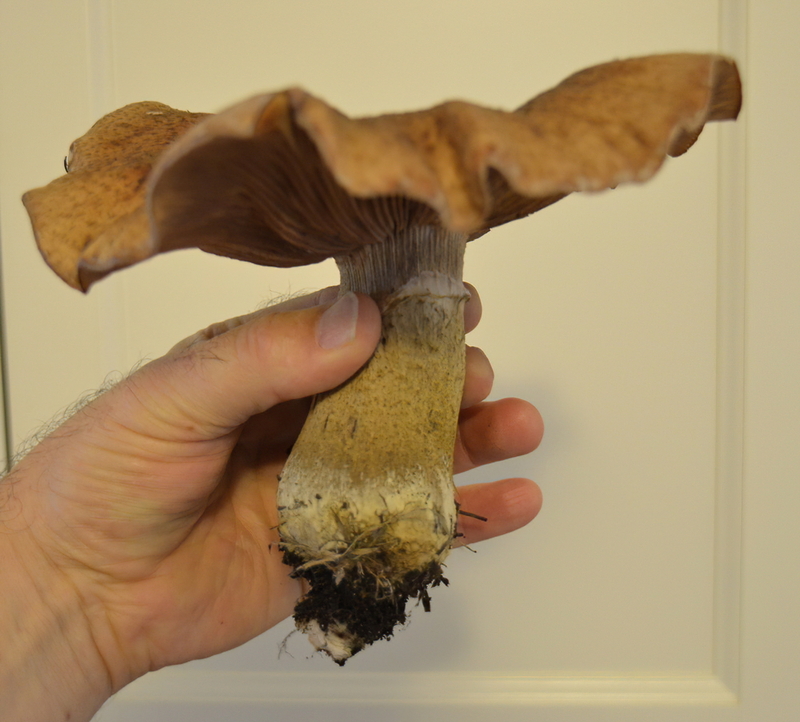 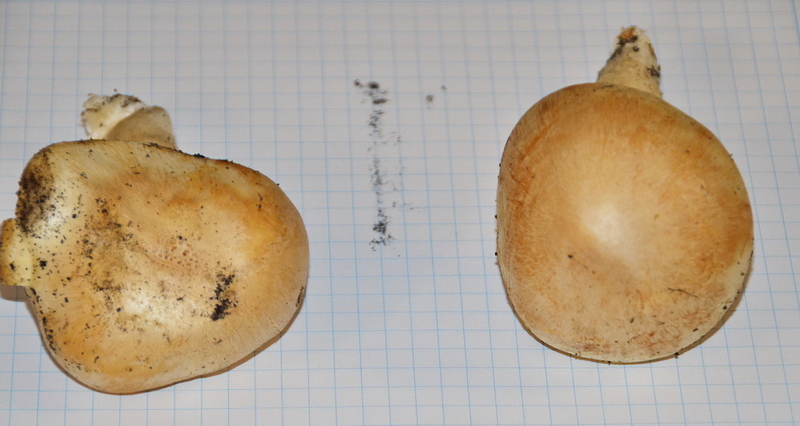 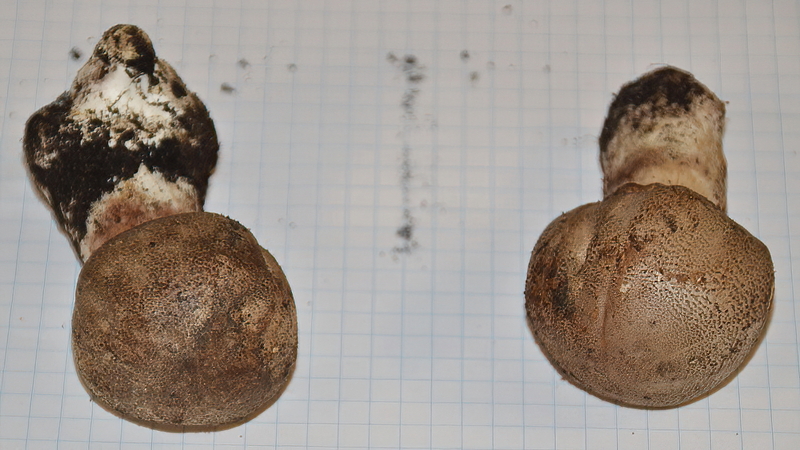 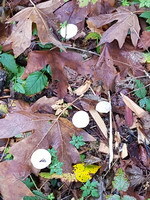 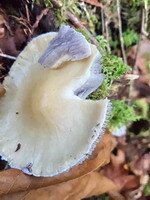 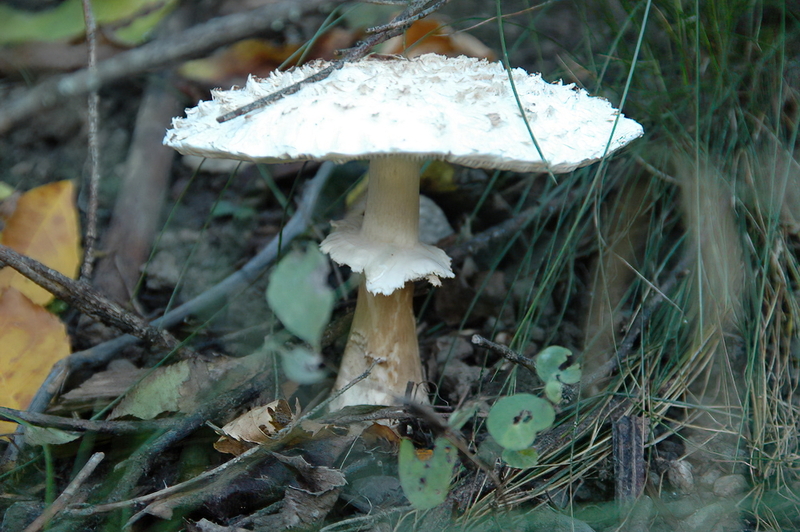 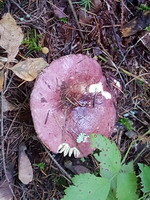 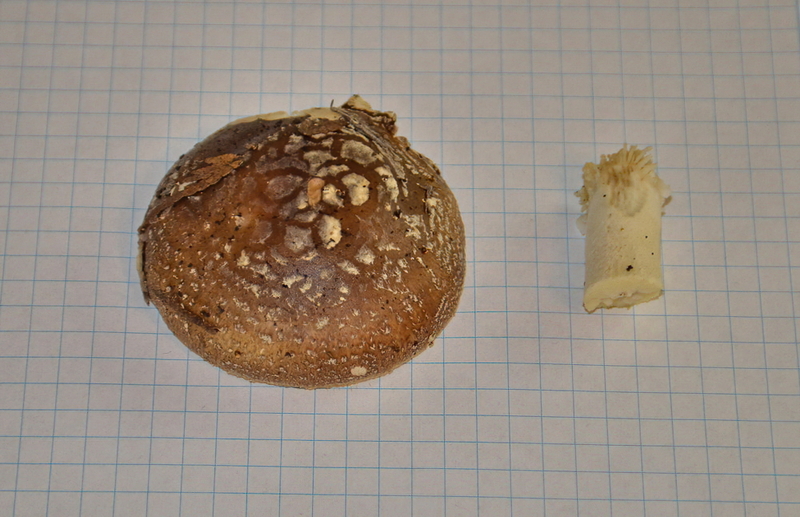 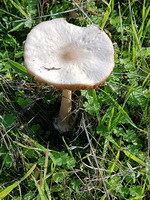 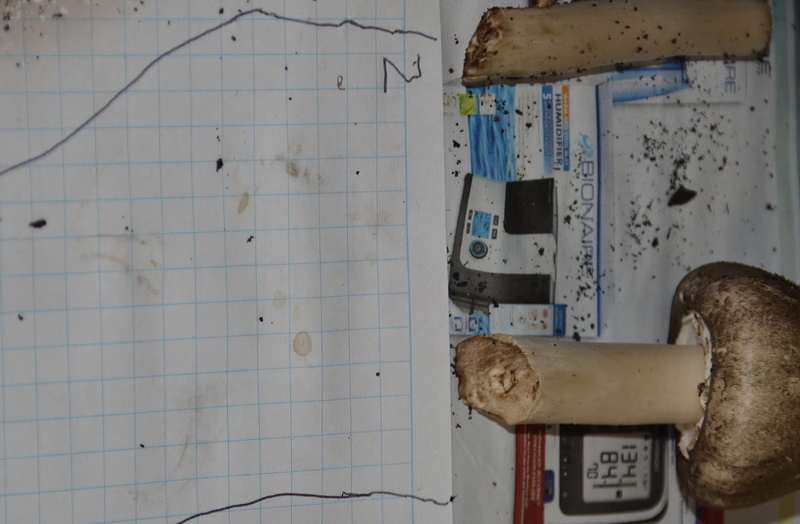 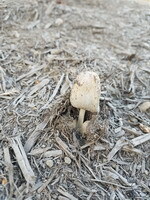 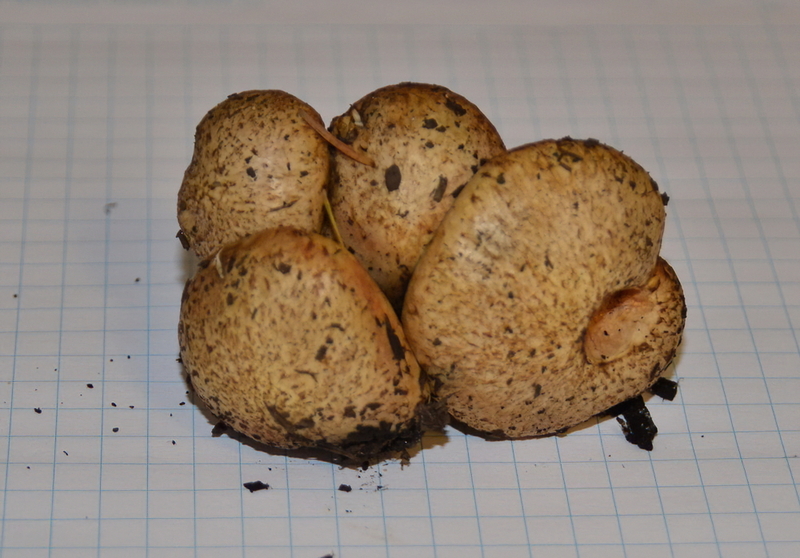 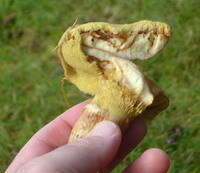 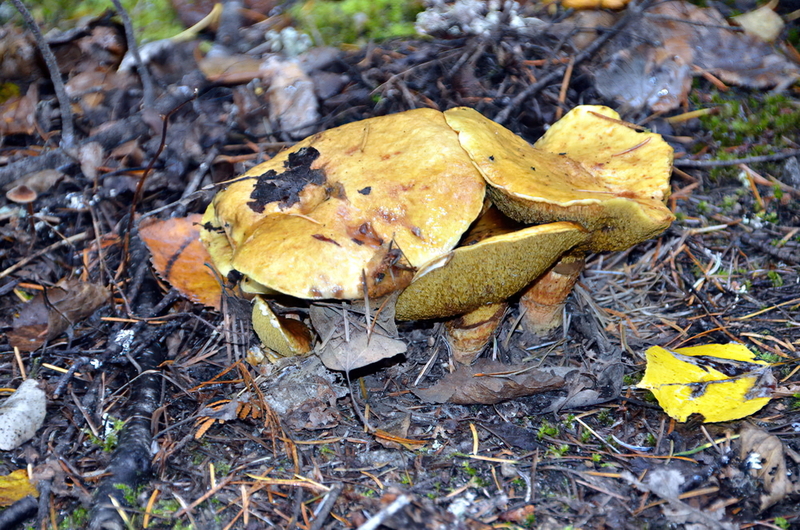 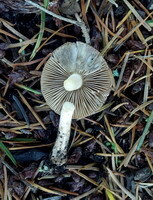 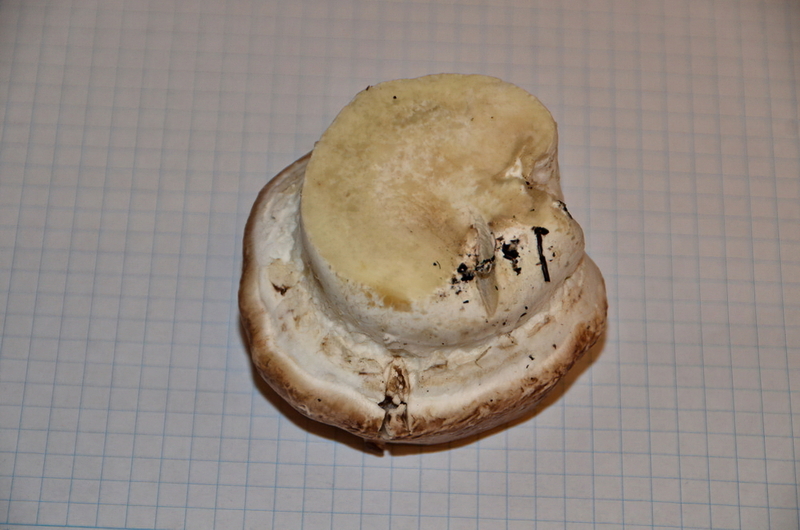 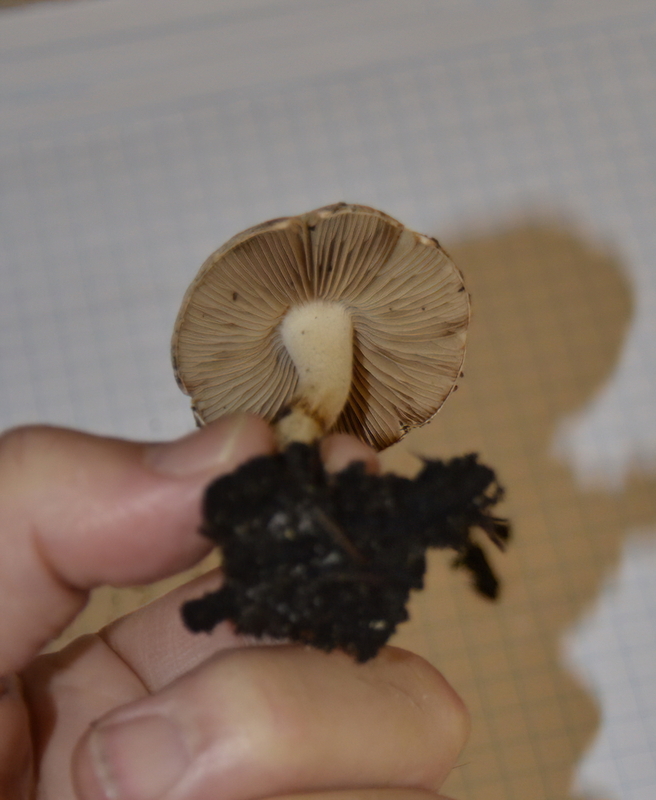 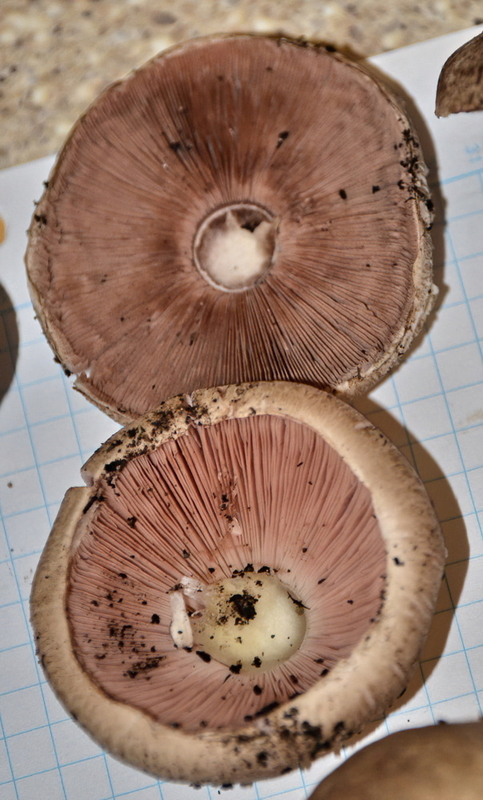 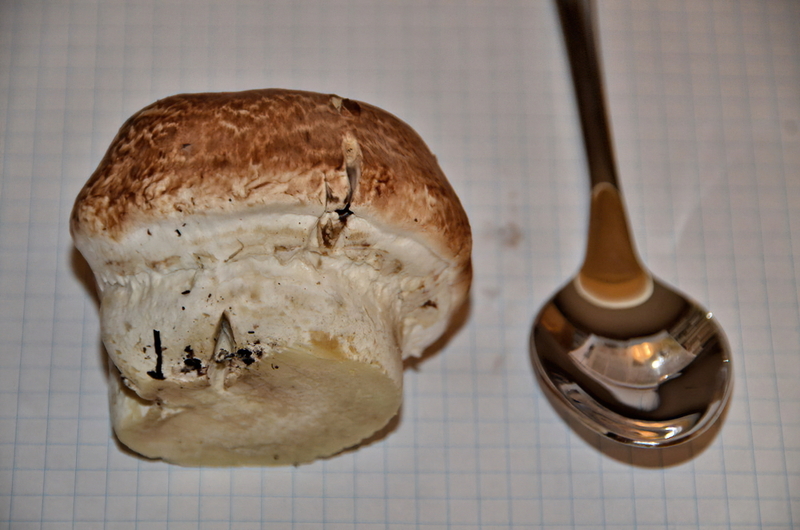 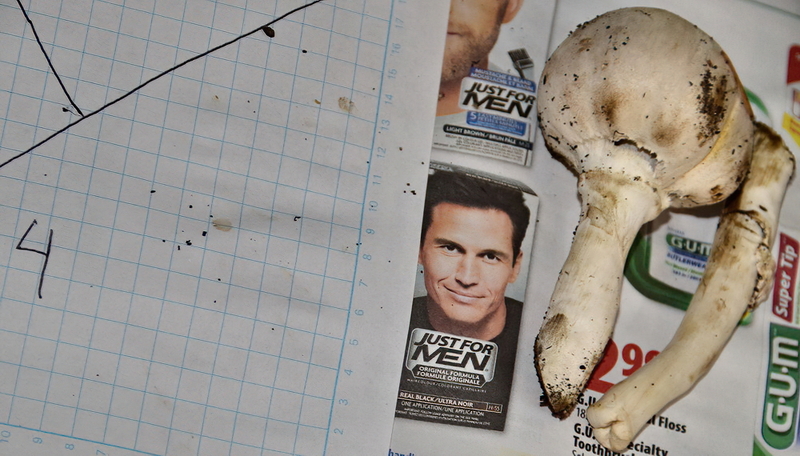 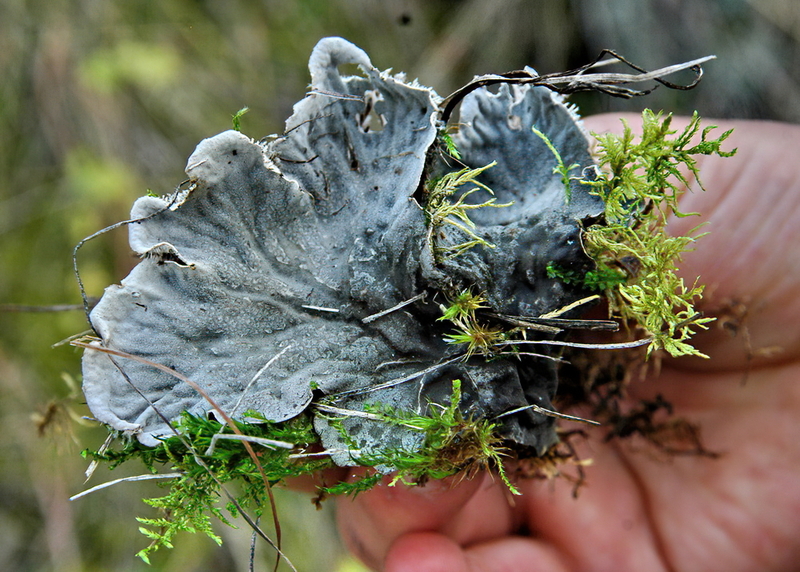 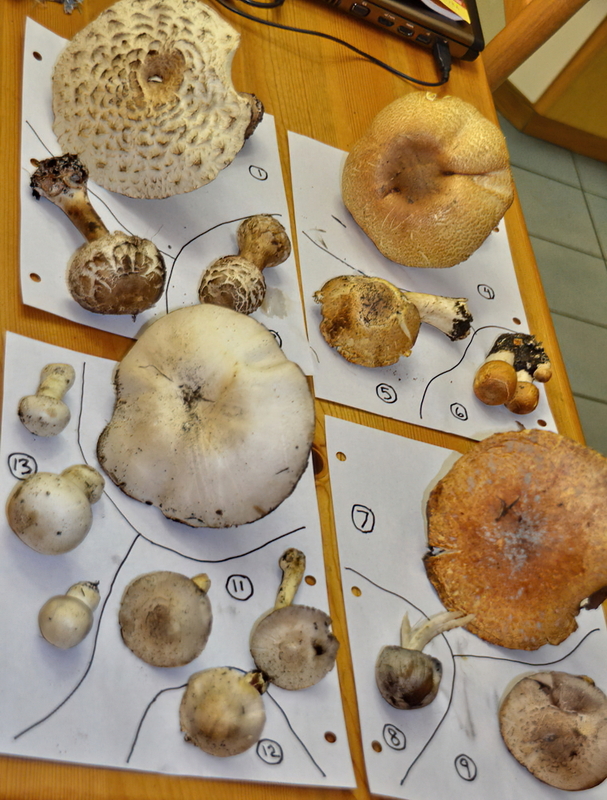 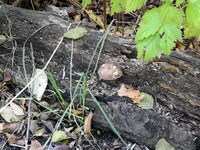 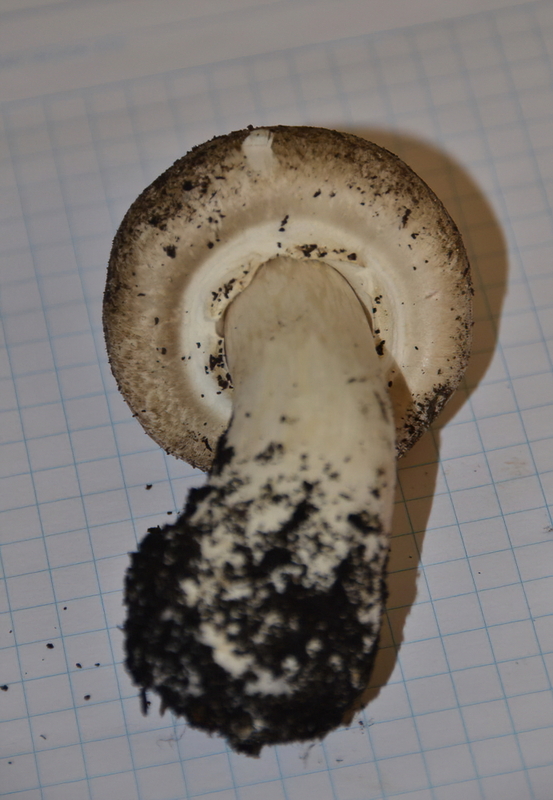 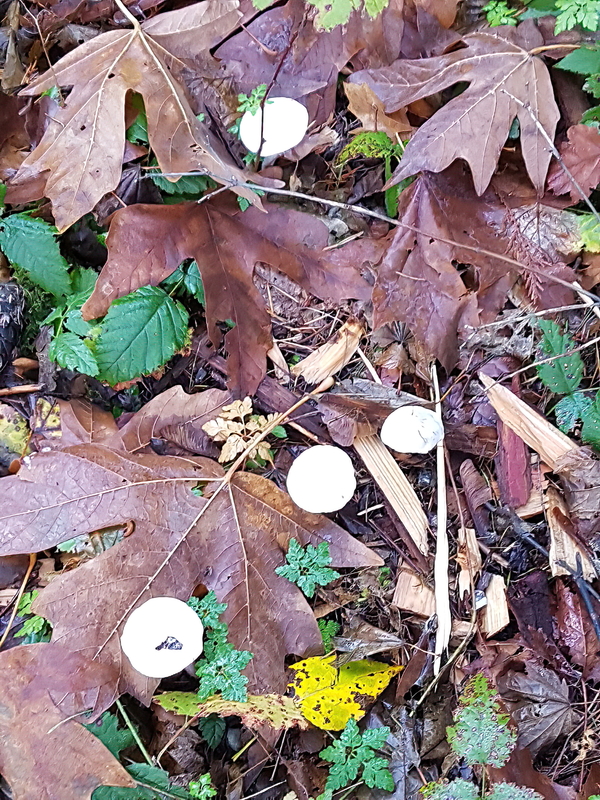 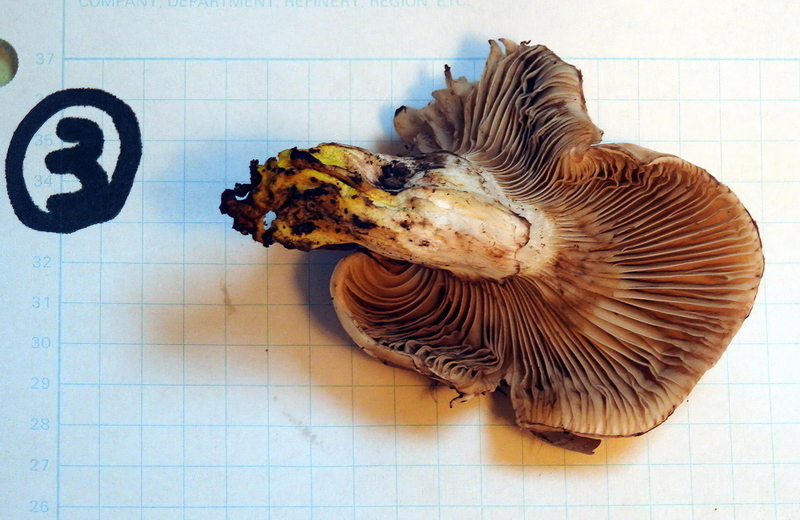 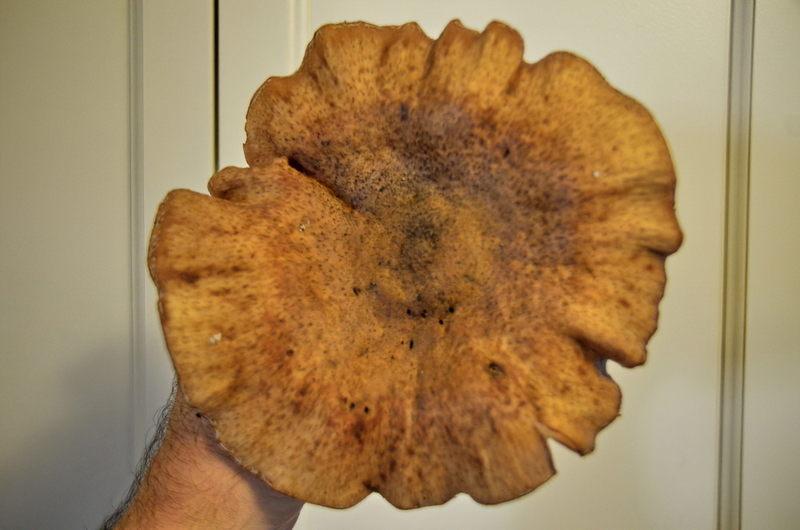 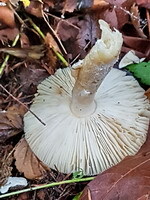 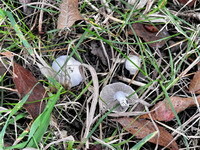 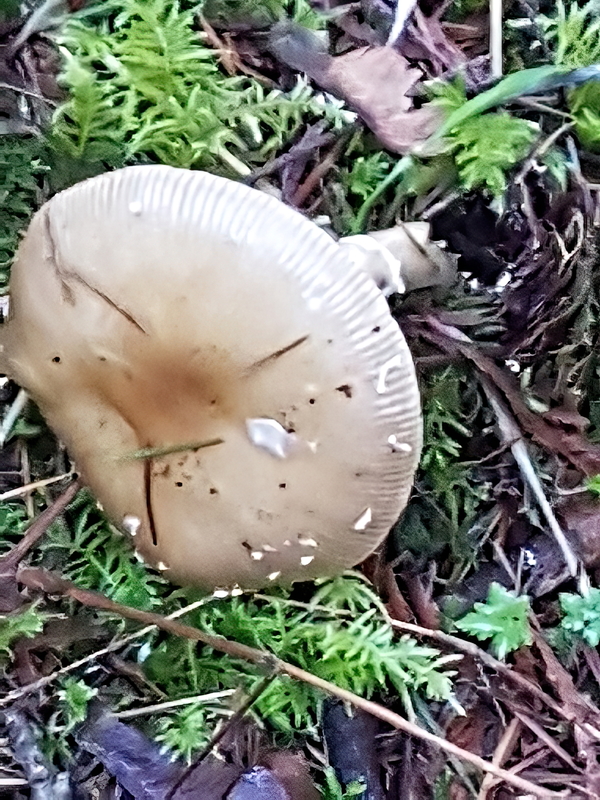 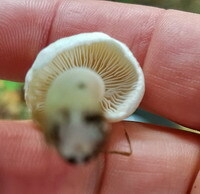 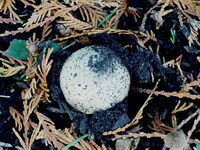 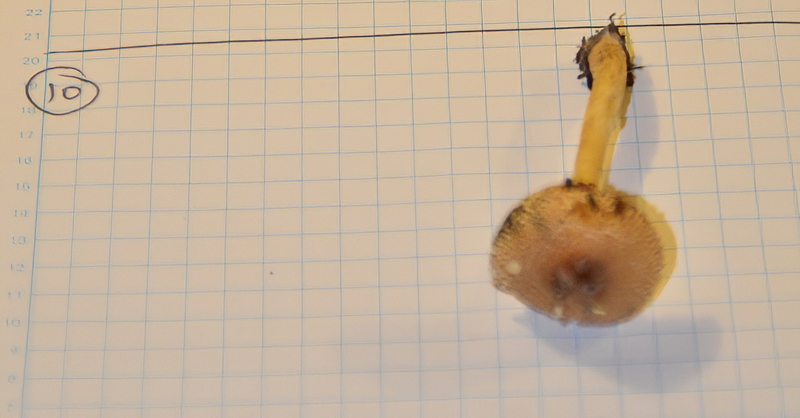 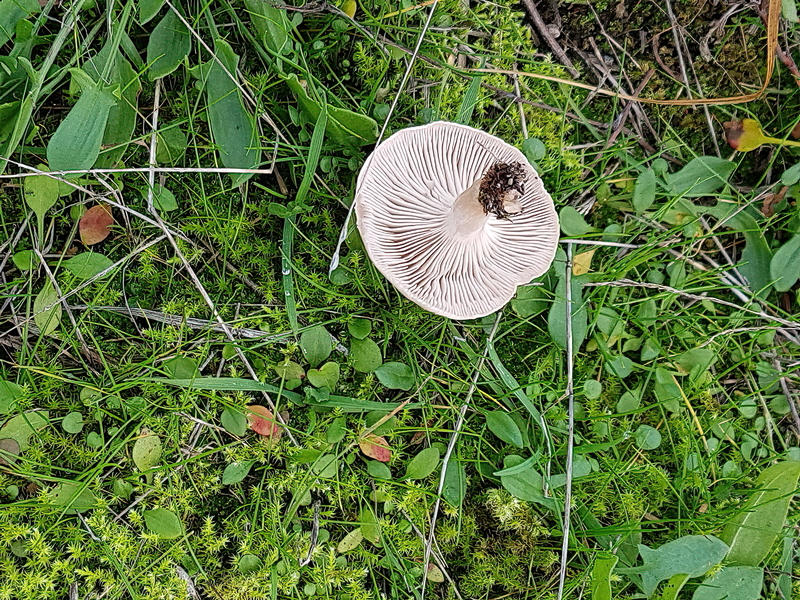 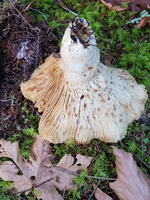 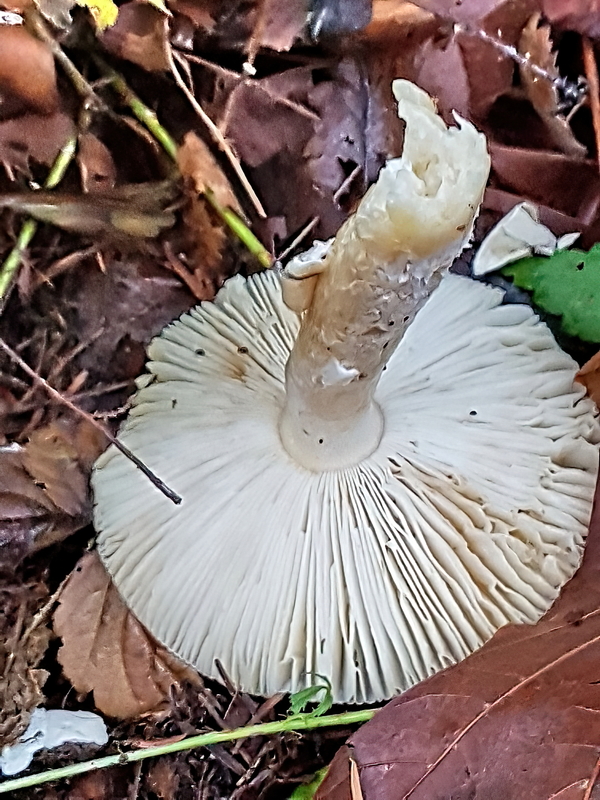 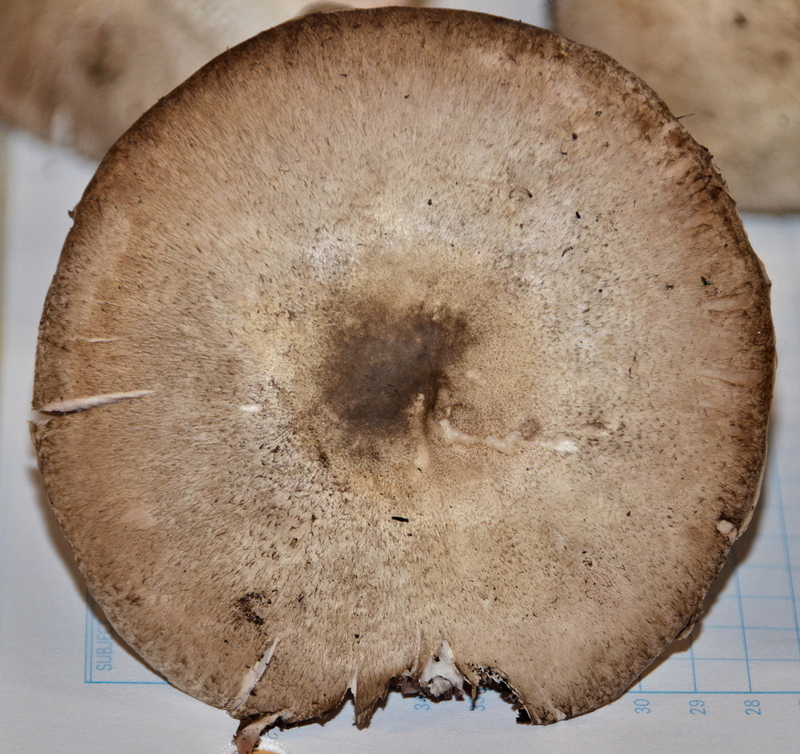 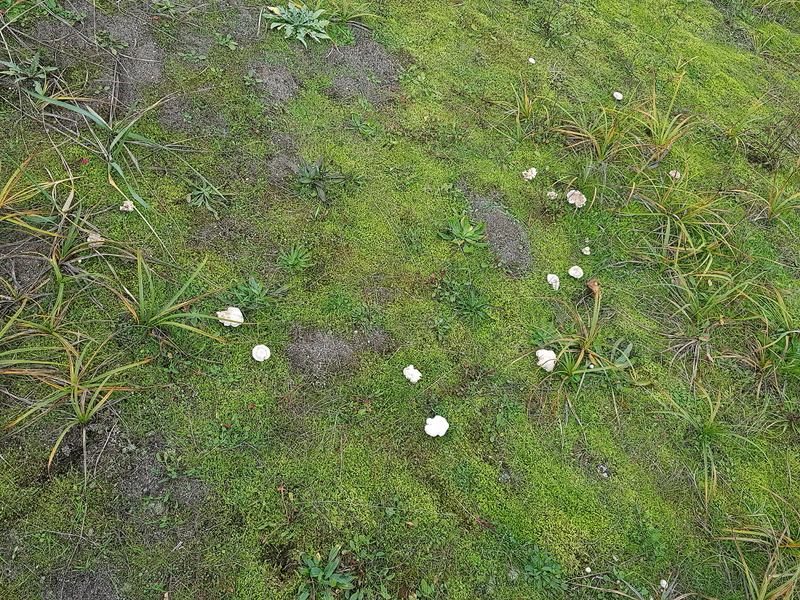 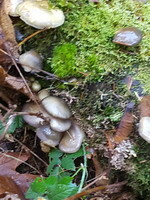 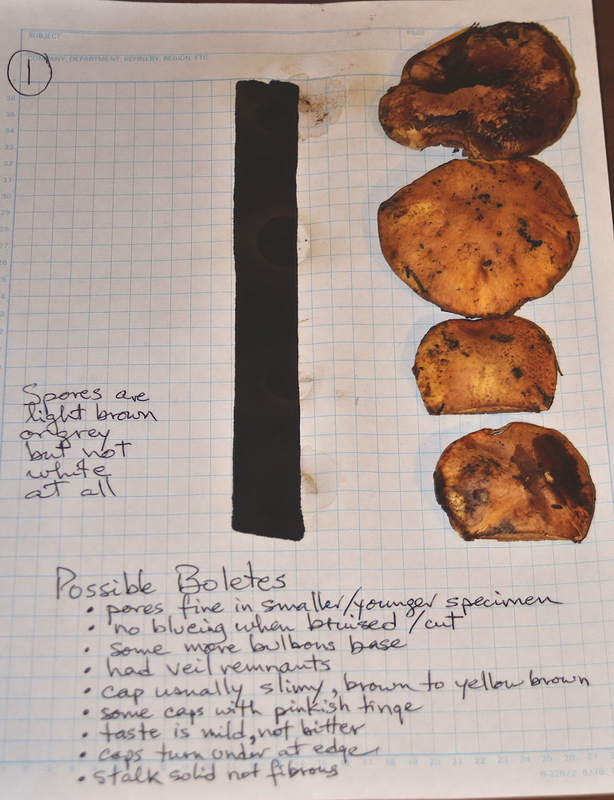 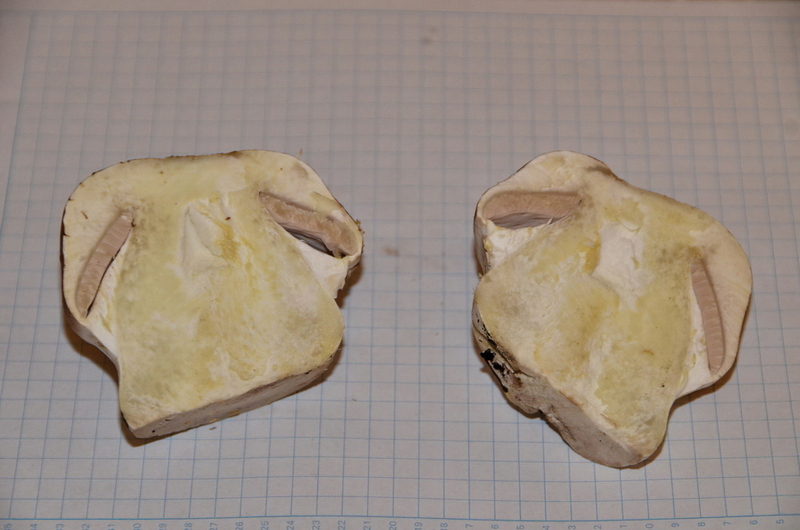 Other Found in disturbed area in long grasses near road edge; no acrid smell or taste; did not stain yellow or red; firm thick flesh; no liquid when cut; could be Agaricus except no ring and didn't see the spores. 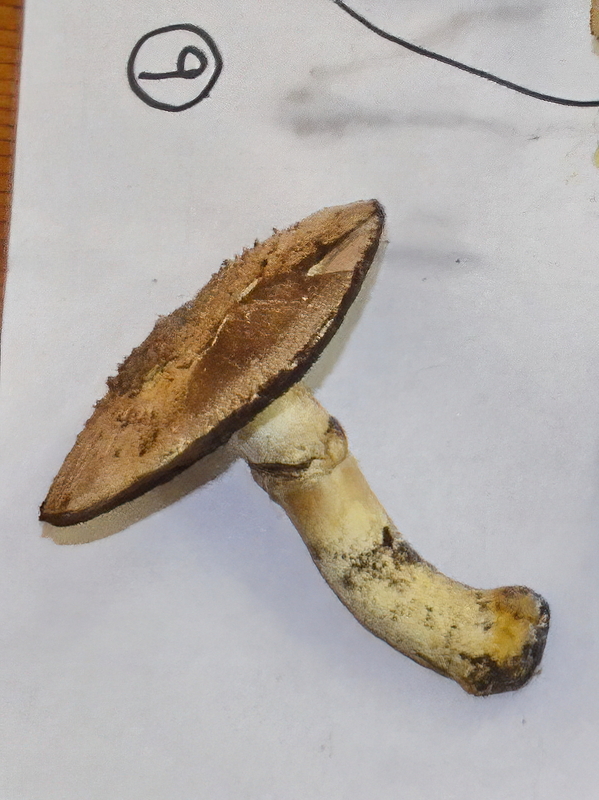 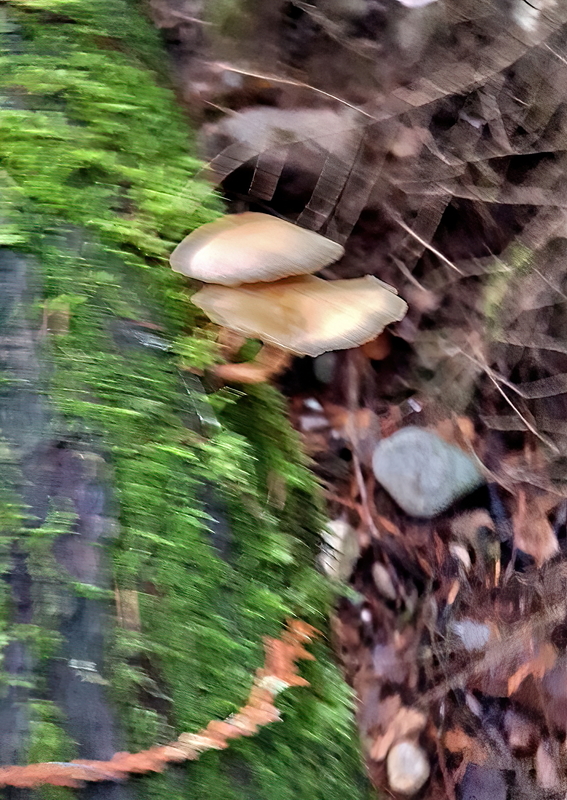 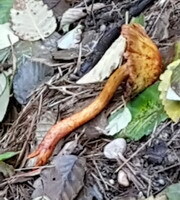 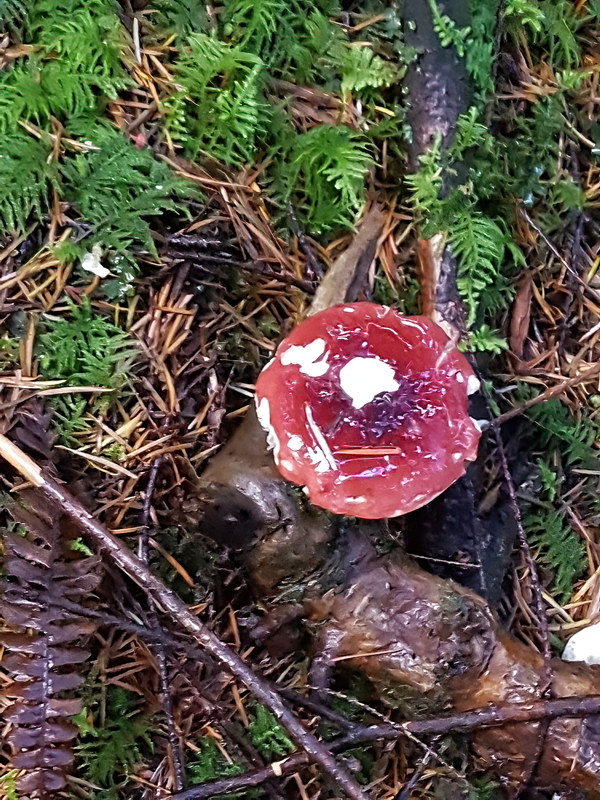 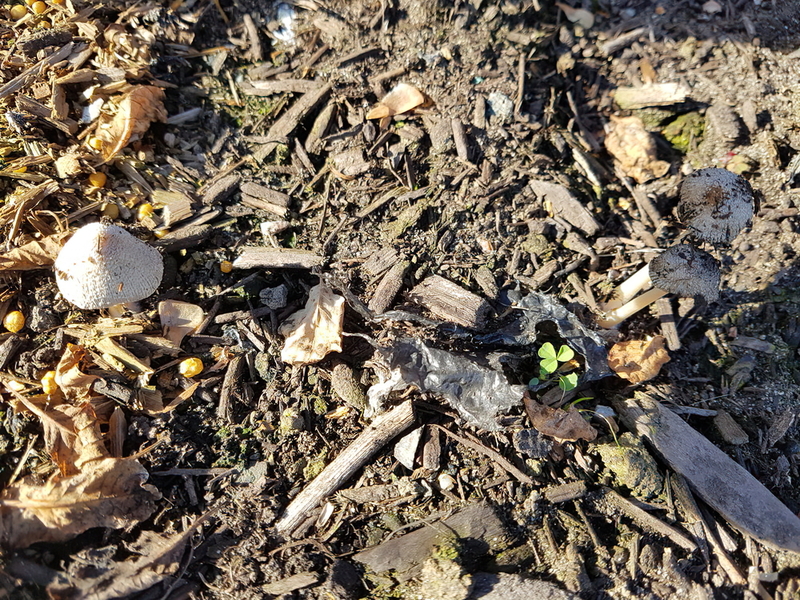 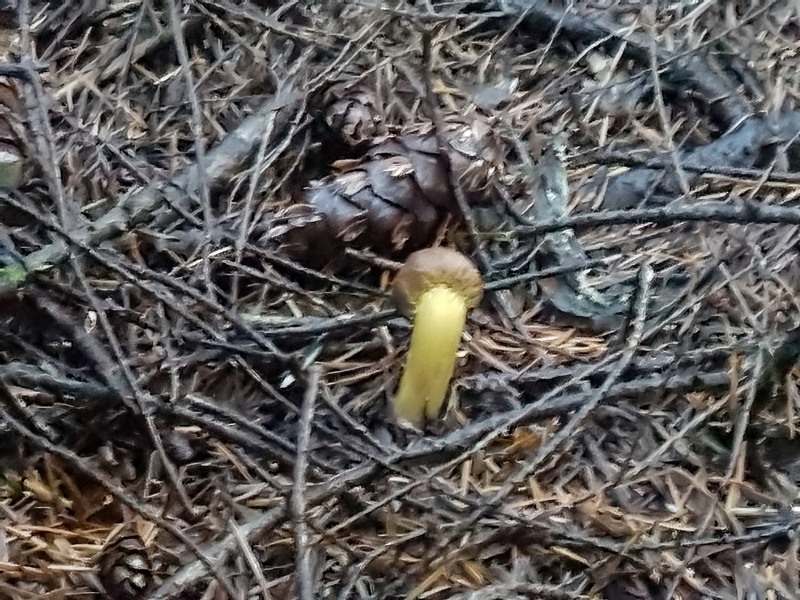 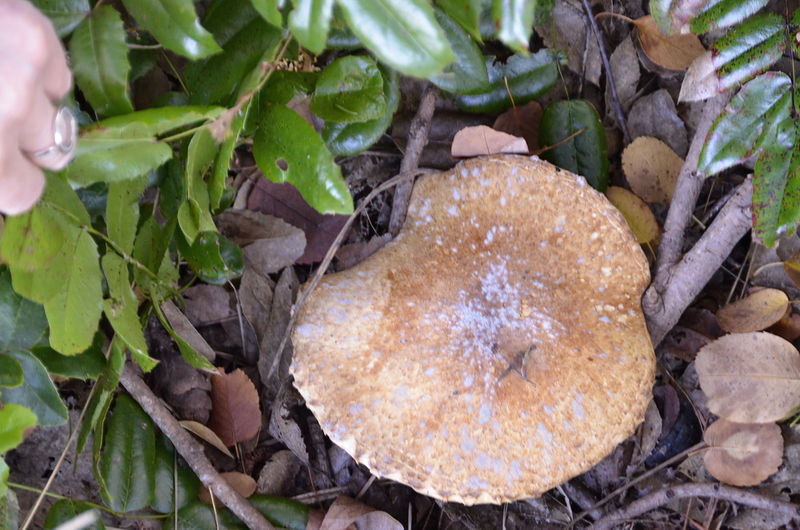 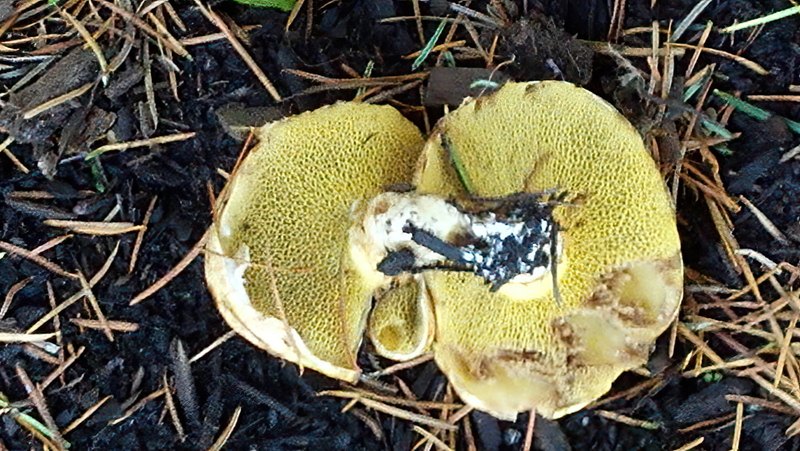 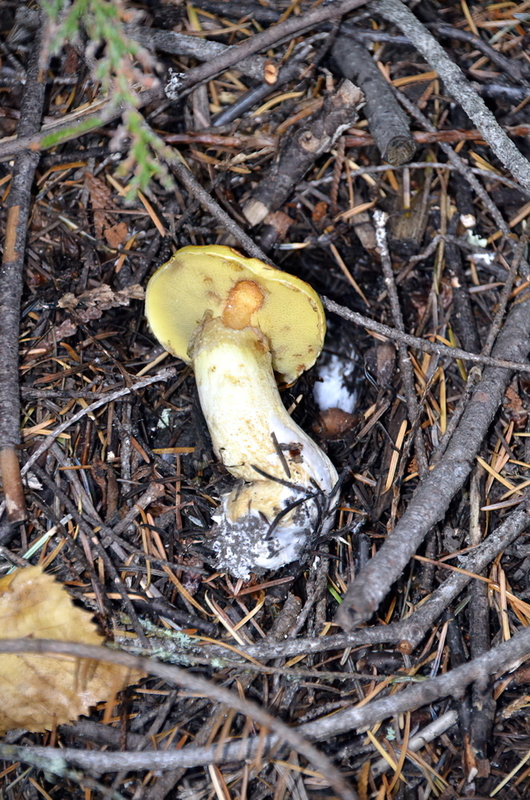 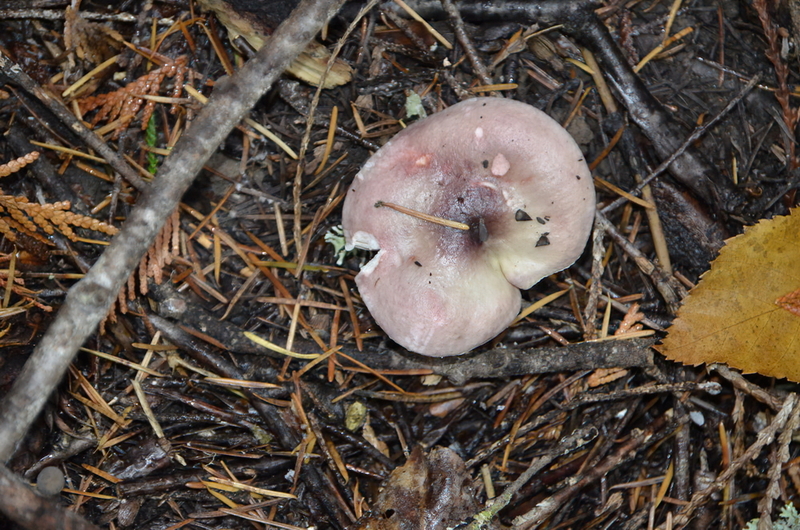 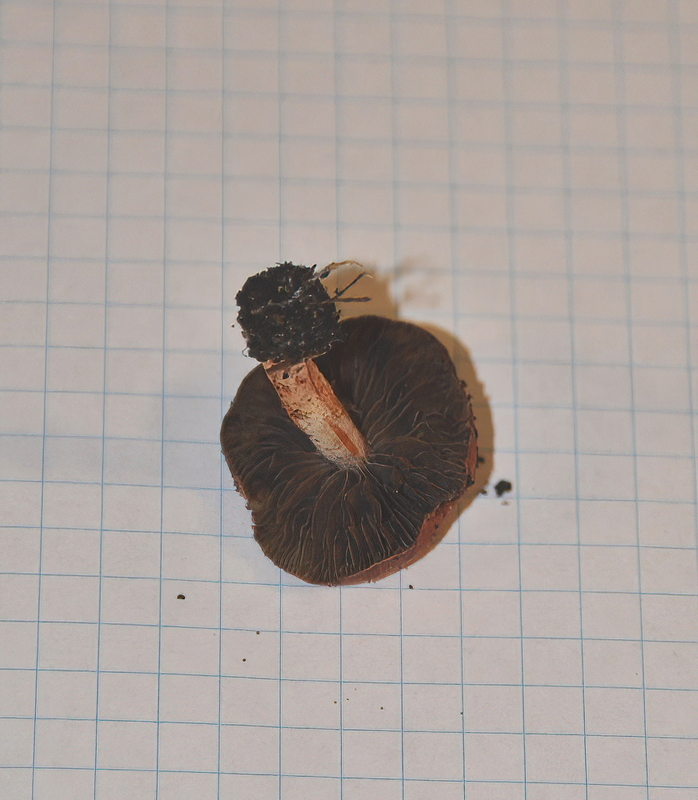 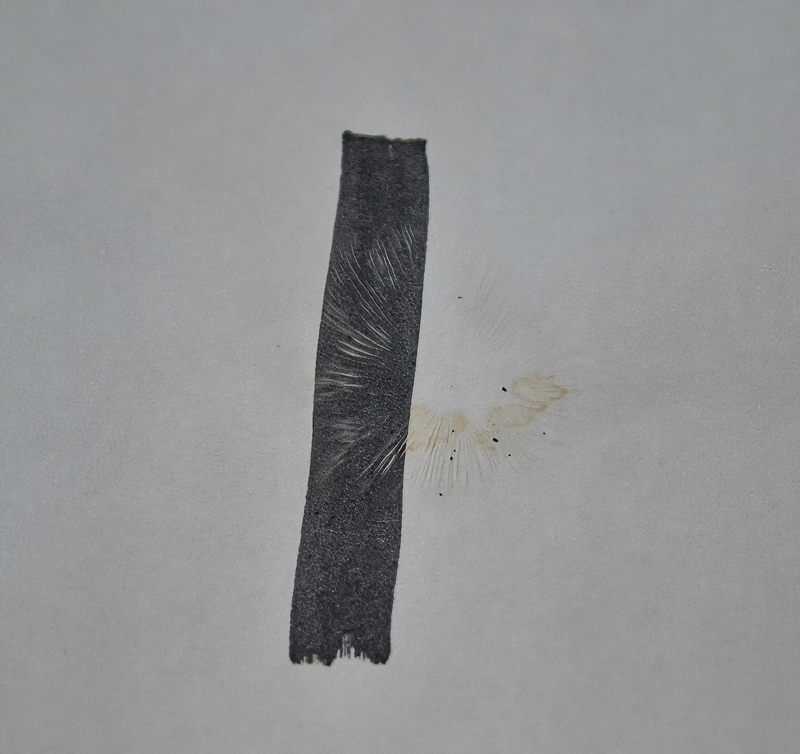 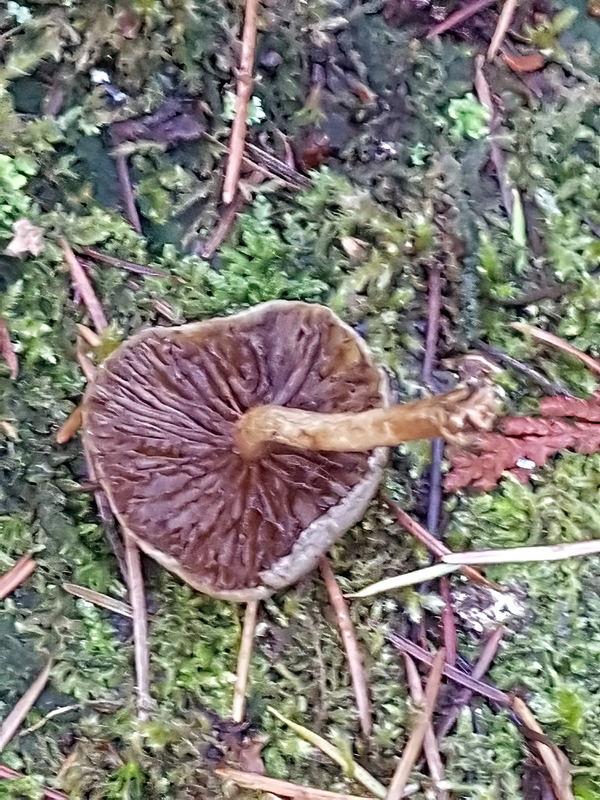 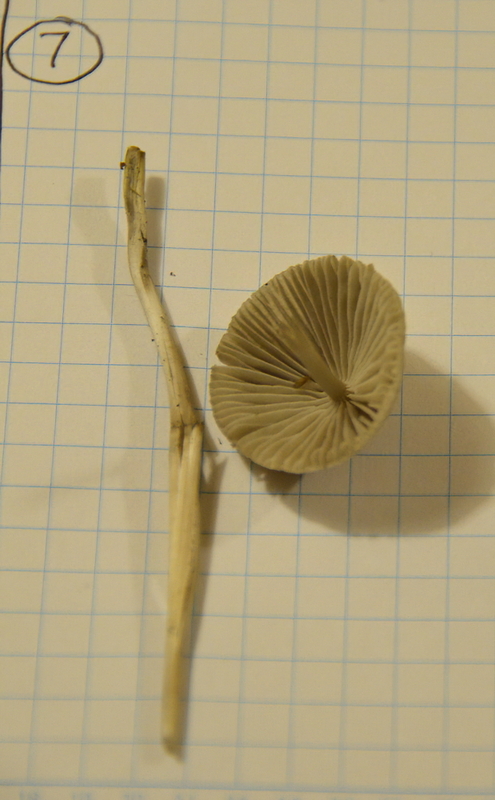 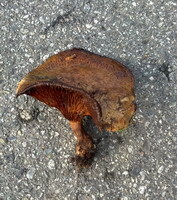 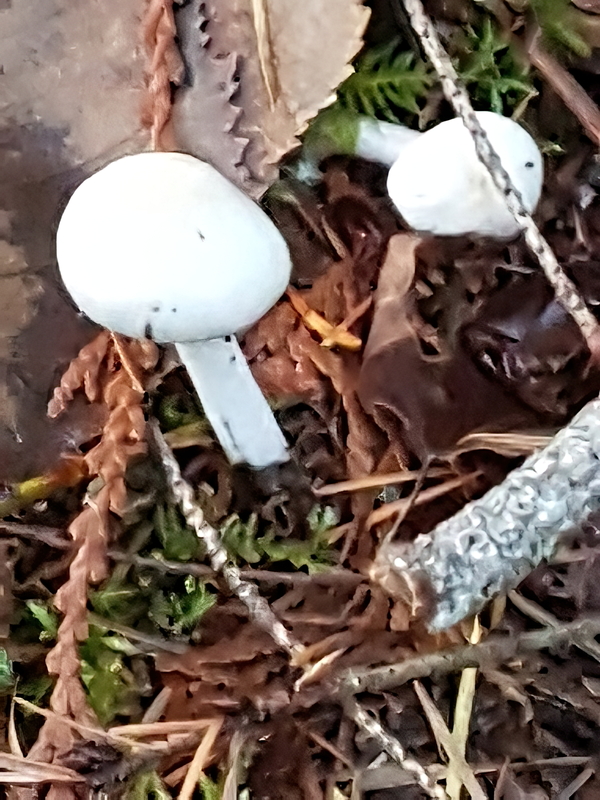 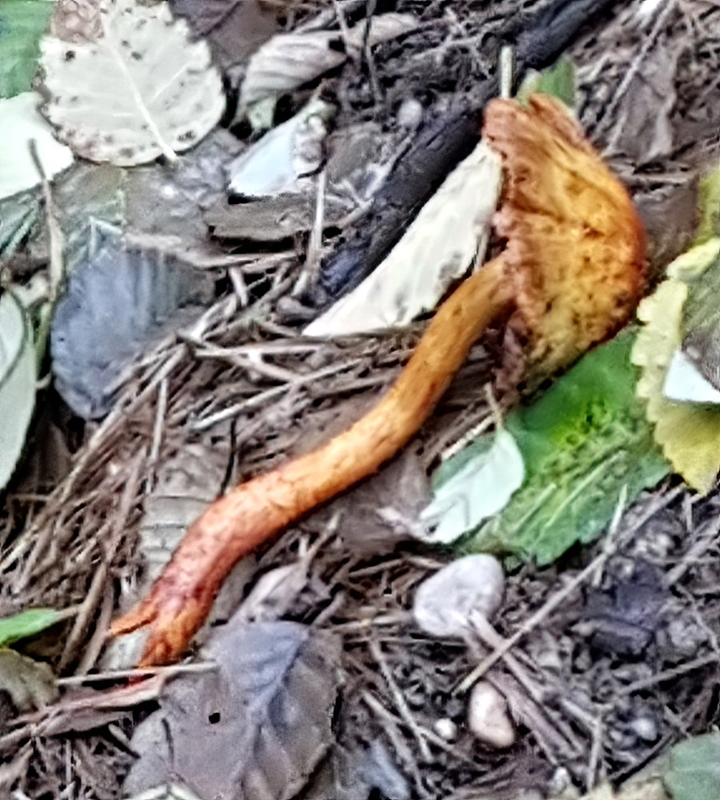 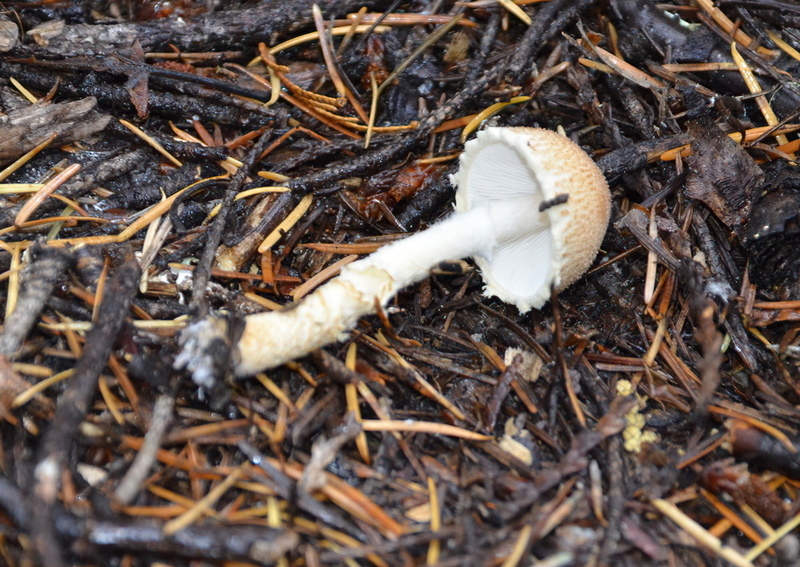 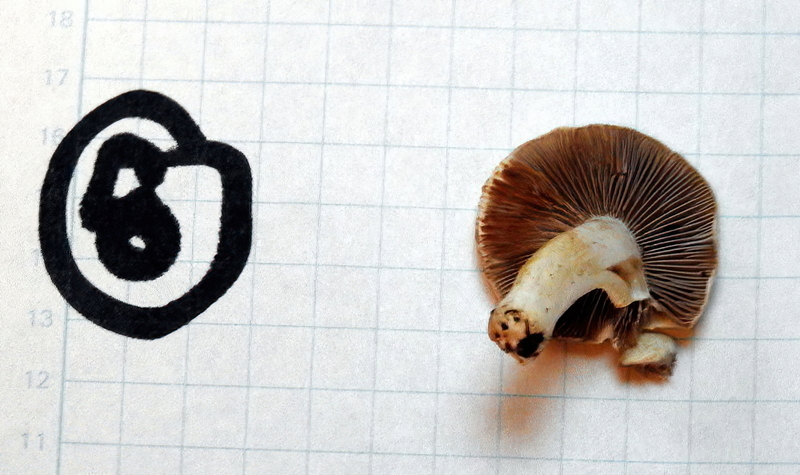 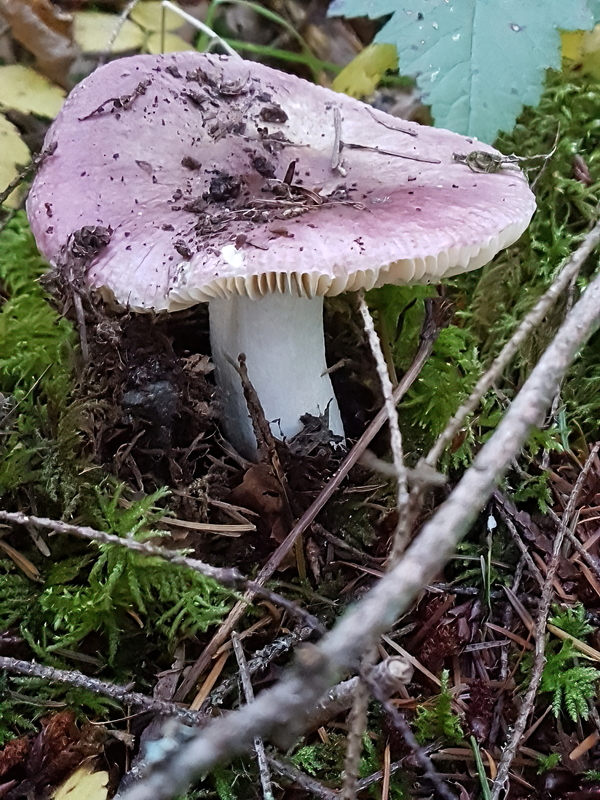 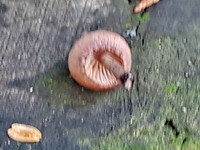 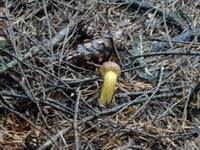 Other Found at margin of grass and garden; possibly a little yellow staining; no acrid smell or taste; could be Russula except there's a veil or could be Agaricus except no ring and didn't see the spores. 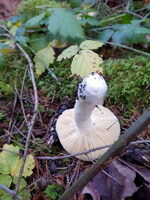 Can I eat it? 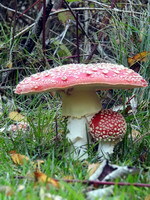 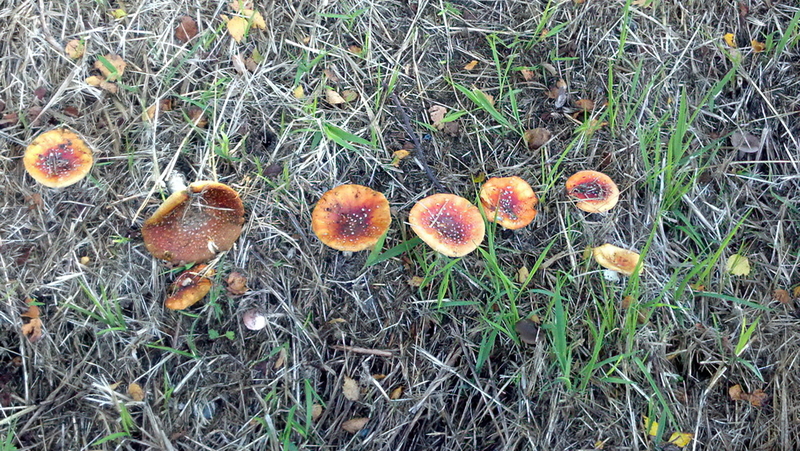 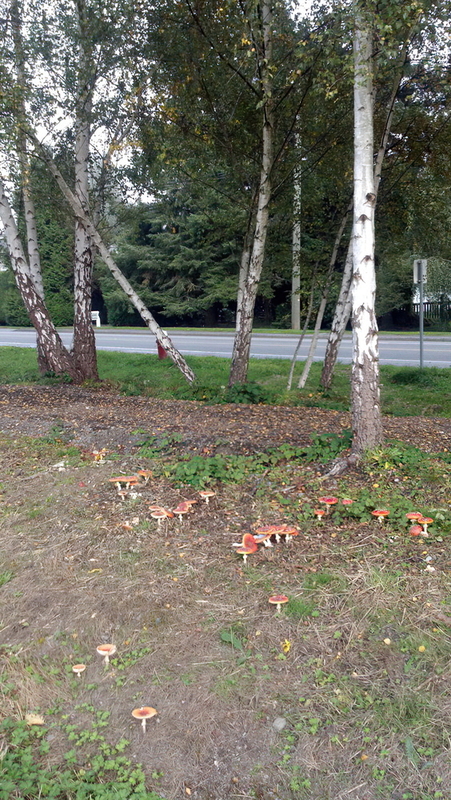 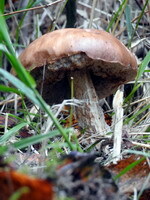 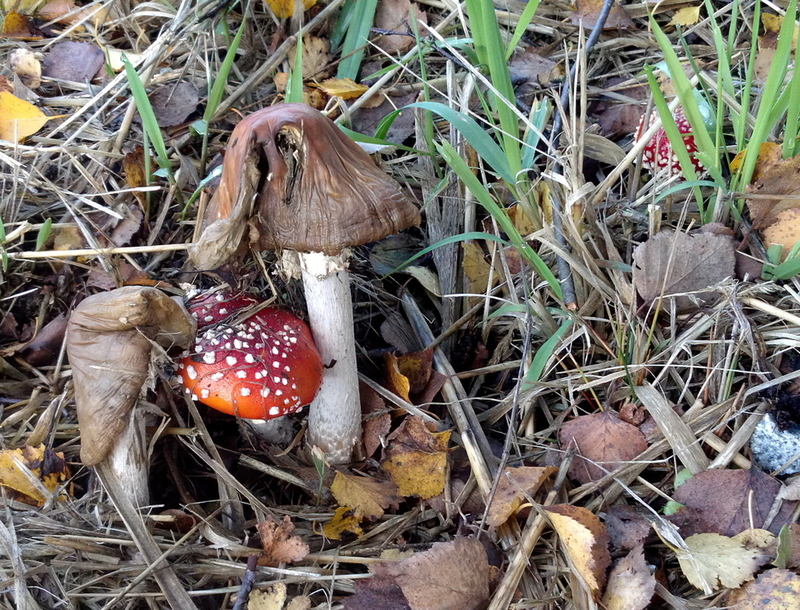 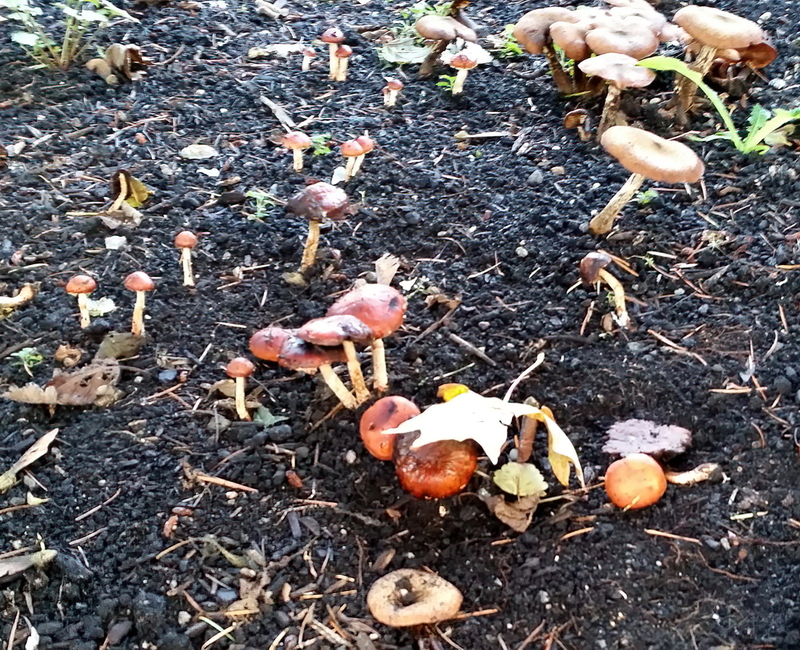 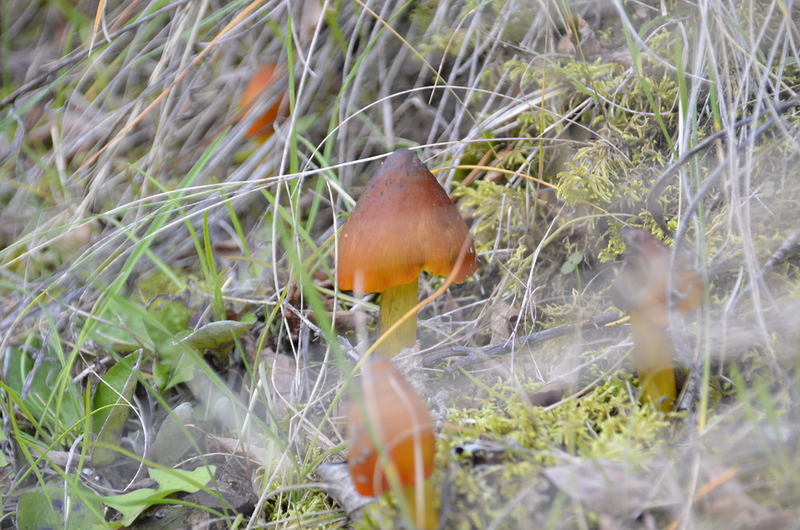 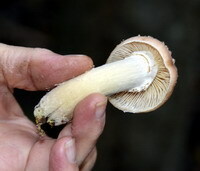 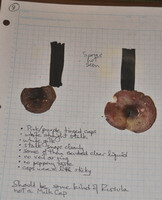 Not recommended, same toxins as Fly Amanita - unpredictable and potentially dangerous conscious-altering. 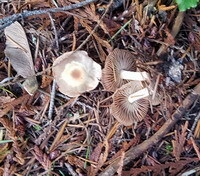 Other Obviously a very young specimen, not even fully open yet. 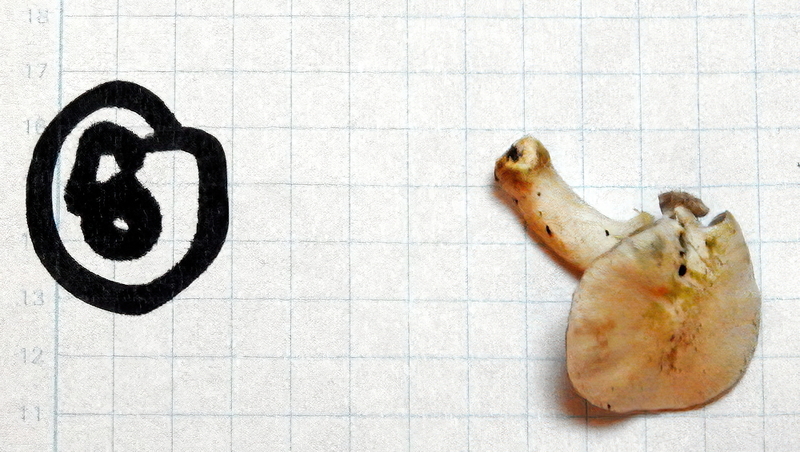 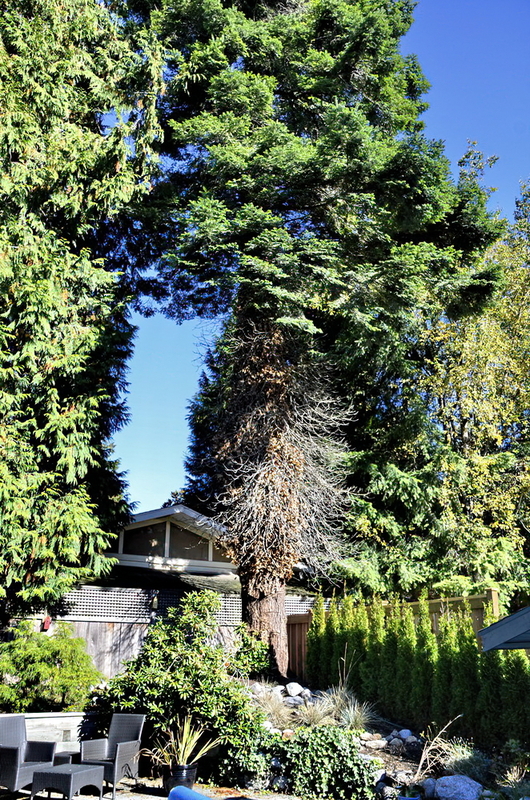 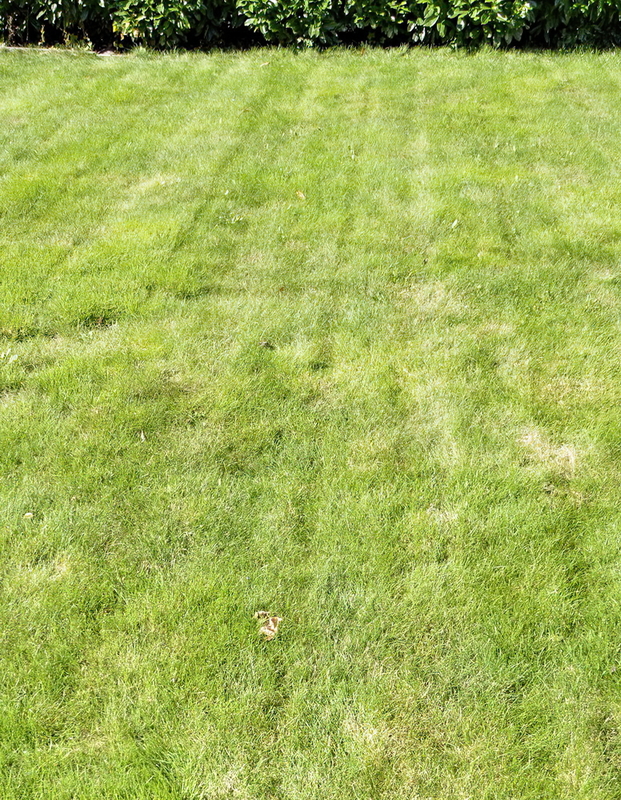 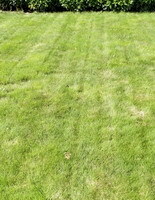 Based on the shape, it might be a Tork. 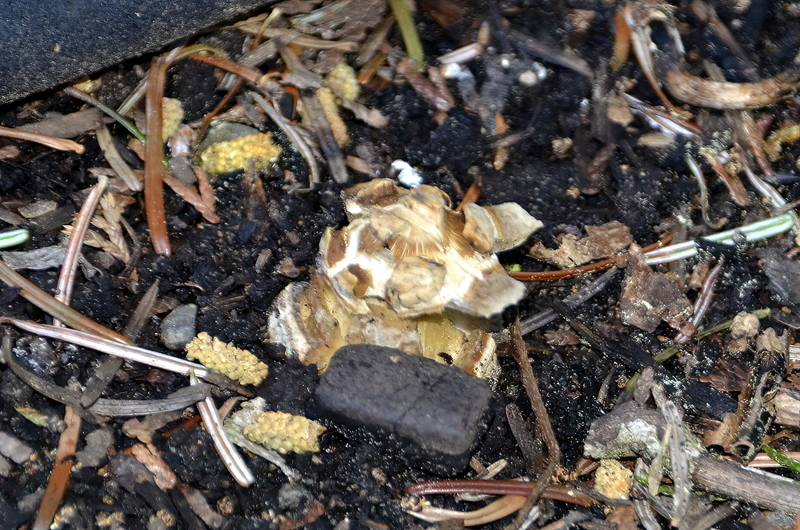 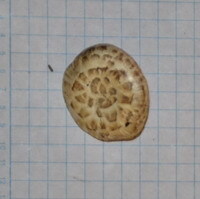 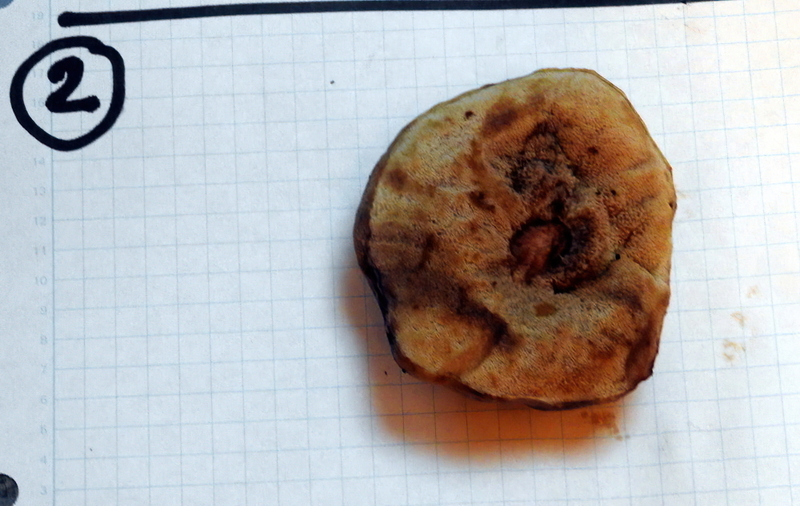 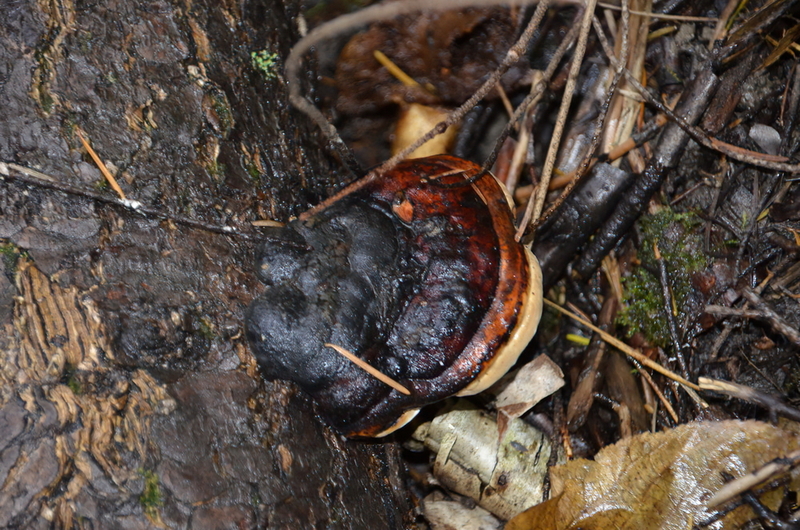 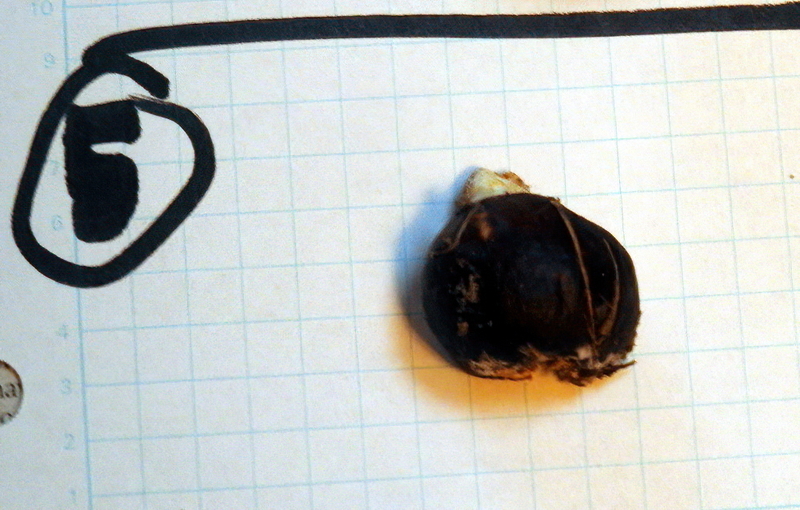 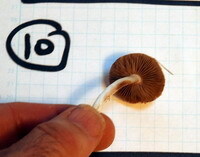 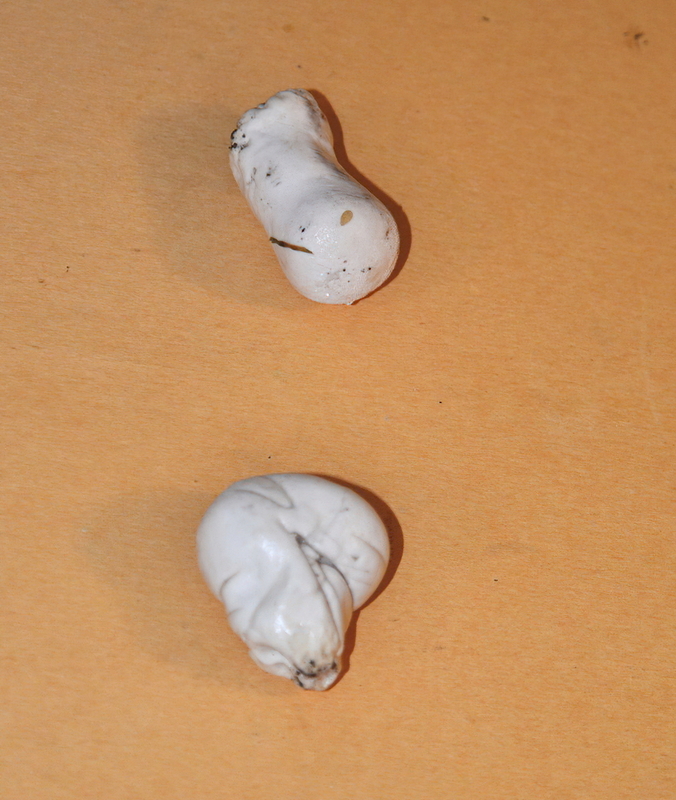 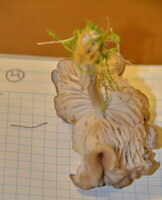 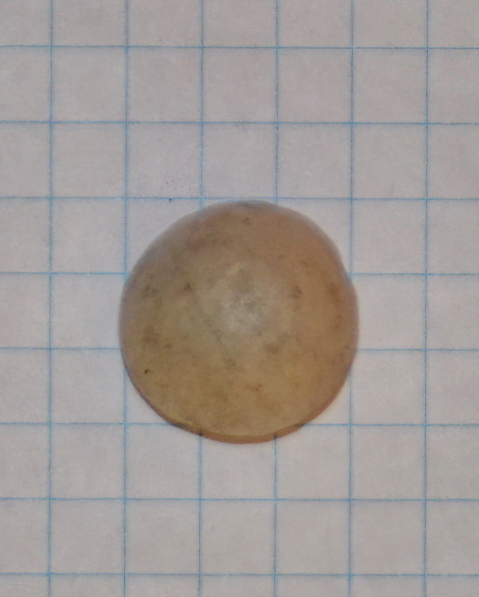 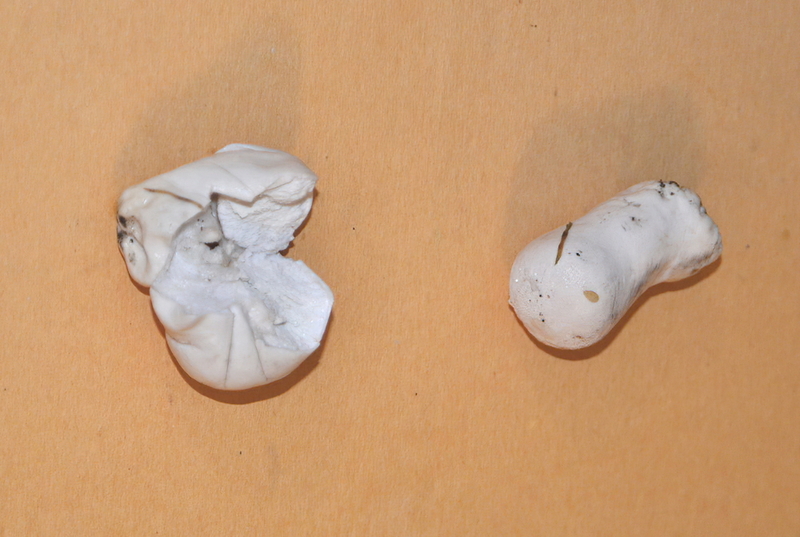 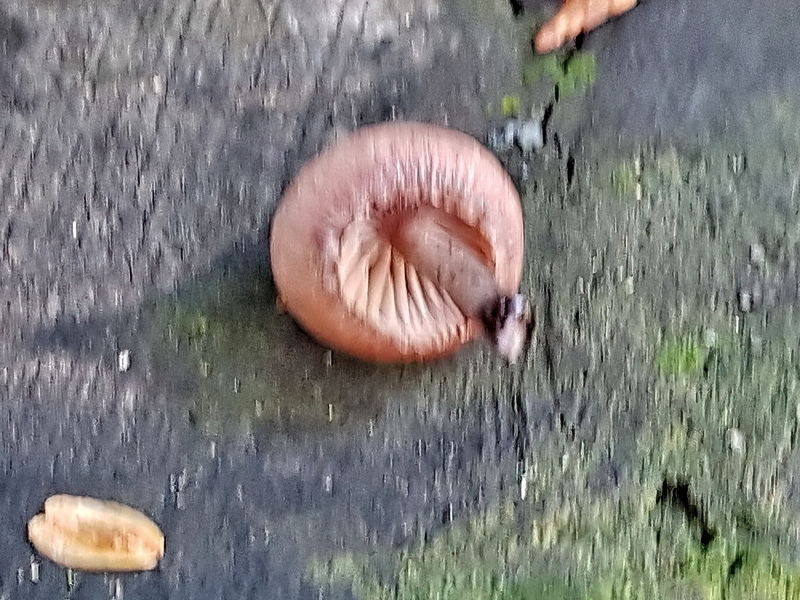 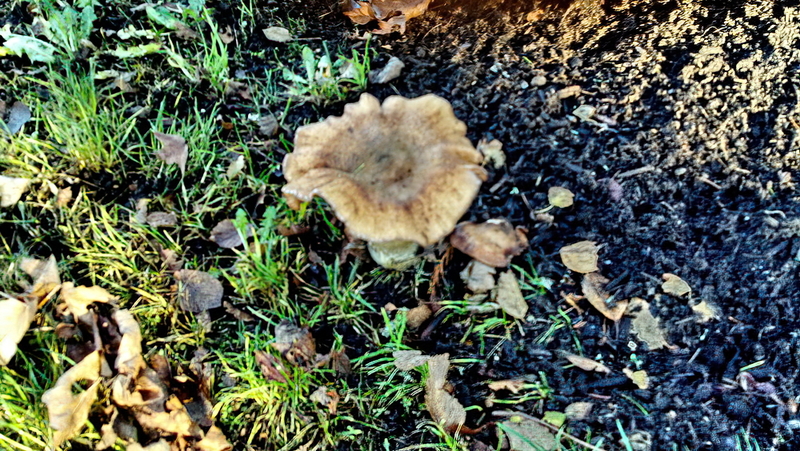 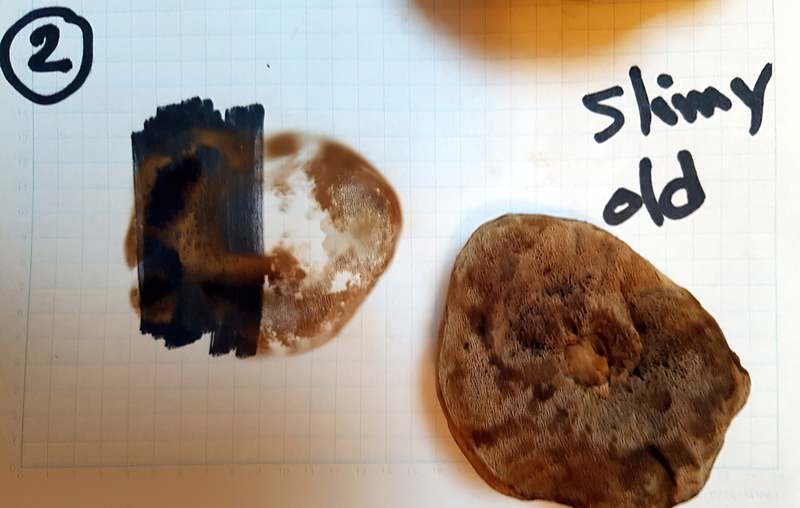 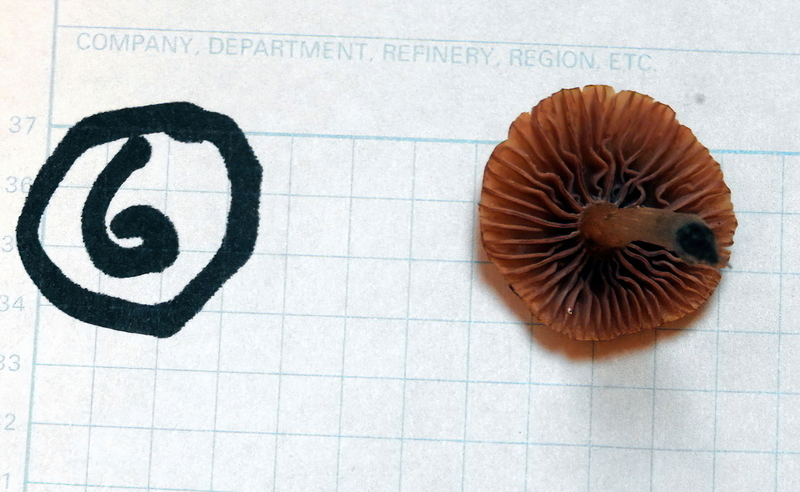 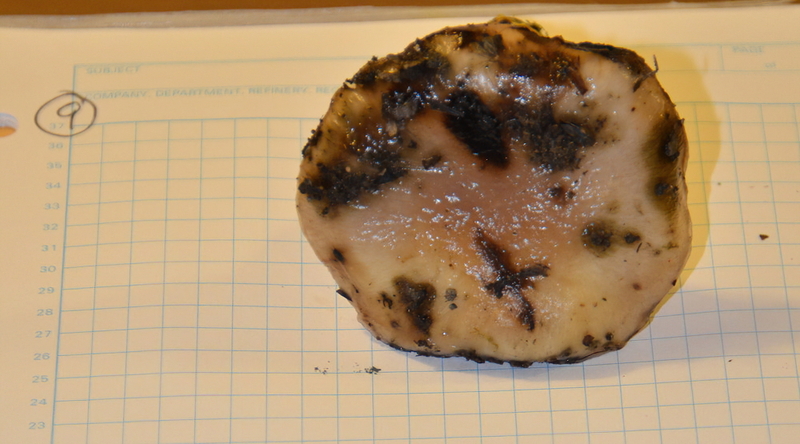 Other Small second specimen seems to come from the same base, no smell or staining. May be an older version of #85. Other No smell or staining. May be a slightly younger version of #83. Other No smell or staining. 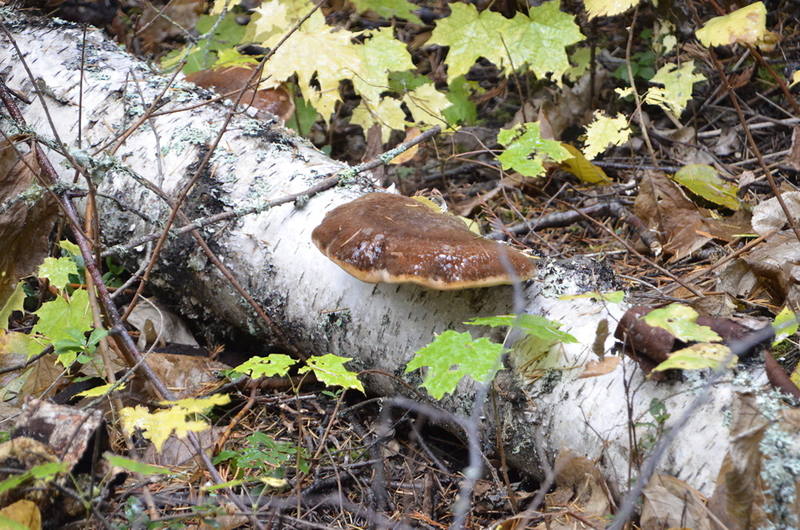 May be a slightly older version of #82. 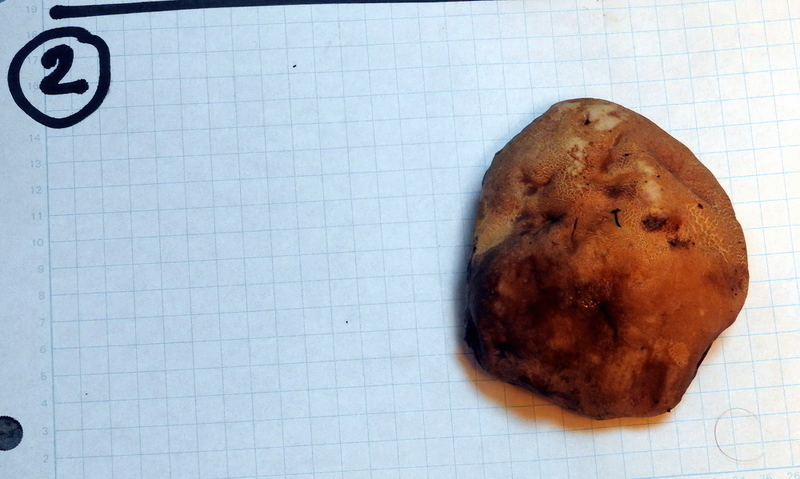 Other No smell or staining. 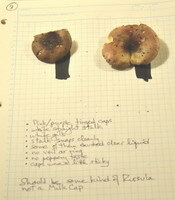 Other No smell or staining. May be an younger version of #81. 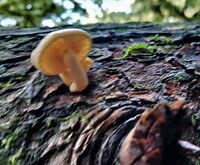 Can I eat it? 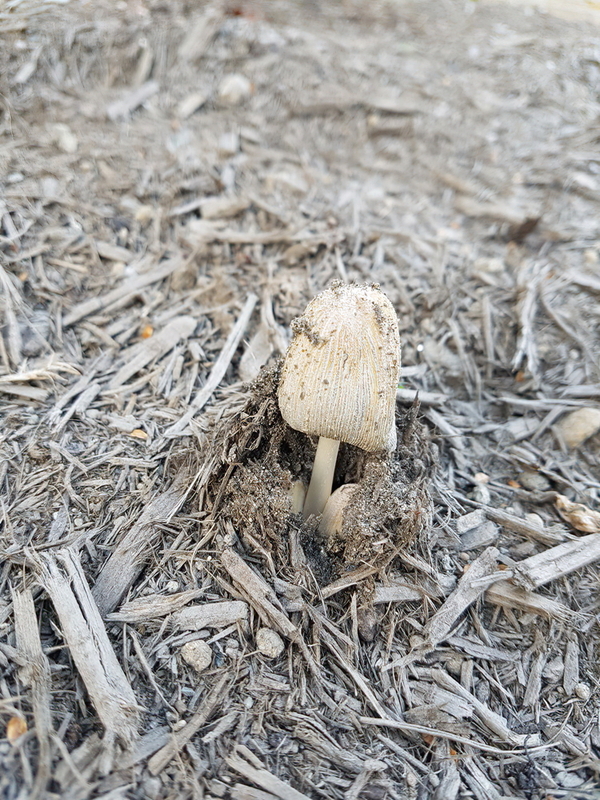 Unknown, but why bother?